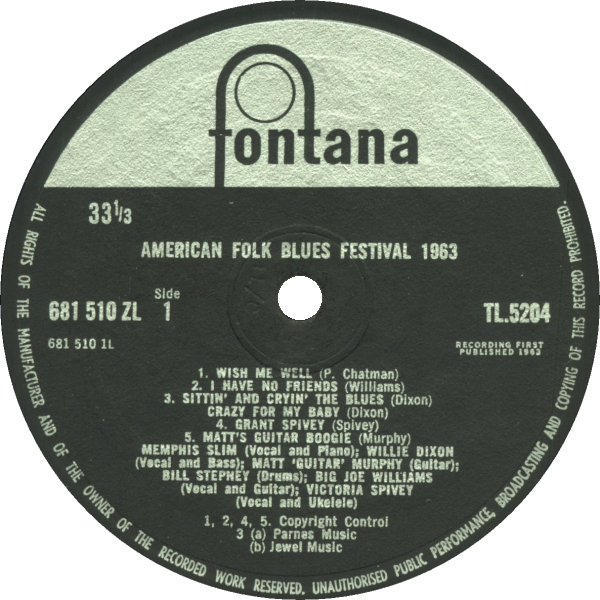 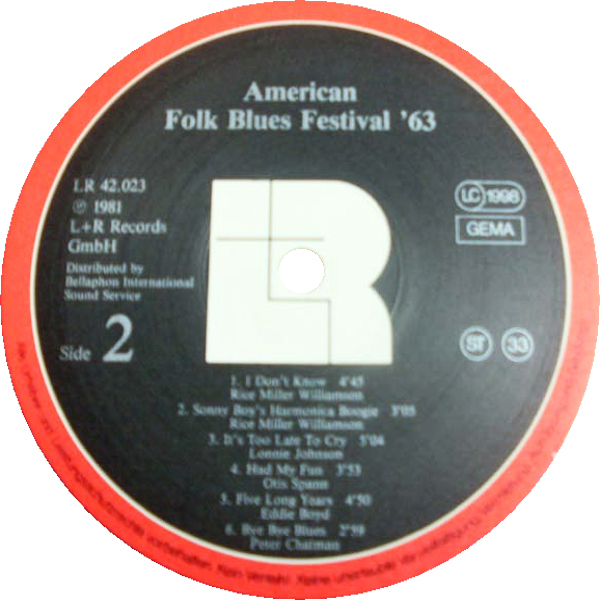 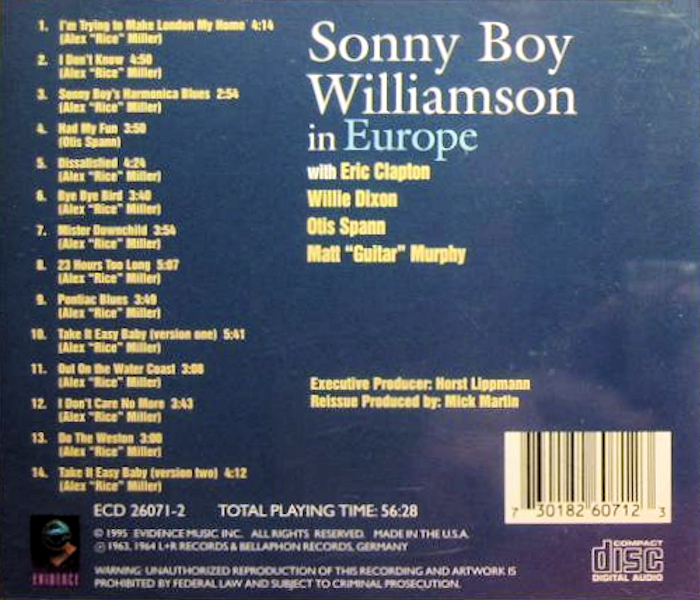 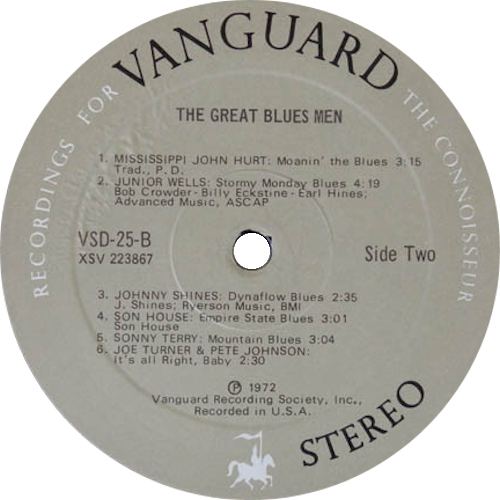 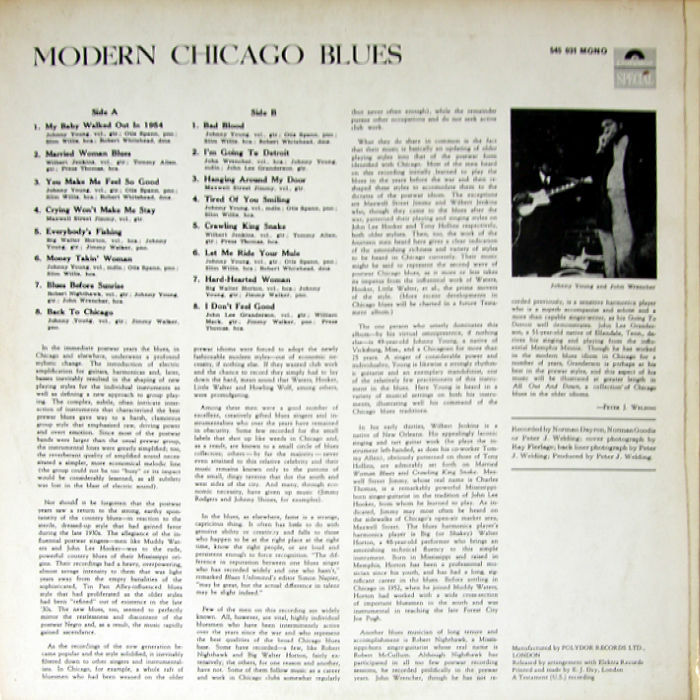 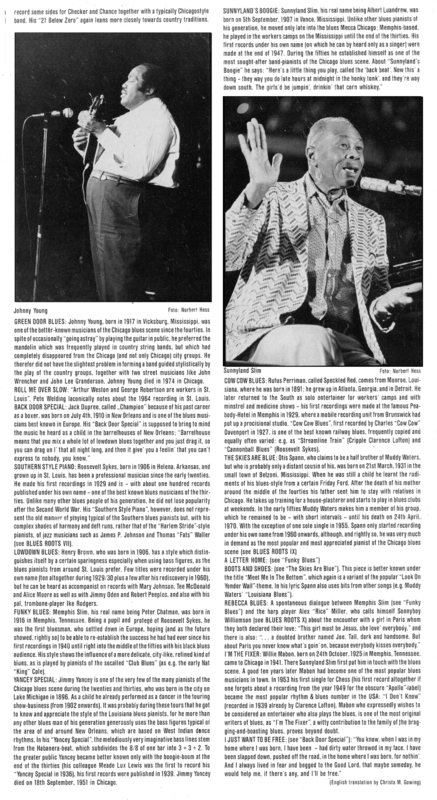 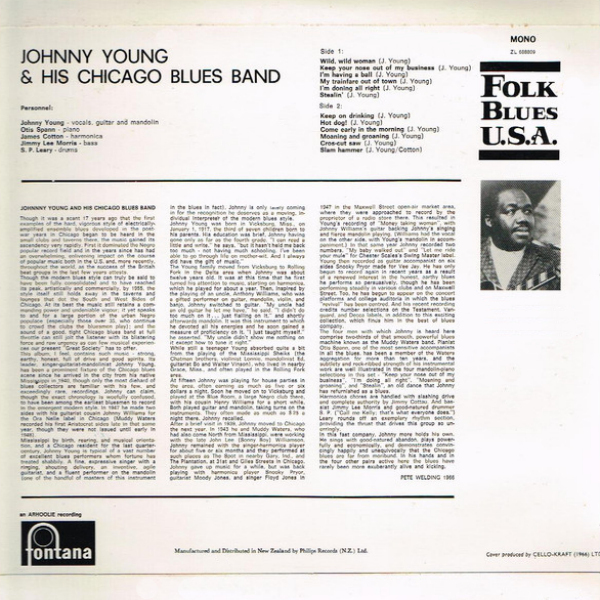 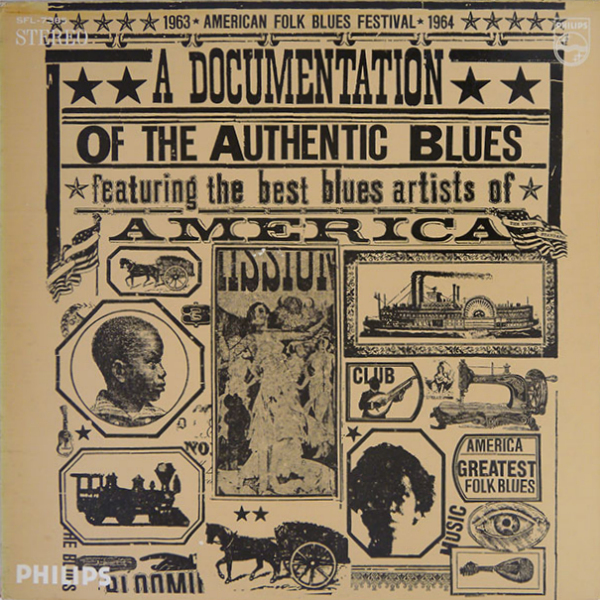 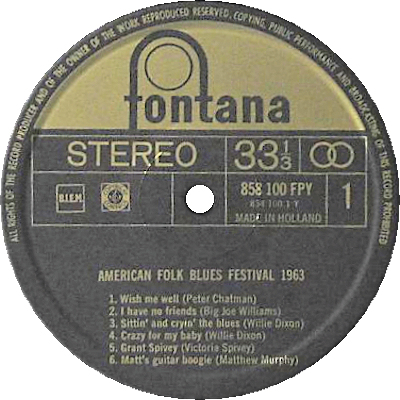 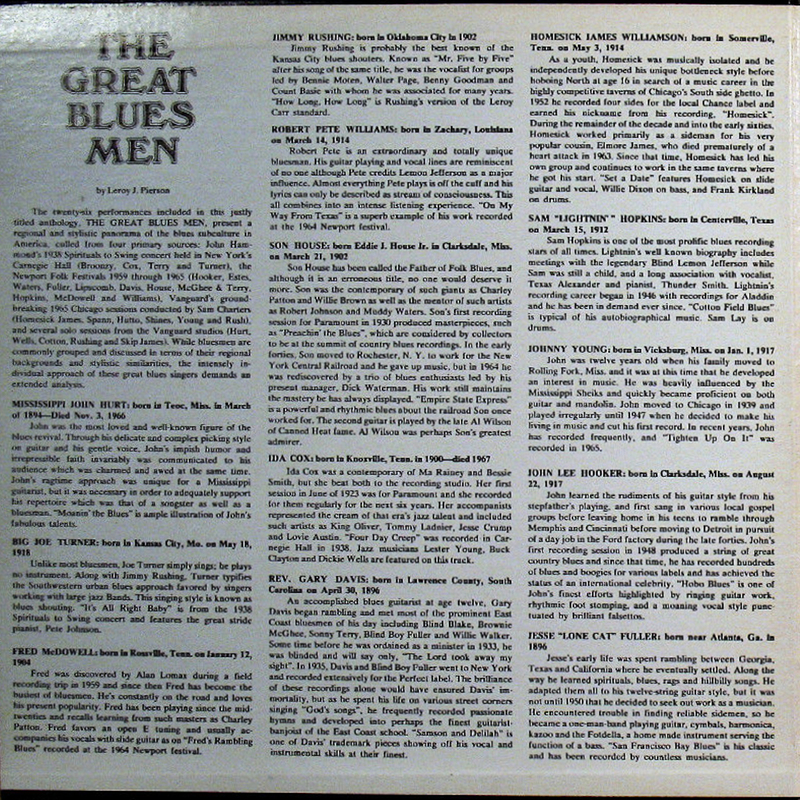 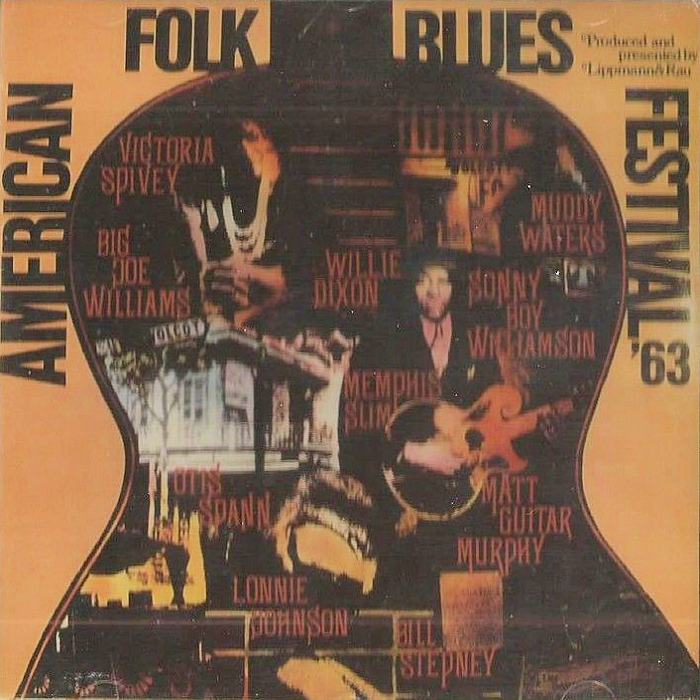 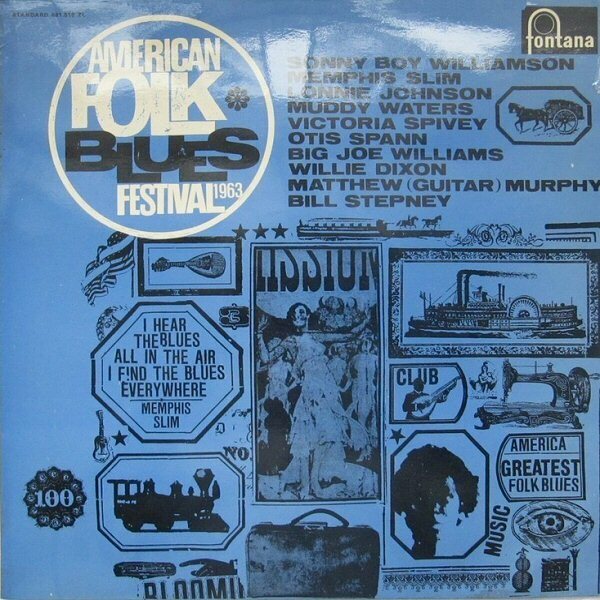 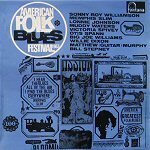 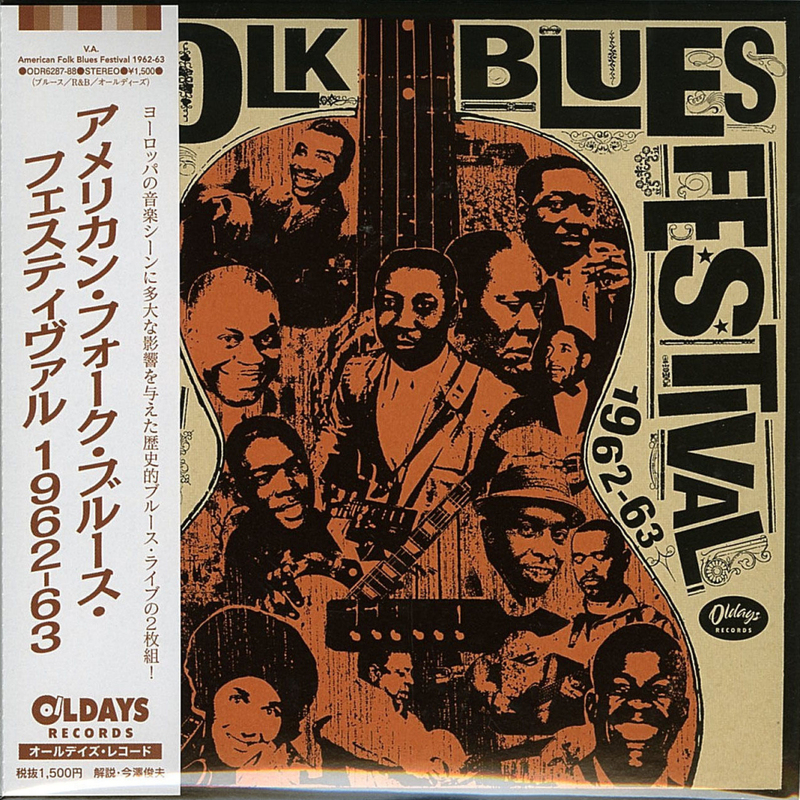 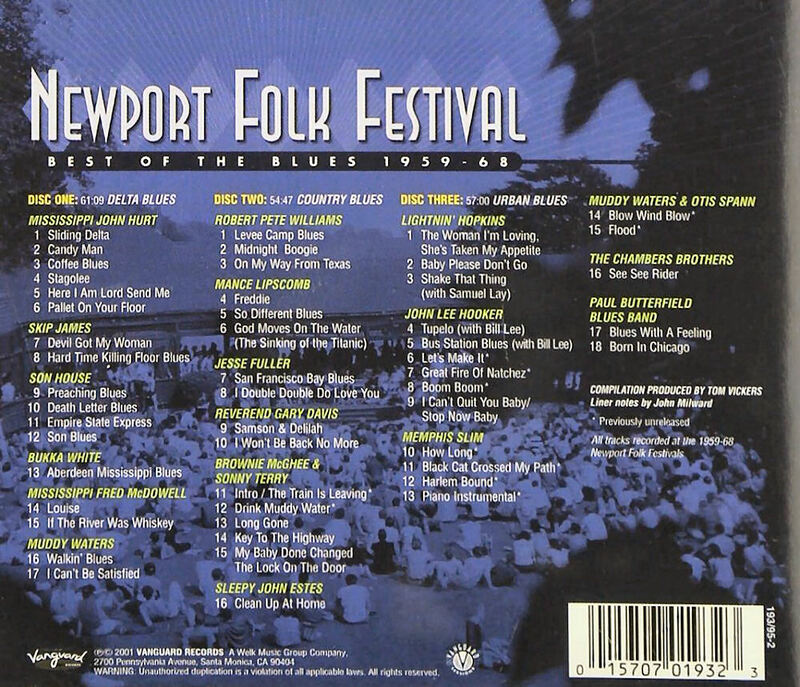 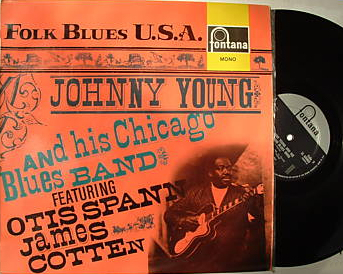 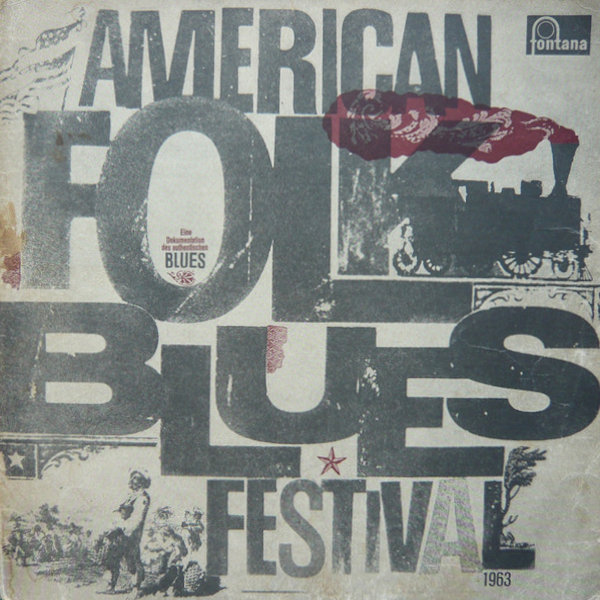 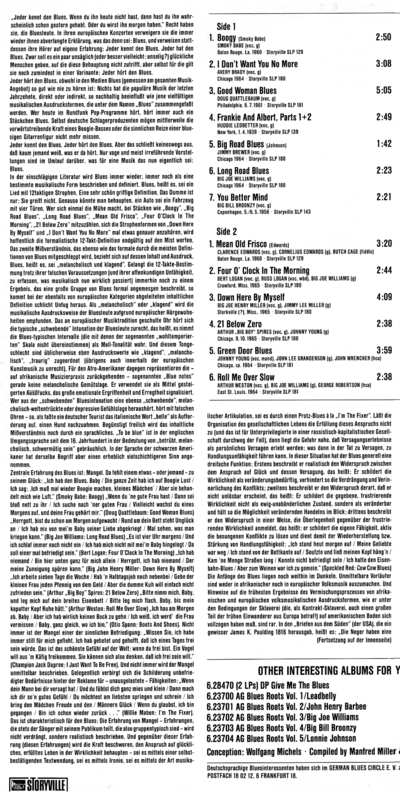 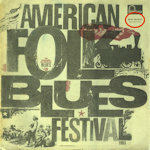 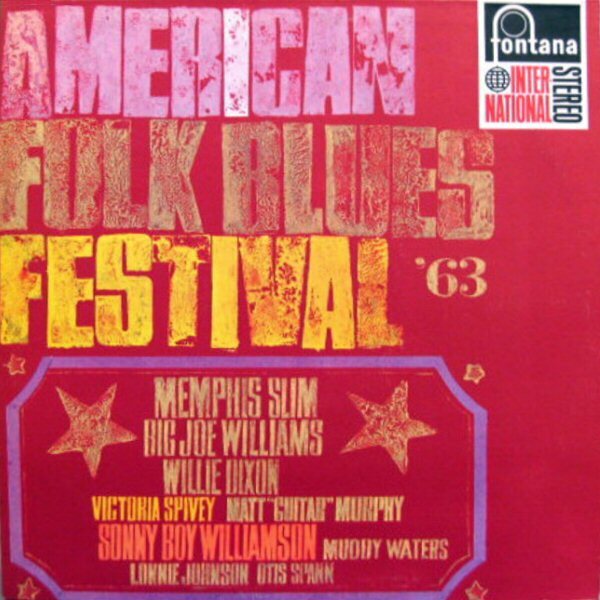 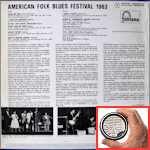 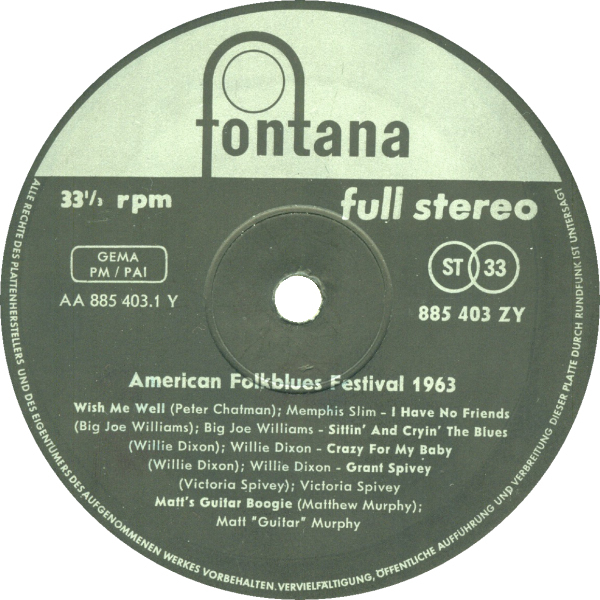 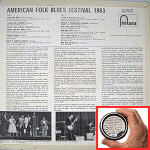 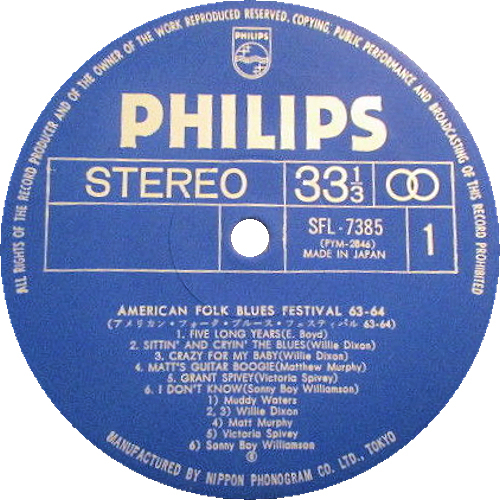 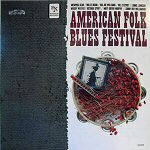 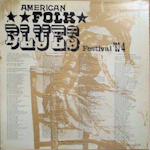 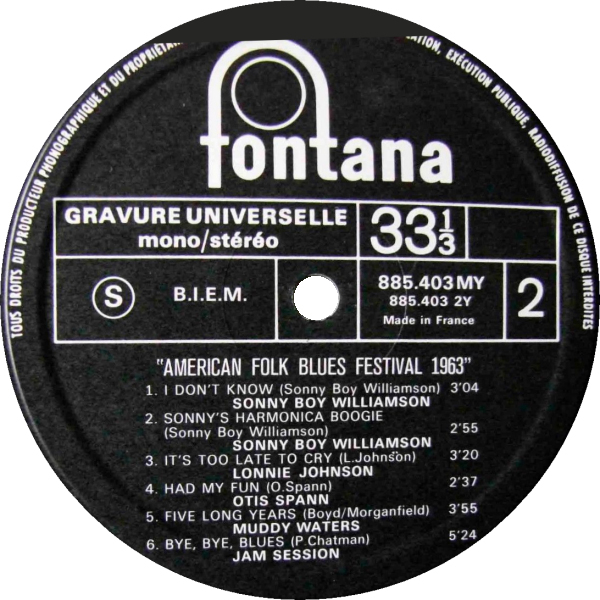 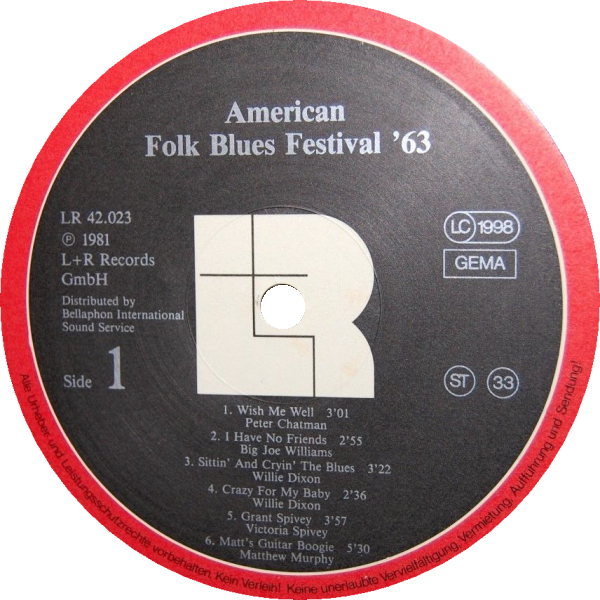 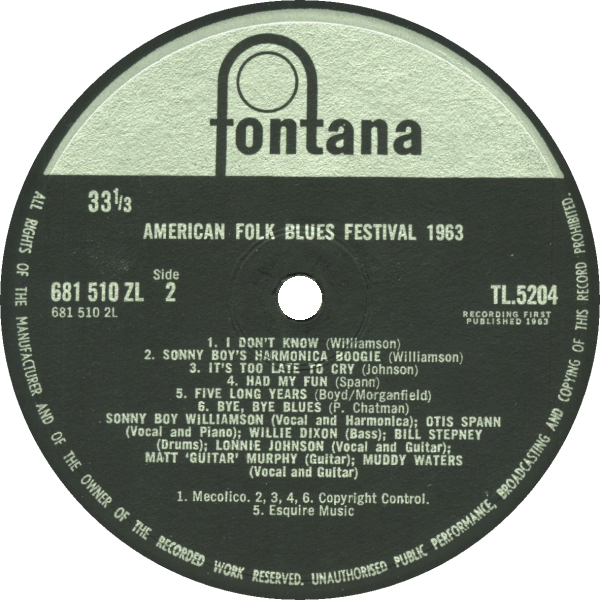 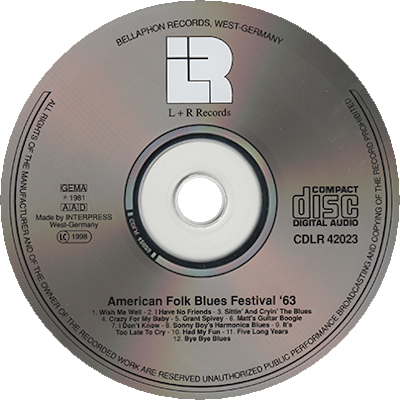 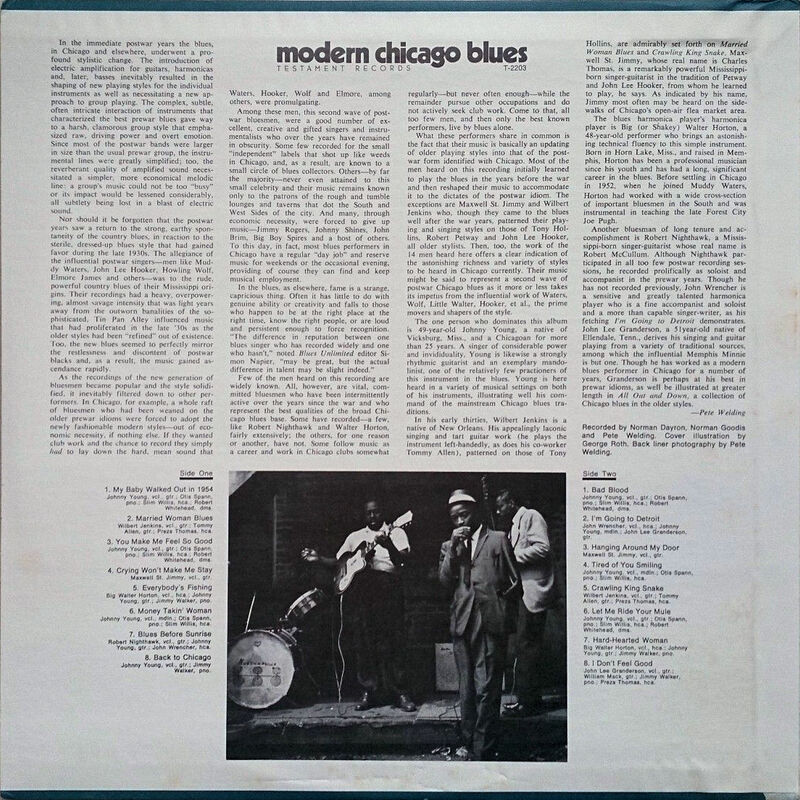 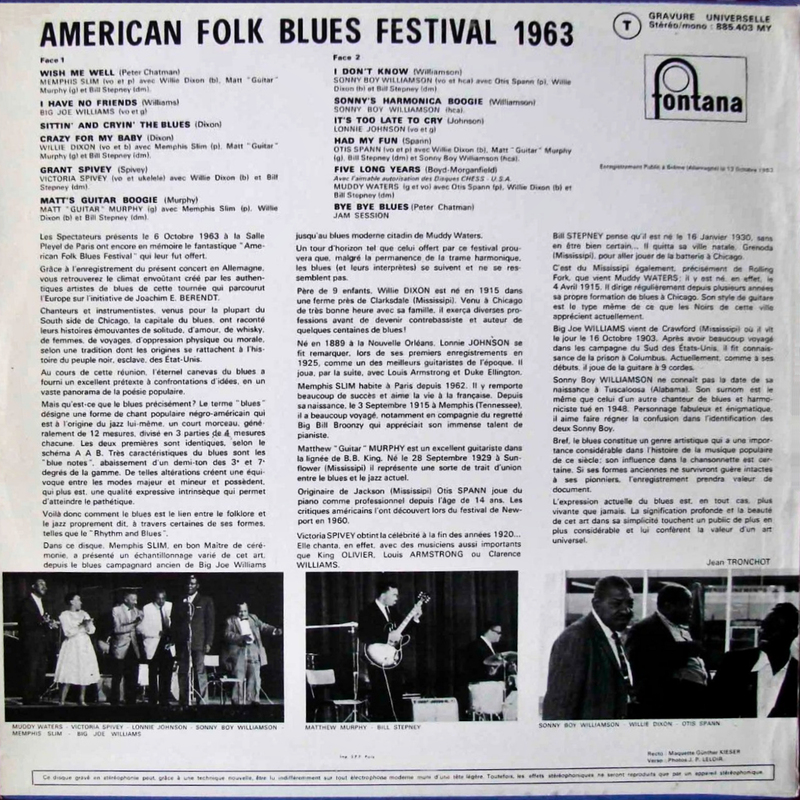 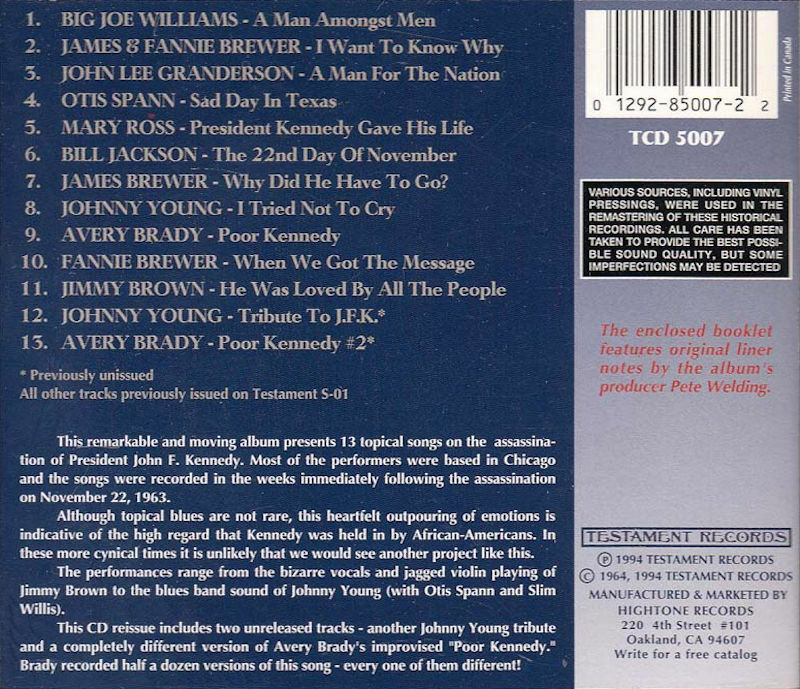 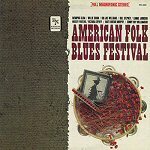 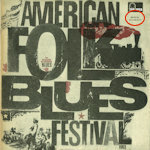 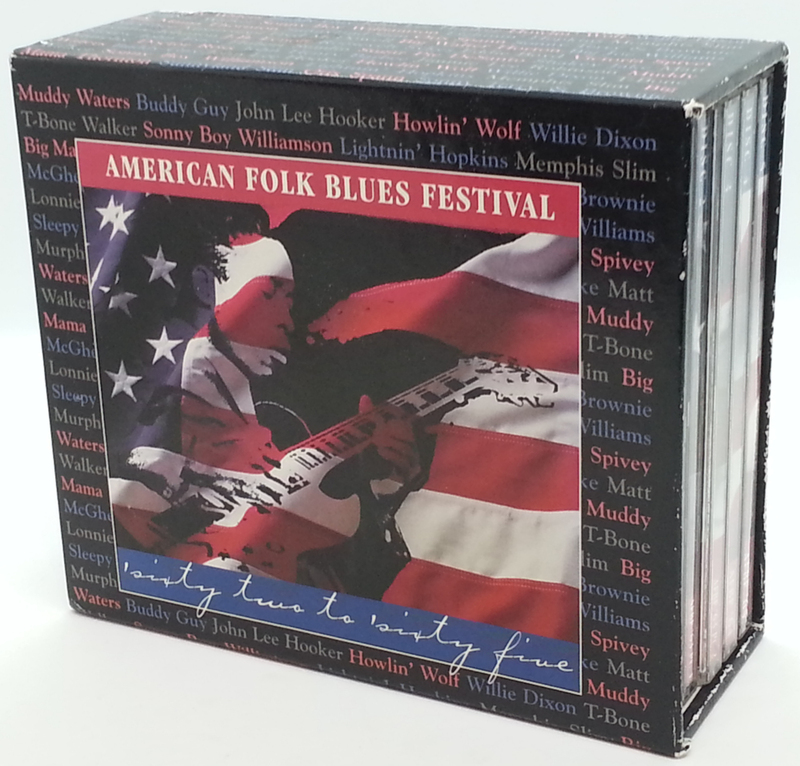 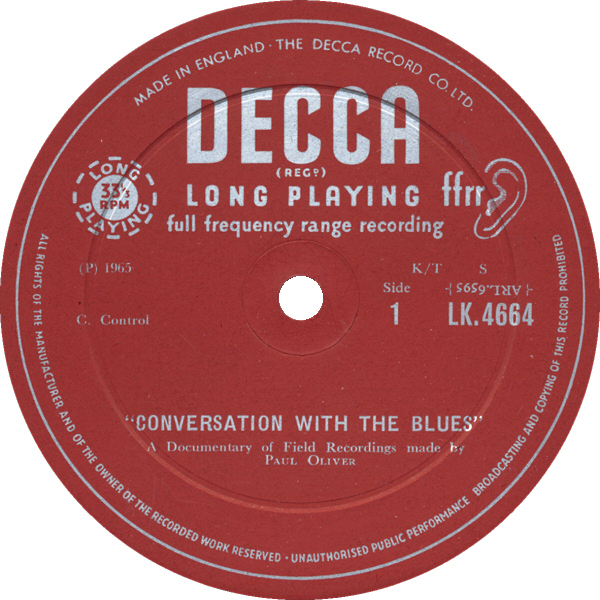 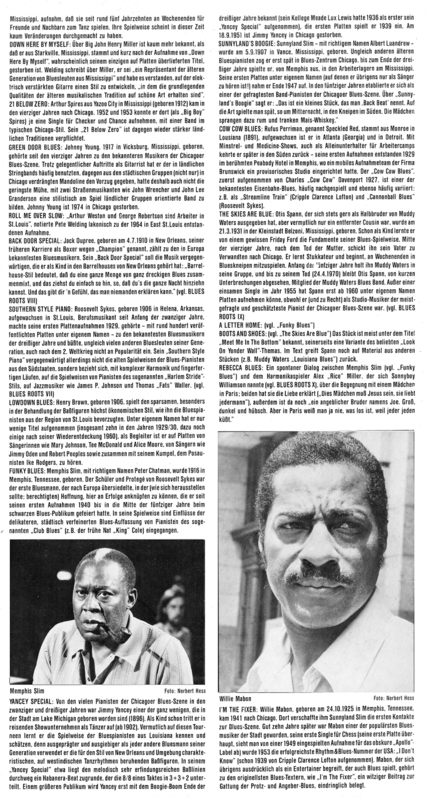 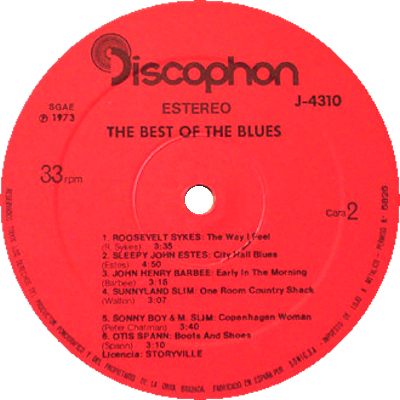 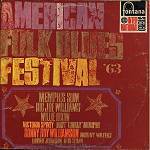 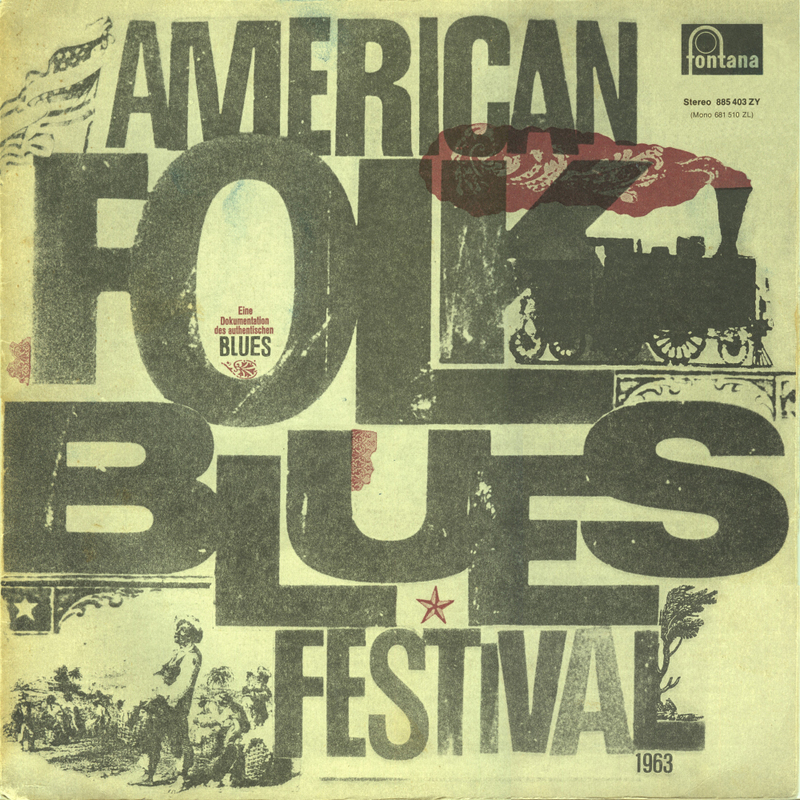 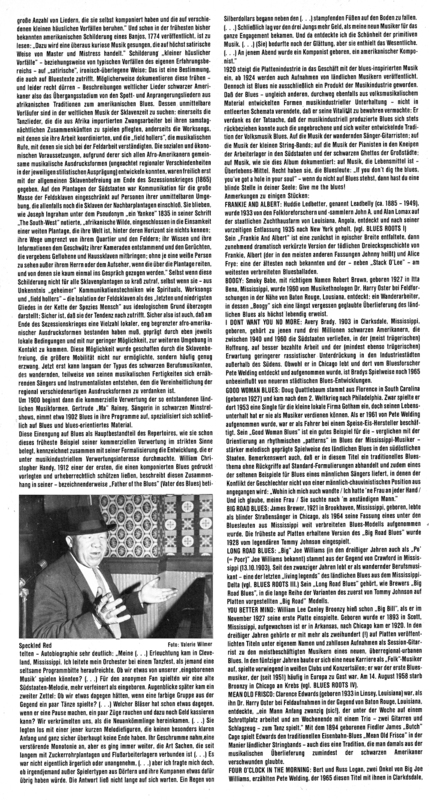 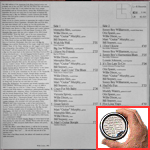 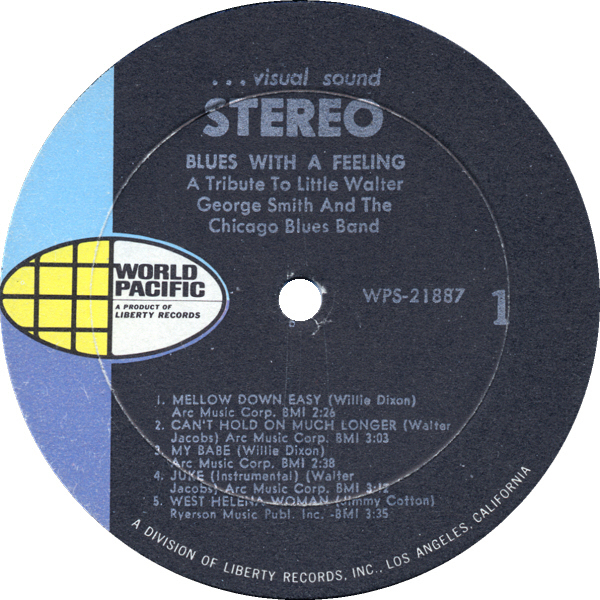 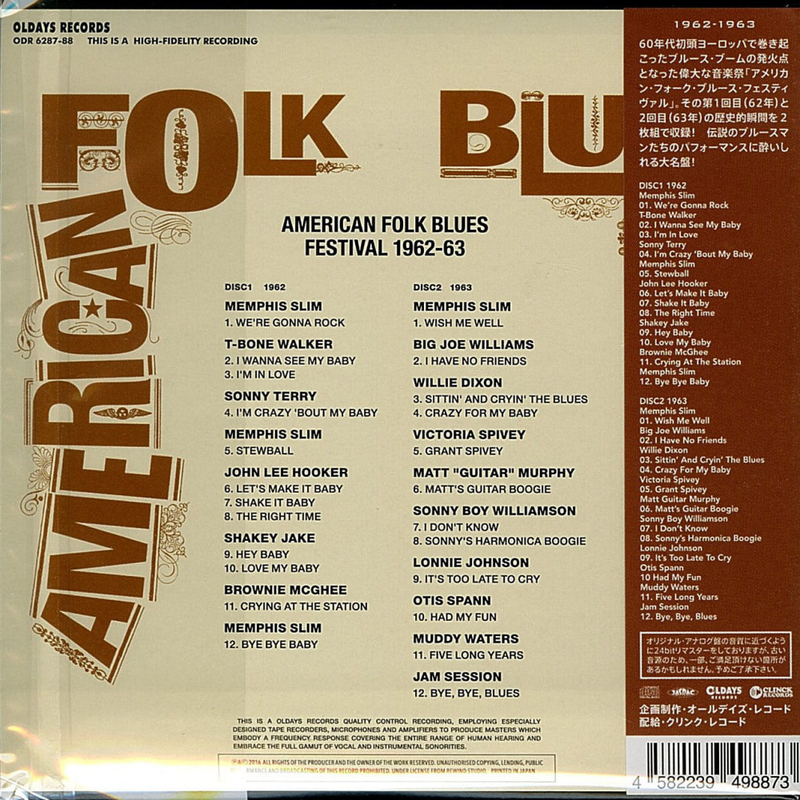 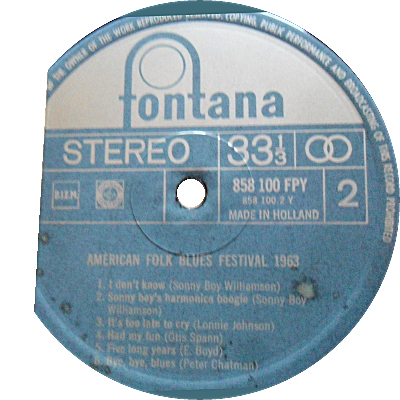 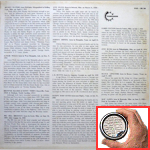 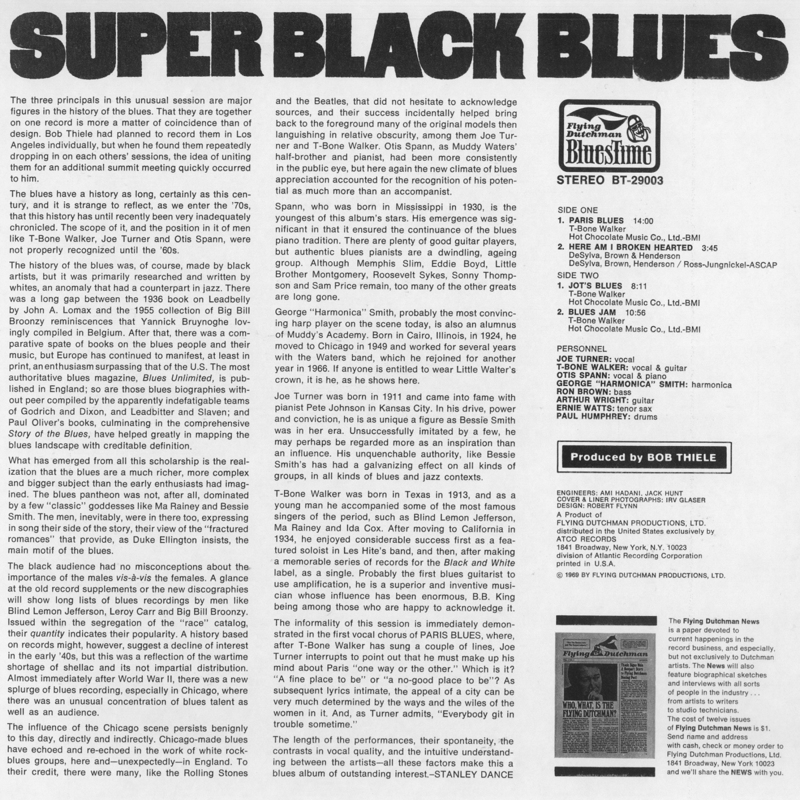 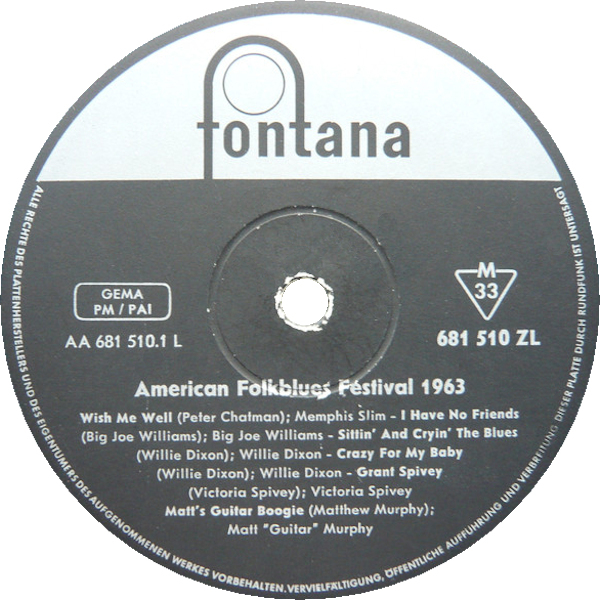 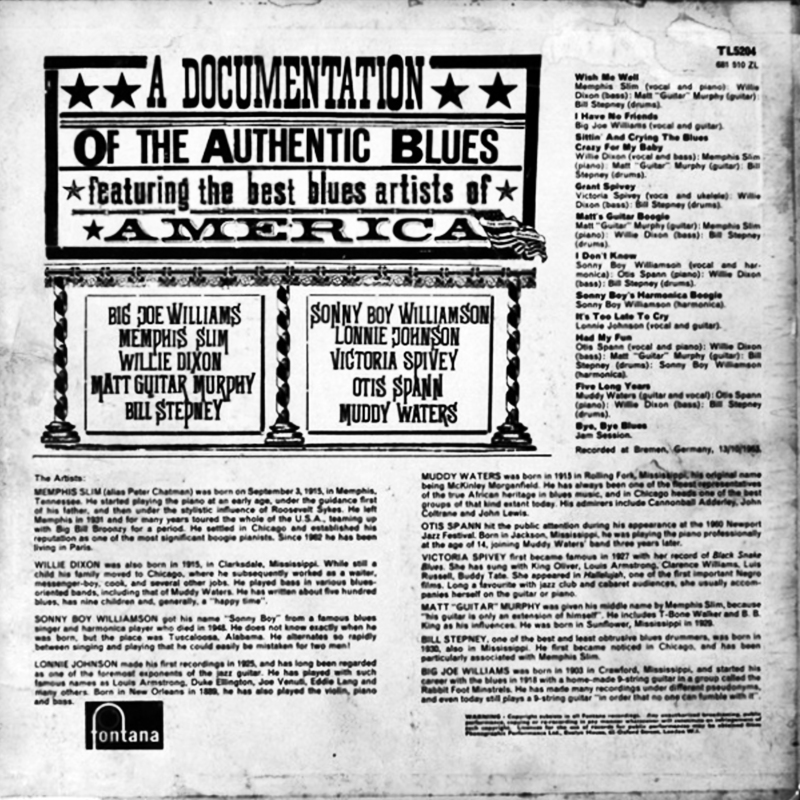 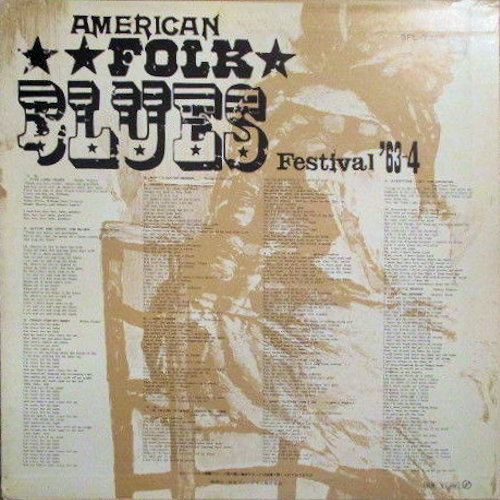 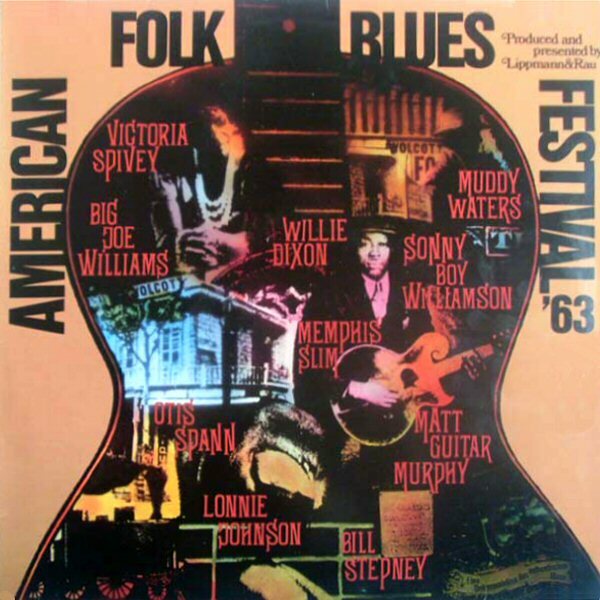 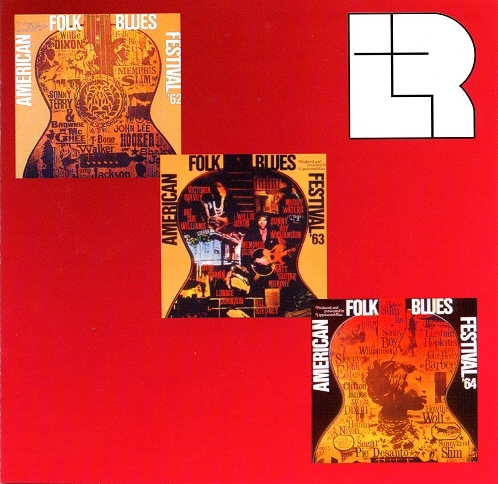 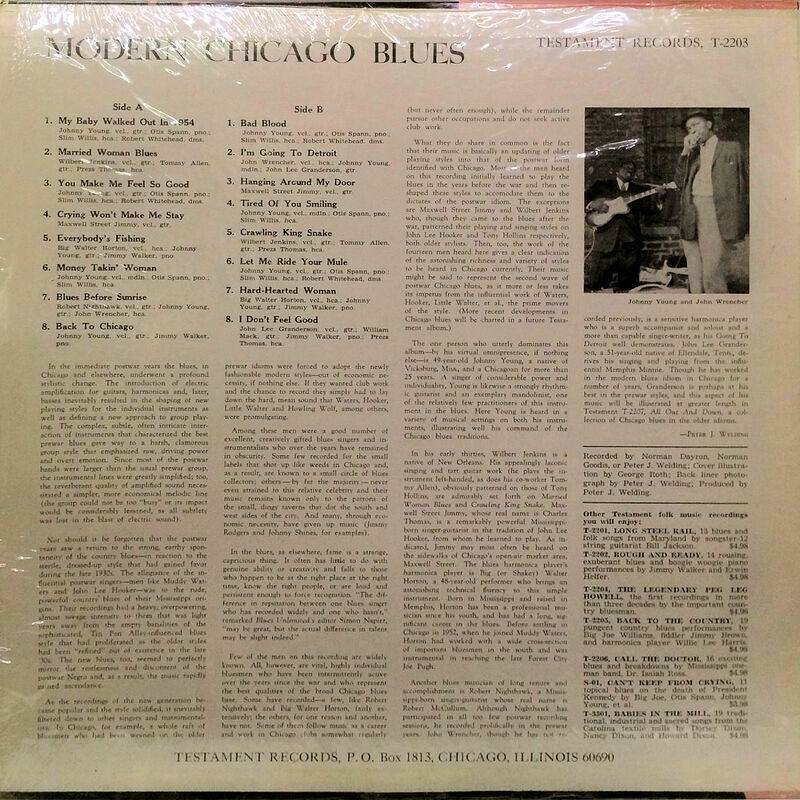 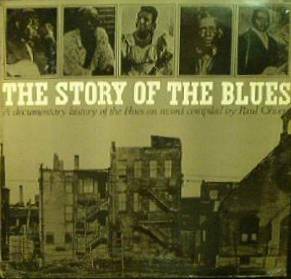 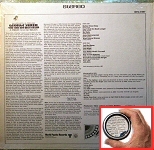 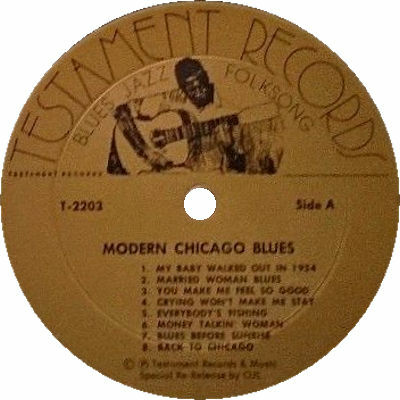 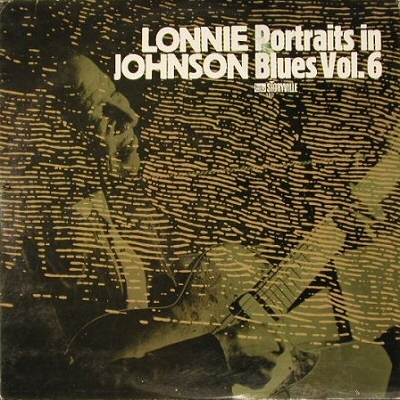 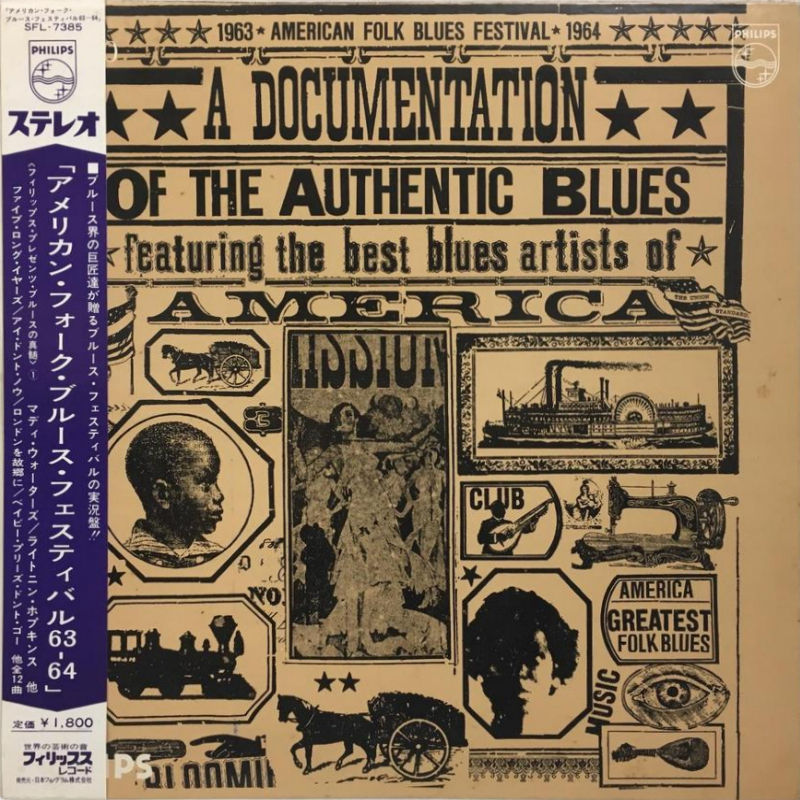 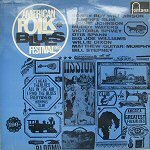 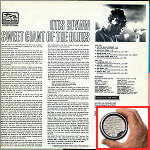 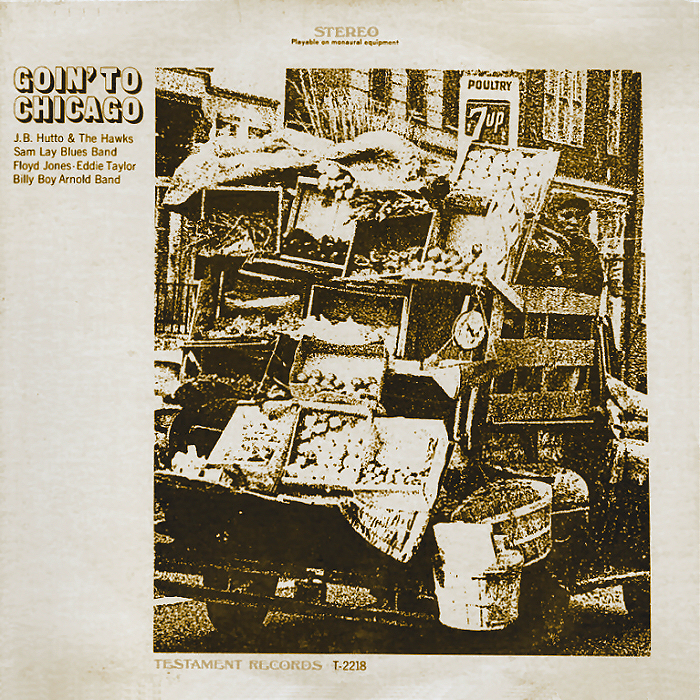 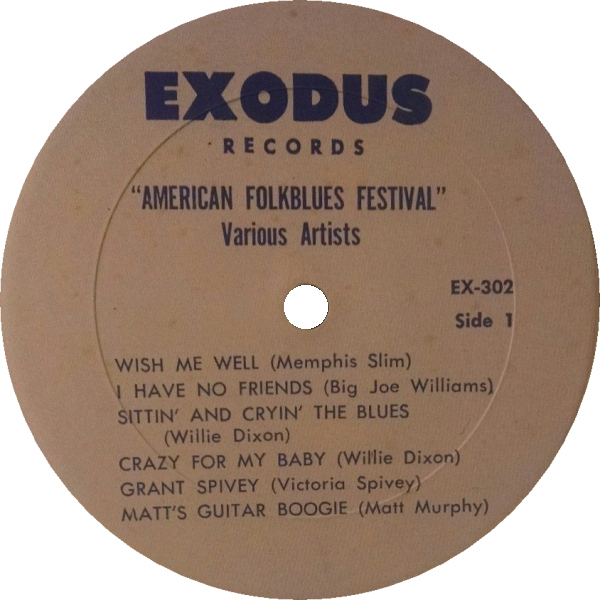 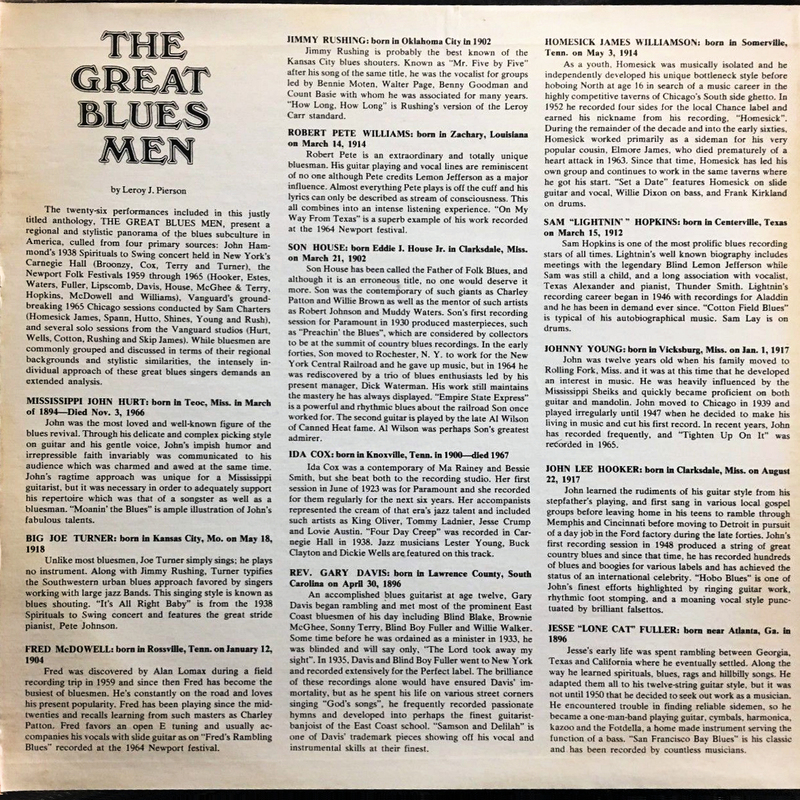 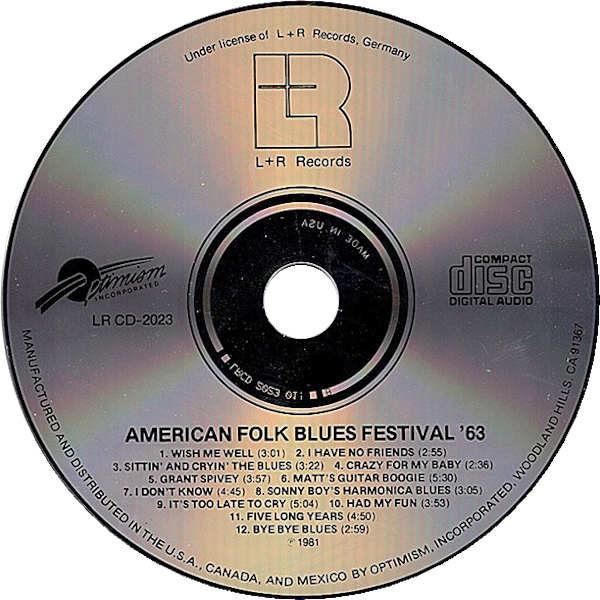 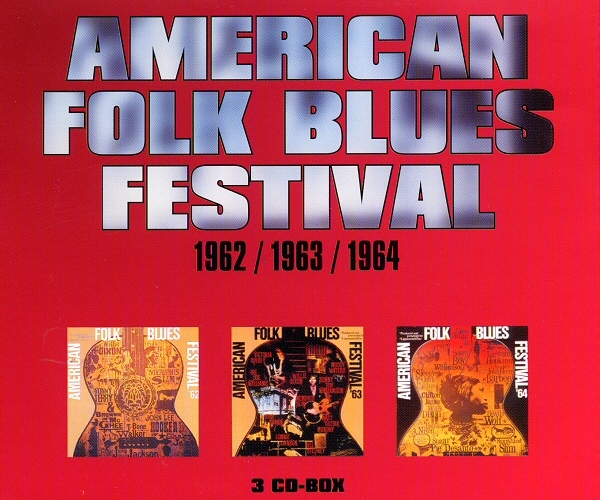 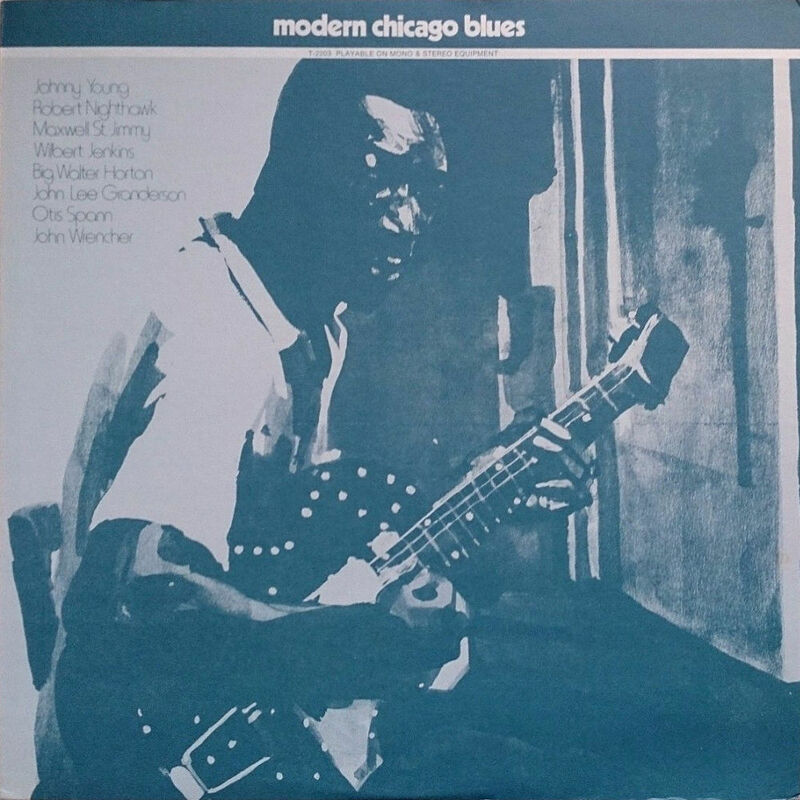 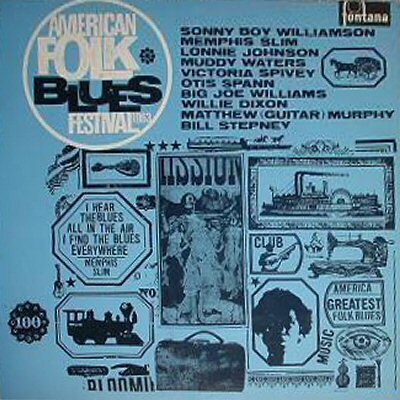 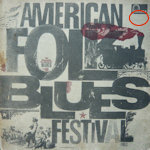 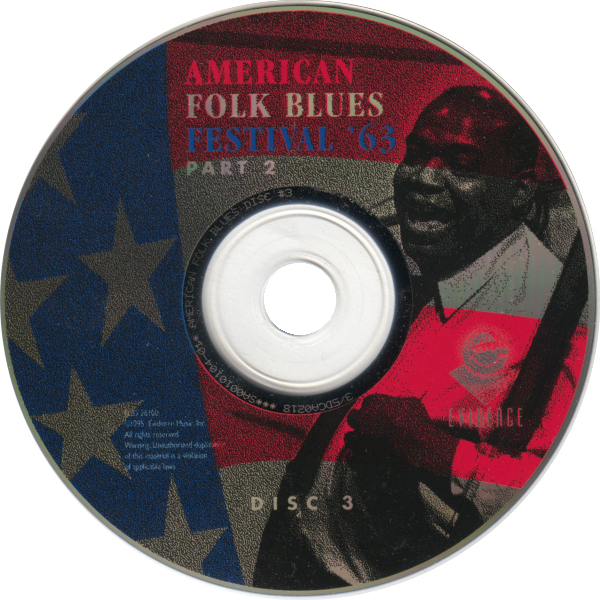 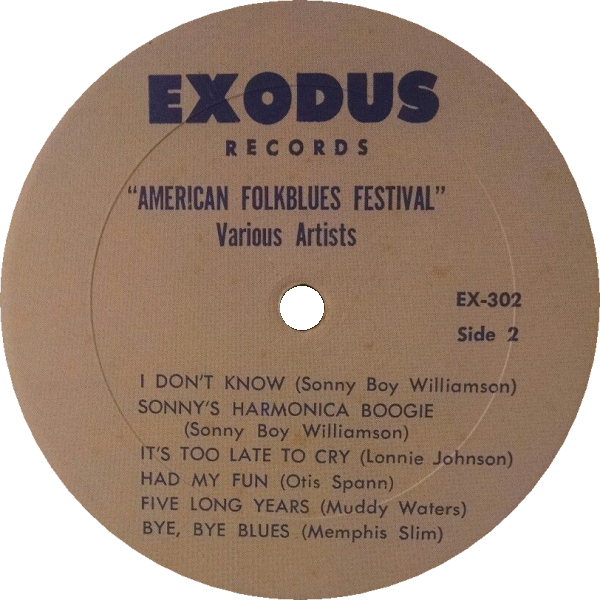 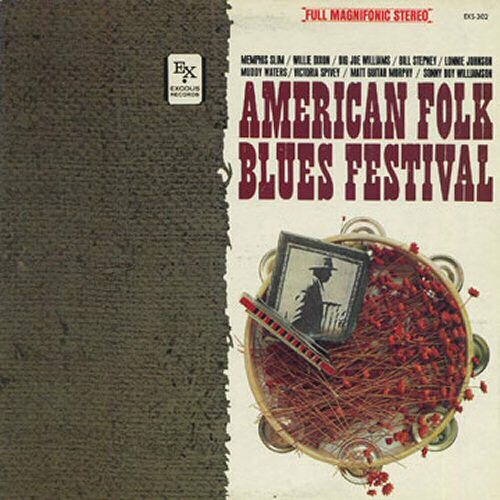 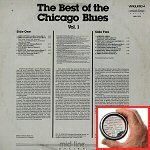 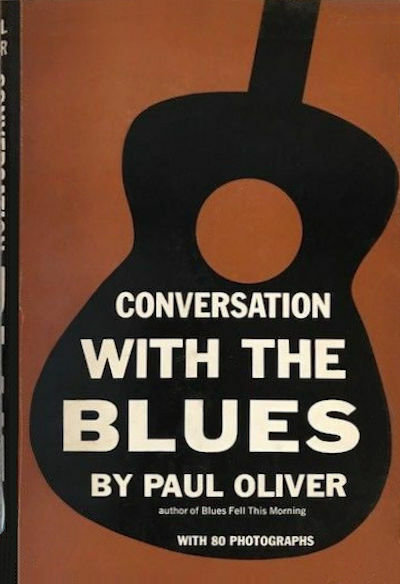 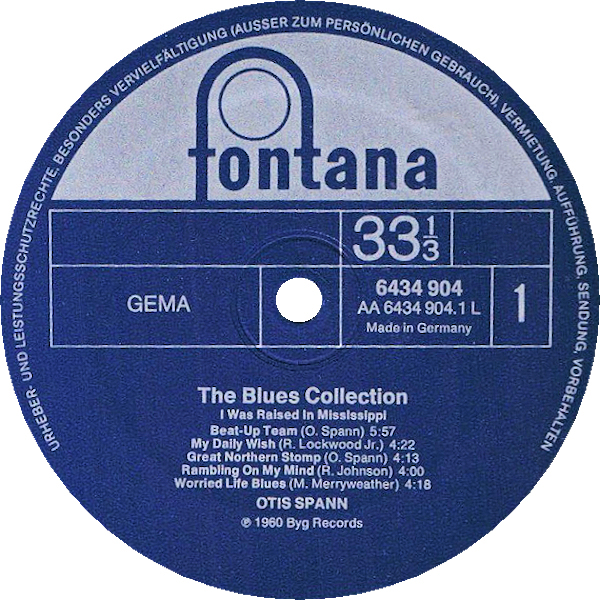 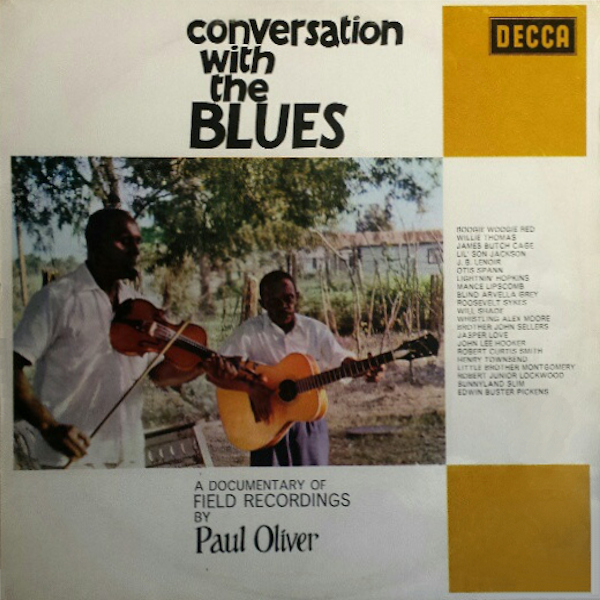 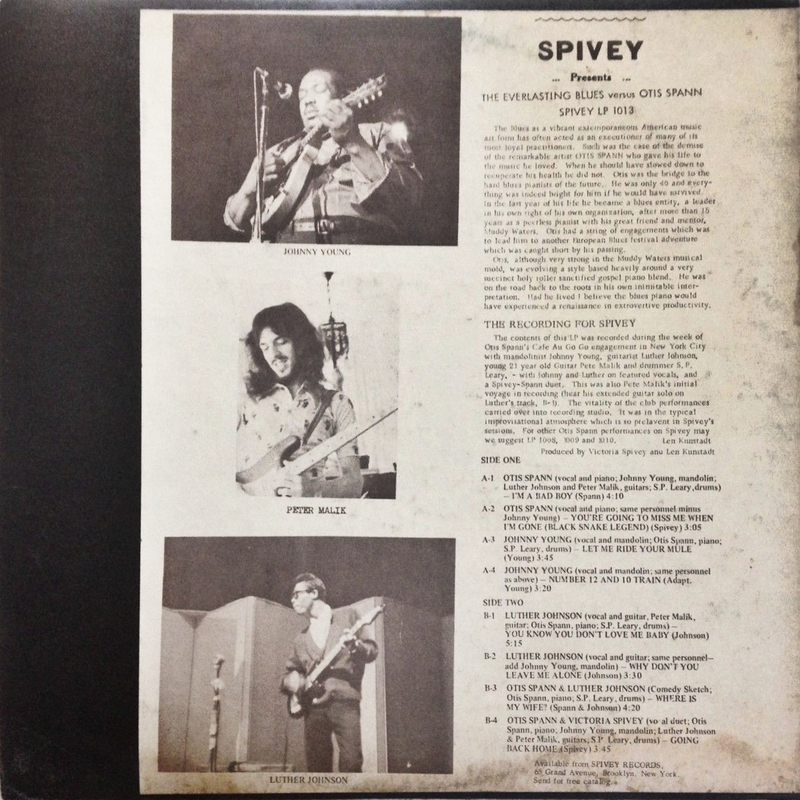 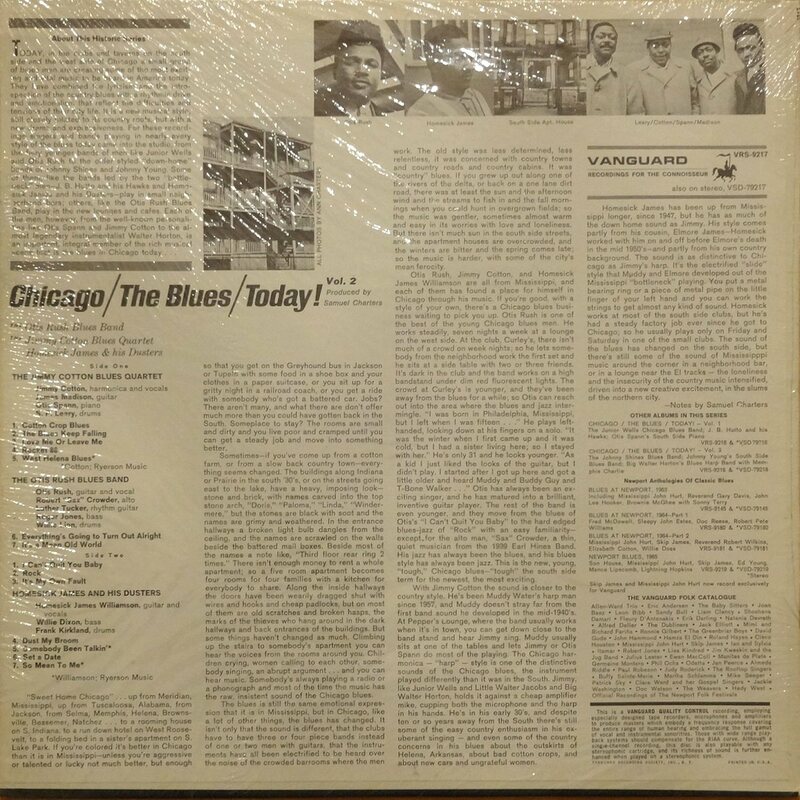 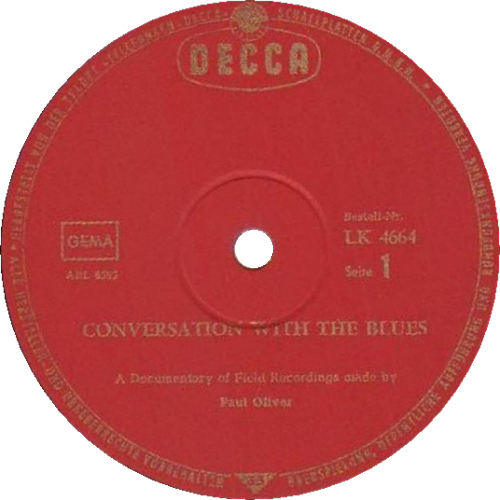 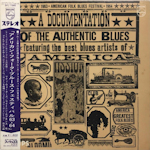 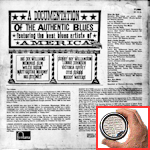 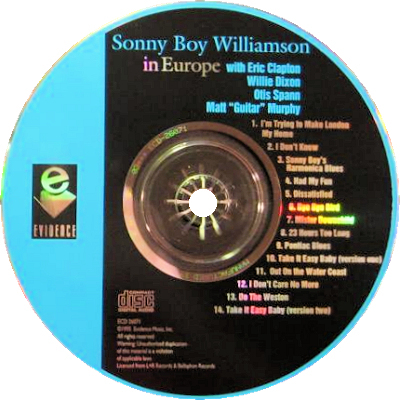 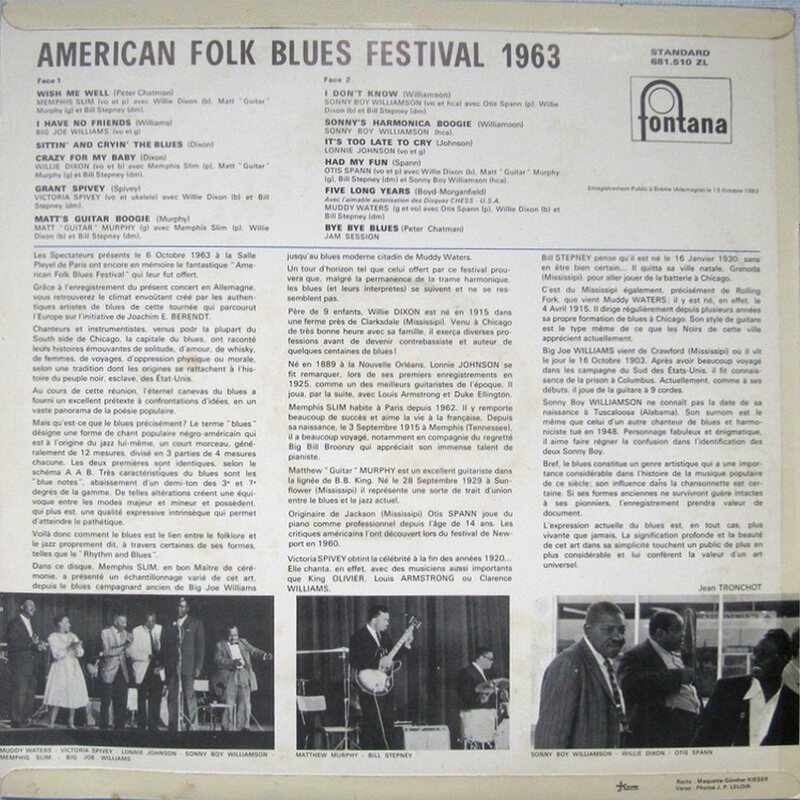 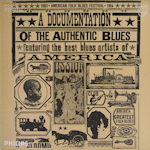 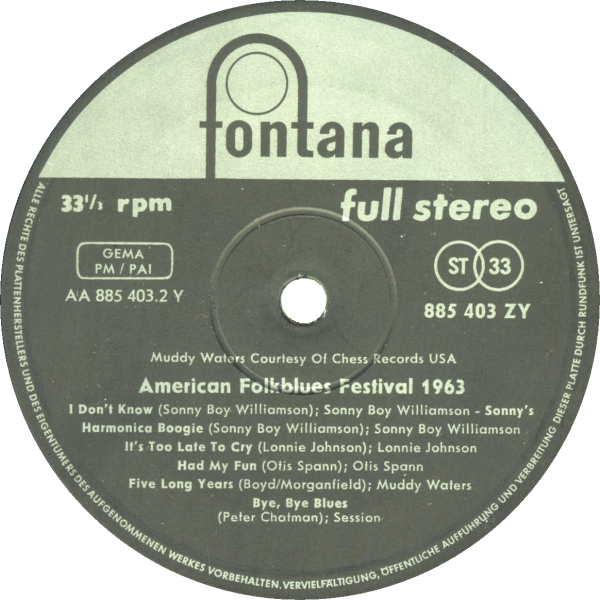 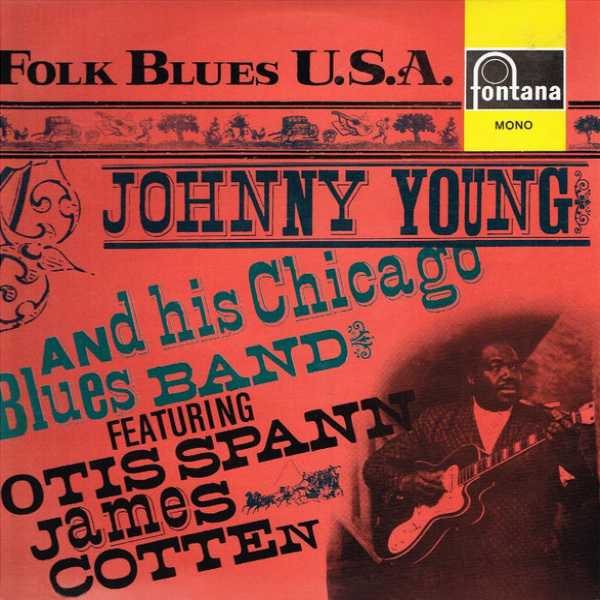 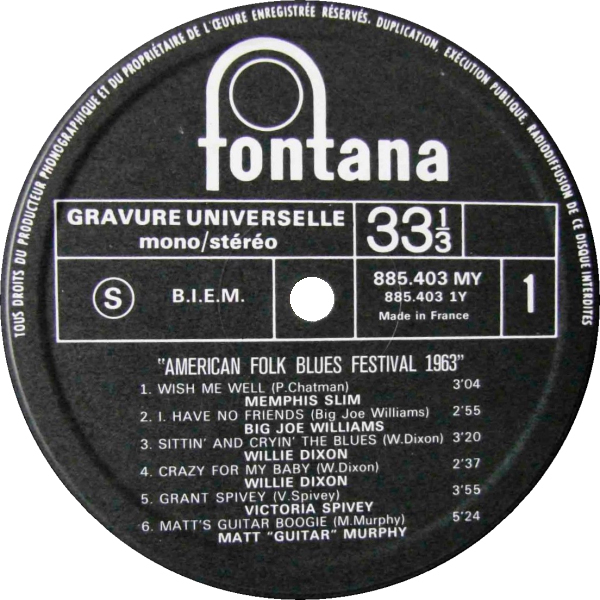 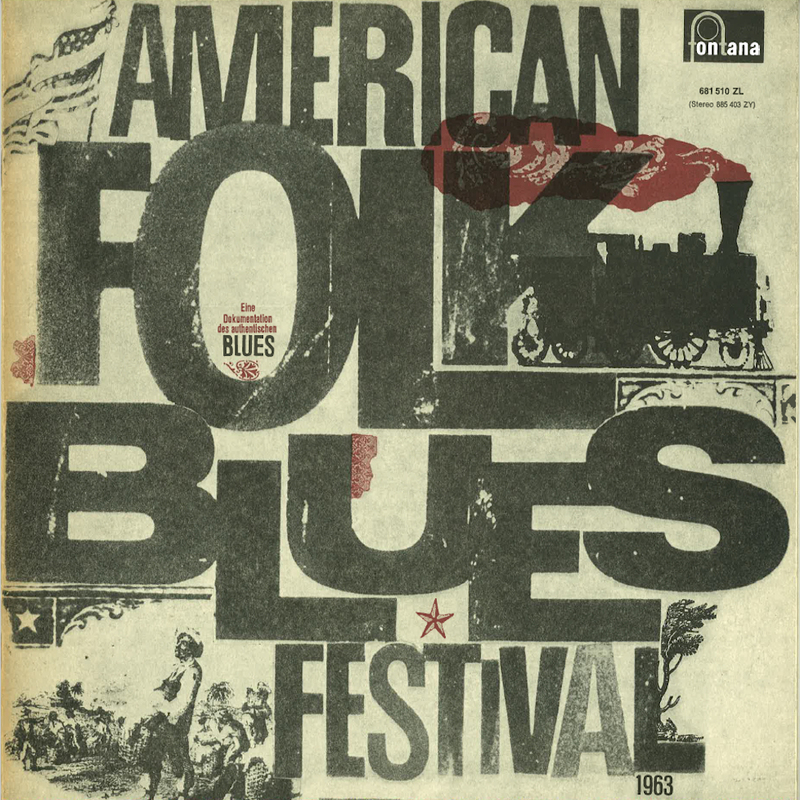 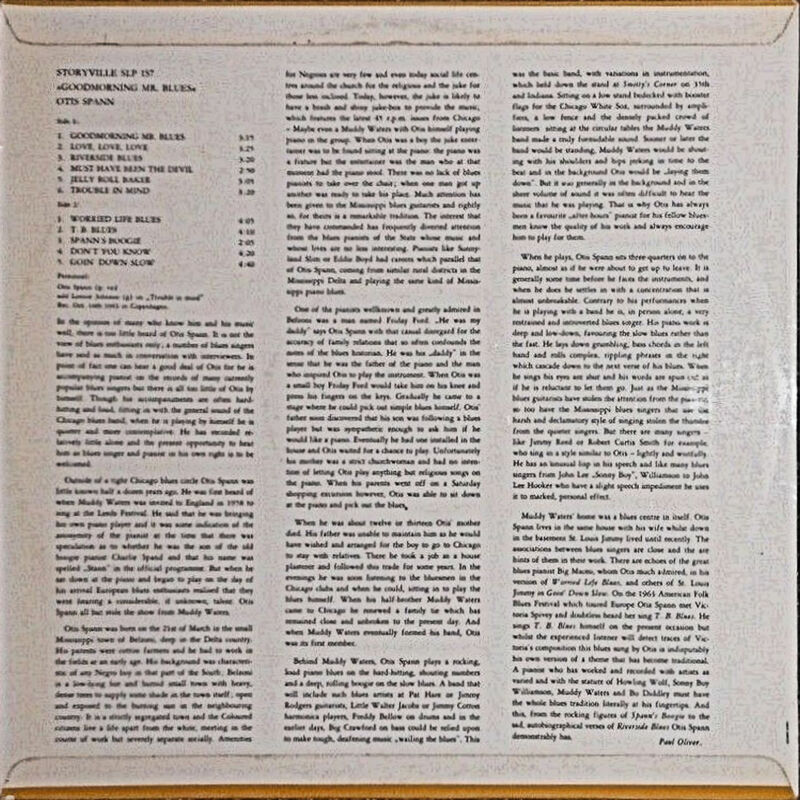 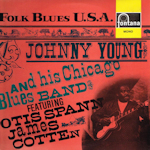 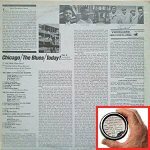 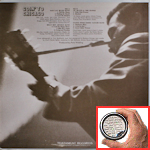 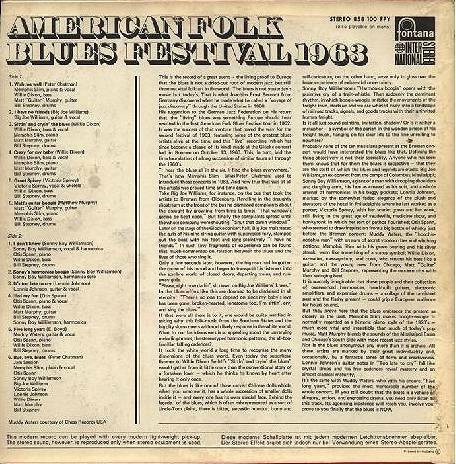 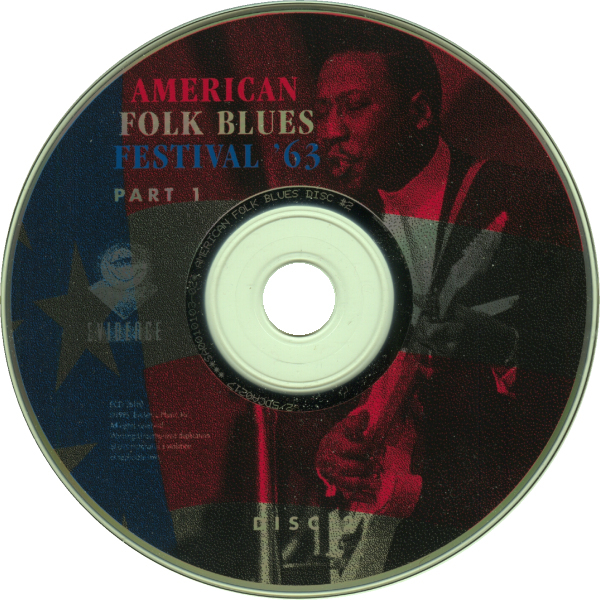 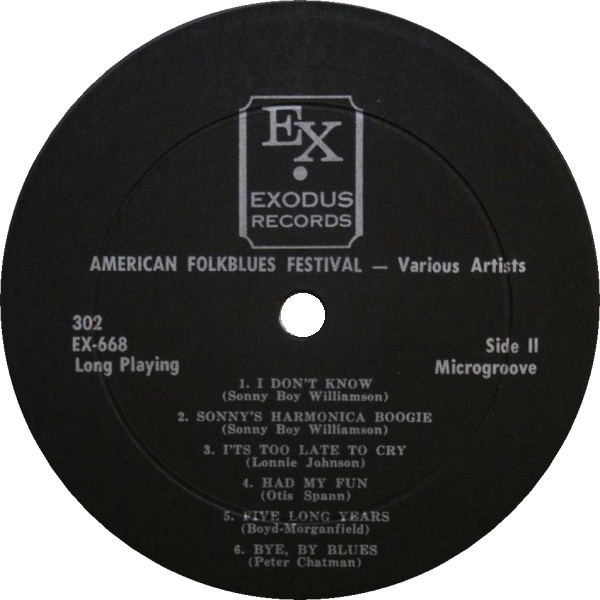 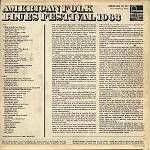 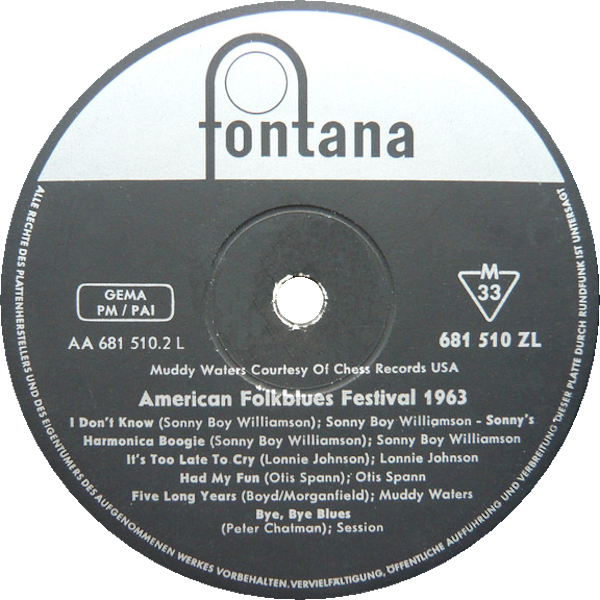 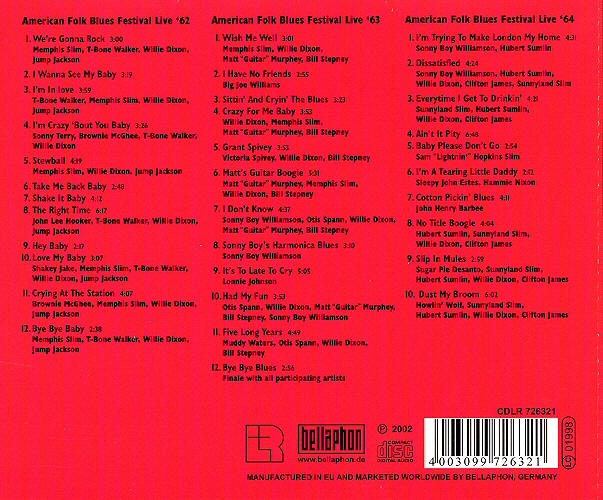 "A documentation of the authentic blues featuring the best blues artists of America"
= Fontana 885403 ZY (stereo) (Germany 1963) "American Folkblues Festival"
= Fontana TL 5204 (mono) (UK 1964) "American Folk Blues Festival"
(=) Philips/Phonogram SFL-7385 (Jp 1969) "American Folk Blues Festival 63-64"
(=) Evidence ECD 26100 (US 1995) "American Folk Blues Festival '62-'65" CDs 2 & 3: "1963, parts 1 & 2"
(=) Evidence ECD 26087-2 (US 1997) "American Folk Blues Festival '62-'65 - Highlights"
Evidence ECD 260101 "American Folk Blues Festival '66 - '72" (as announced in the notes accompanying Evidence ECD 26087-2) obviously never happened! 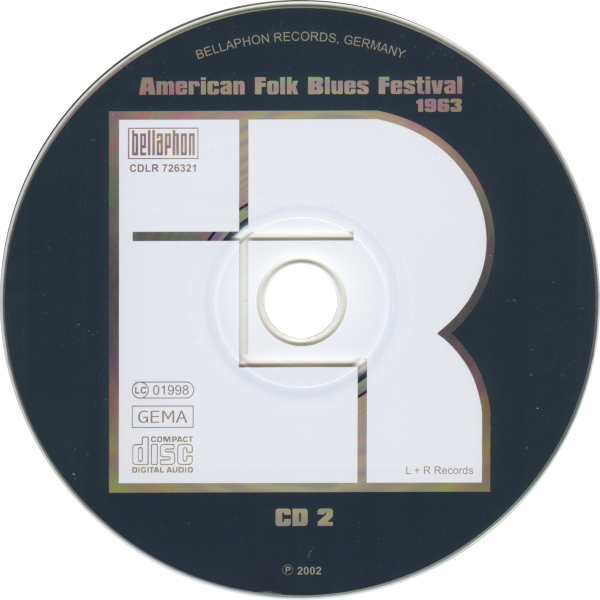 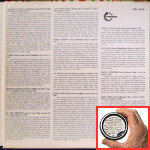 (=) Bellaphon CDLR 726321 (Germany 1999) "1962, 1963, 1964" CD 2: "1963"
(=) Oldays ODR 6287-88 (Jp 2016) "1962-63"
= Storyville 671157 "Portraits in Blues Vol. 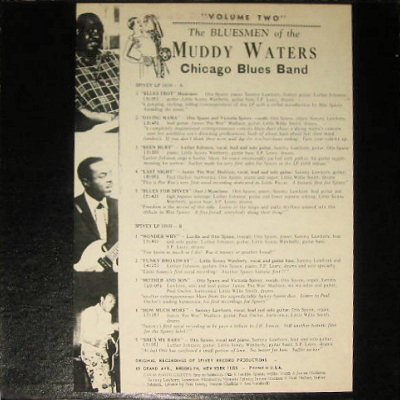 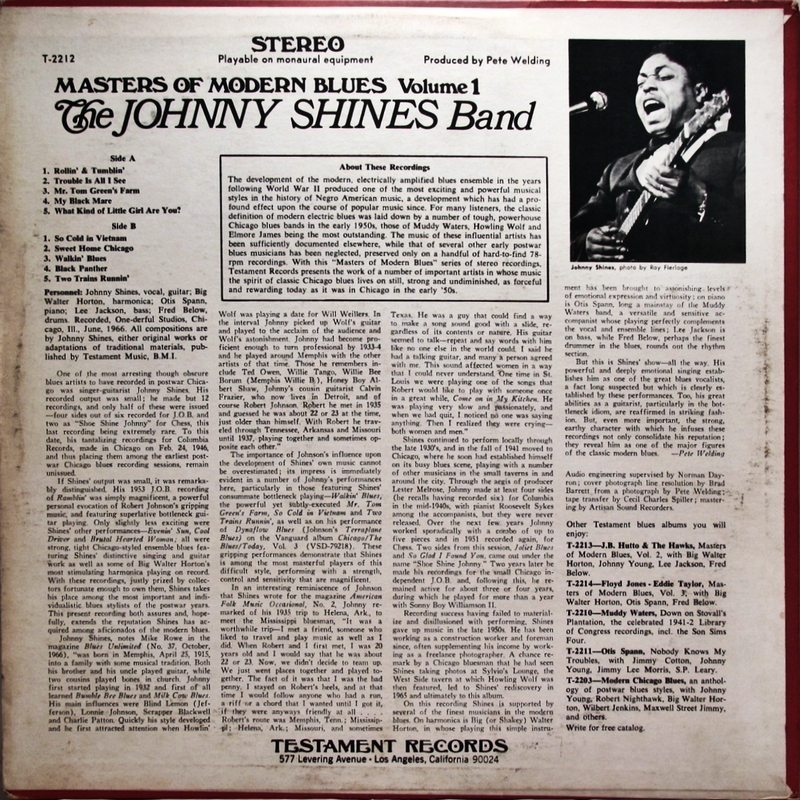 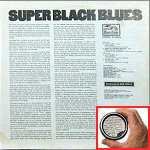 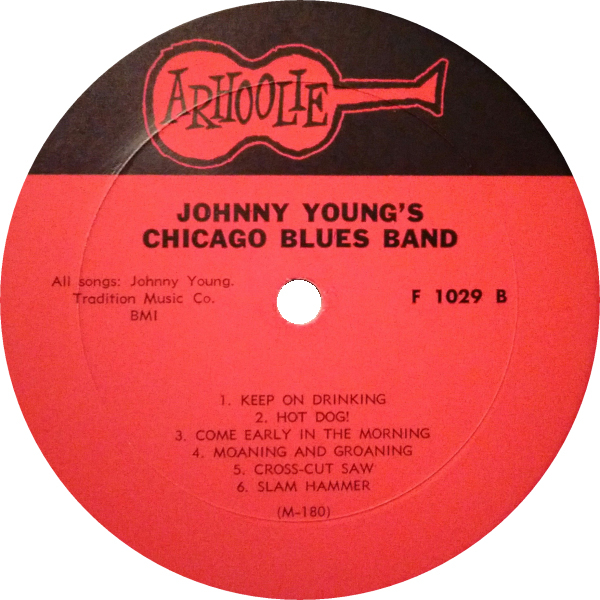 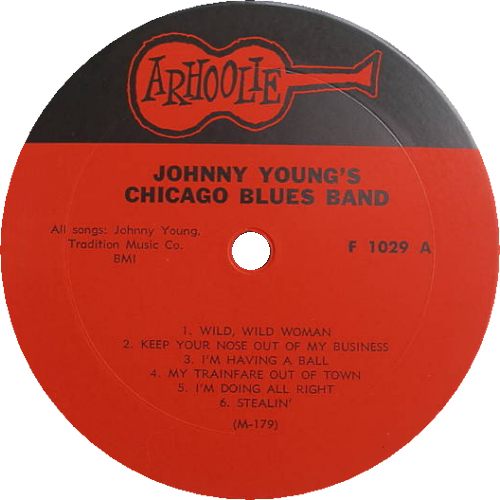 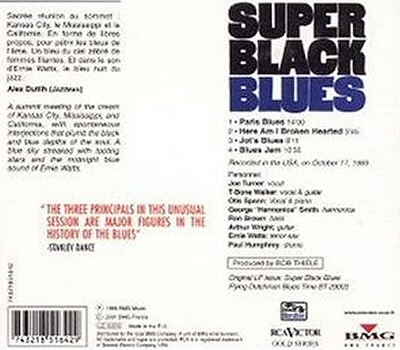 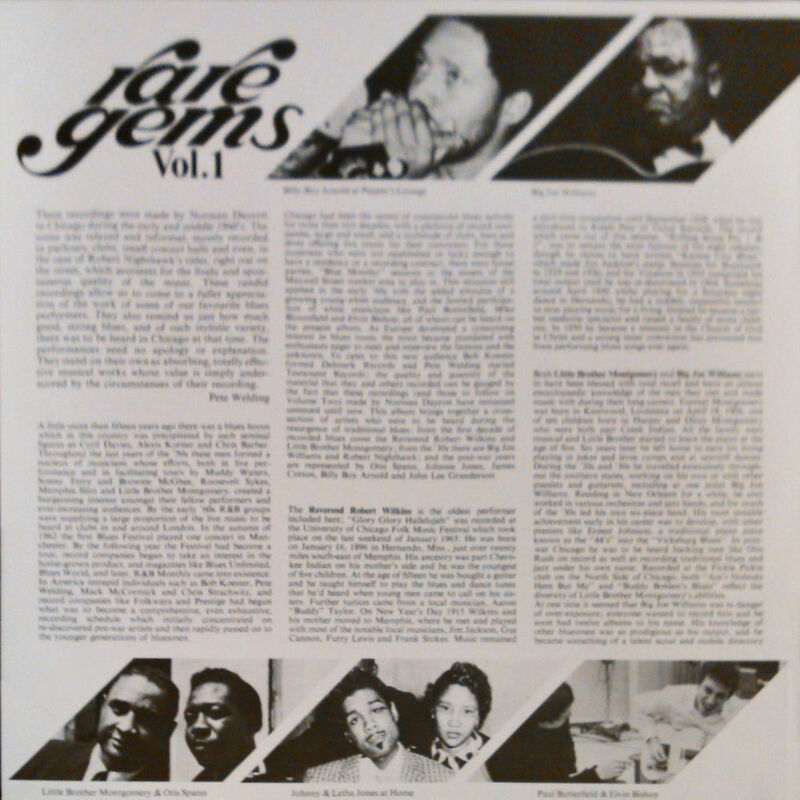 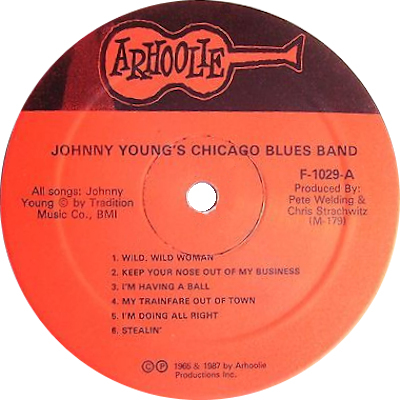 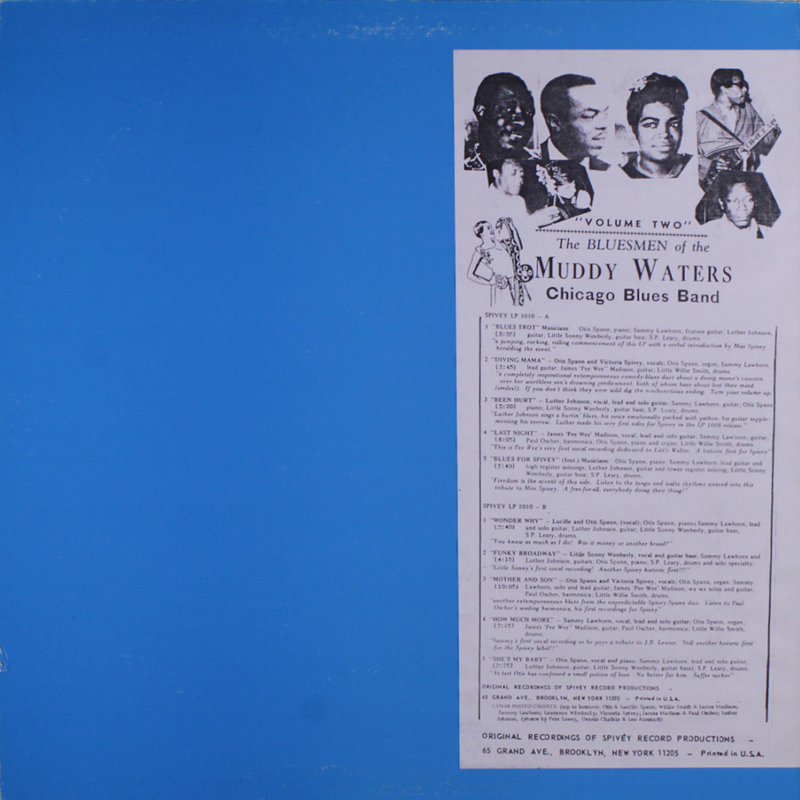 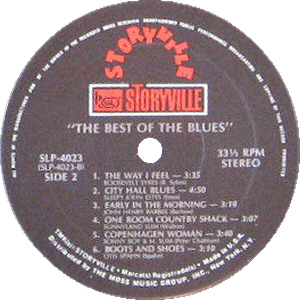 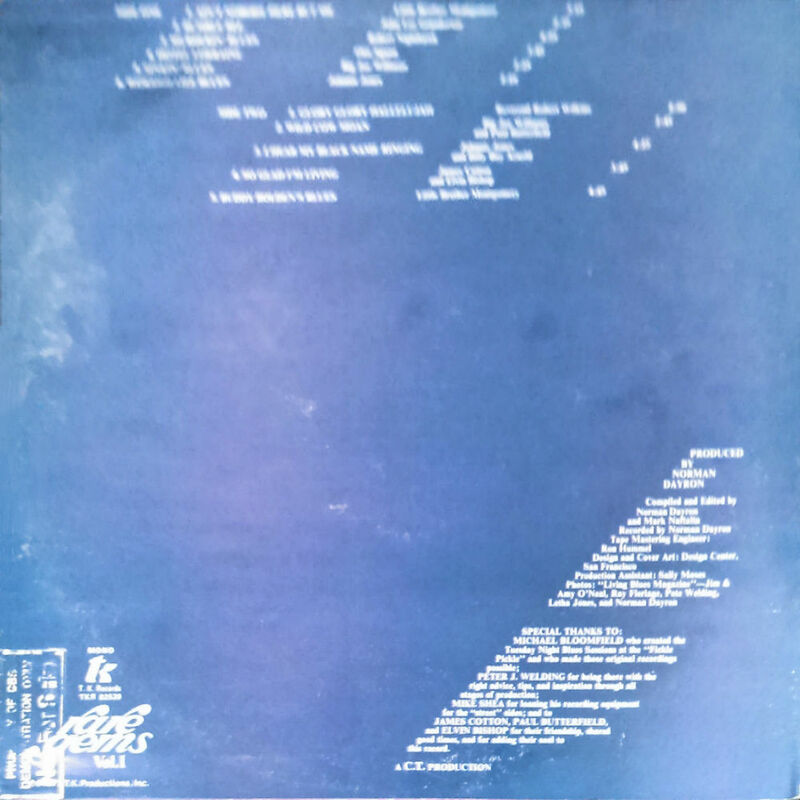 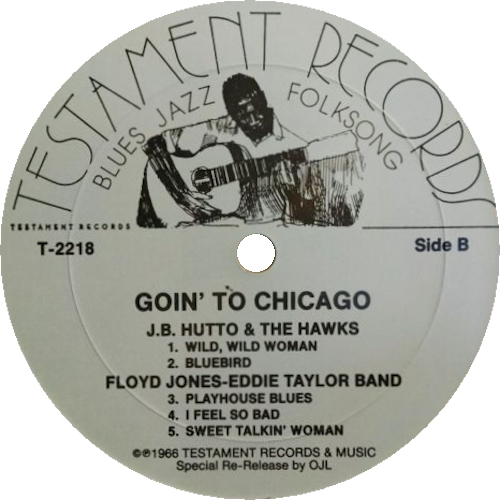 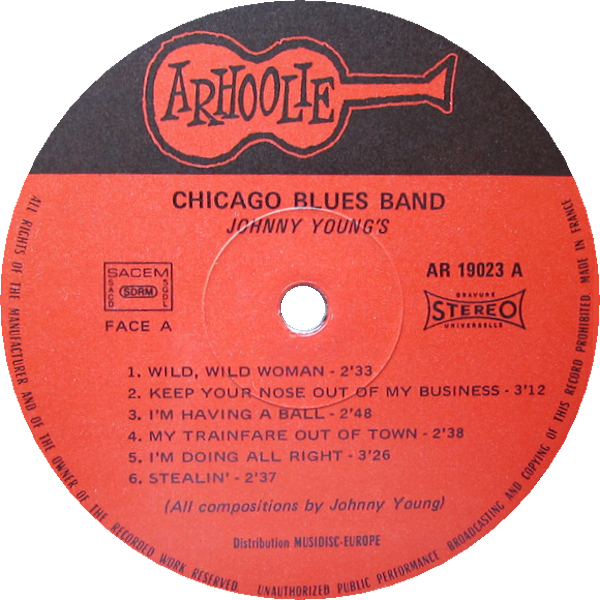 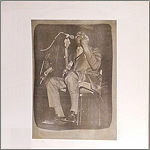 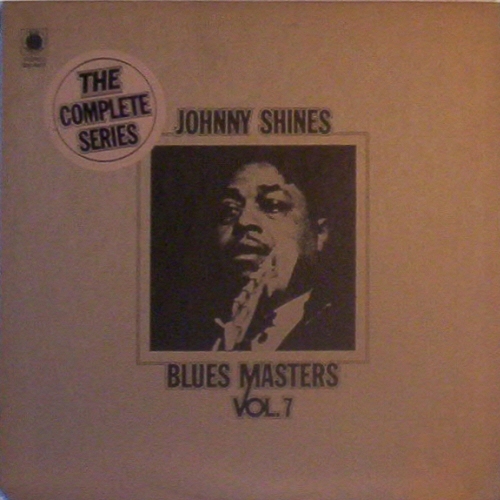 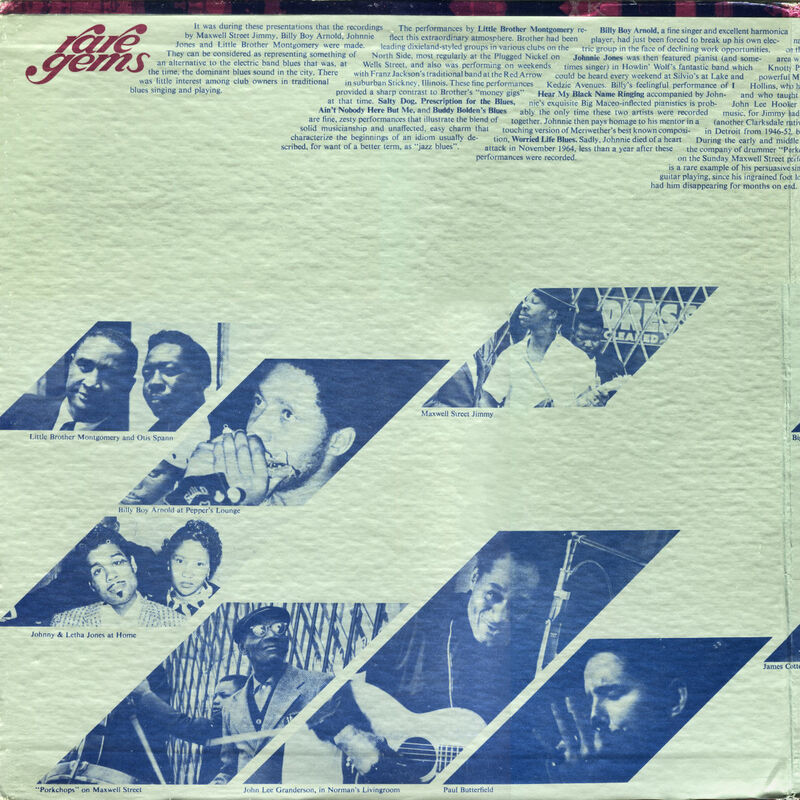 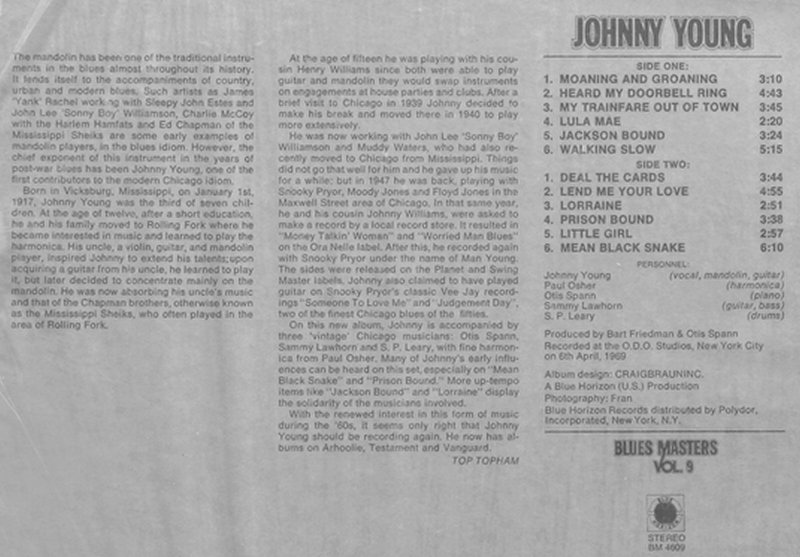 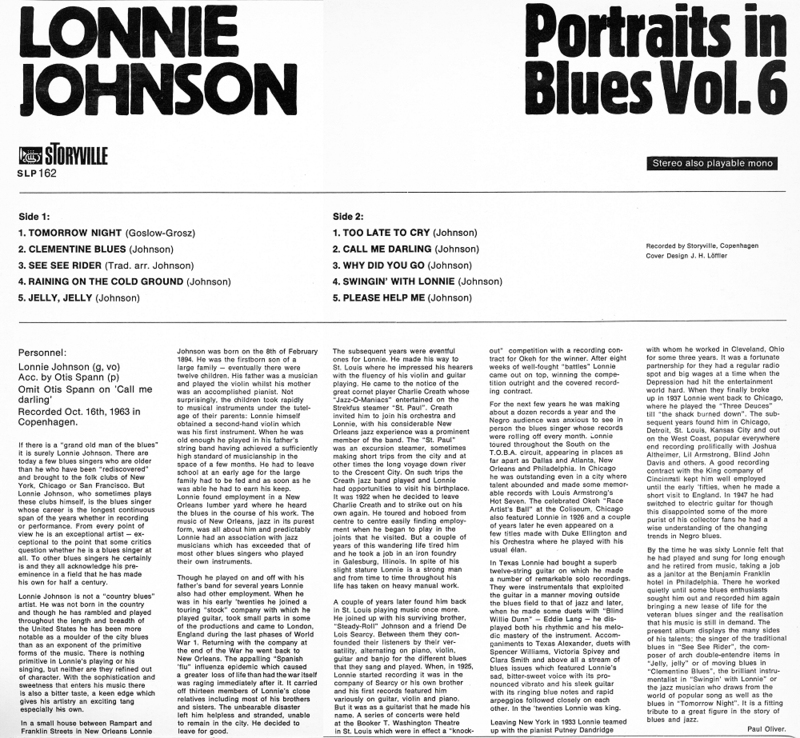 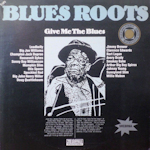 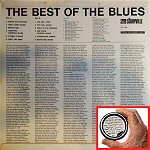 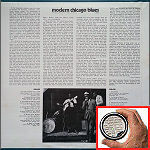 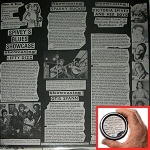 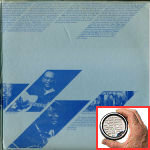 3"
= Storyville ST 21004 (Fr) "Portraits in Blues"
= Storyville/Teldec 6.23708 (1979) "Blues Roots Vol. 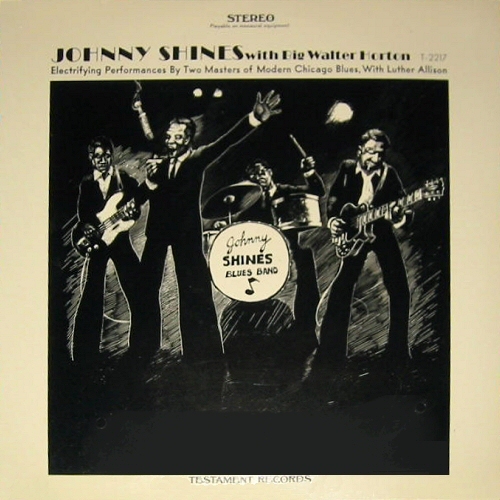 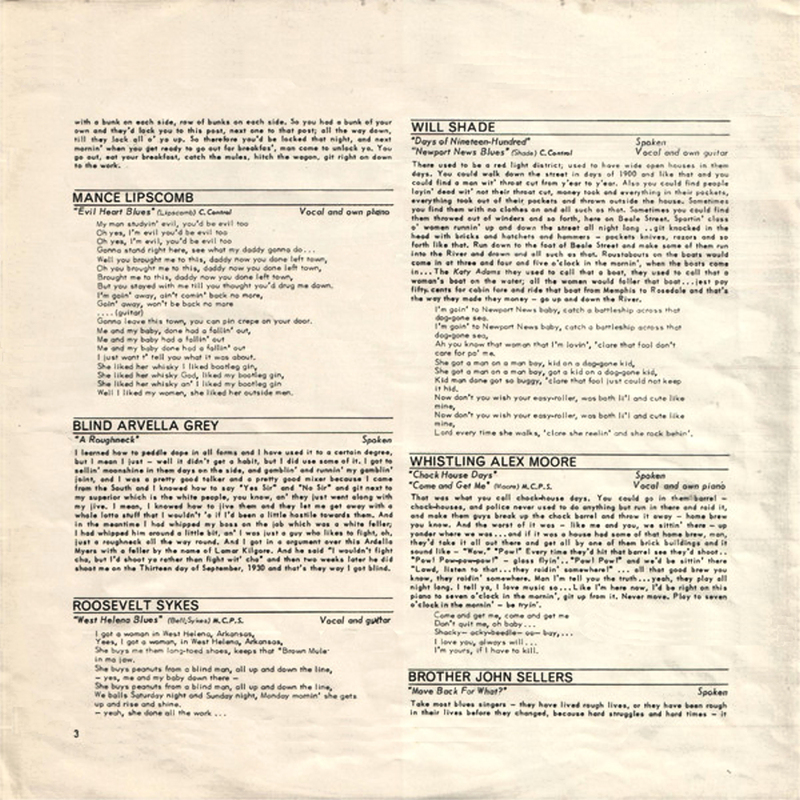 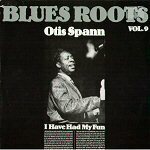 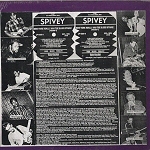 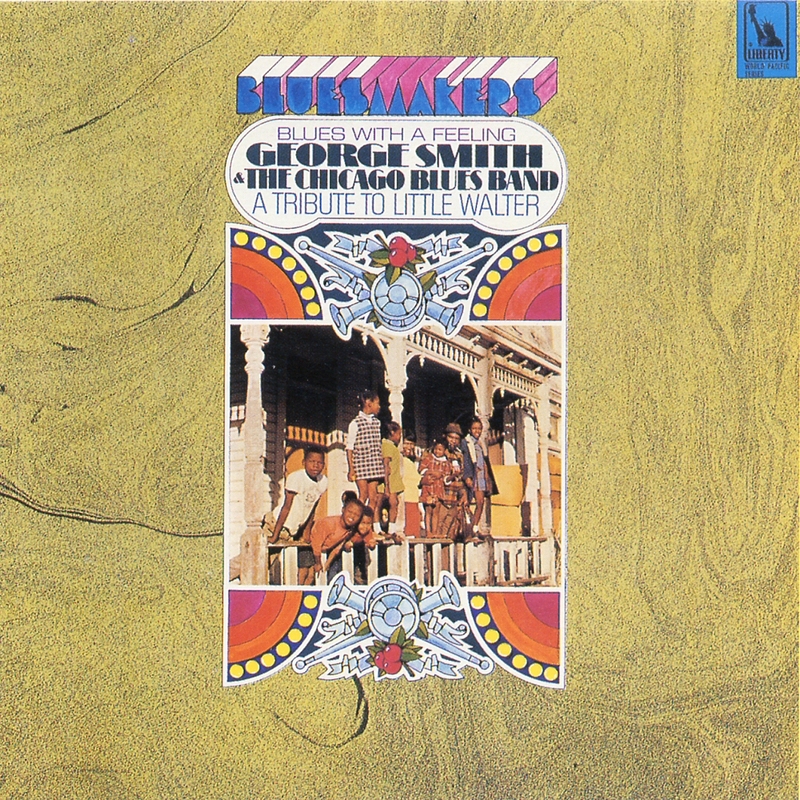 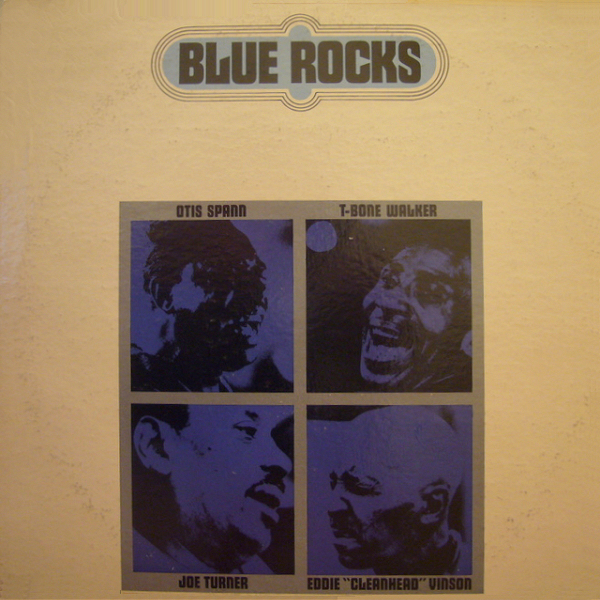 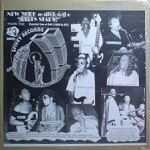 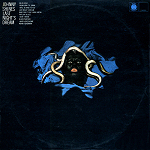 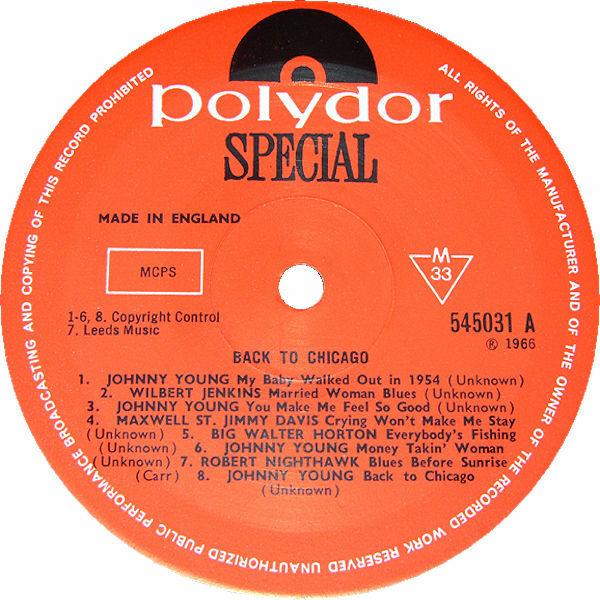 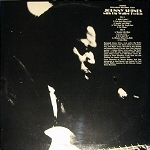 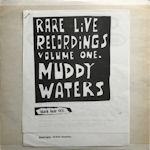 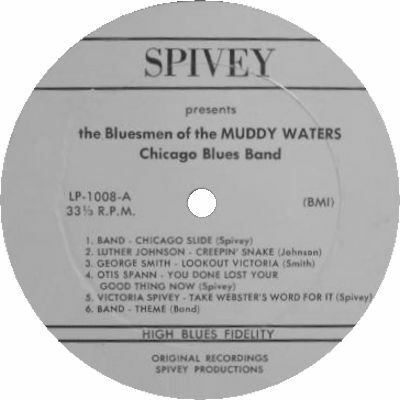 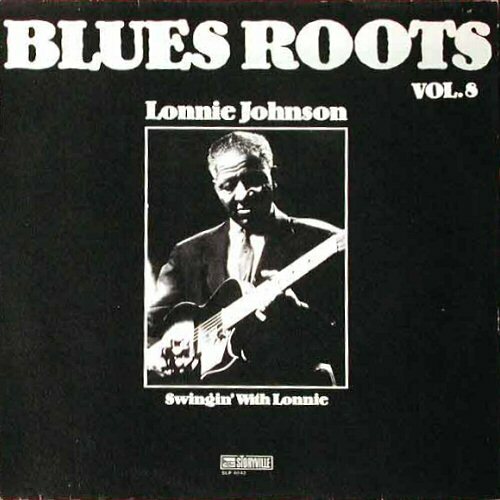 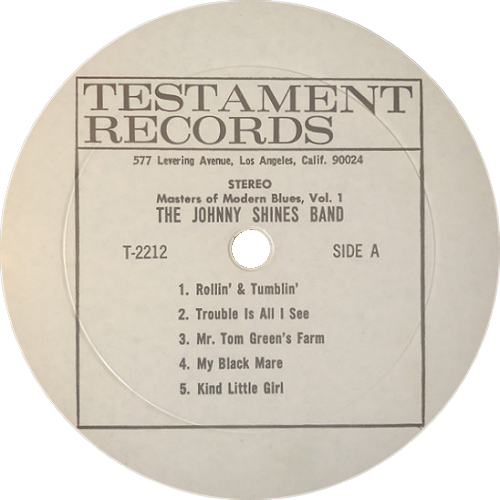 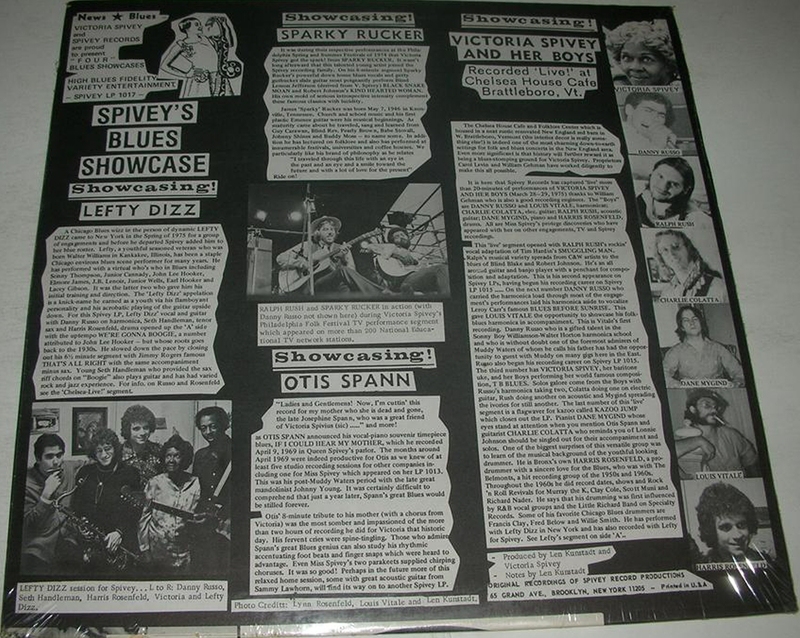 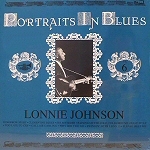 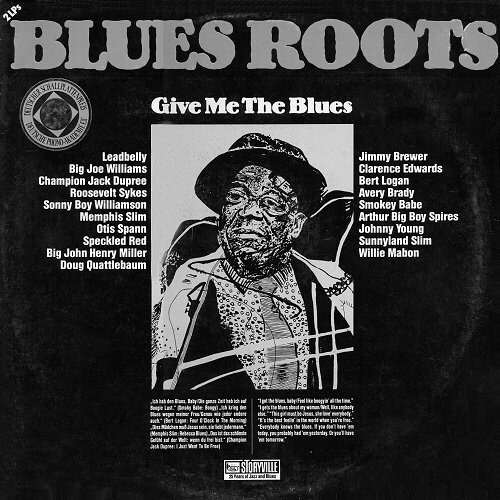 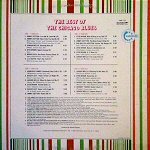 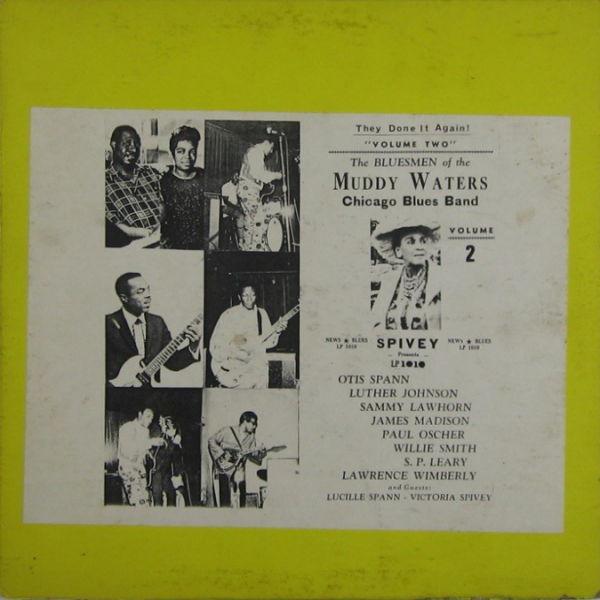 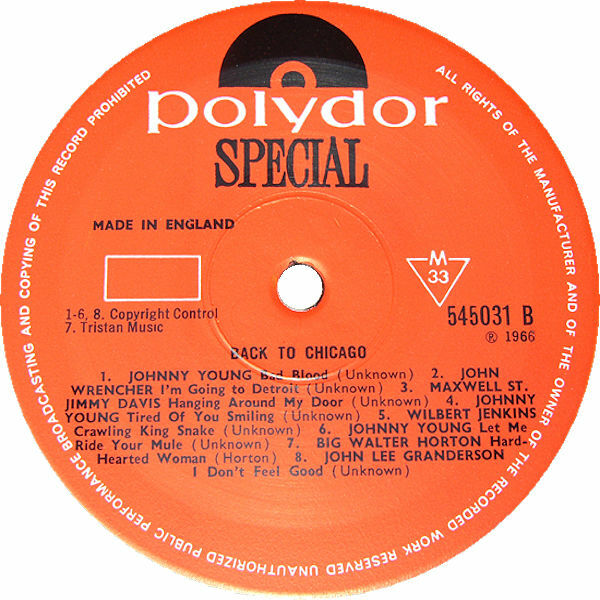 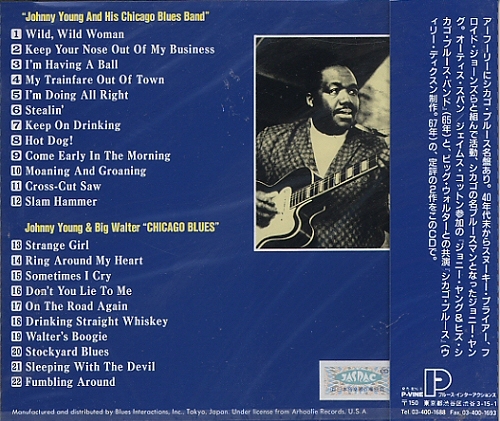 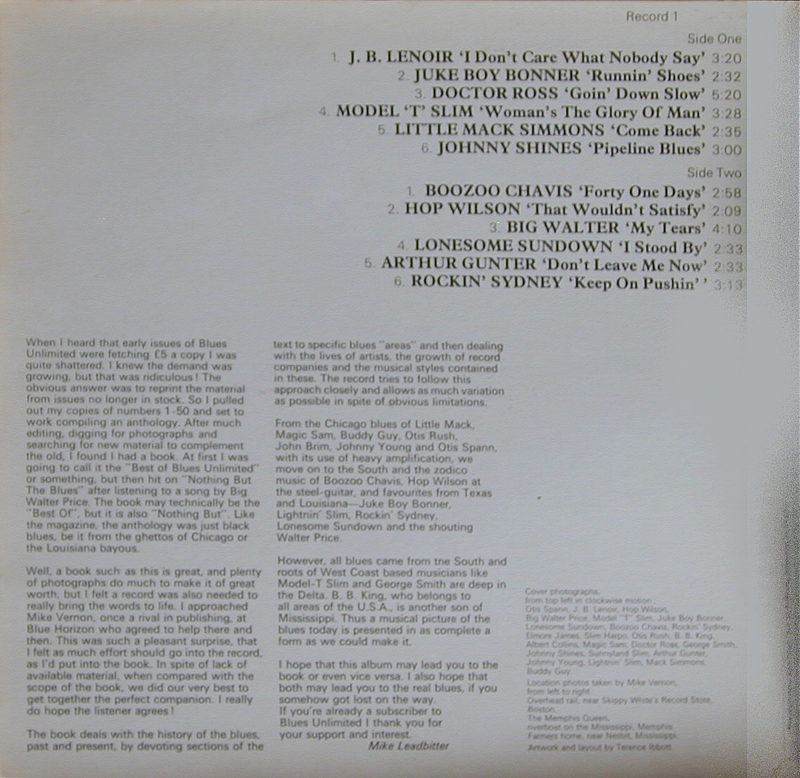 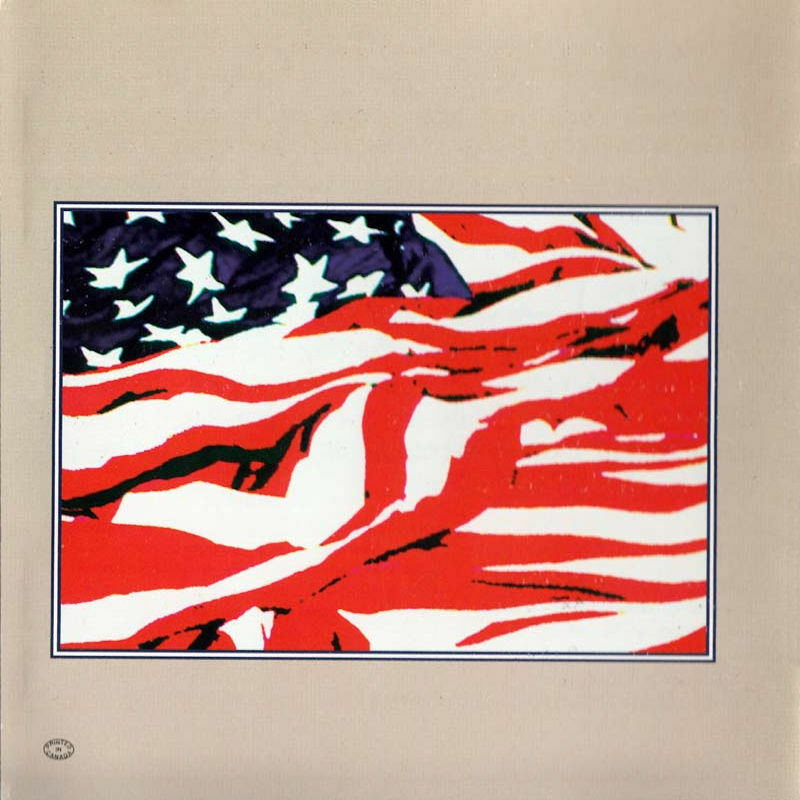 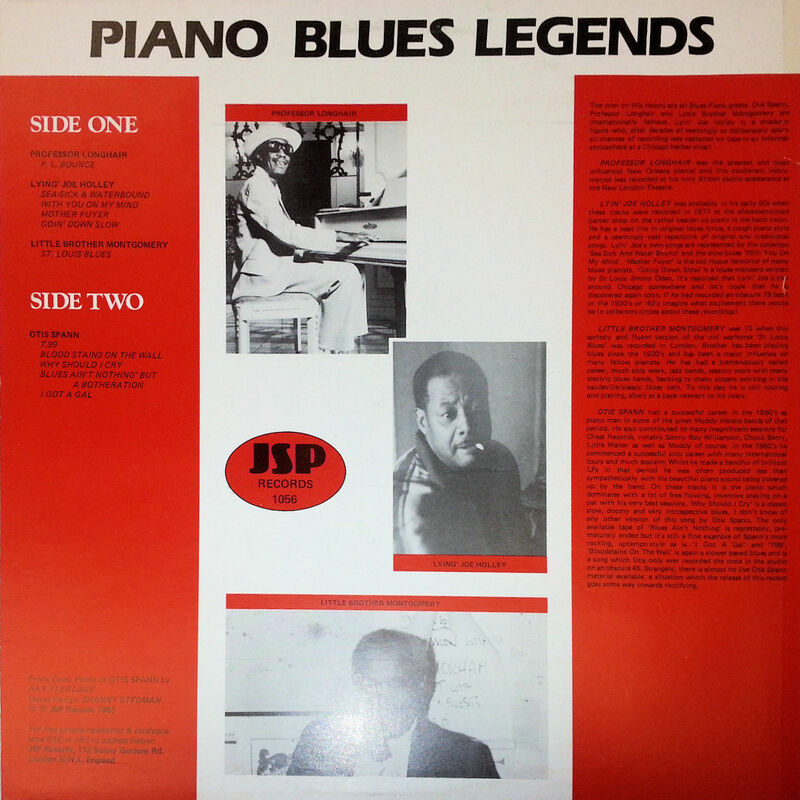 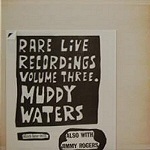 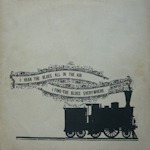 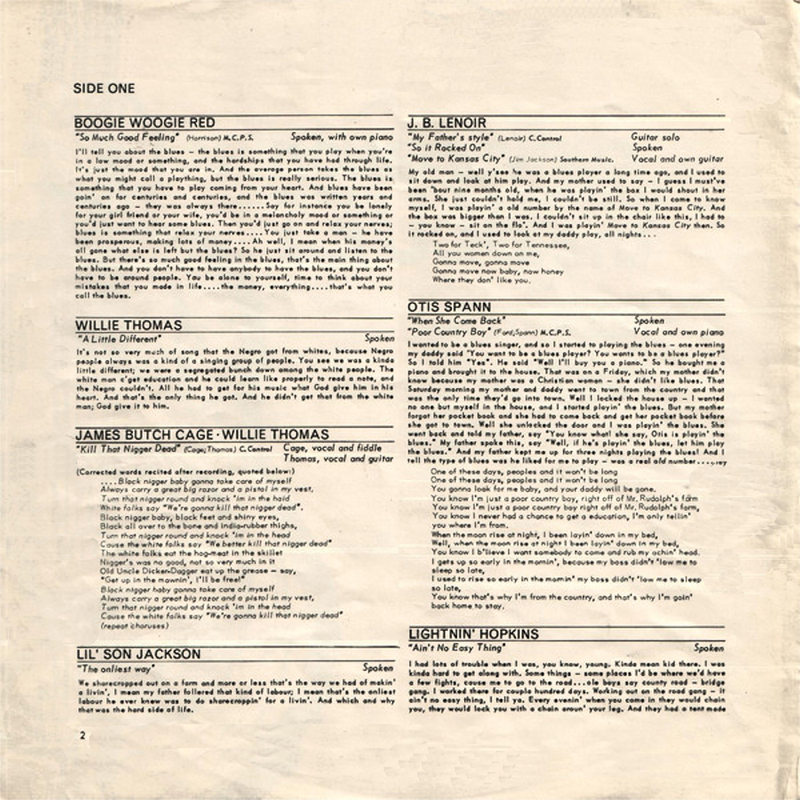 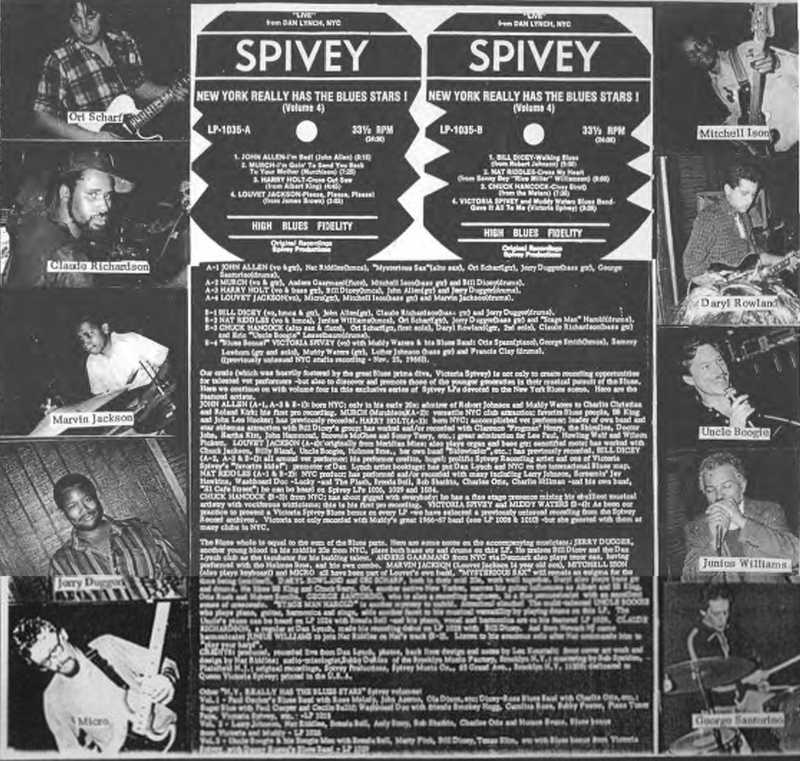 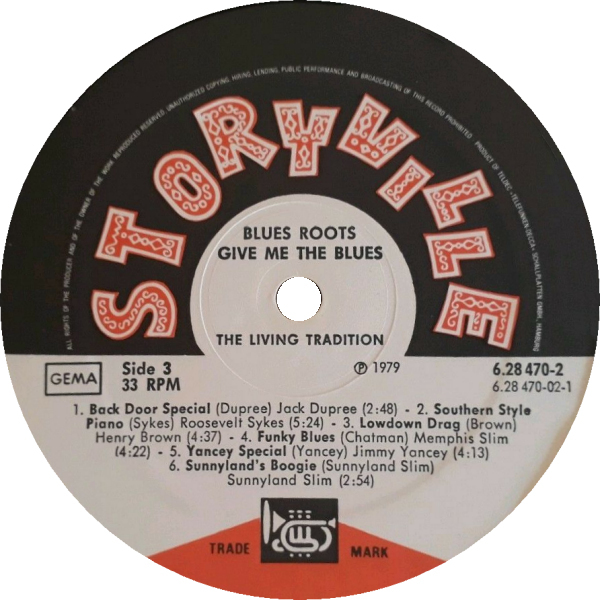 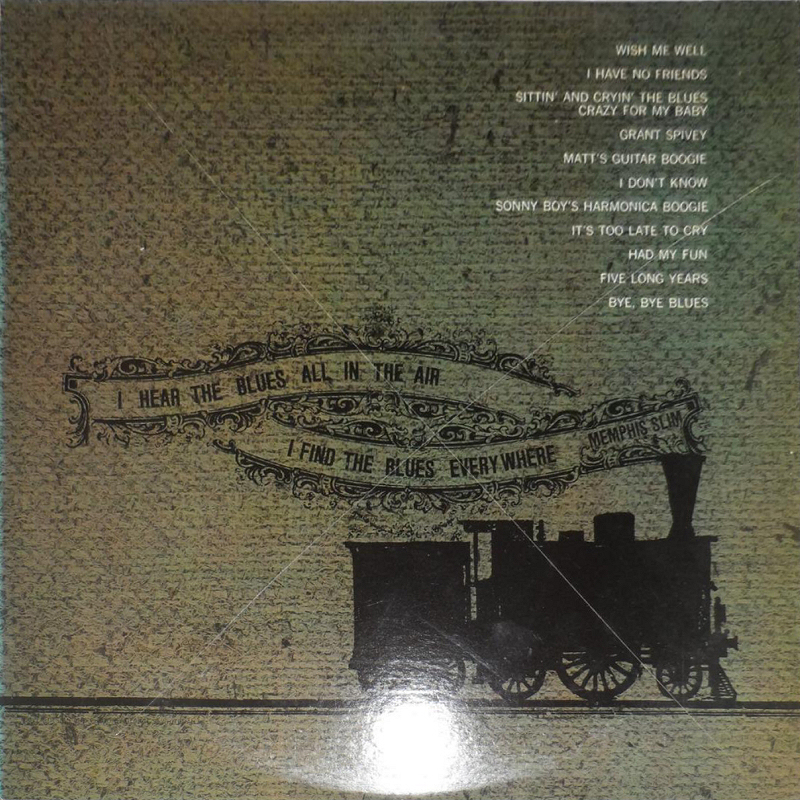 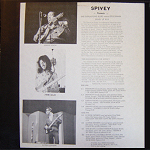 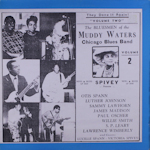 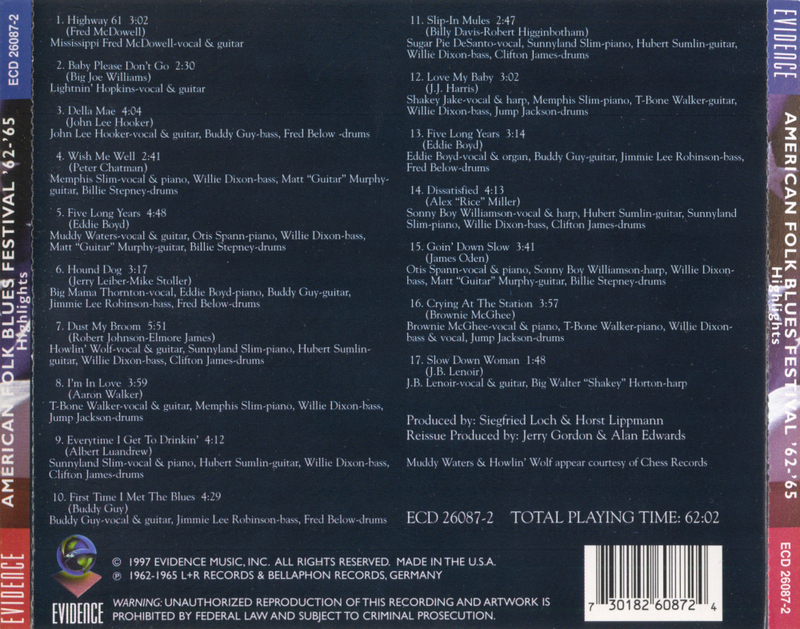 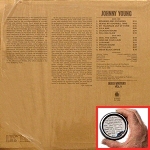 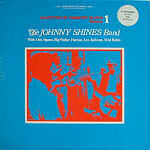 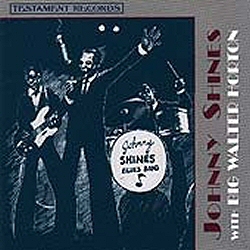 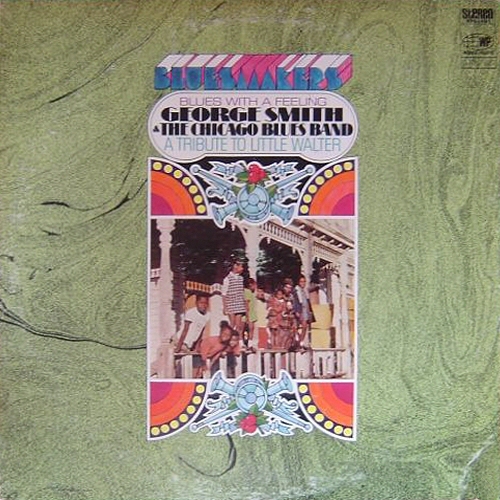 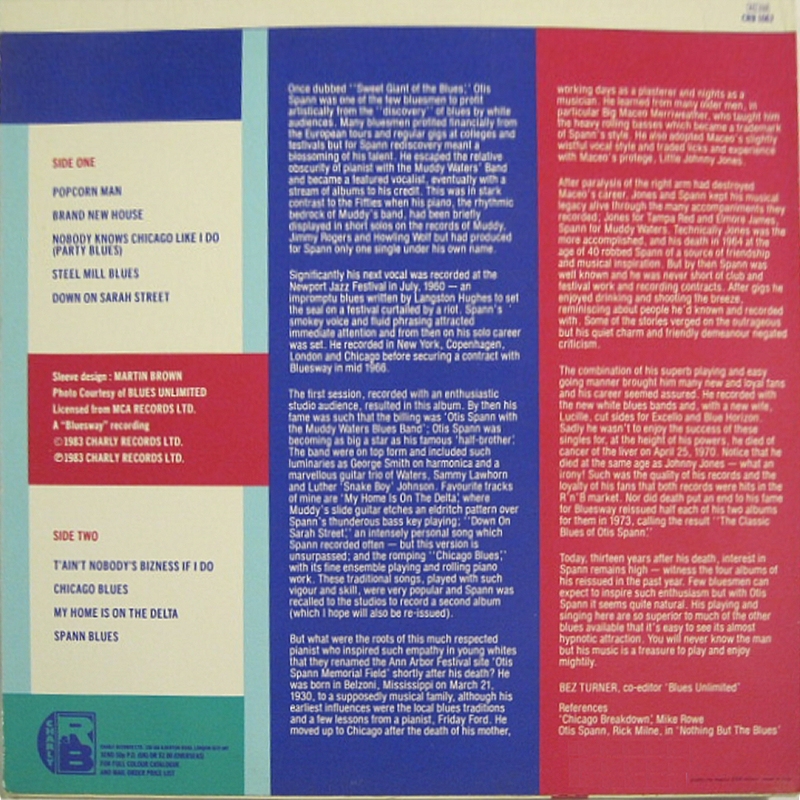 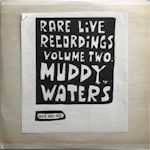 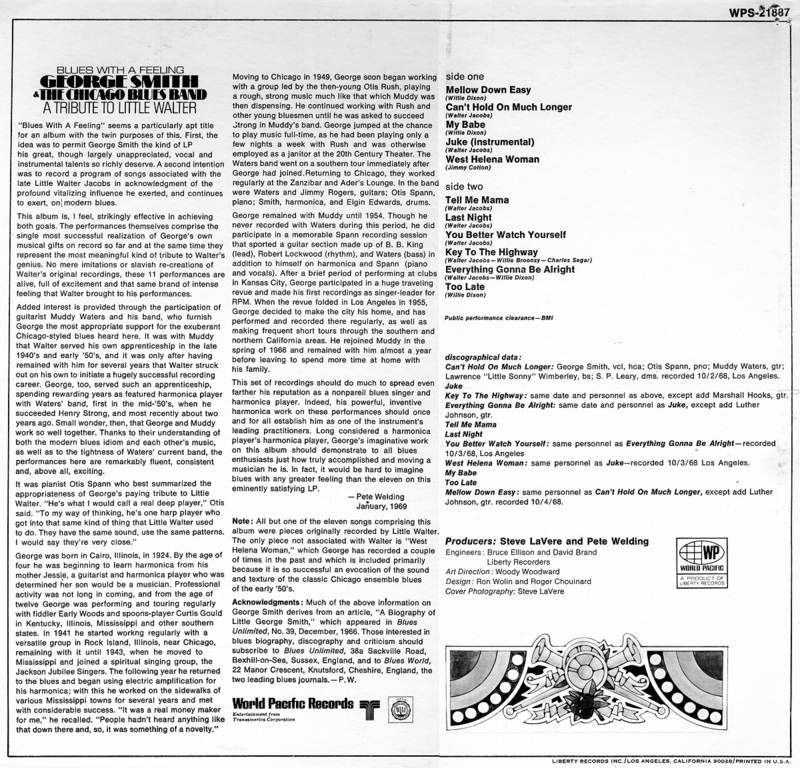 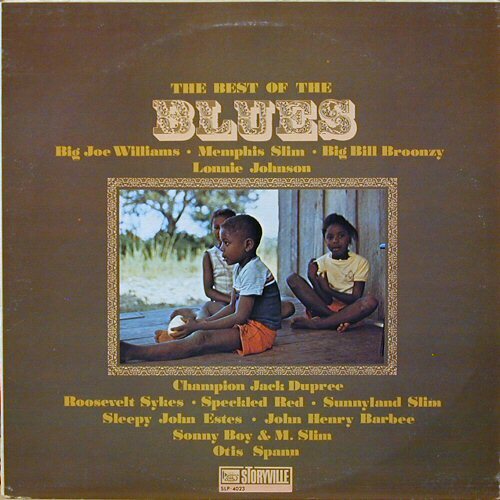 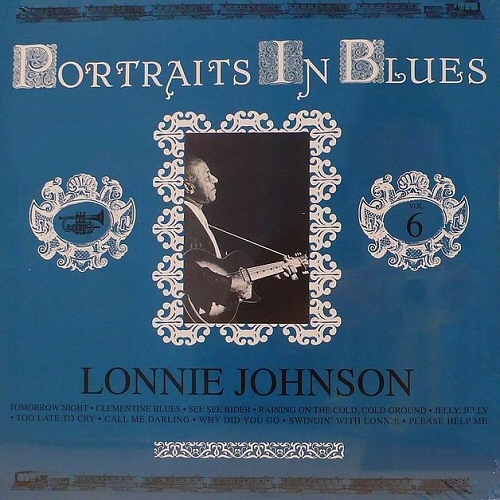 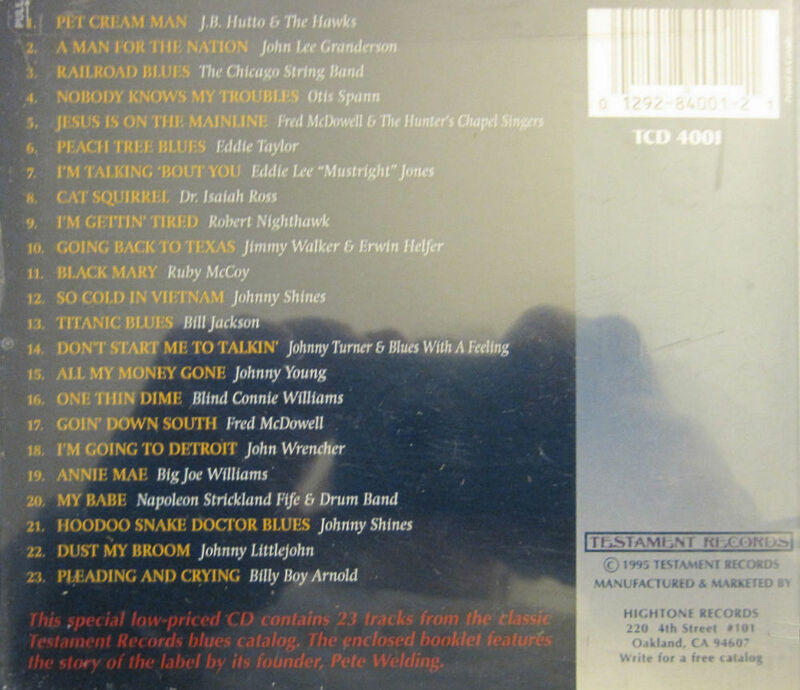 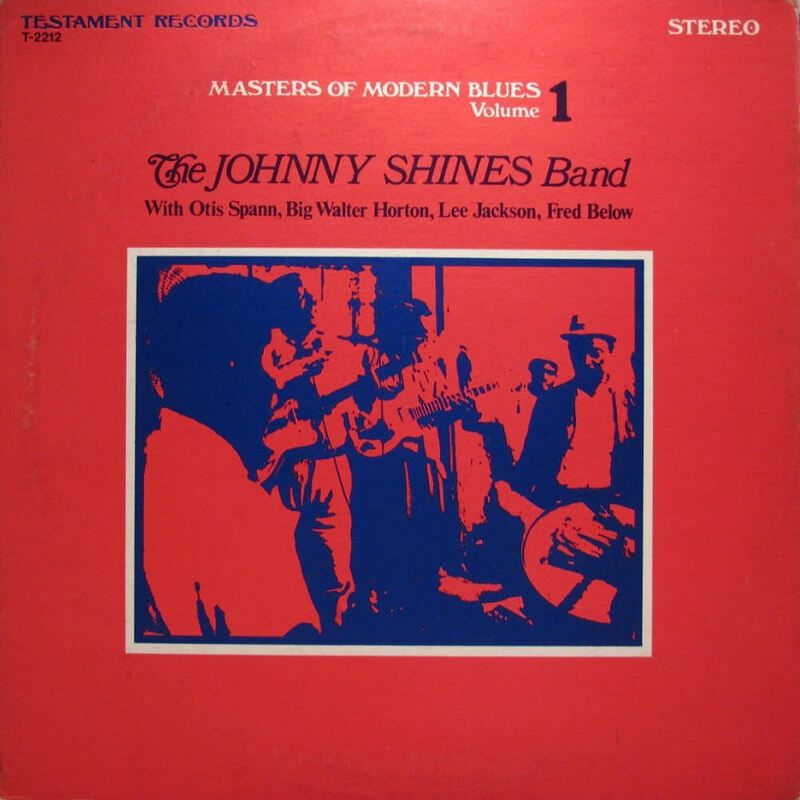 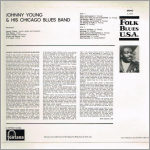 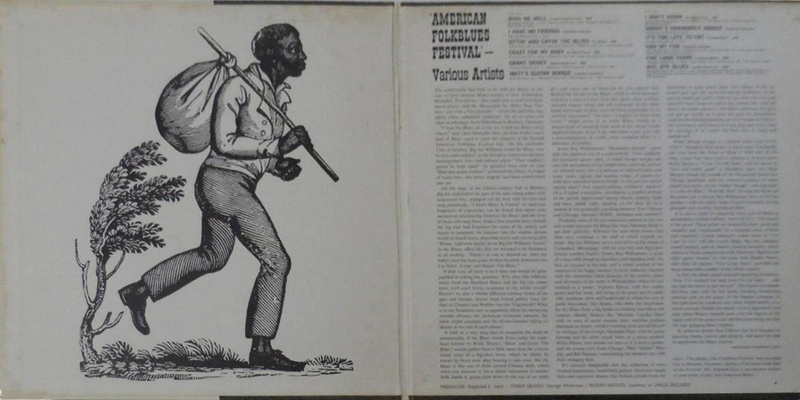 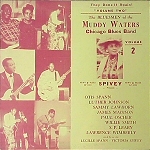 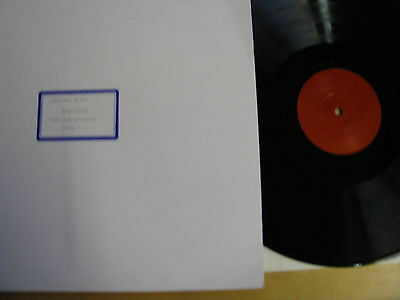 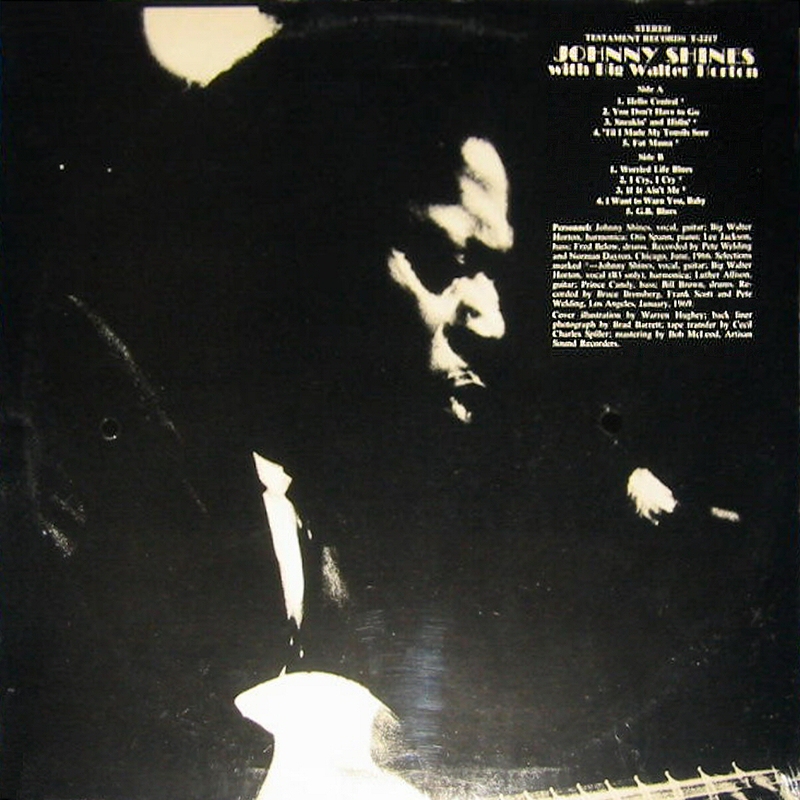 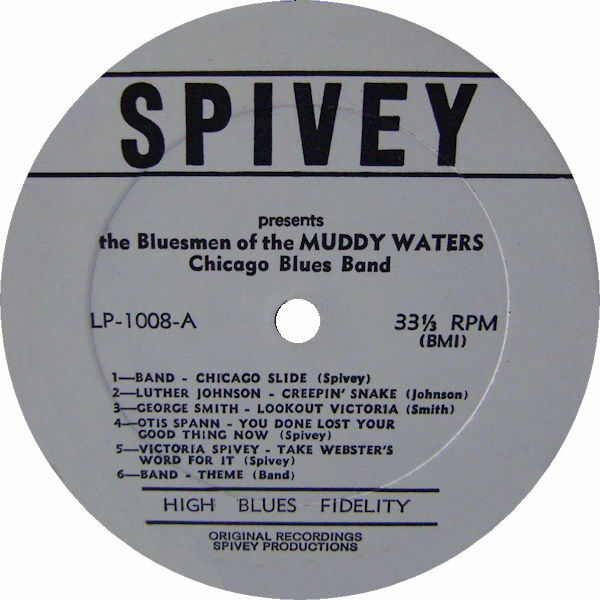 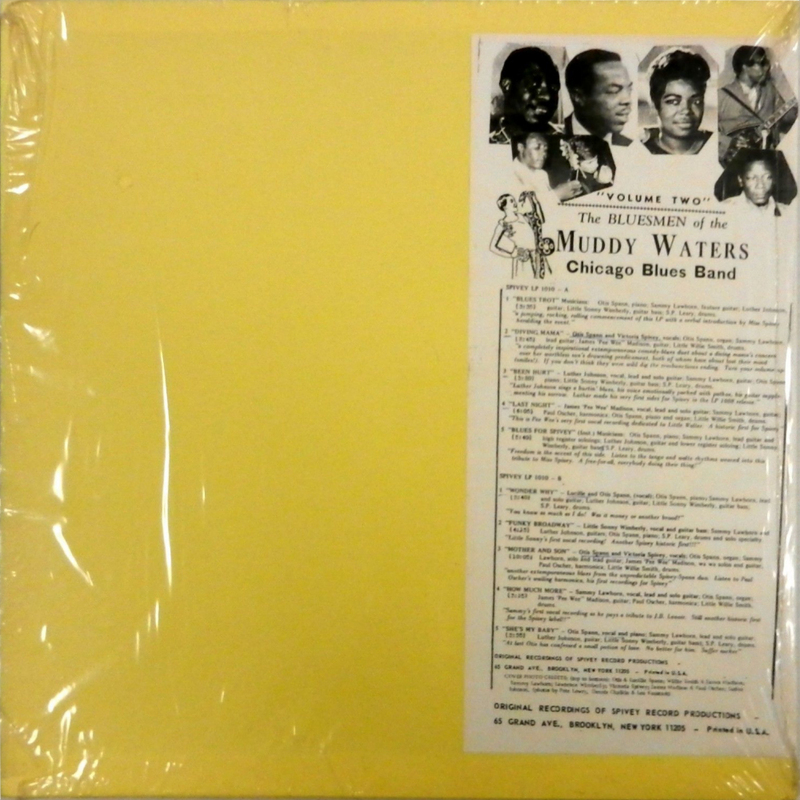 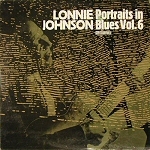 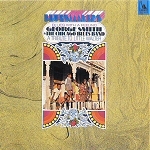 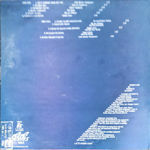 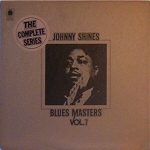 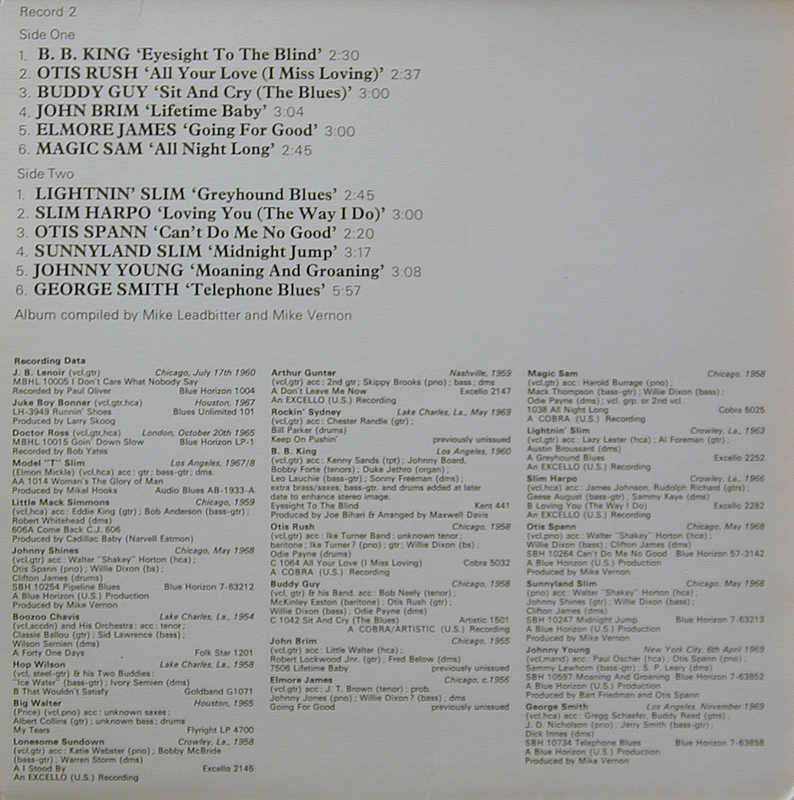 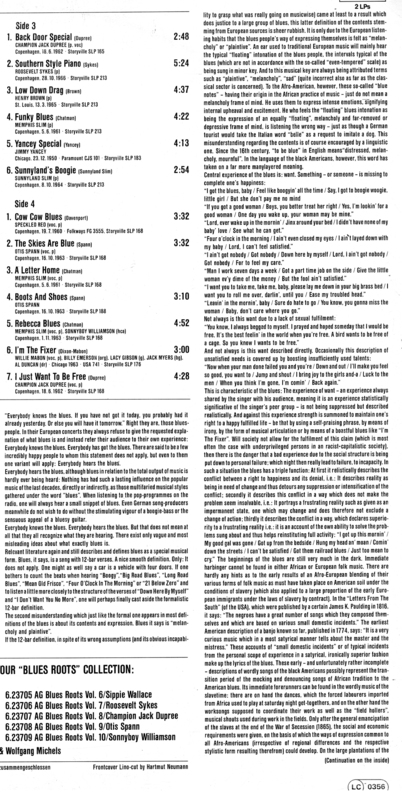 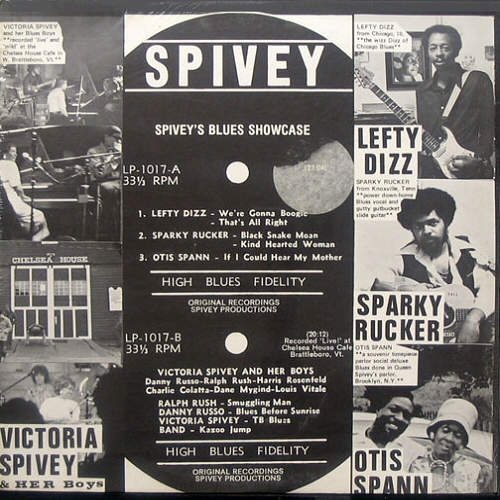 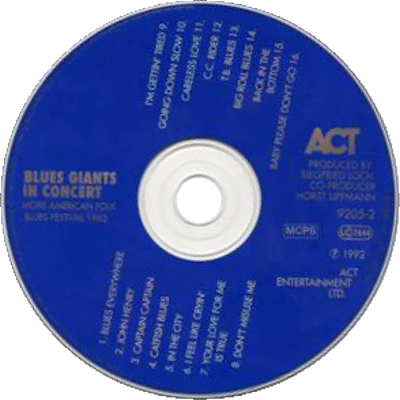 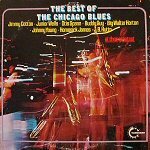 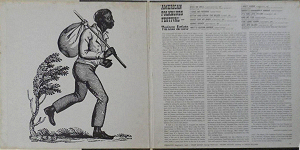 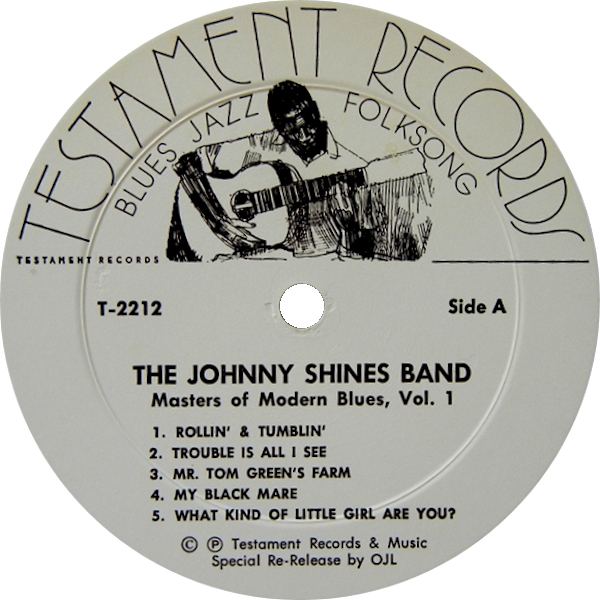 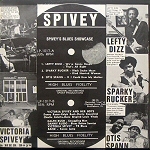 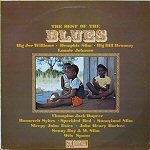 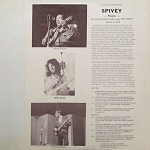 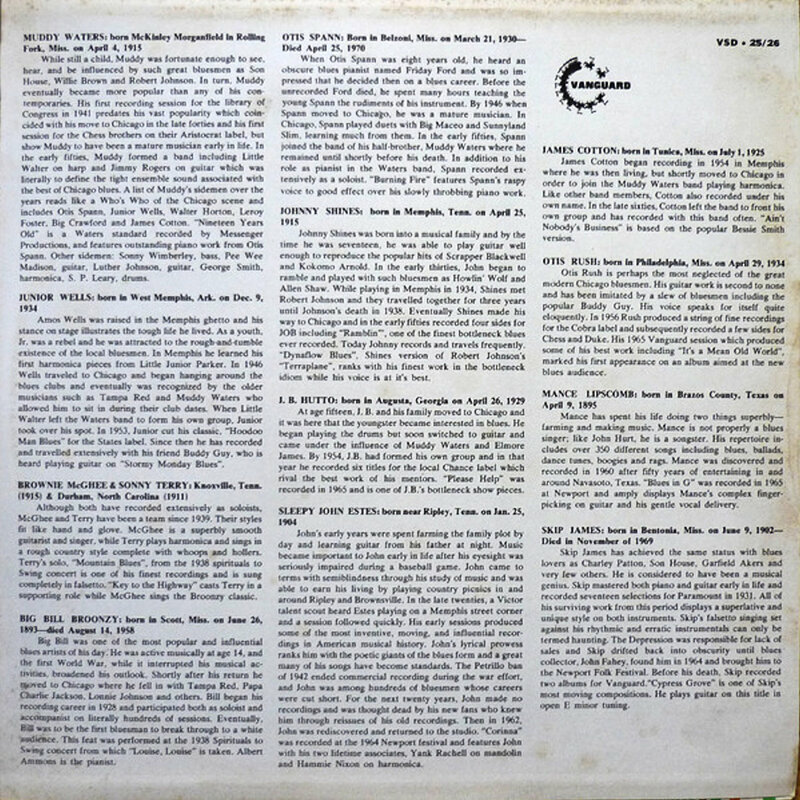 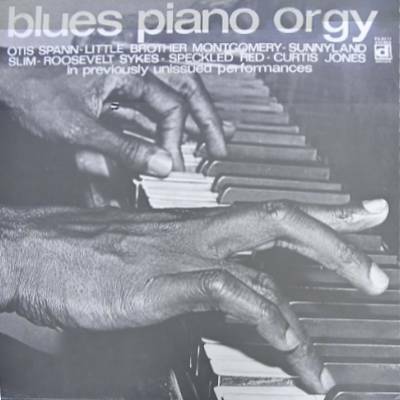 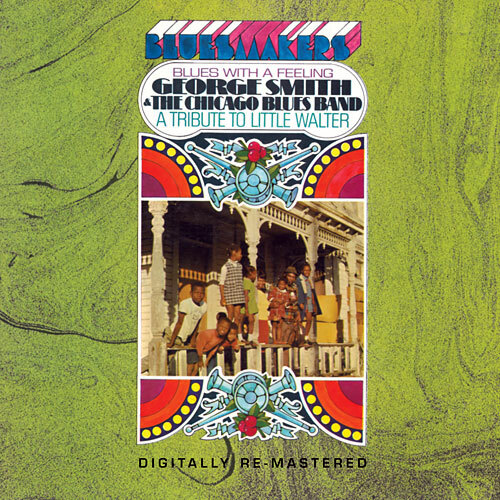 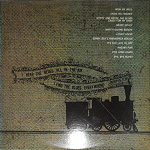 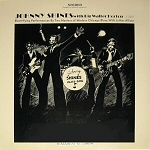 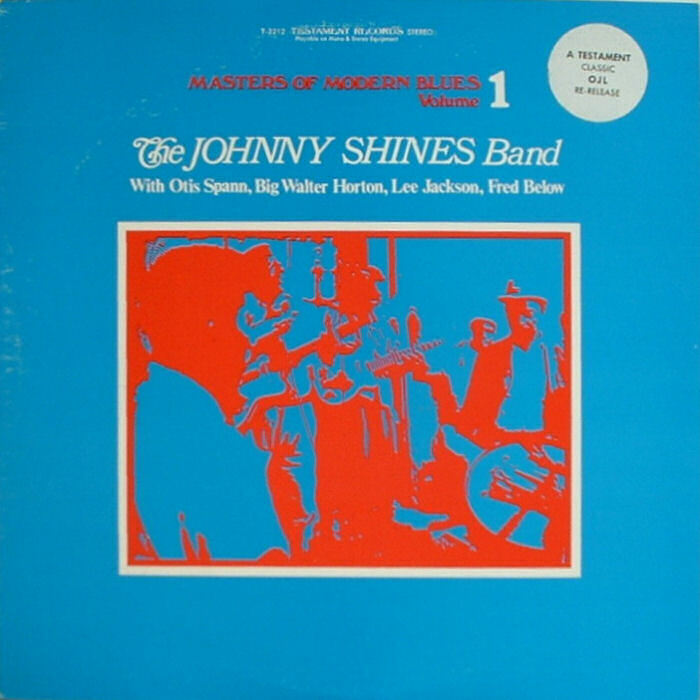 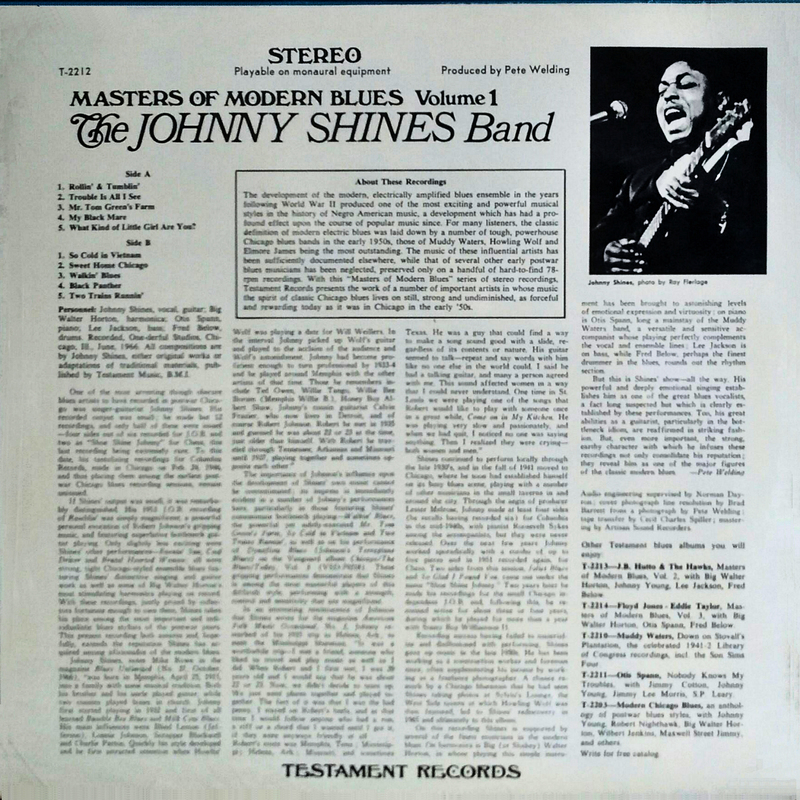 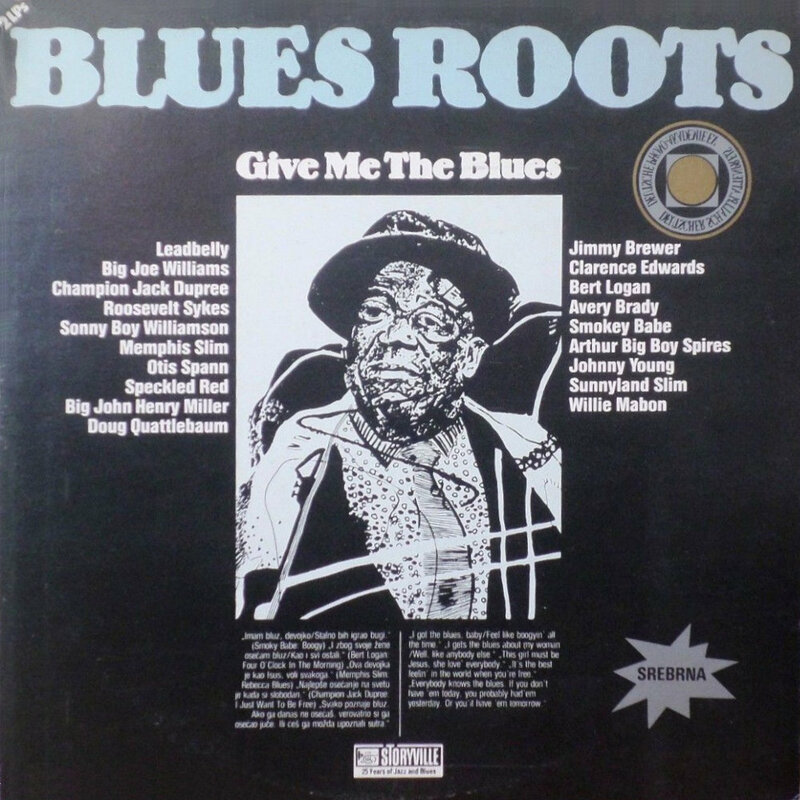 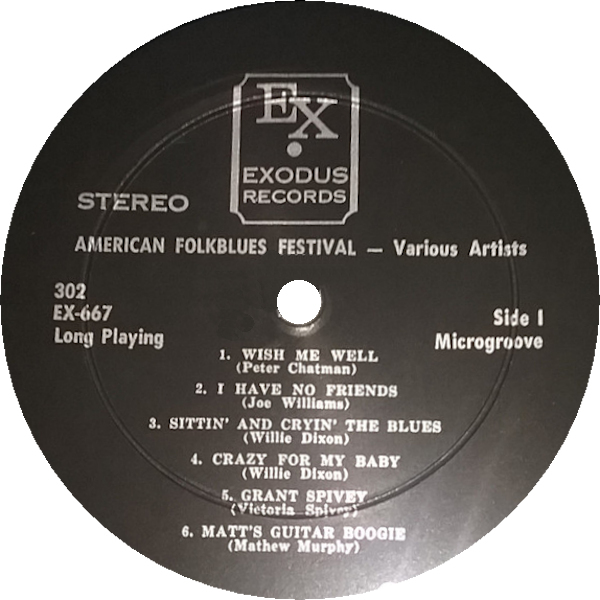 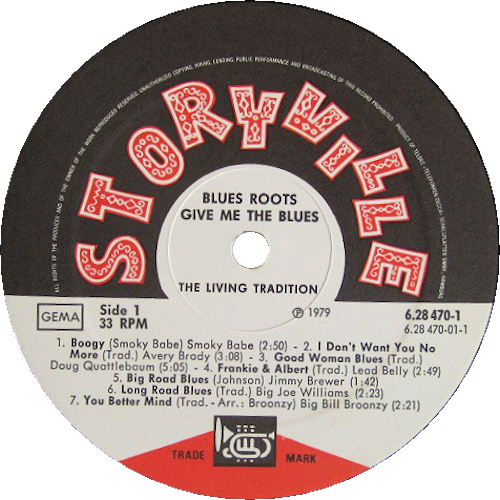 9" "I Have Had My Fun"
= Storyville SLP 4041 (1981) "Blues Roots Vol. 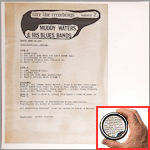 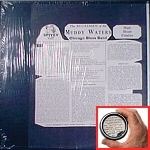 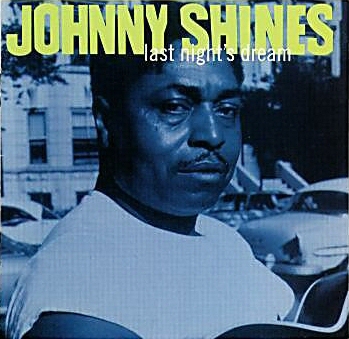 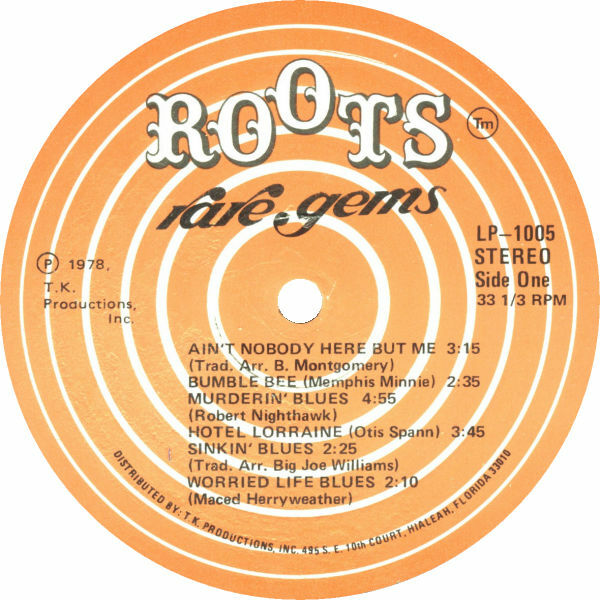 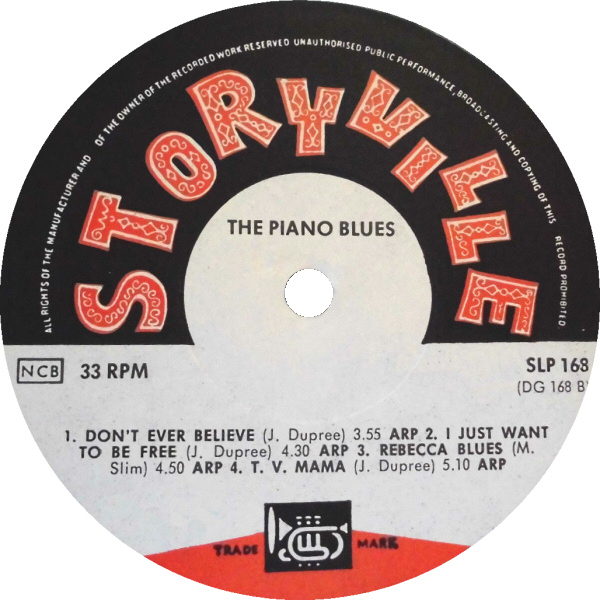 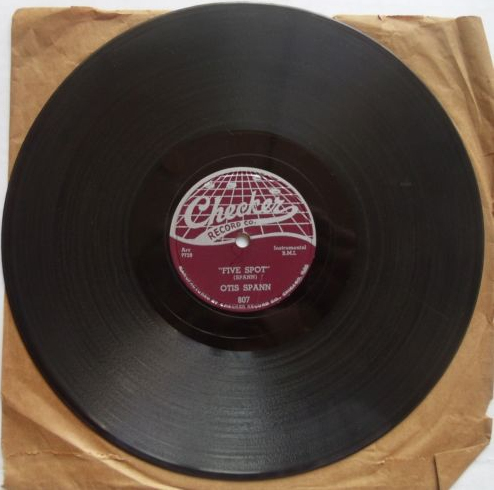 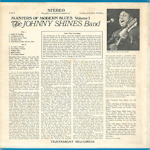 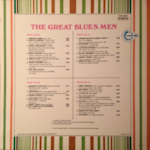 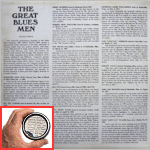 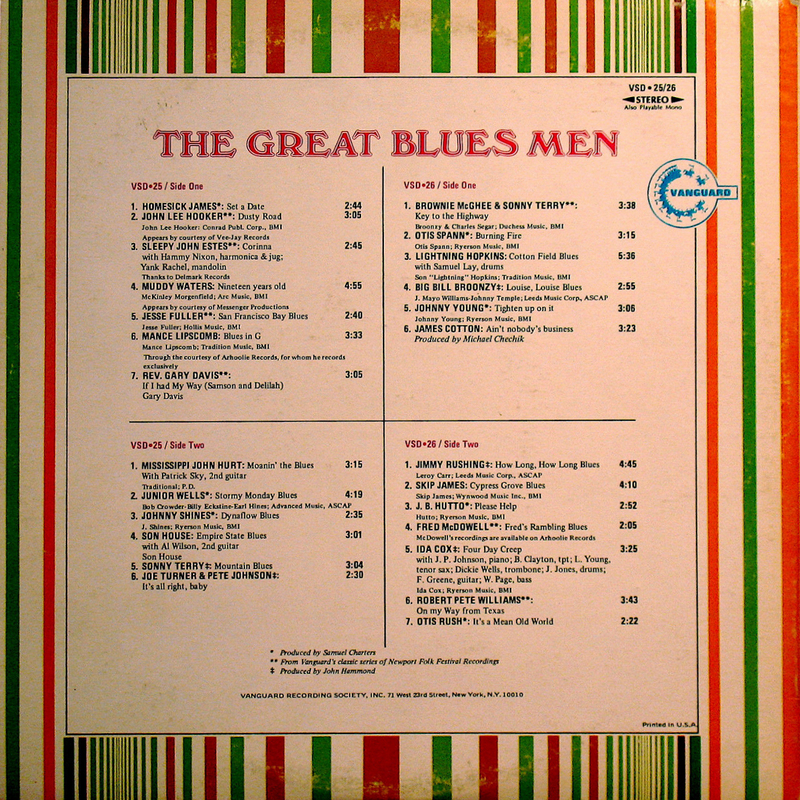 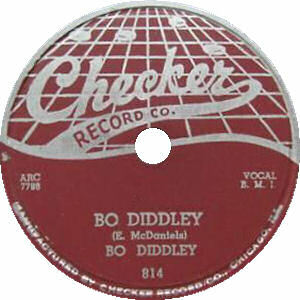 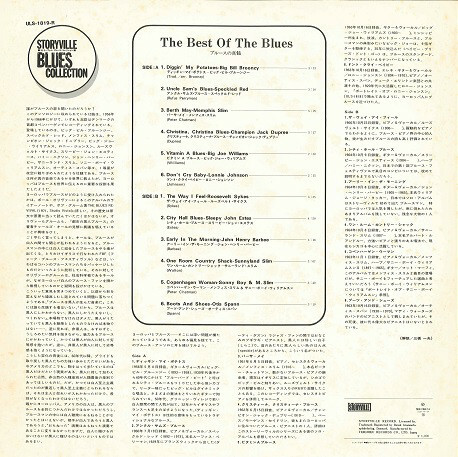 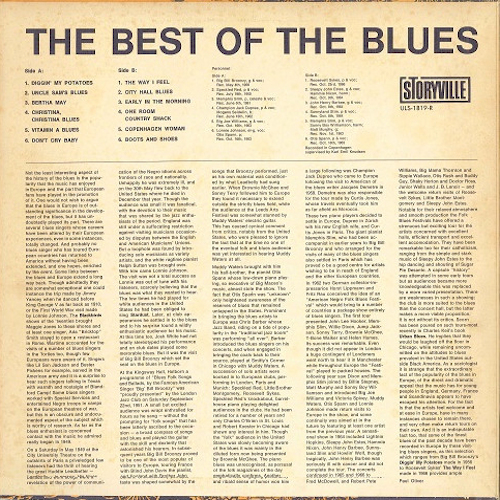 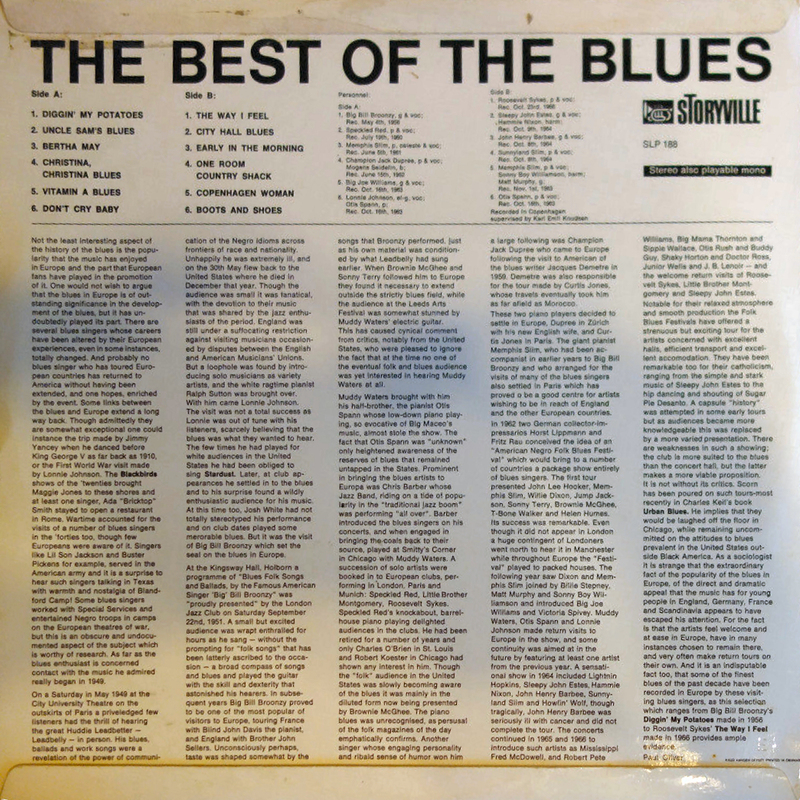 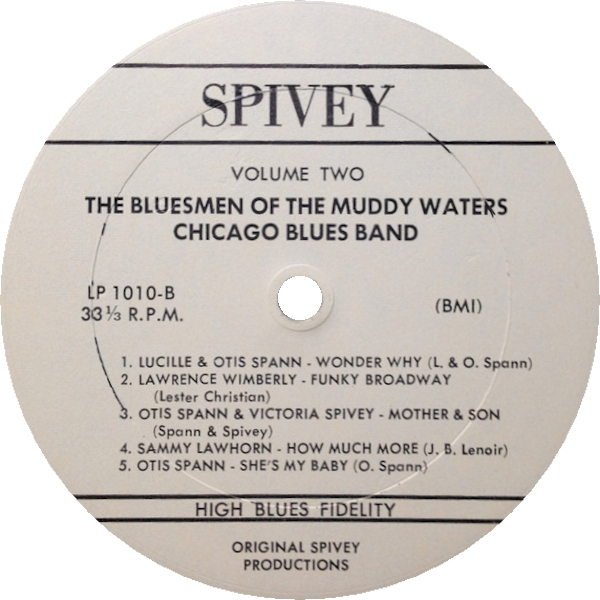 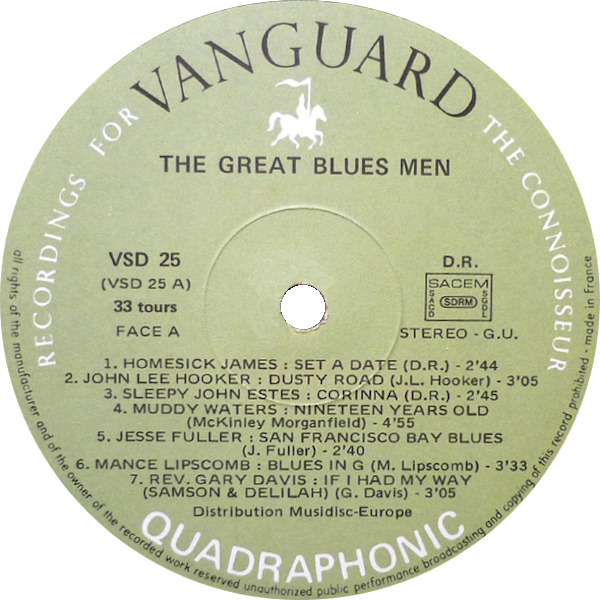 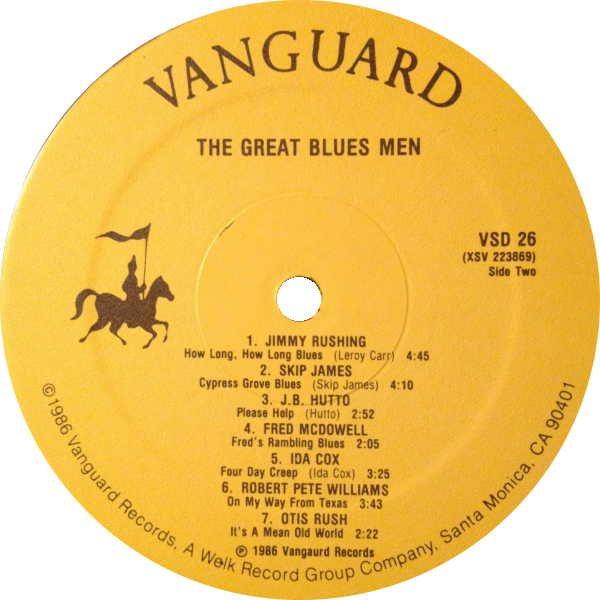 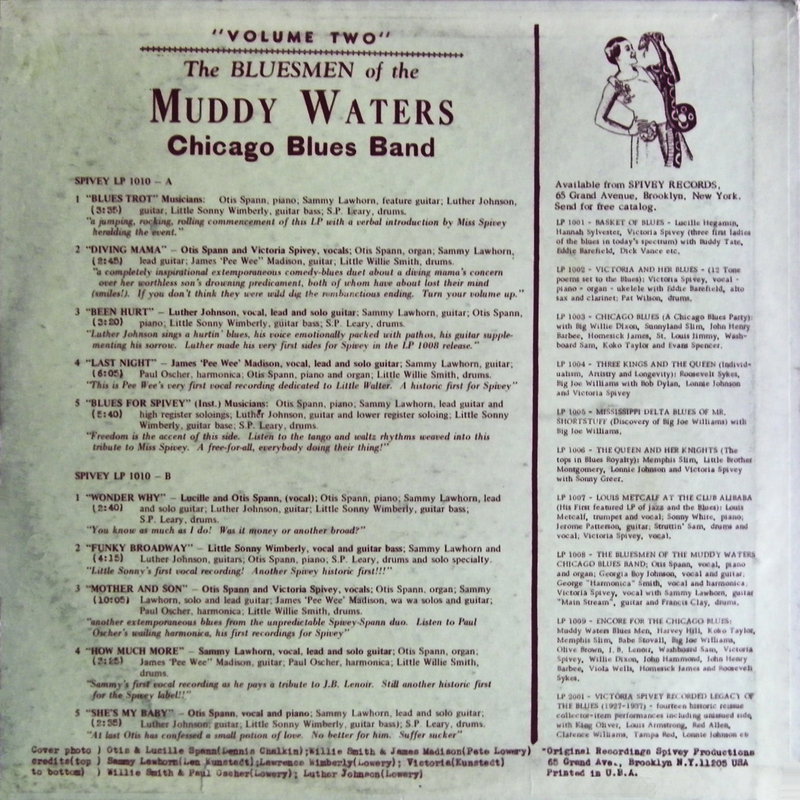 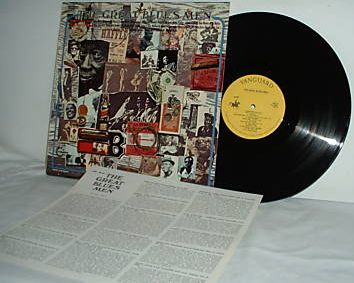 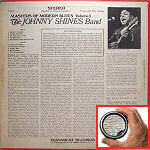 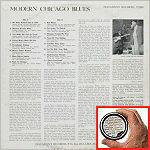 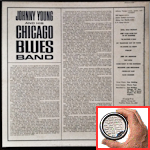 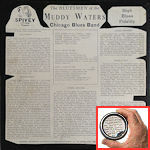 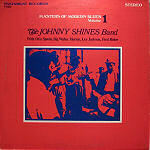 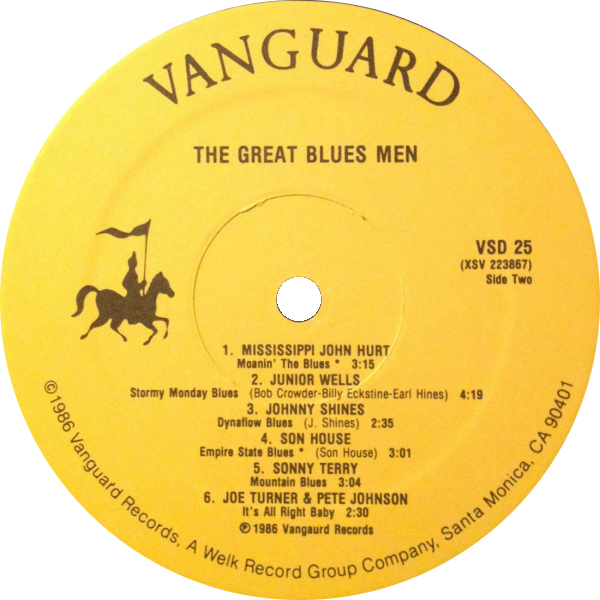 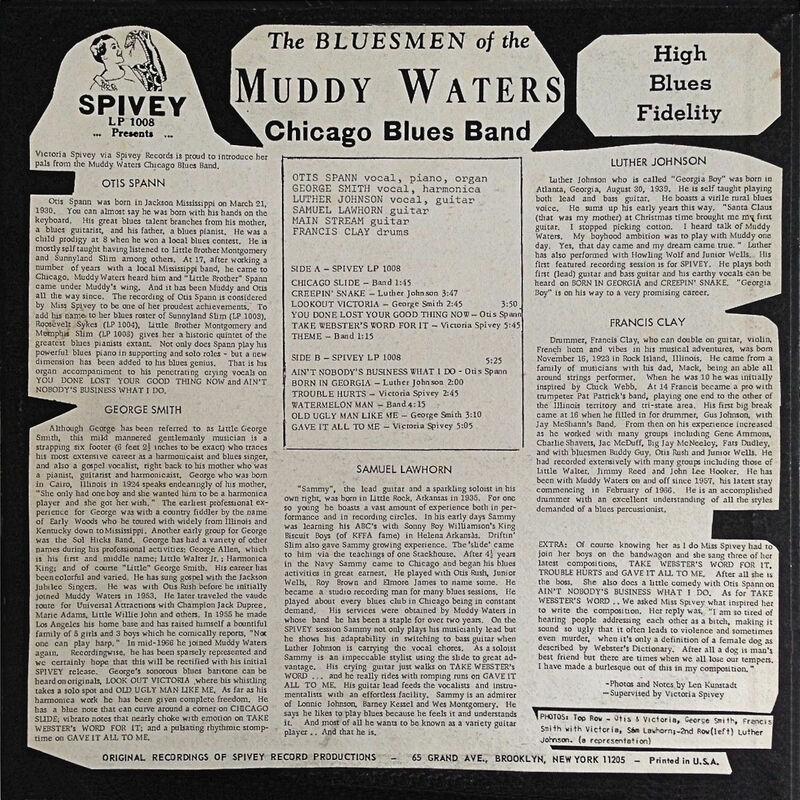 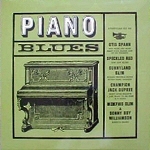 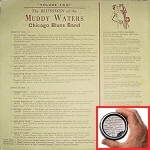 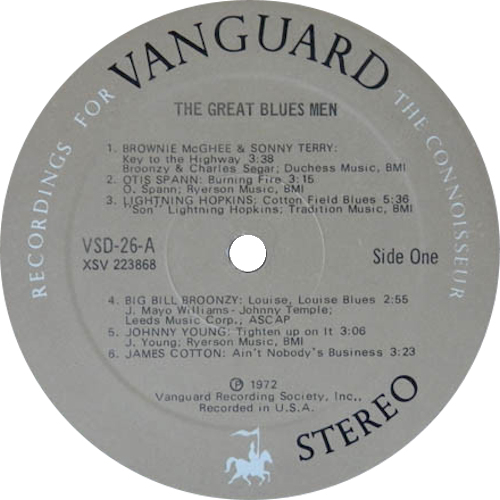 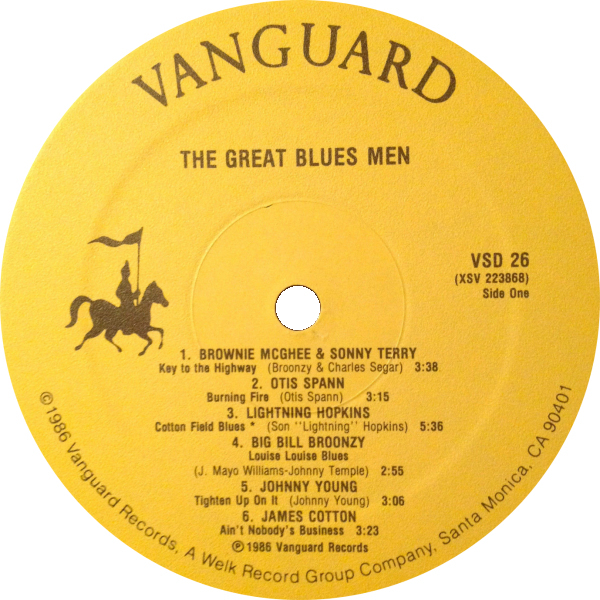 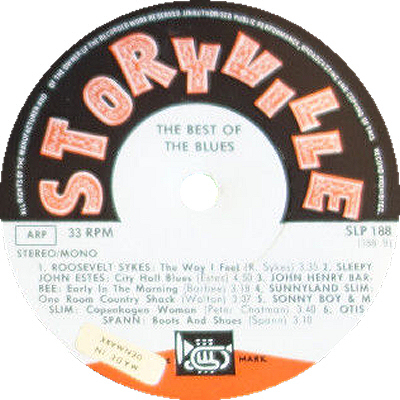 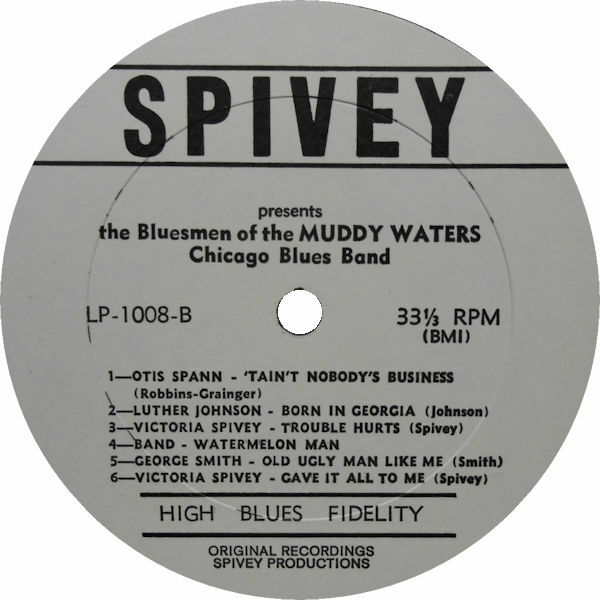 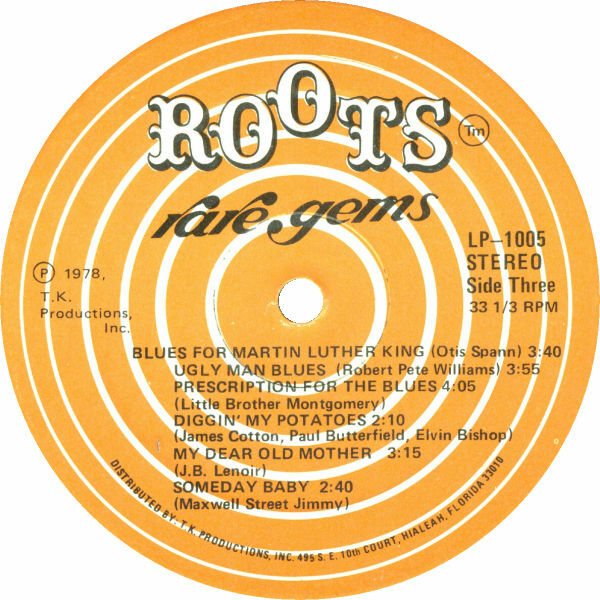 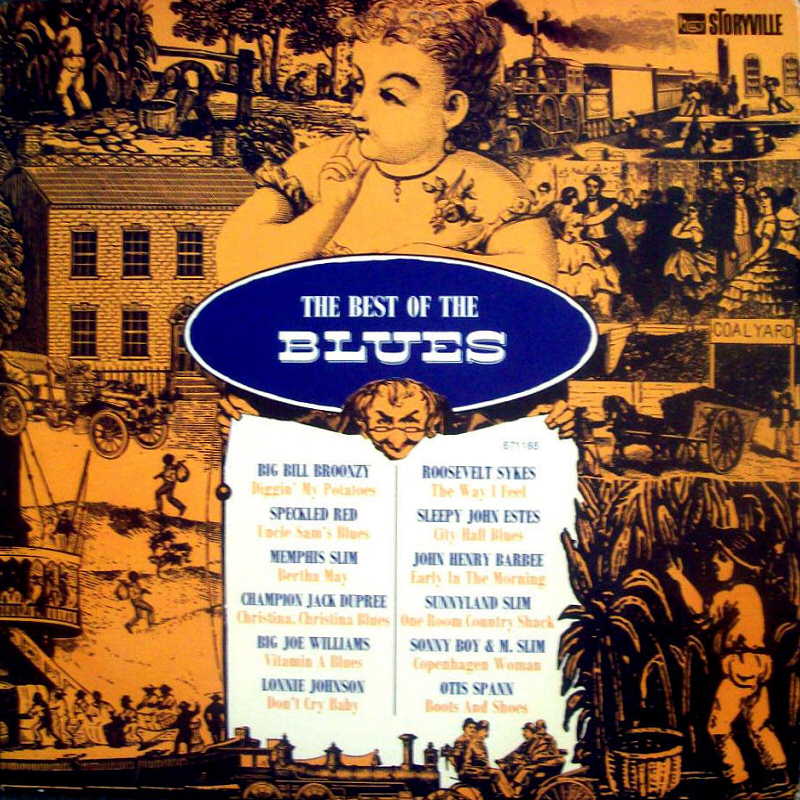 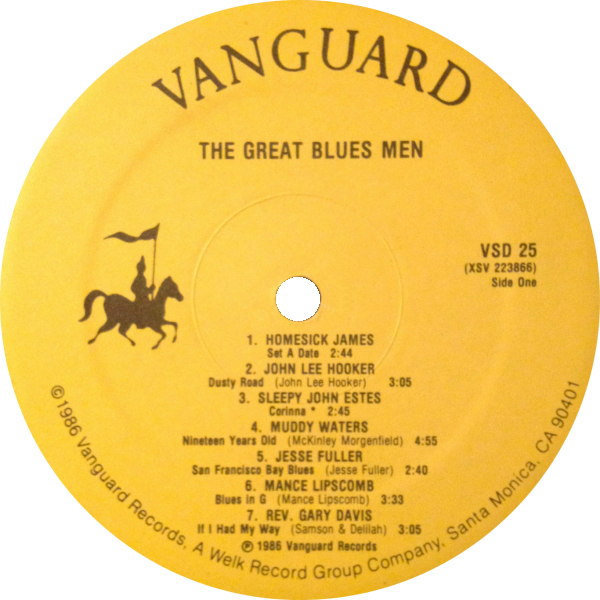 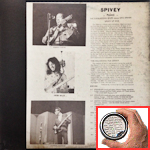 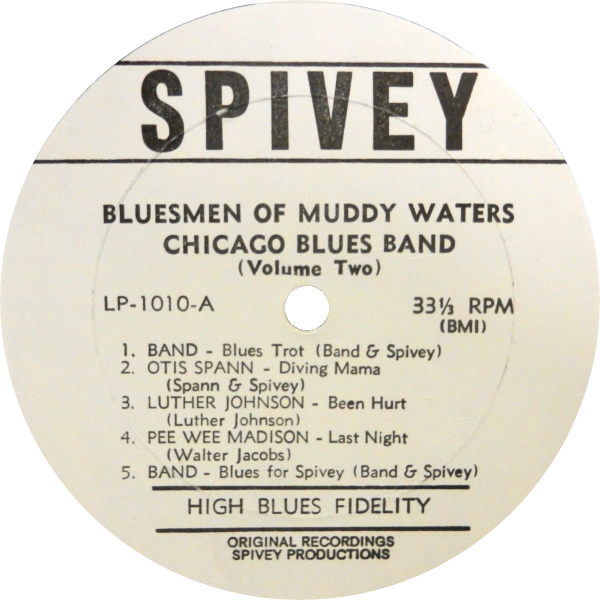 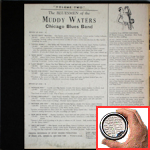 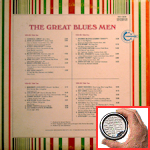 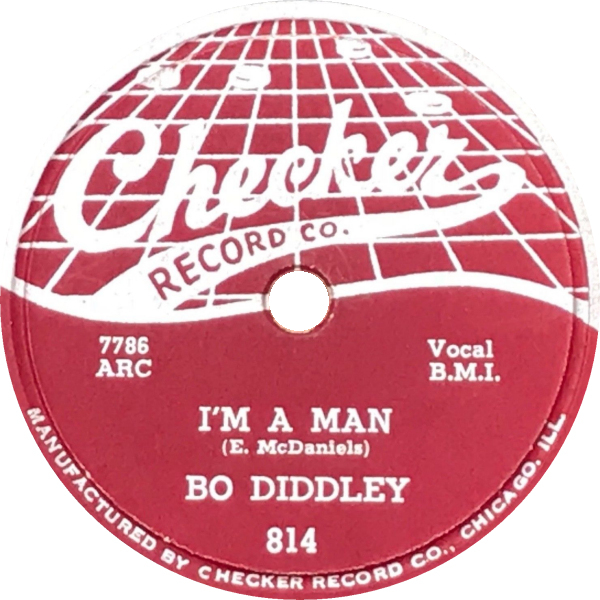 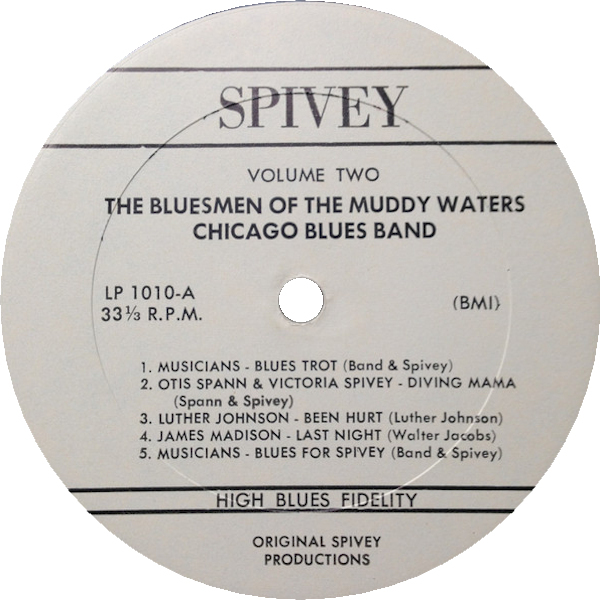 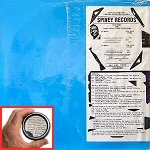 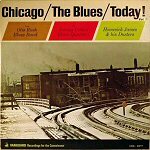 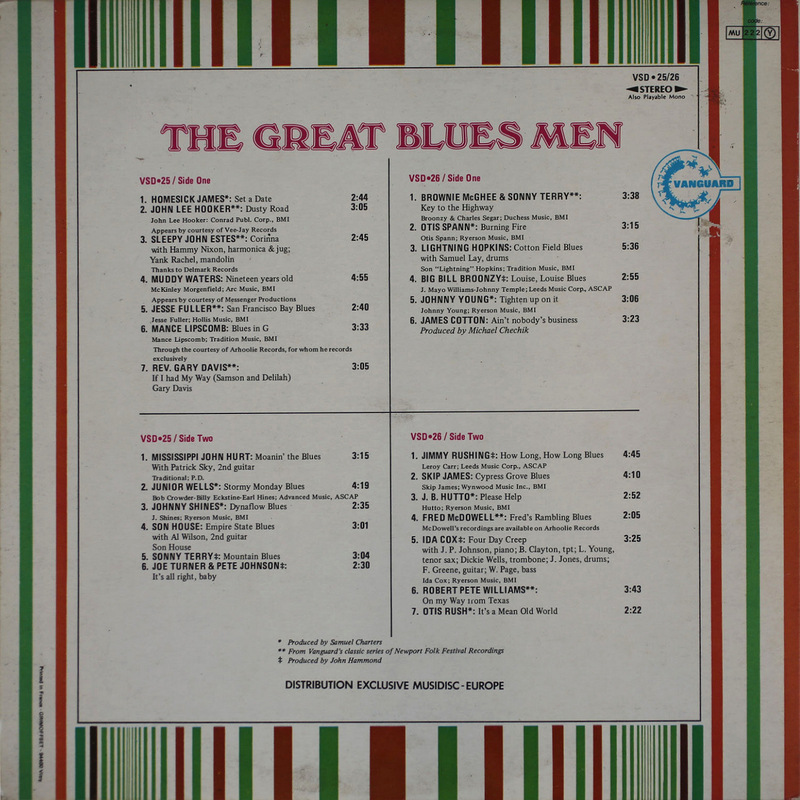 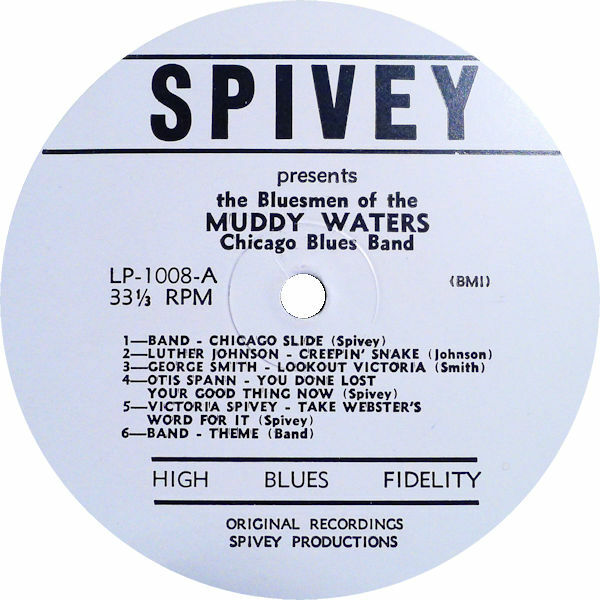 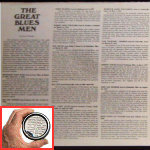 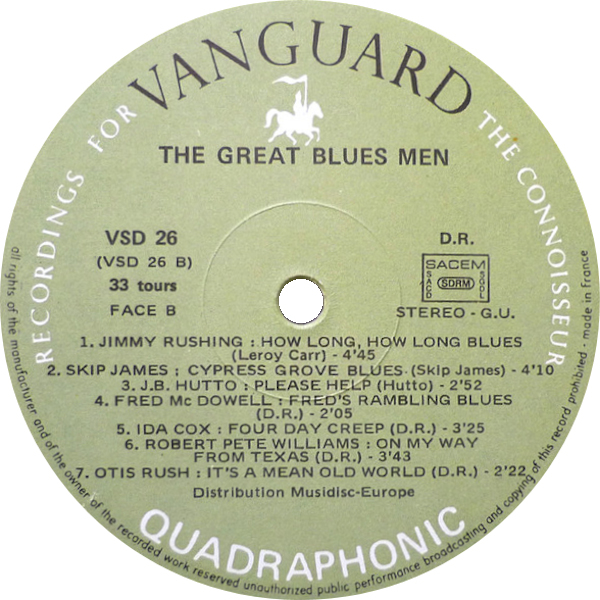 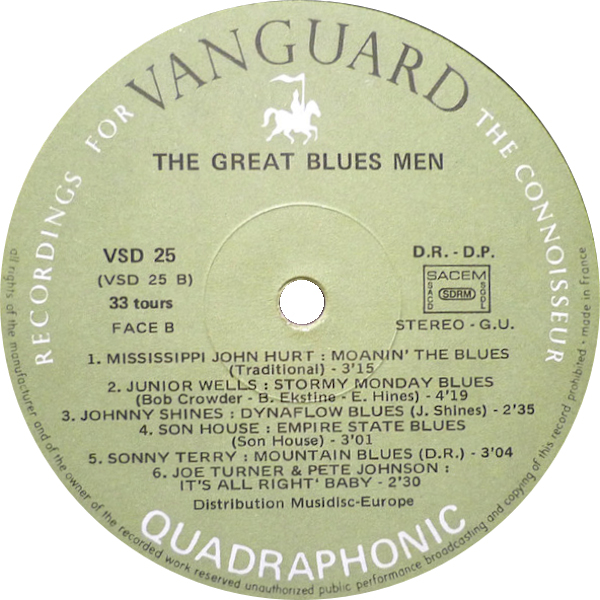 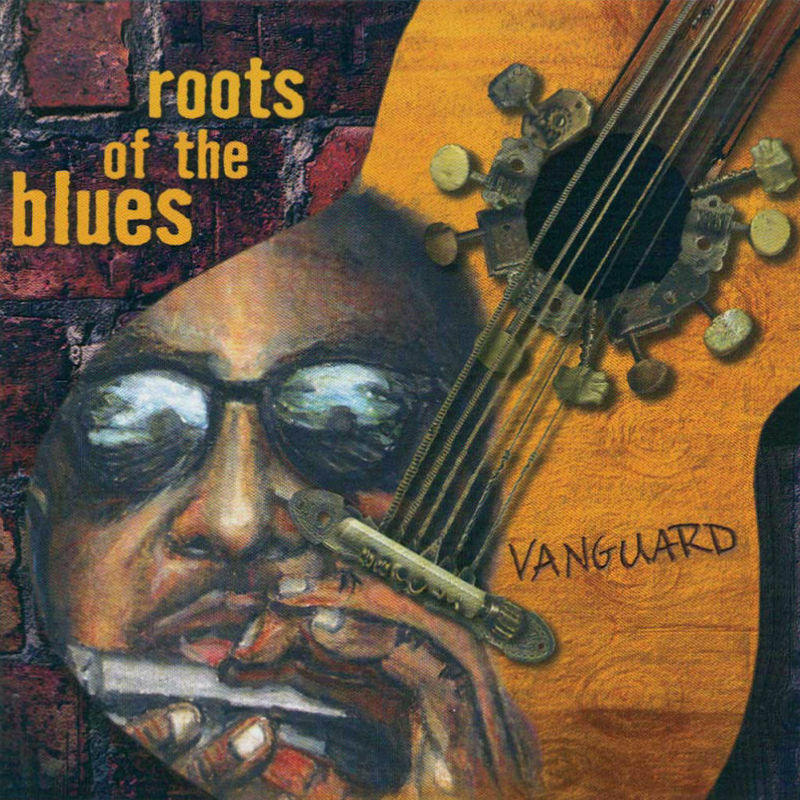 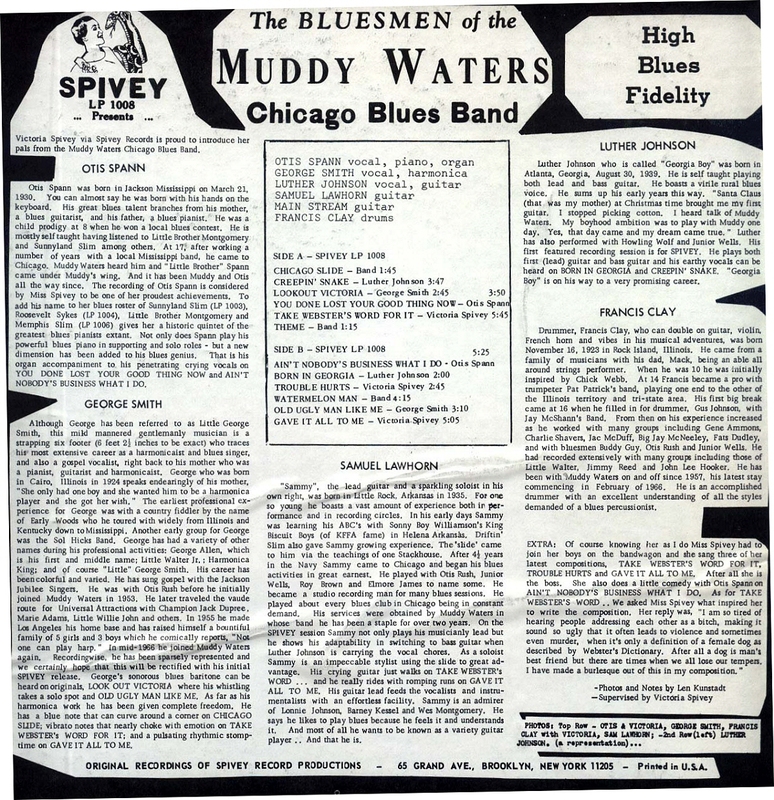 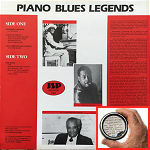 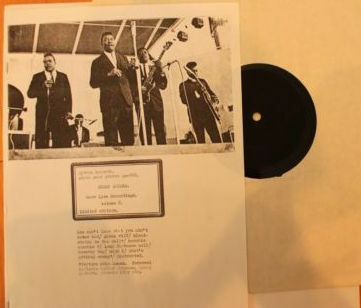 7" "Good Morning, Mr. Blues"
= Storyville SLP 4042 "Blues Roots Vol. 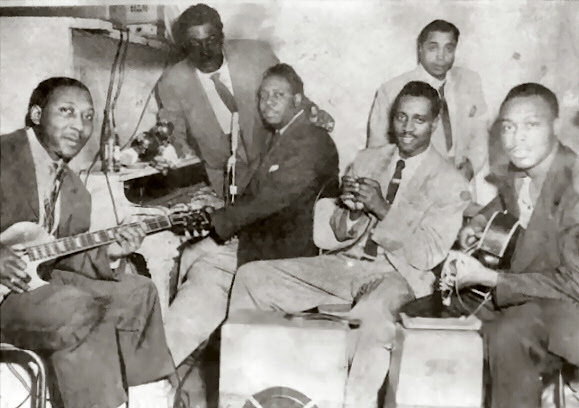 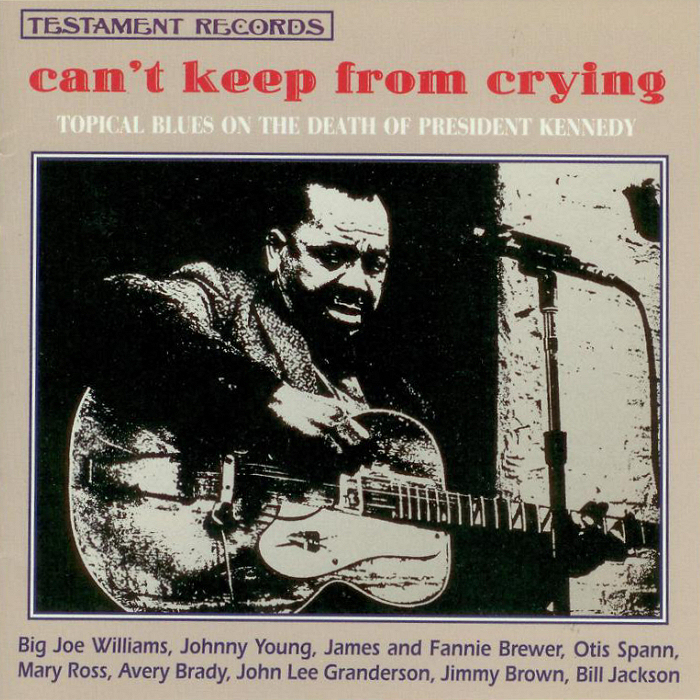 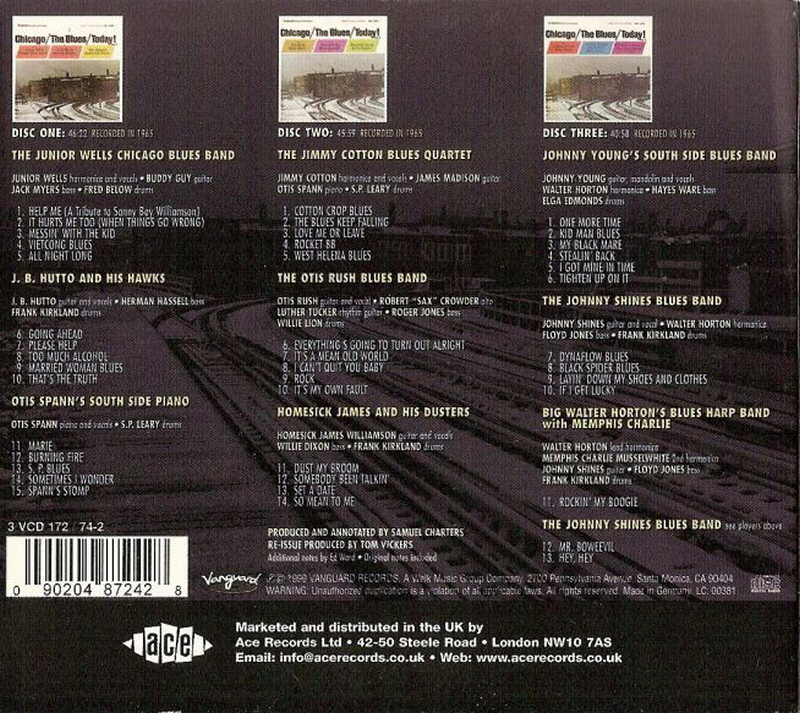 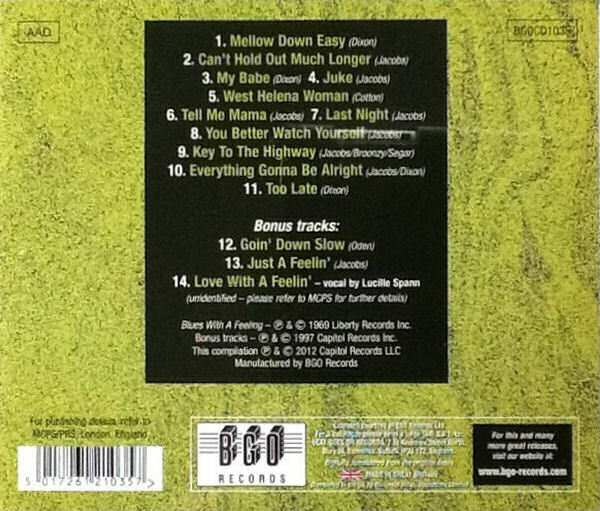 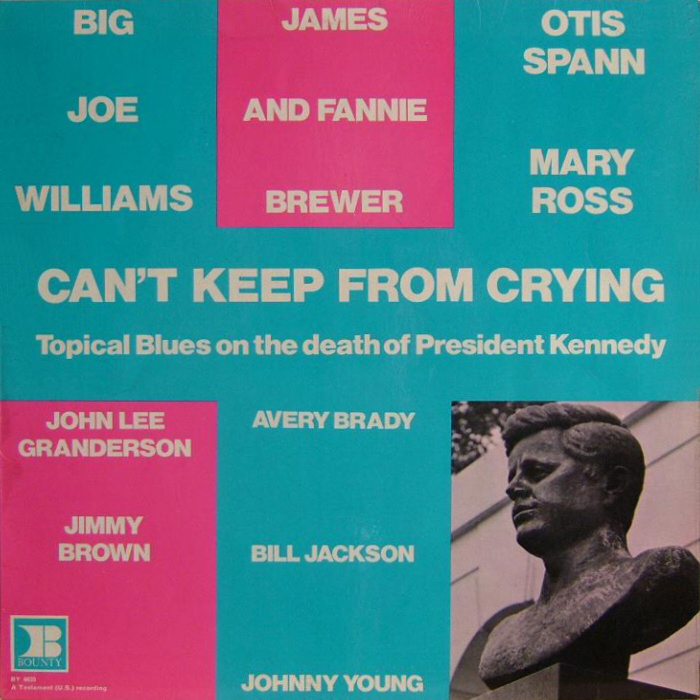 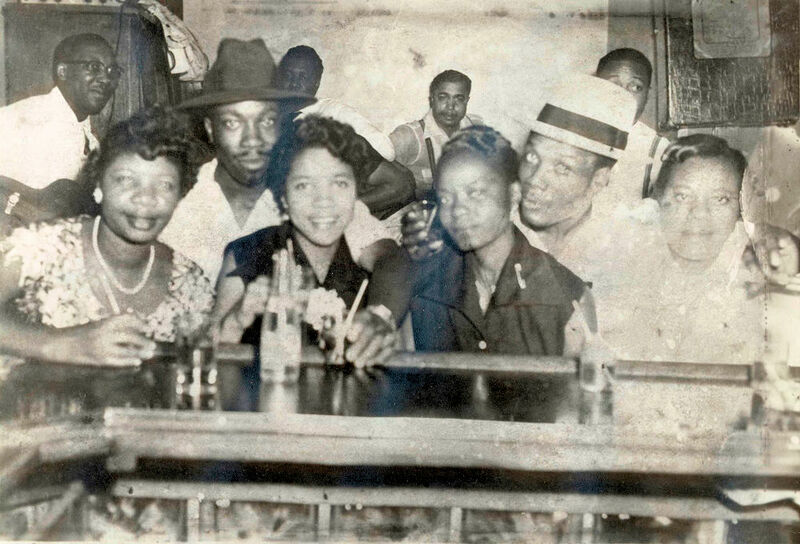 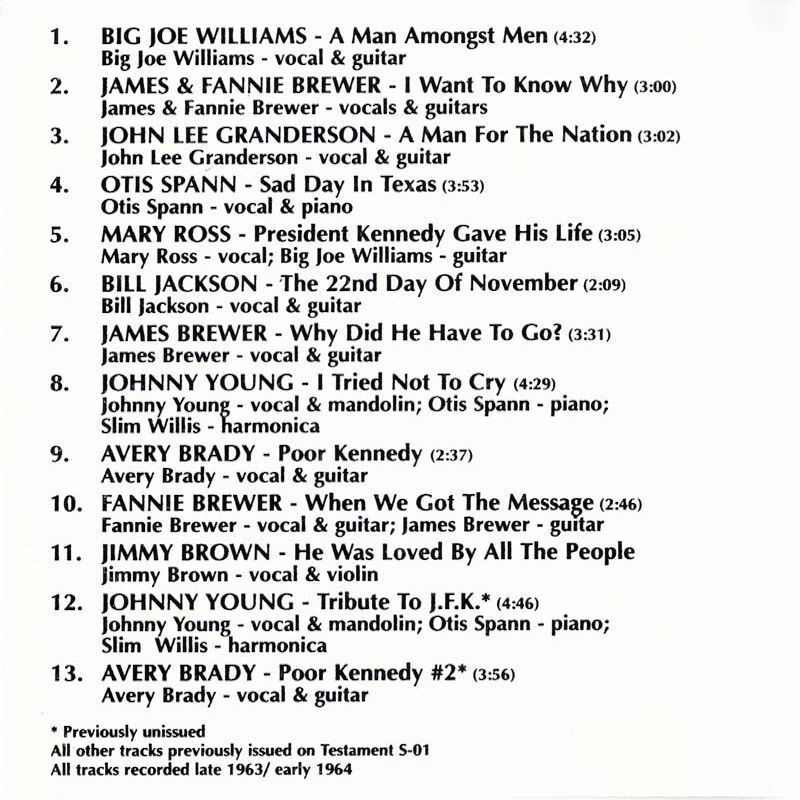 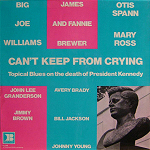 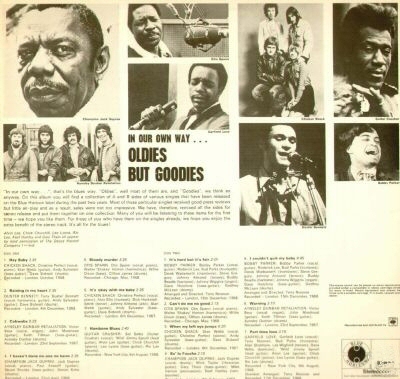 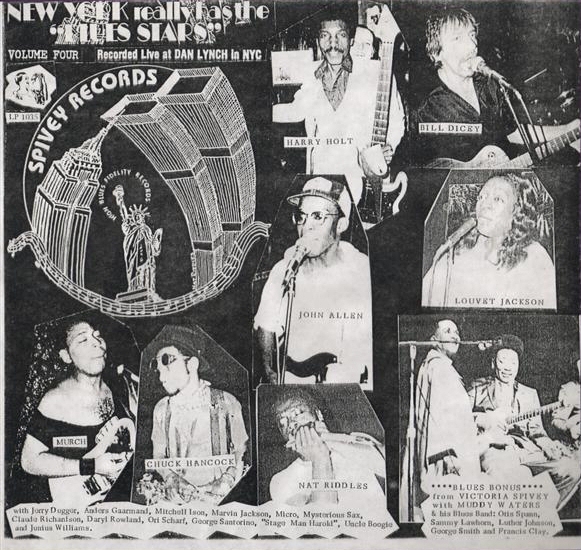 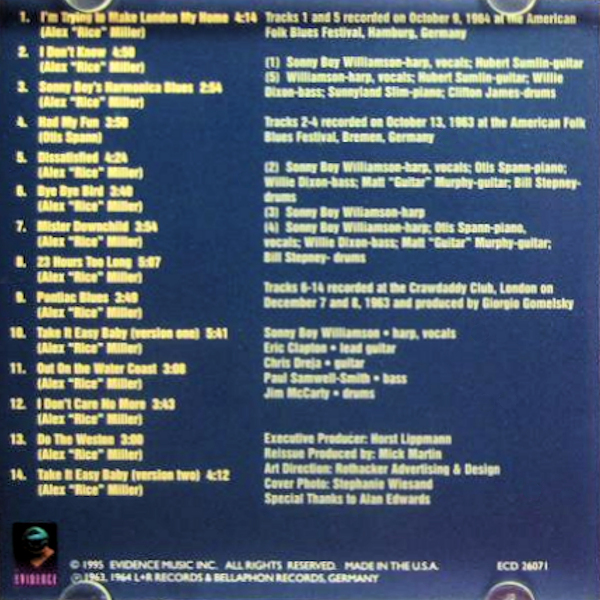 5" "Swinging With Lonnie"
James Brewer - Why Did He Have To Go? 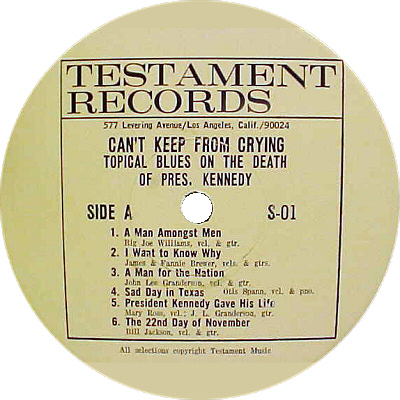 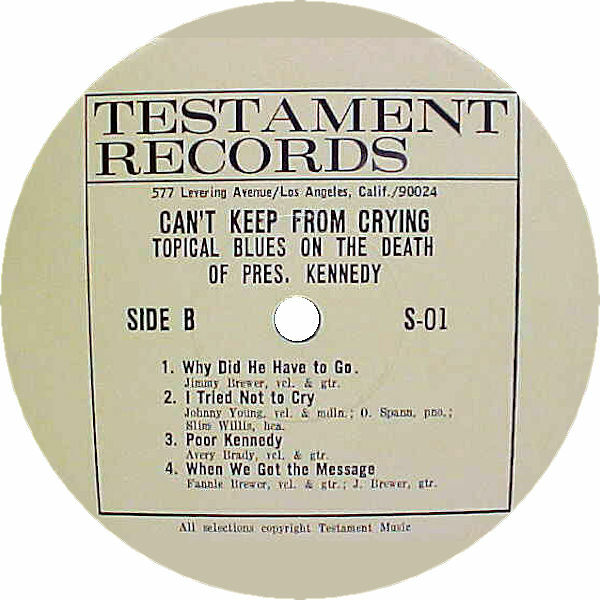 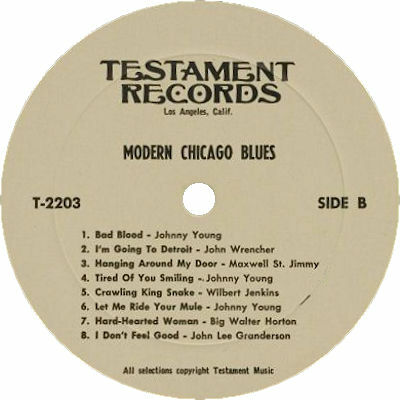 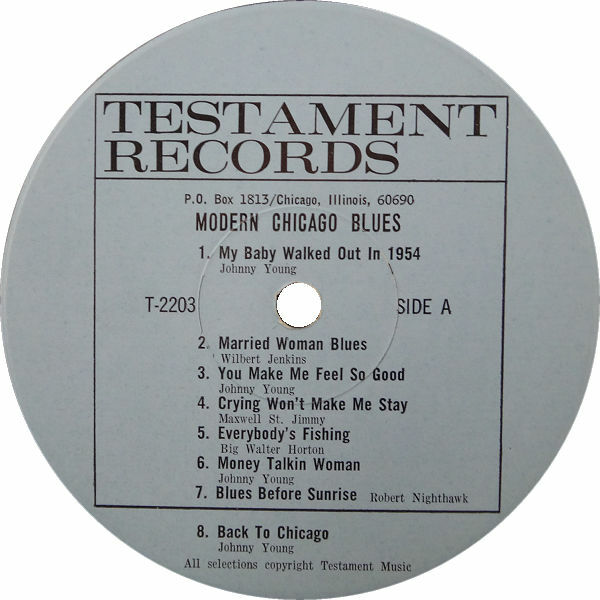 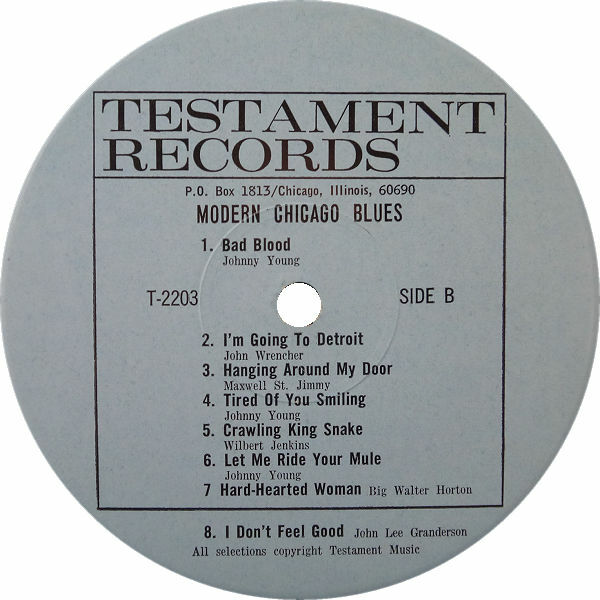 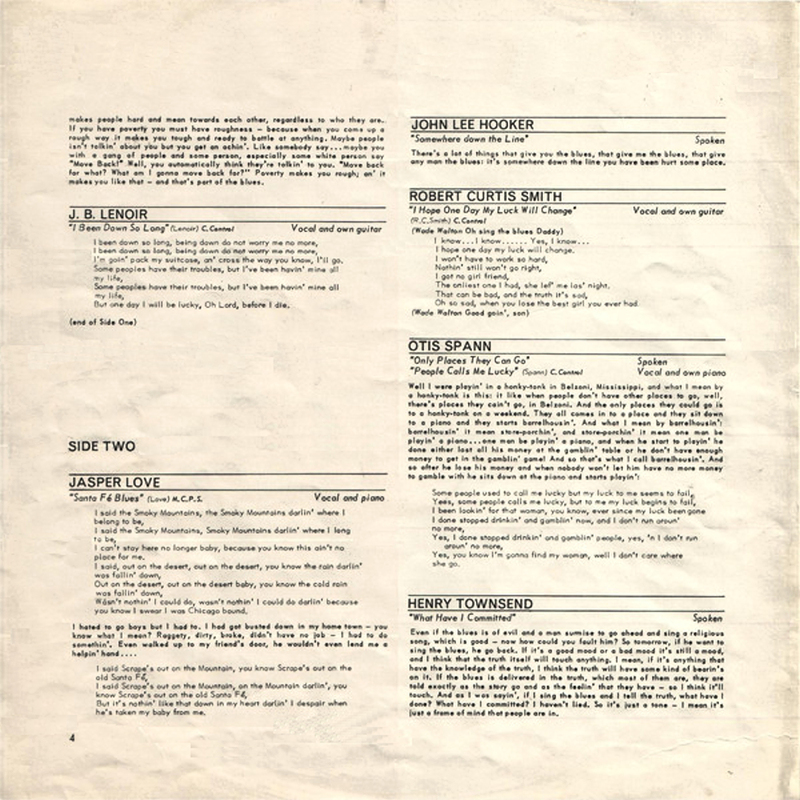 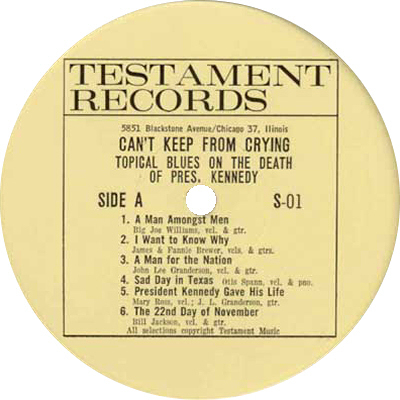 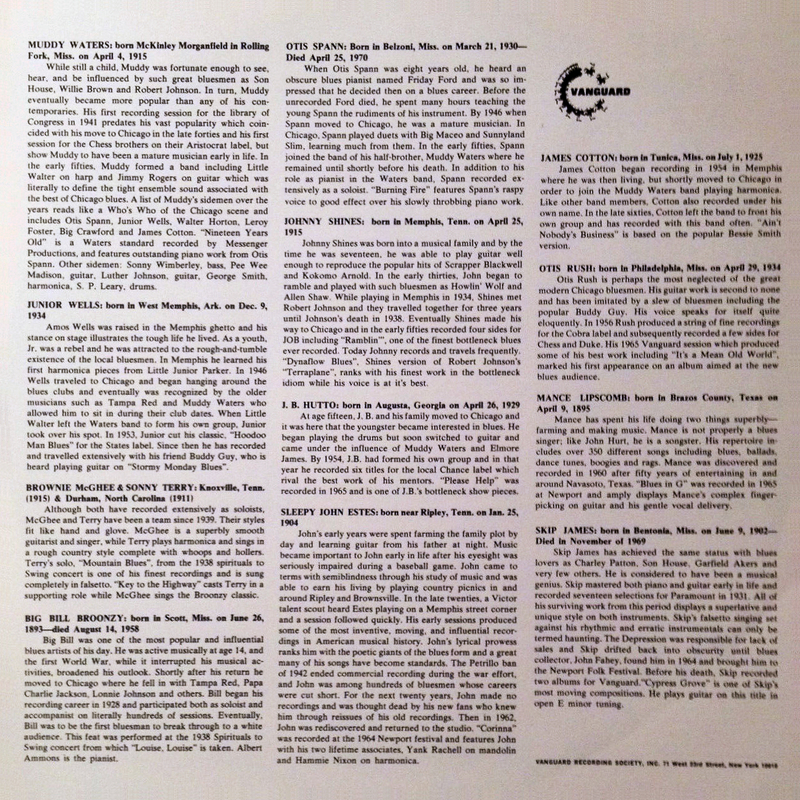 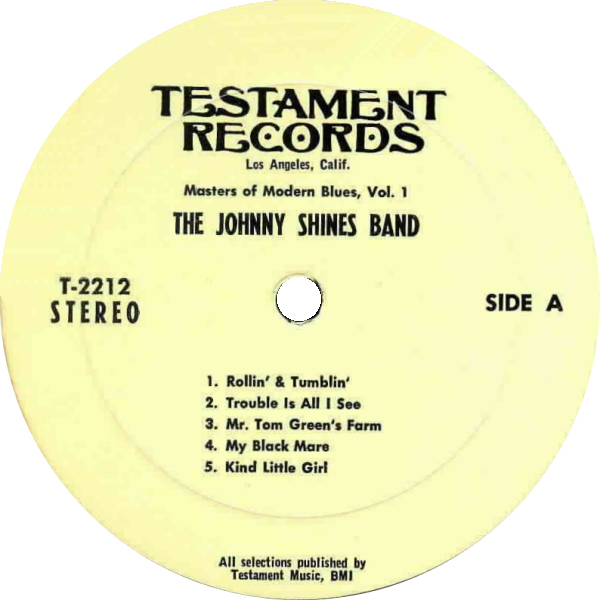 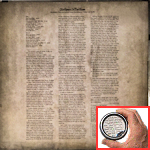 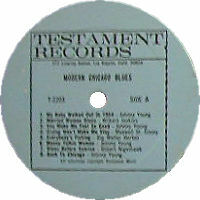 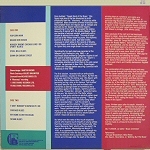 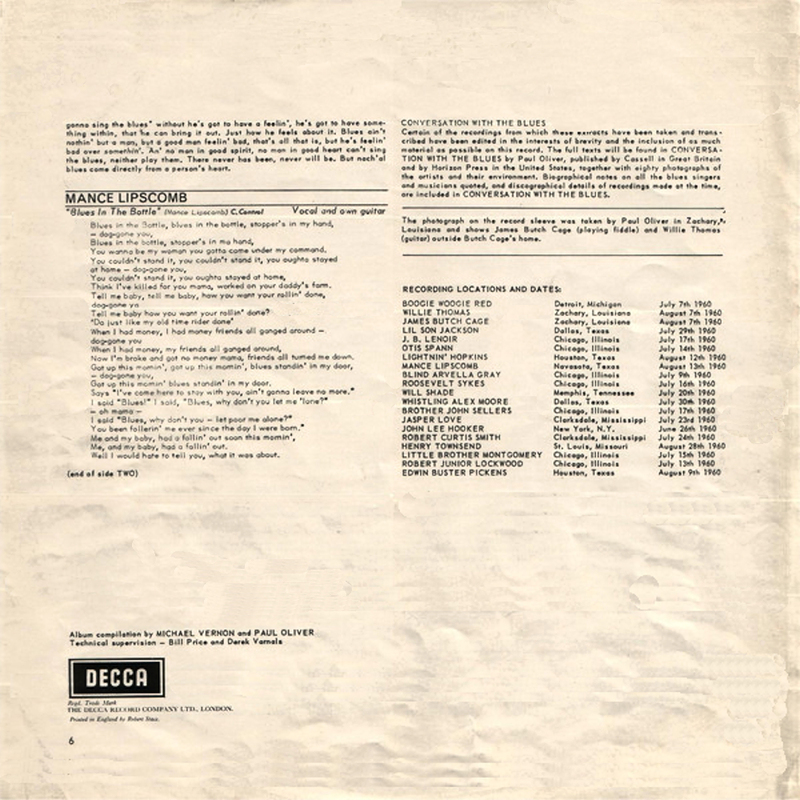 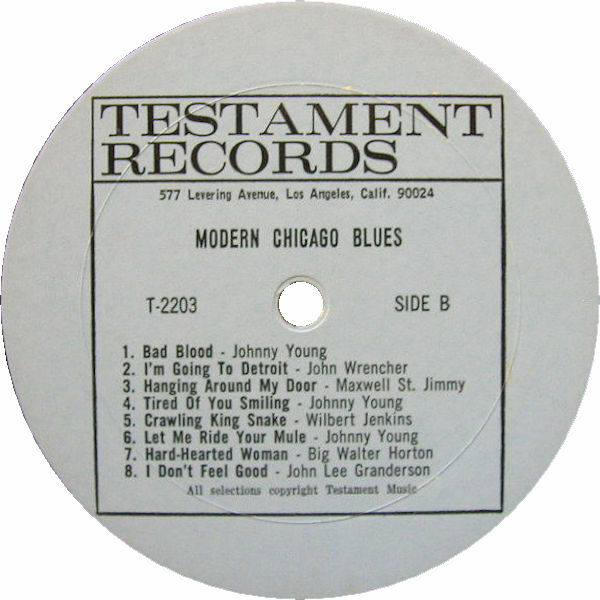 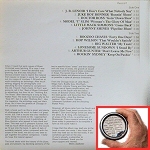 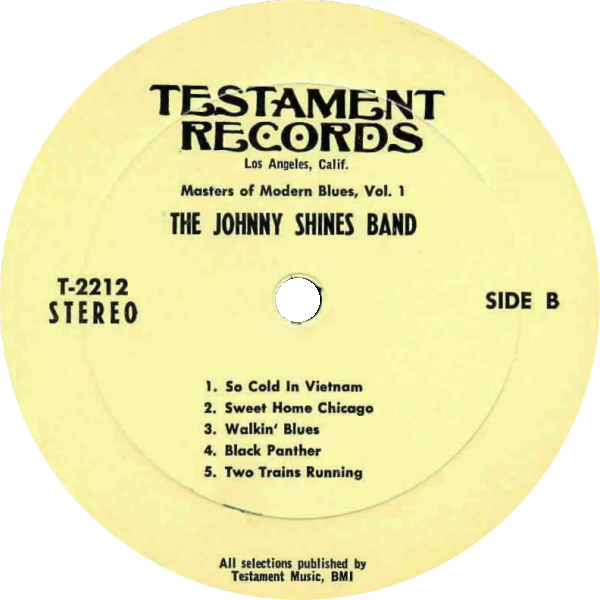 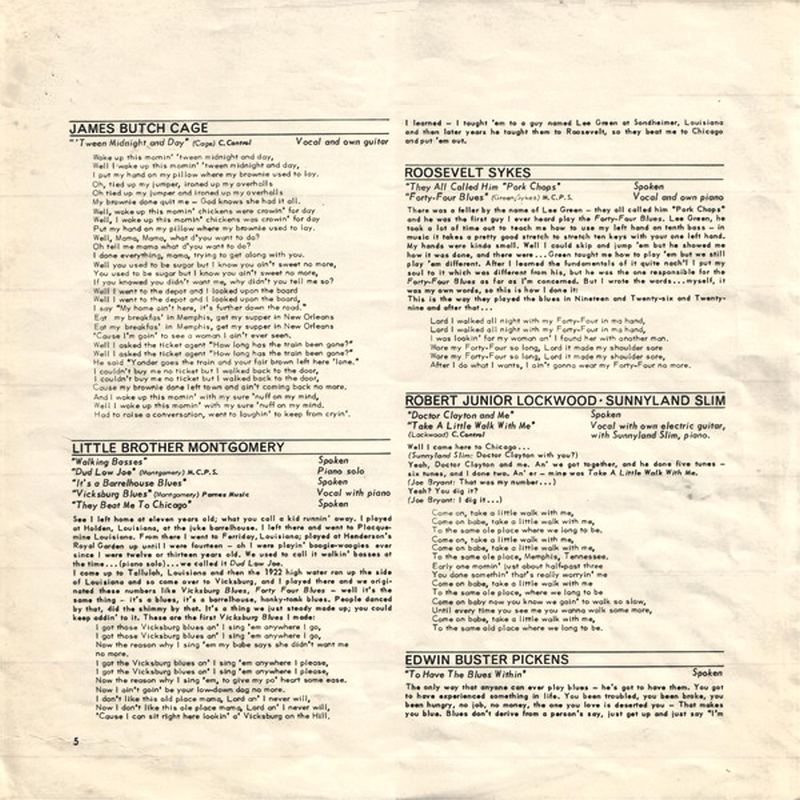 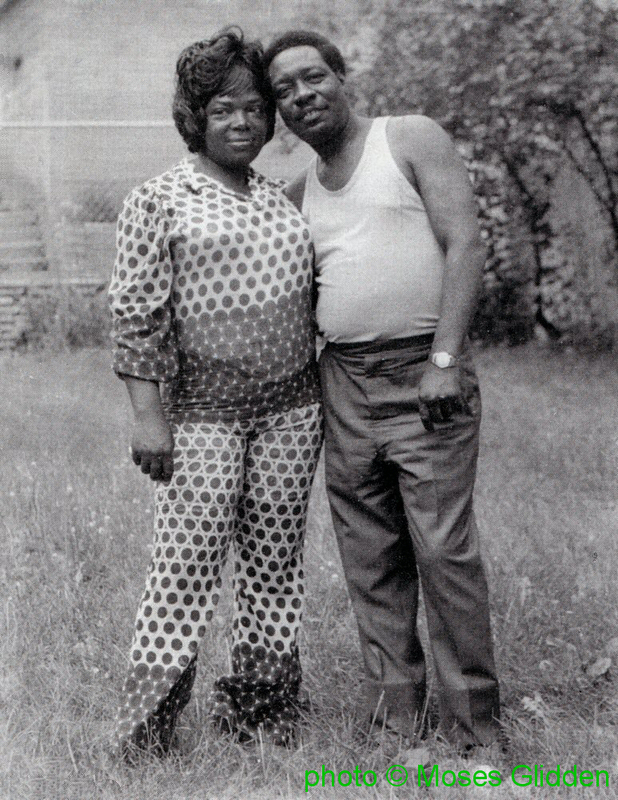 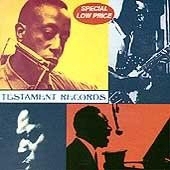 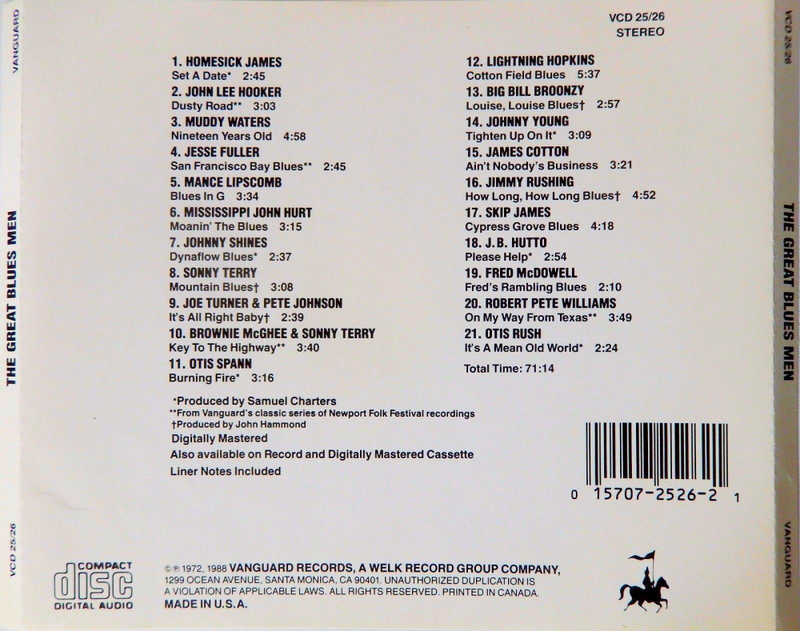 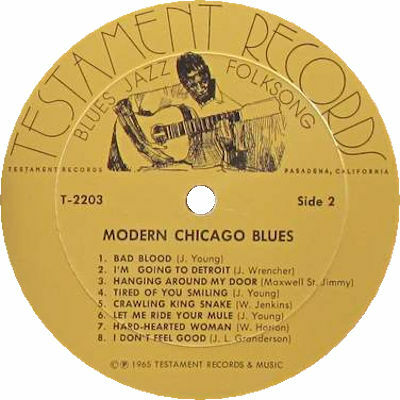 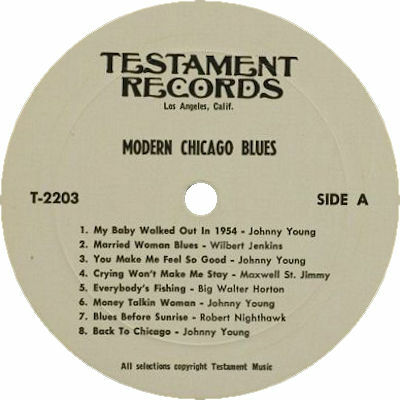 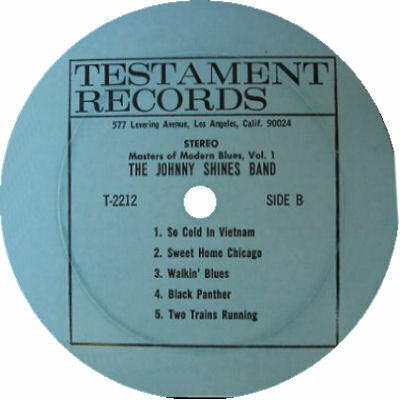 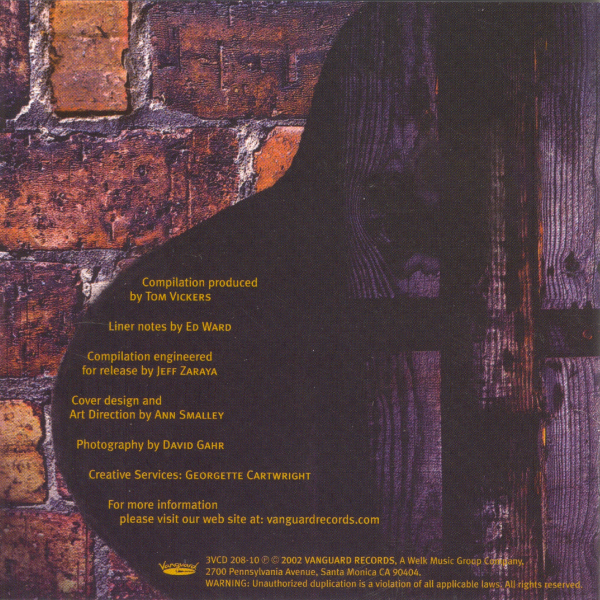 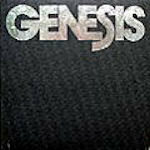 printed on LP's back cover: "TESTAMENT RECORDS, P.O. 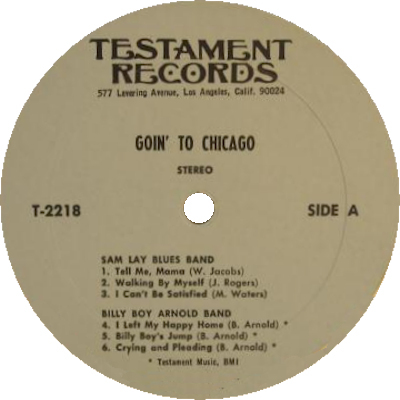 Box 1813, Chicago, Illinois 60690"
later additionally stamped "New address: 577 Levering, Los Angeles, Calif. 90024"
notes by Peter J. Welding "5851 Blackstone Avenue/Chicago 37, Illinois"
"577 Levering Avenue/Los Angeles, Calif./90024"
notes by Peter. 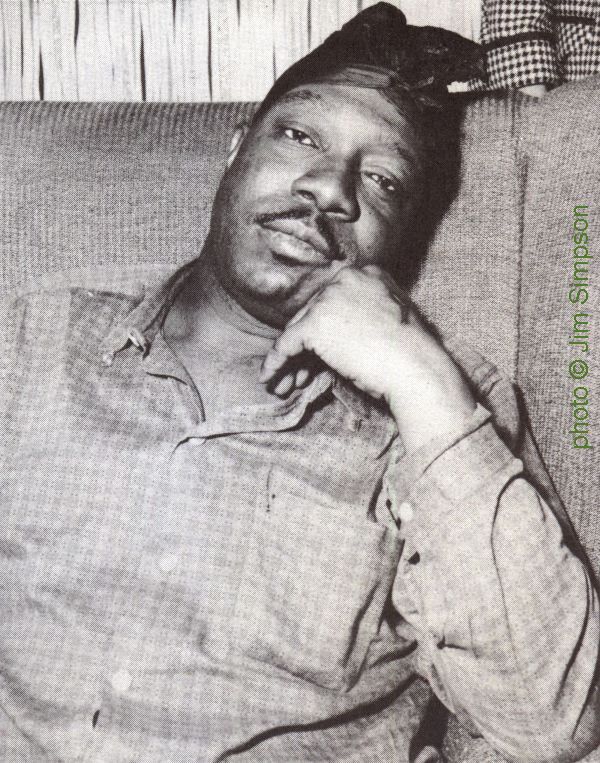 J. Welding "P.O. 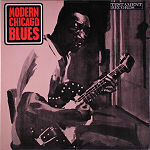 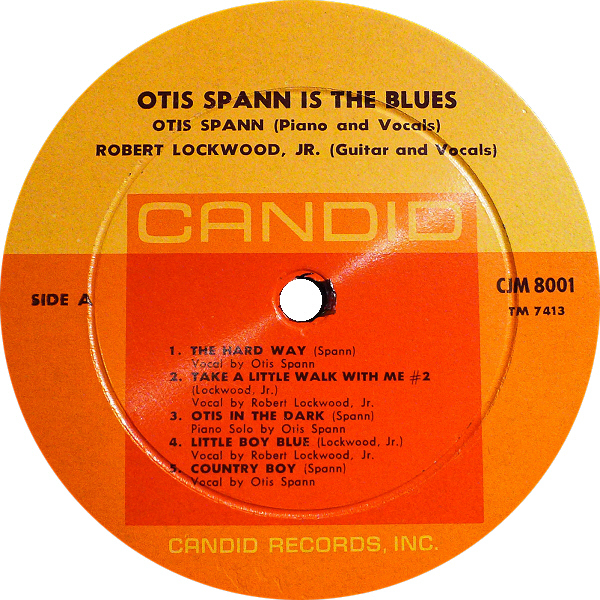 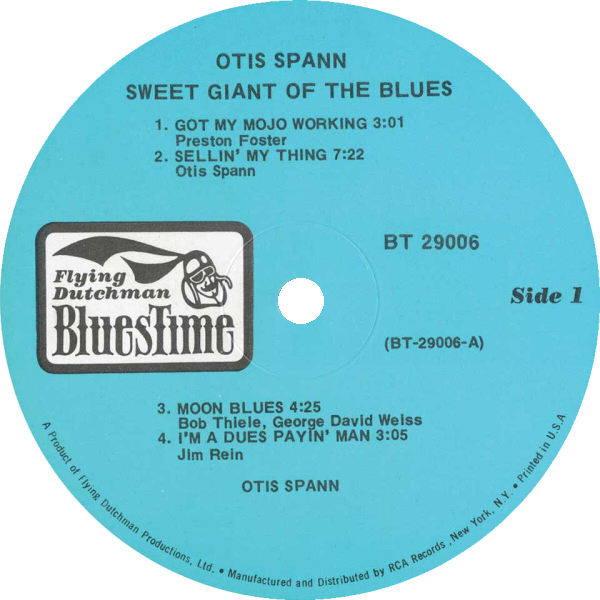 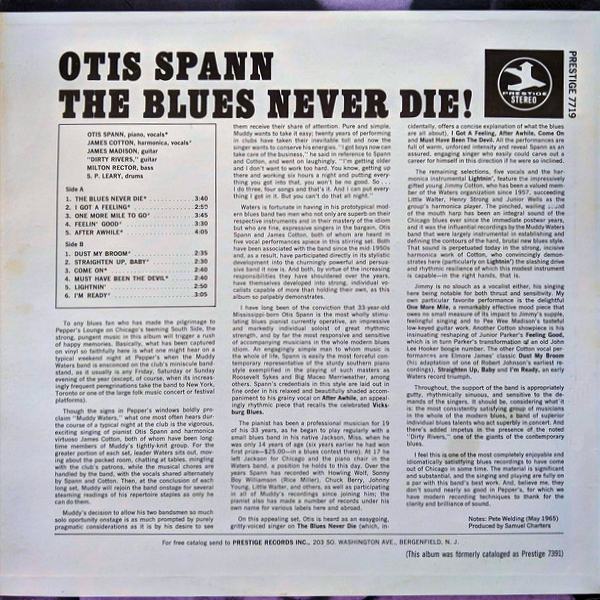 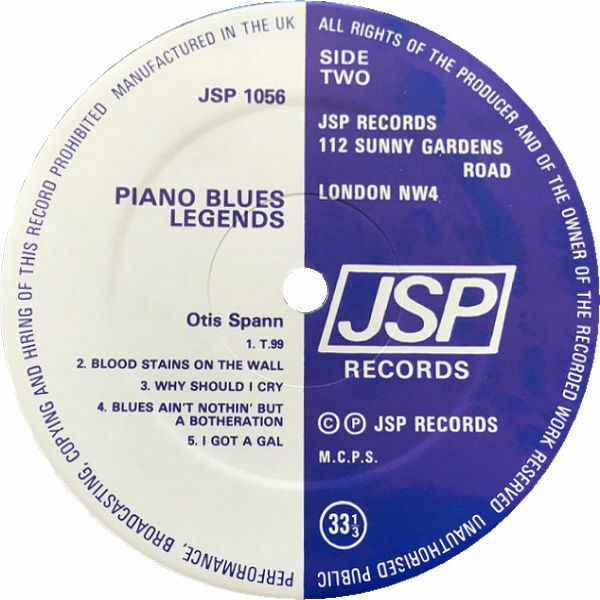 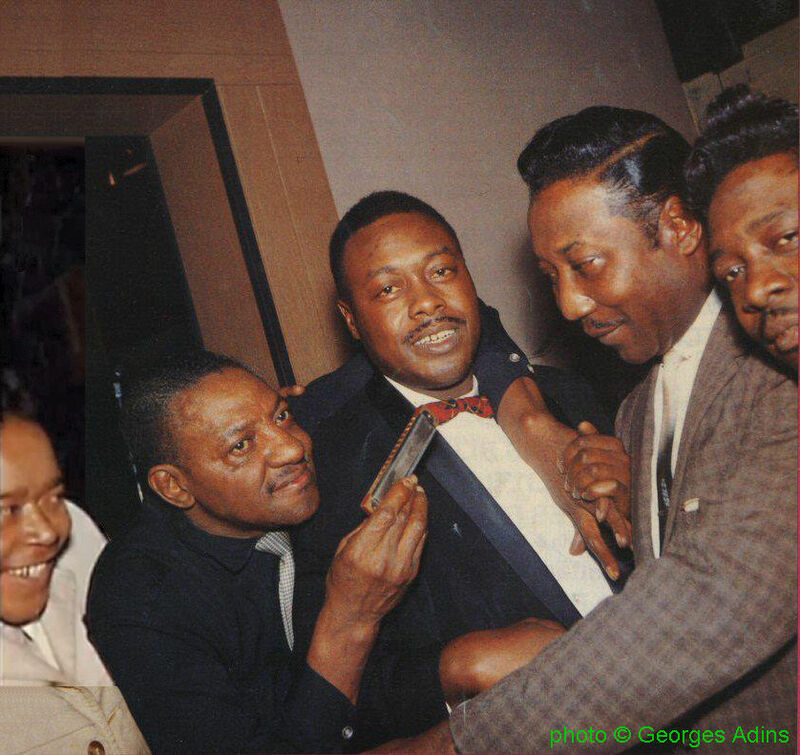 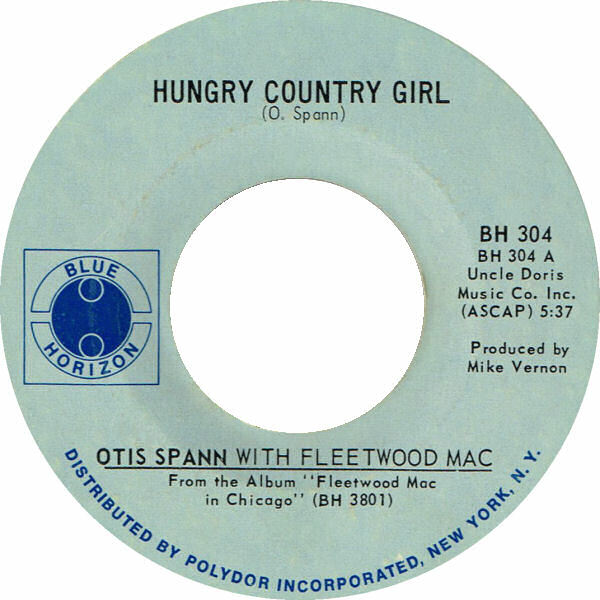 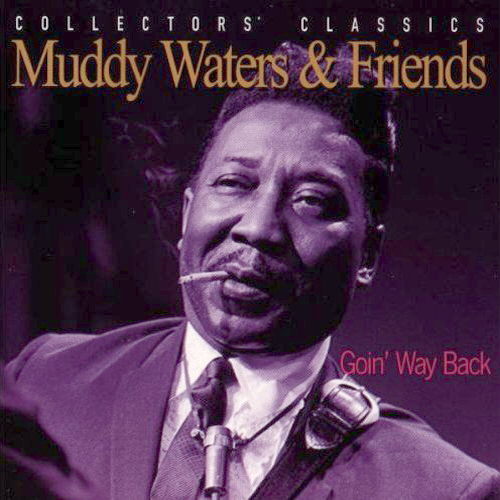 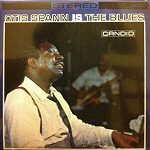 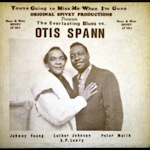 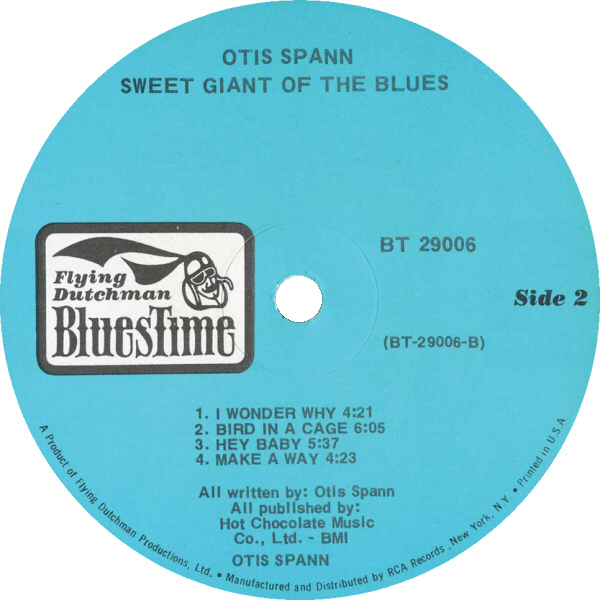 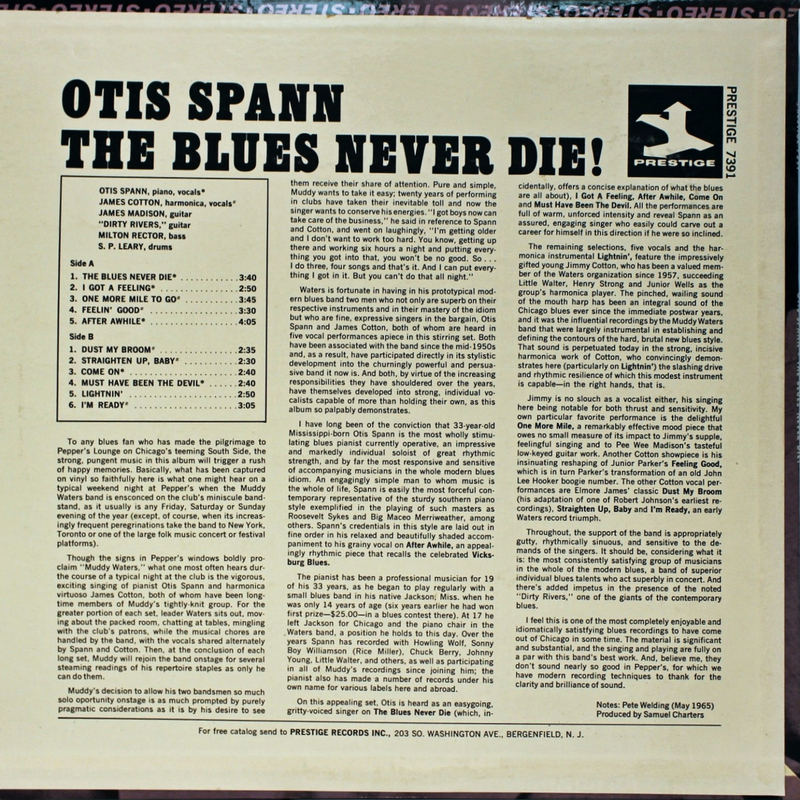 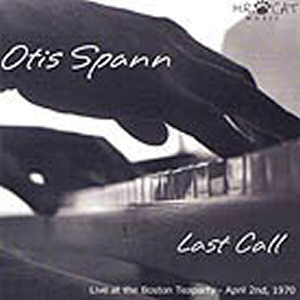 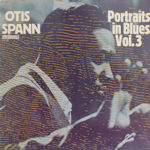 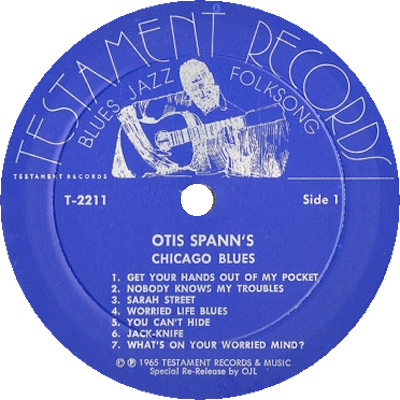 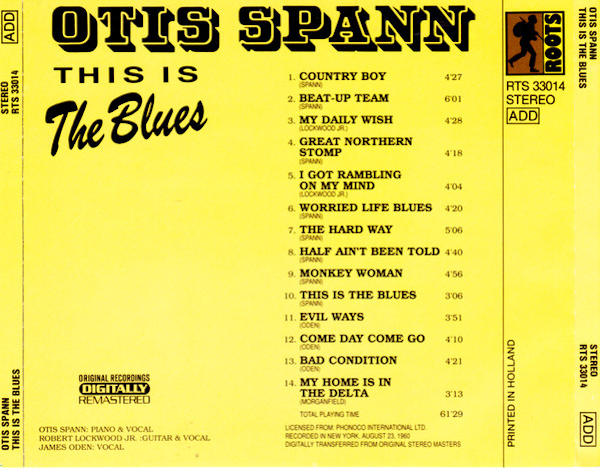 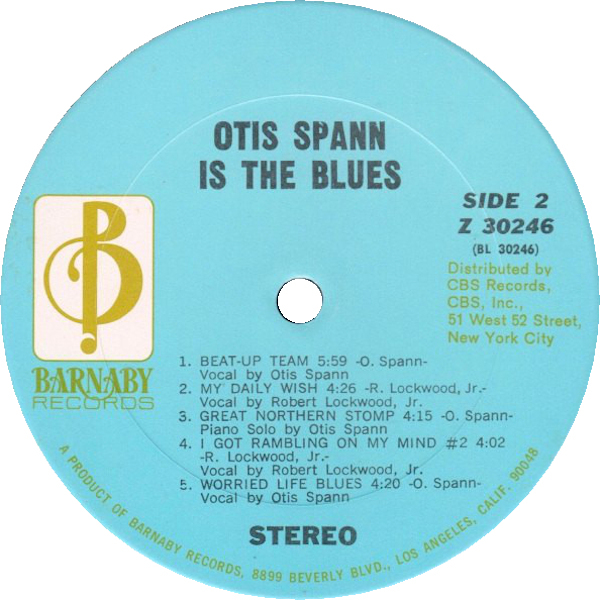 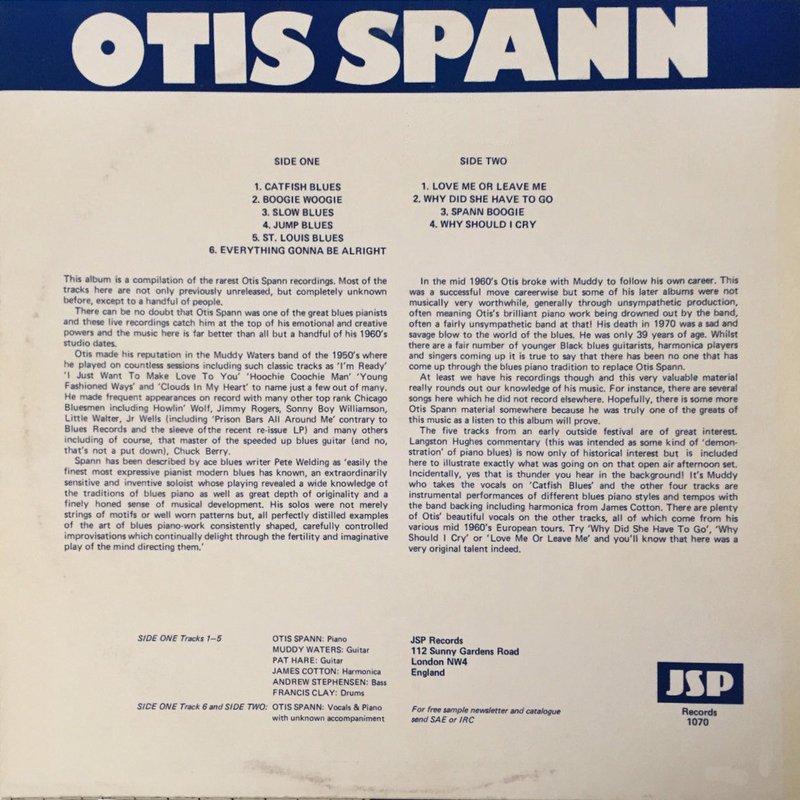 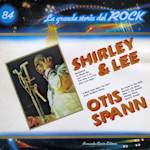 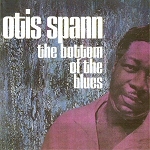 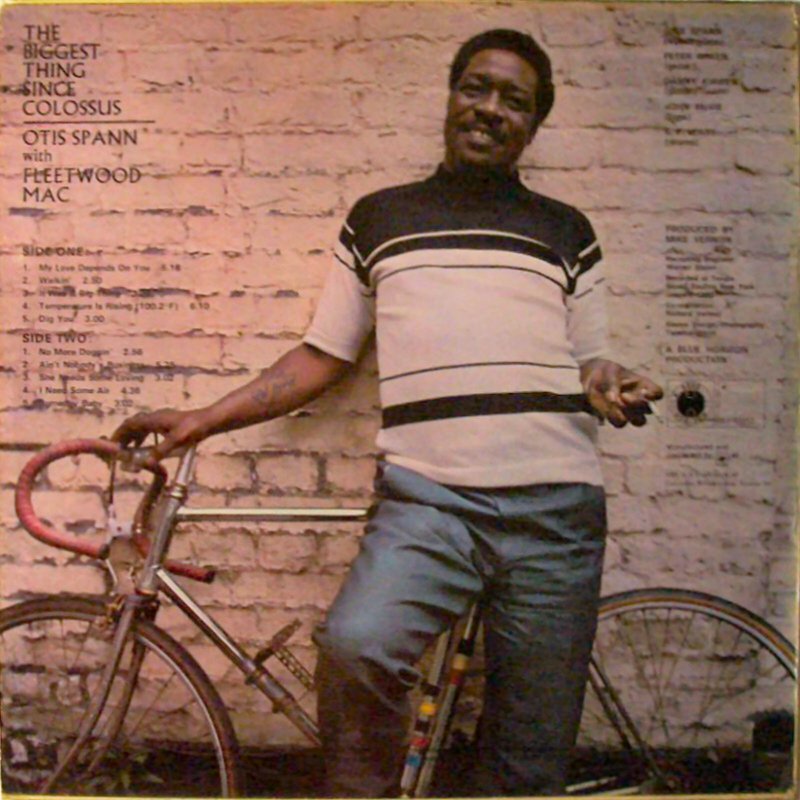 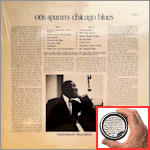 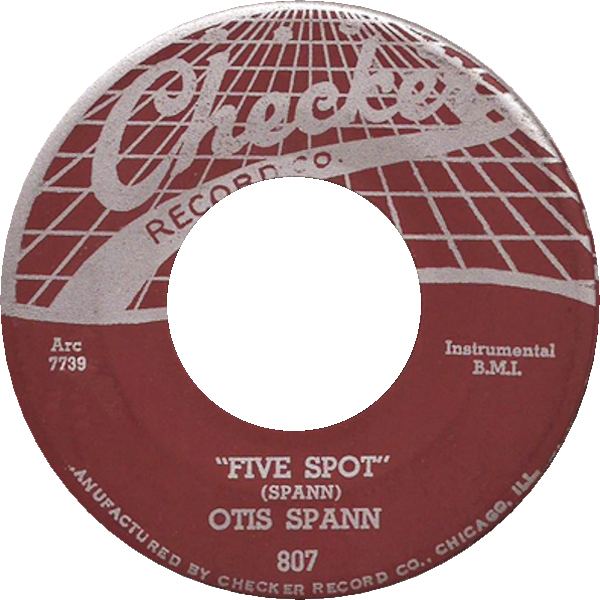 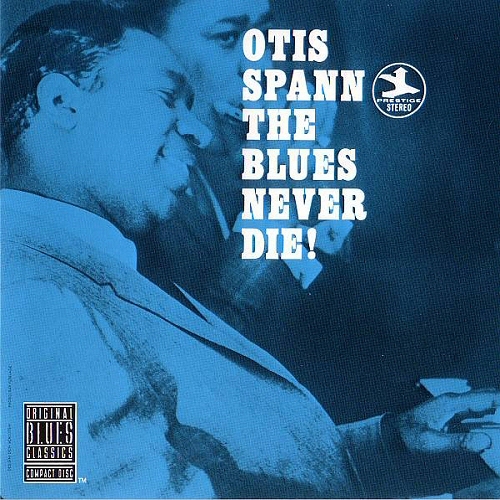 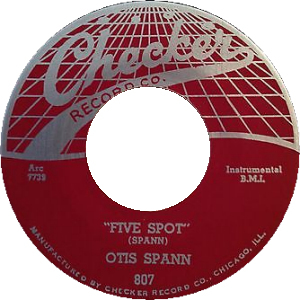 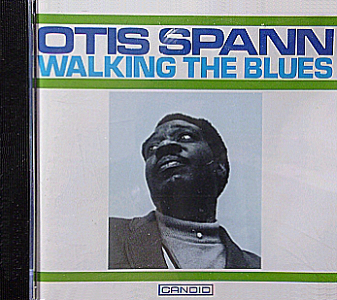 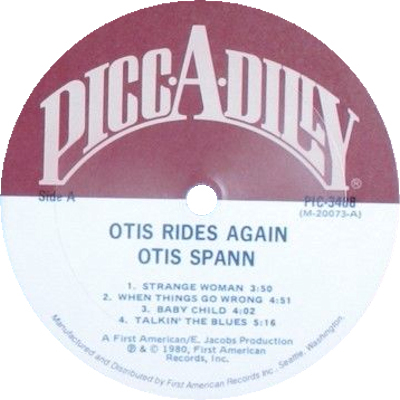 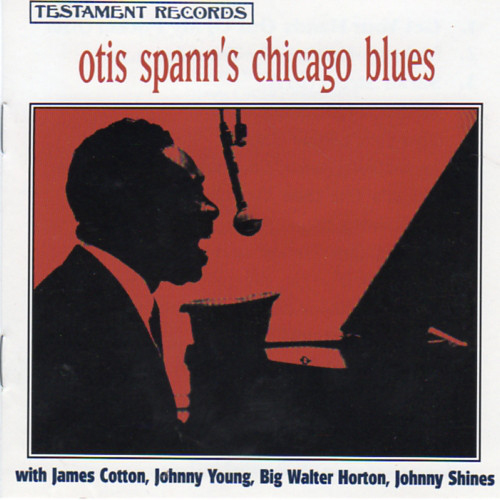 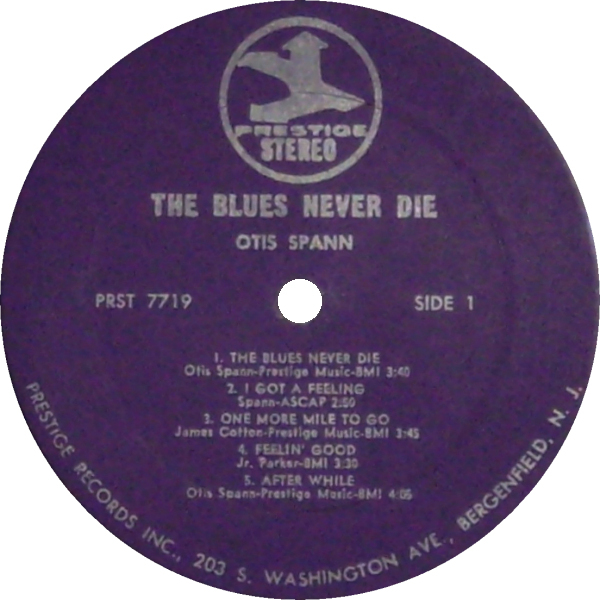 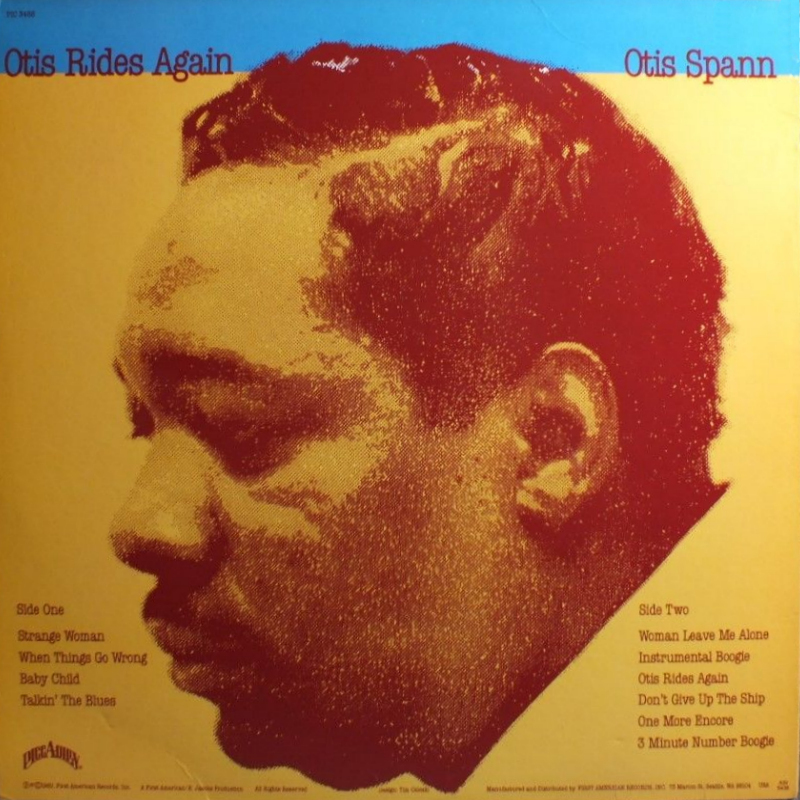 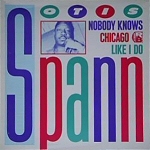 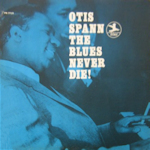 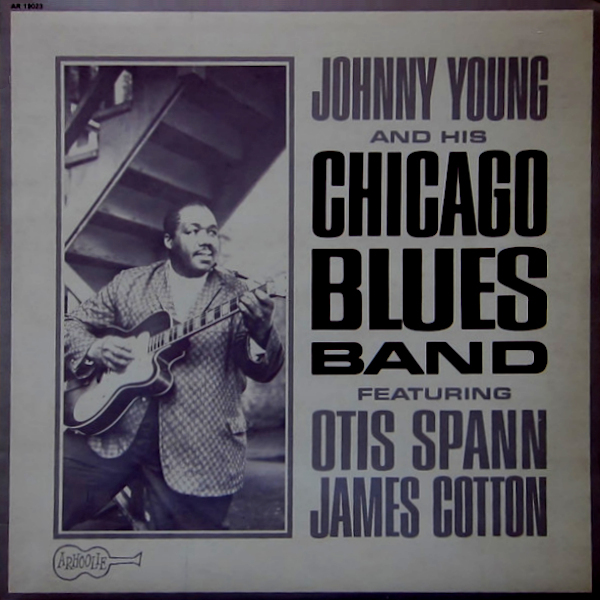 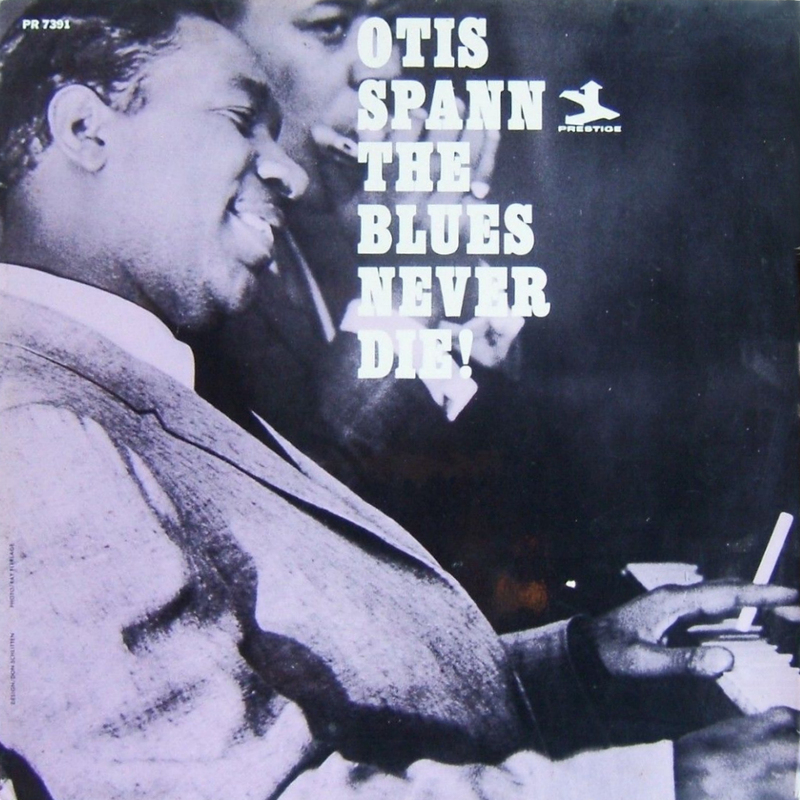 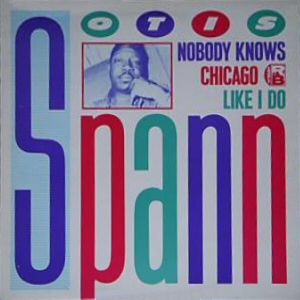 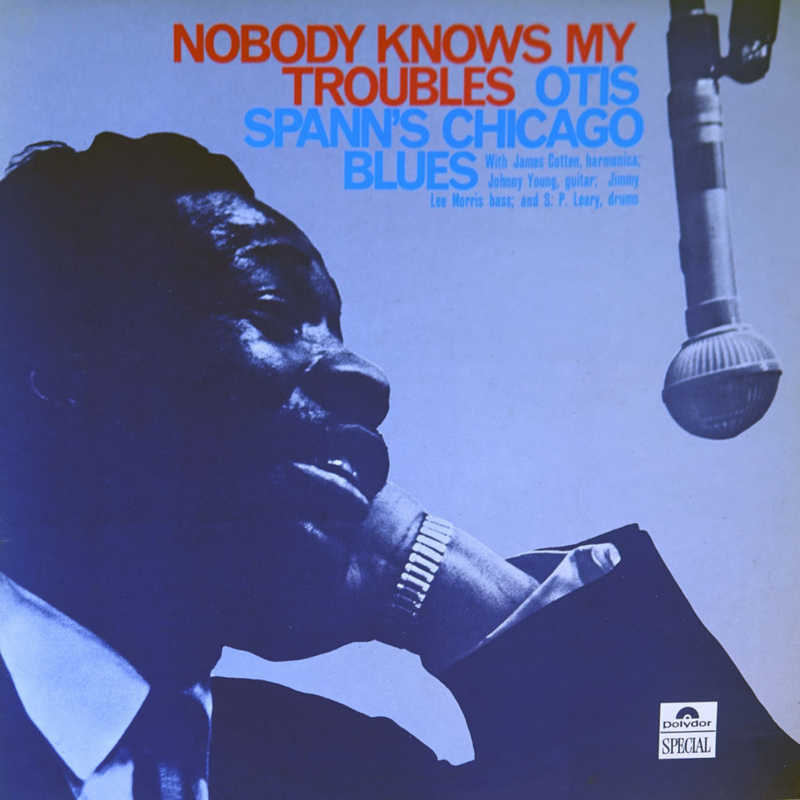 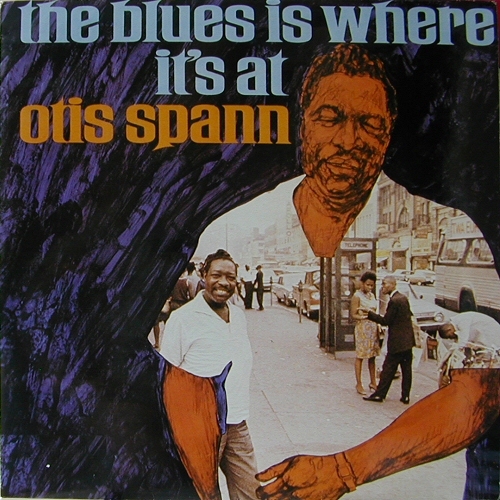 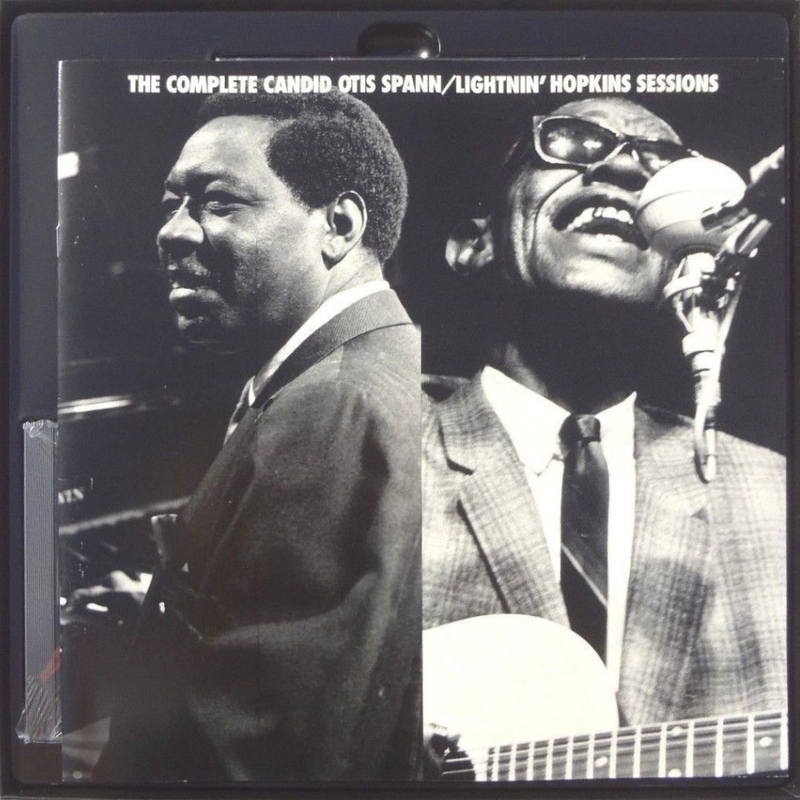 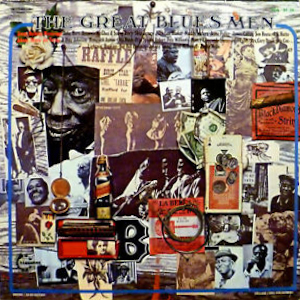 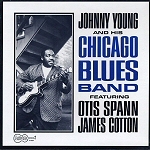 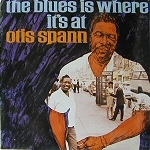 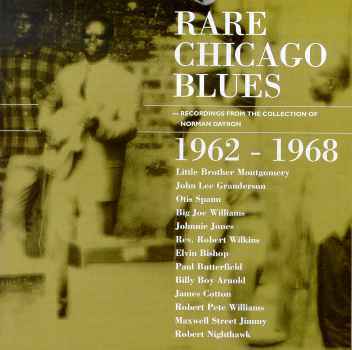 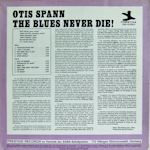 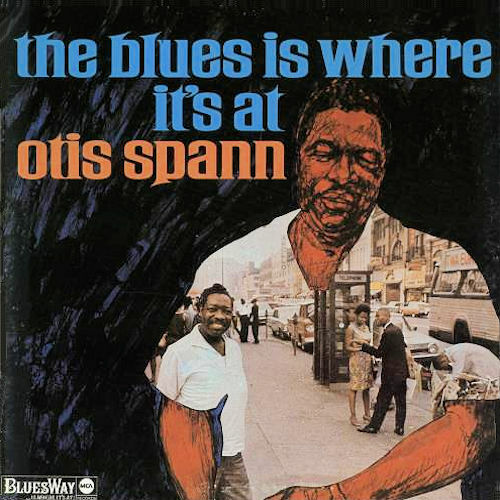 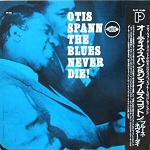 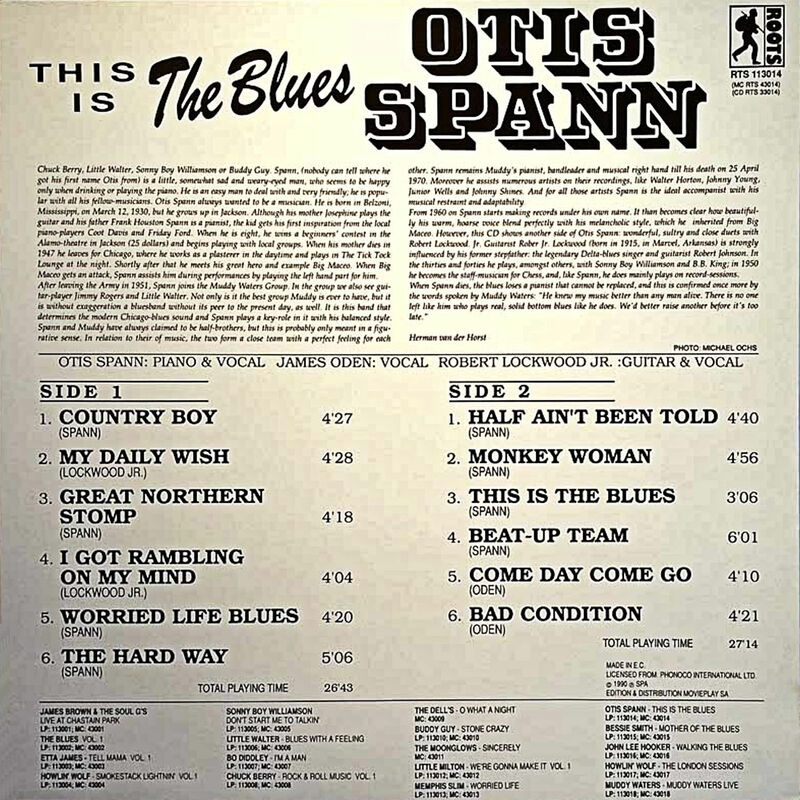 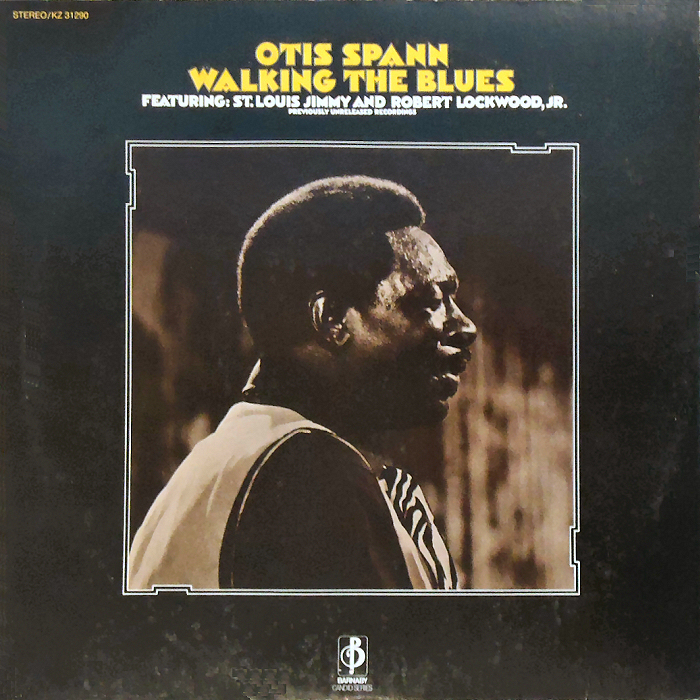 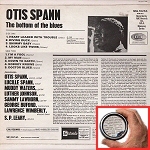 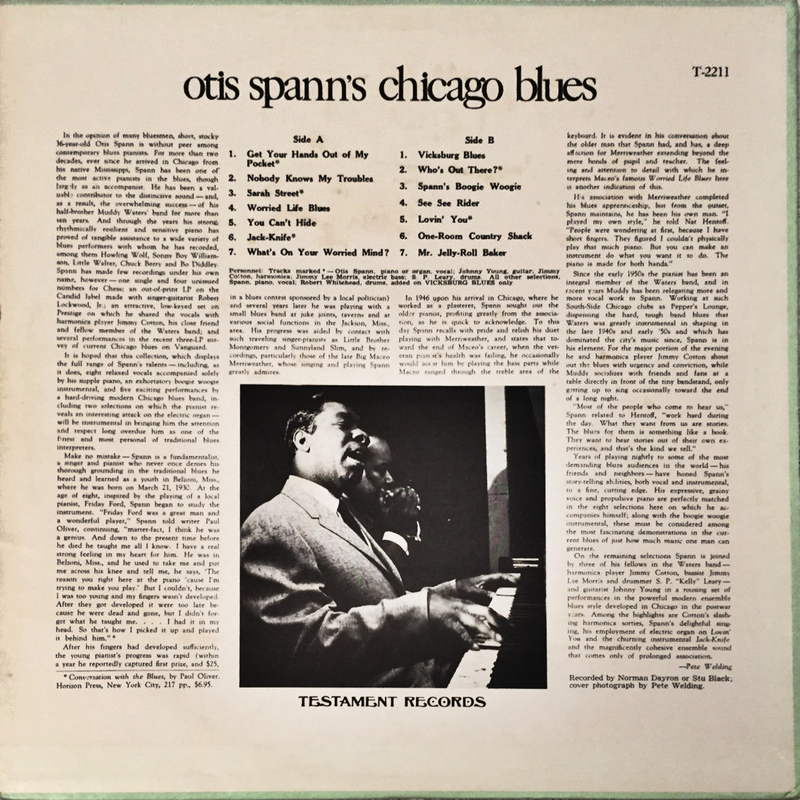 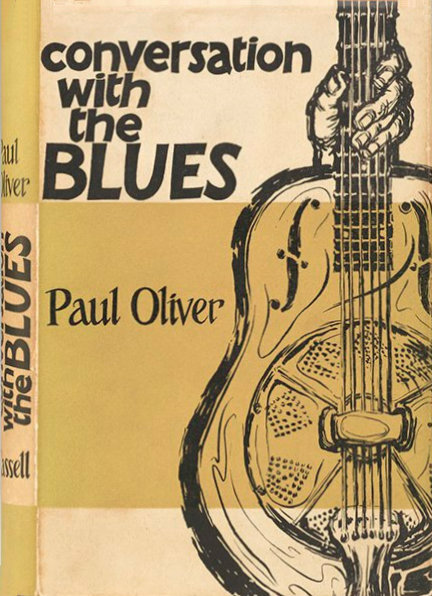 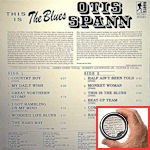 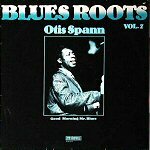 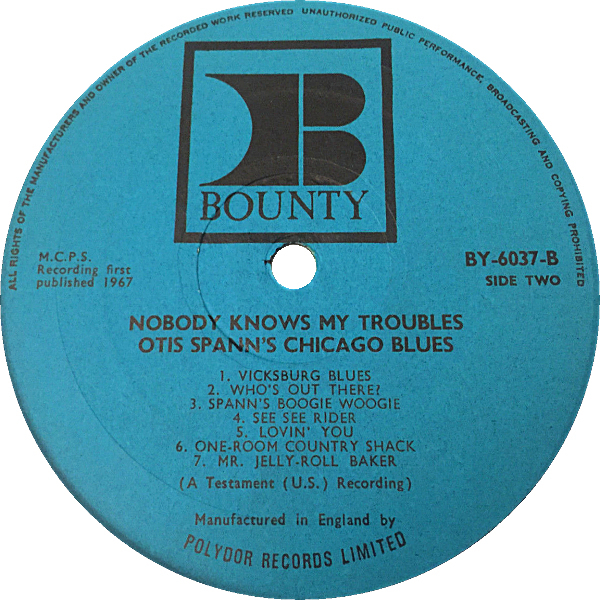 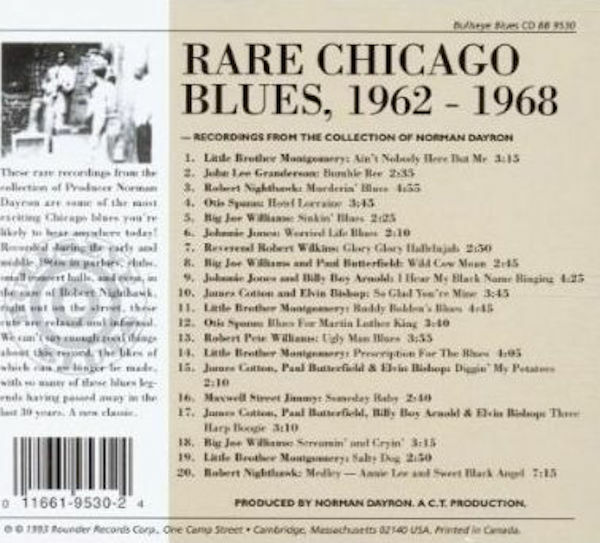 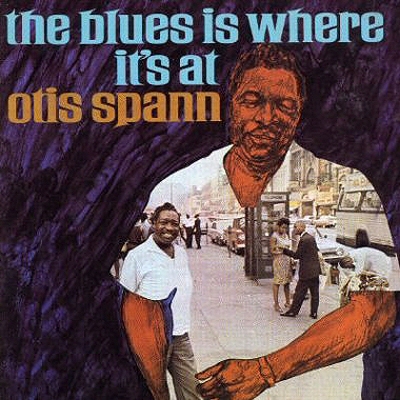 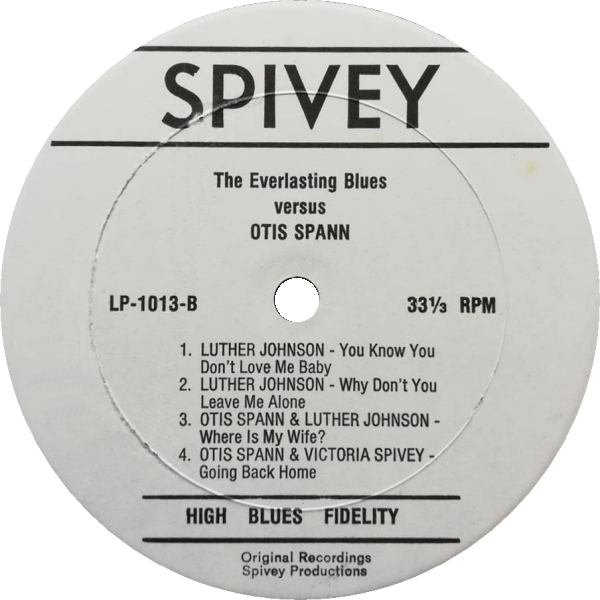 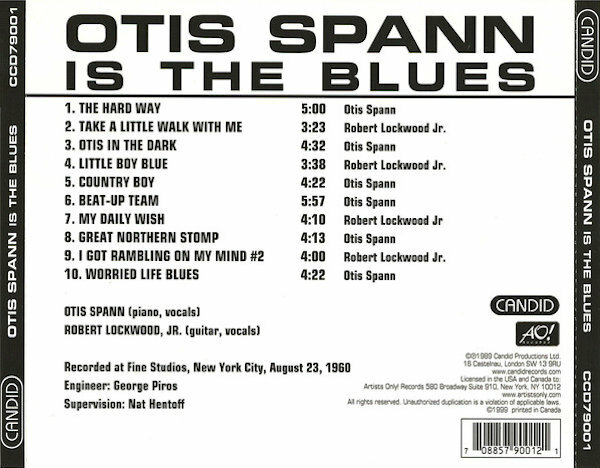 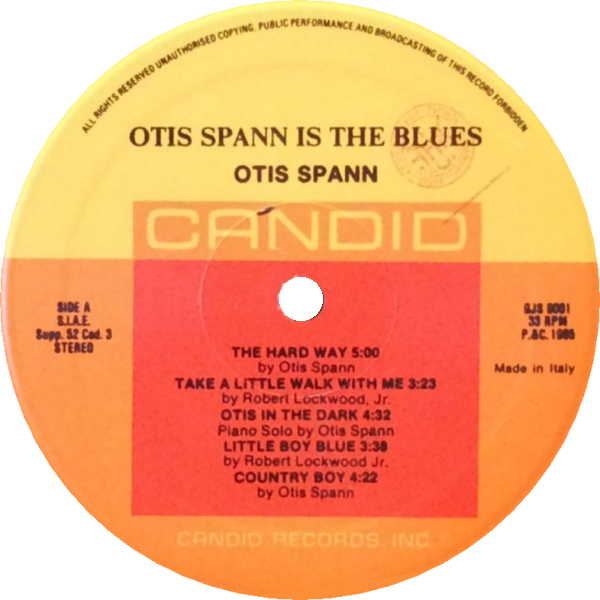 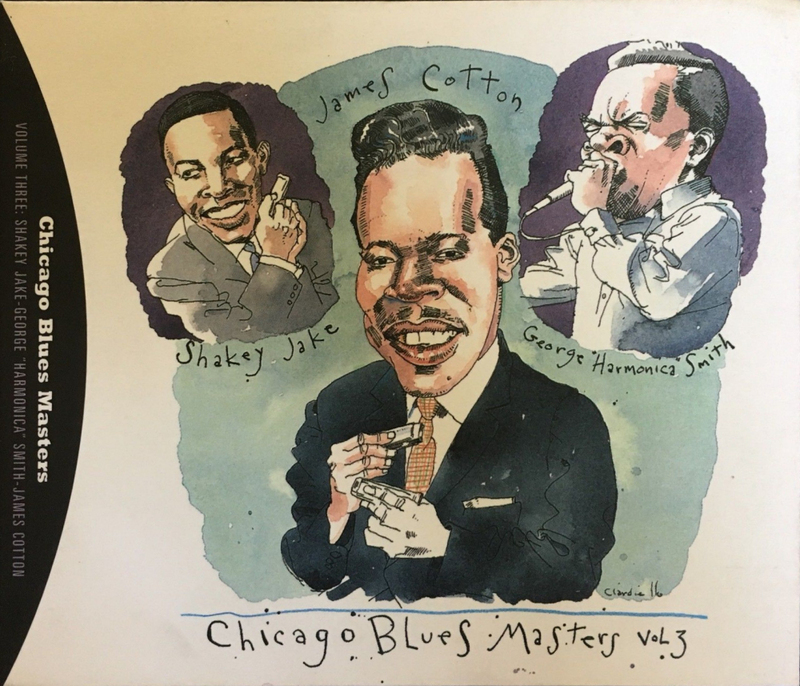 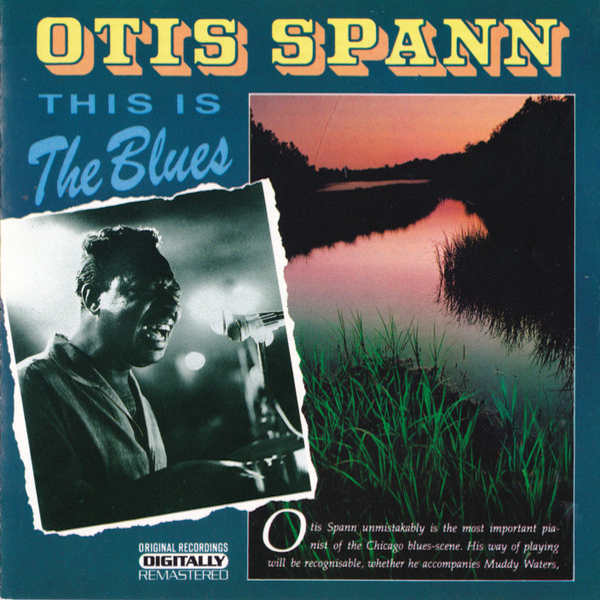 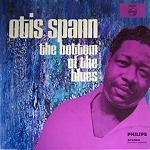 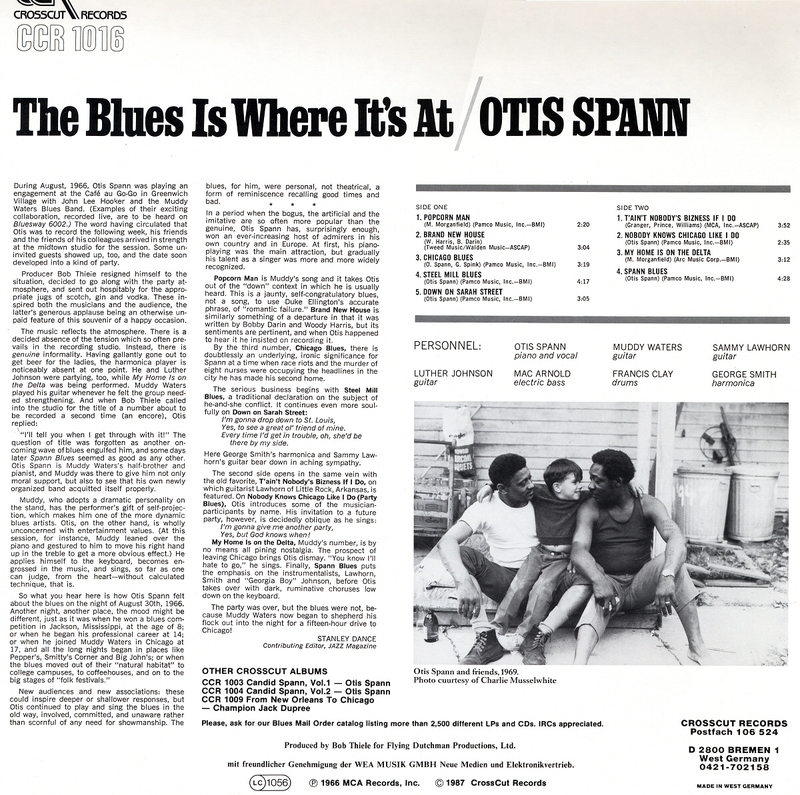 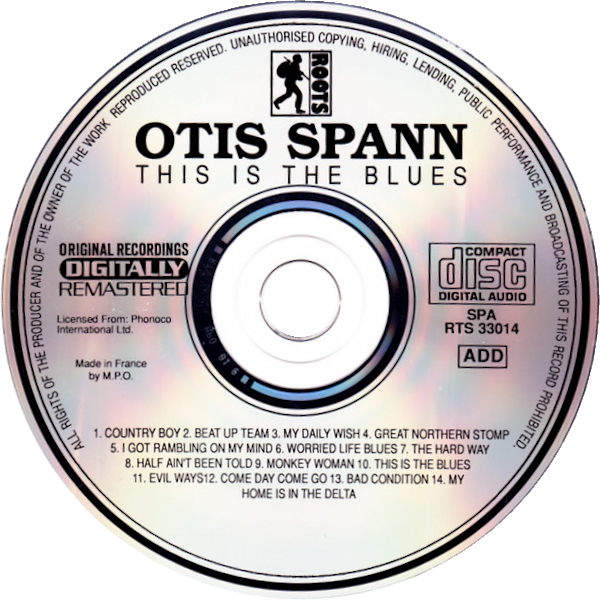 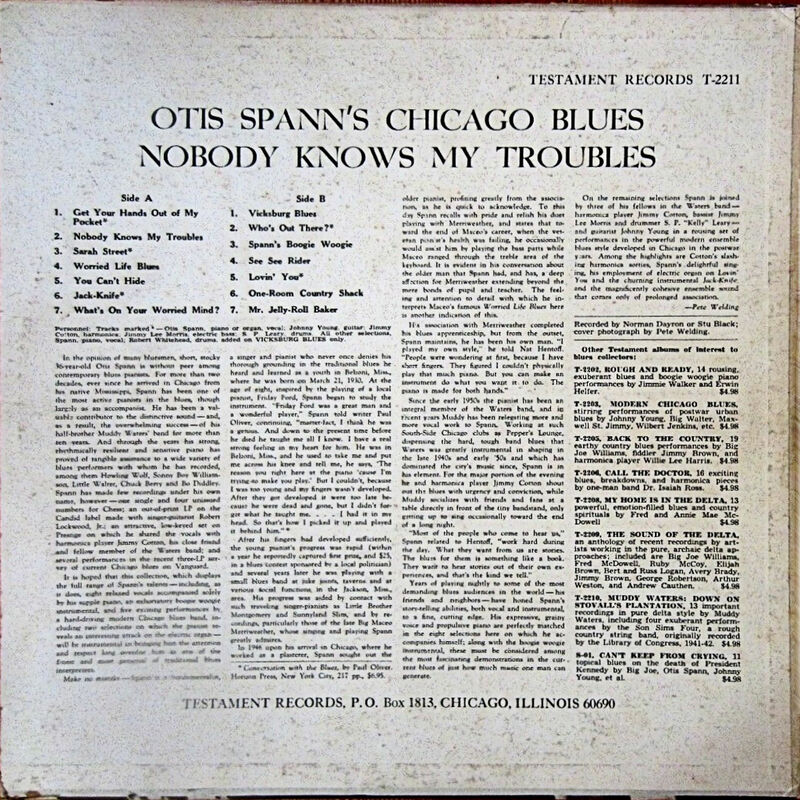 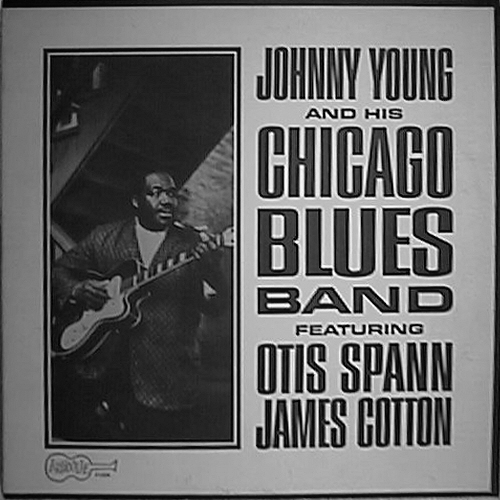 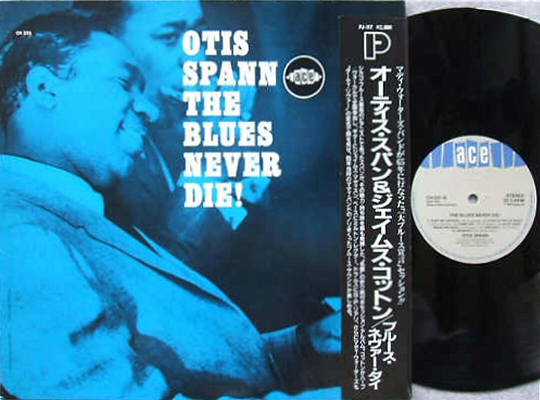 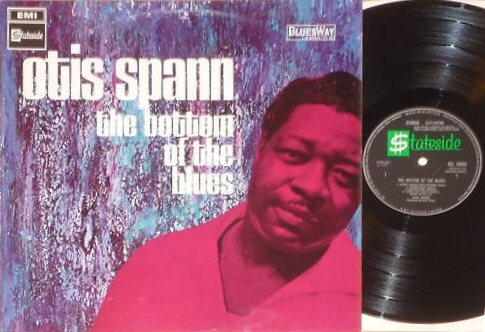 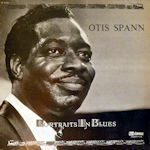 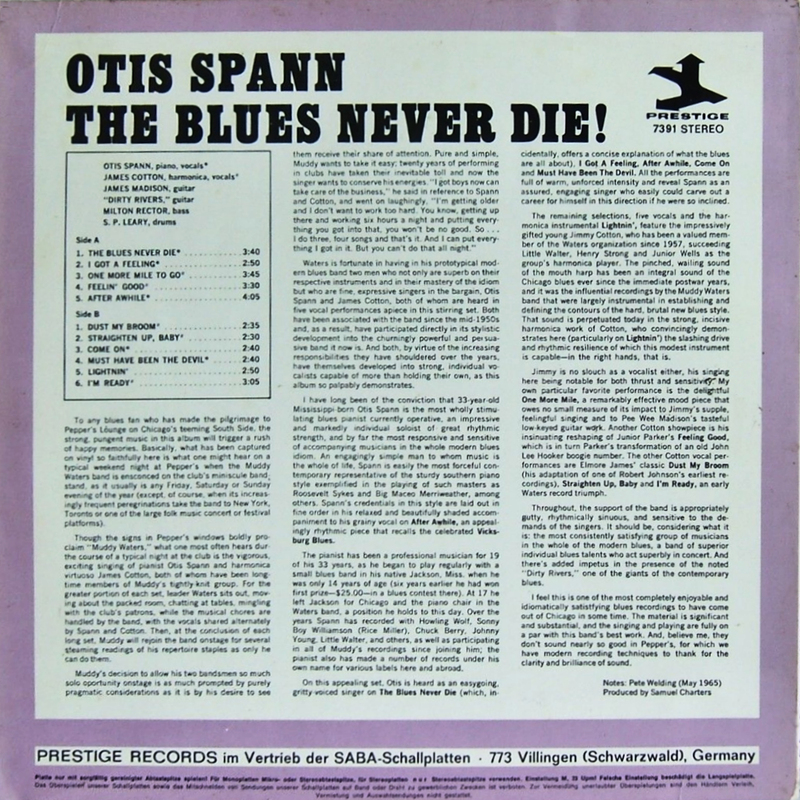 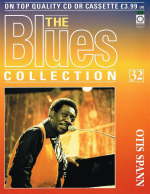 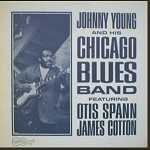 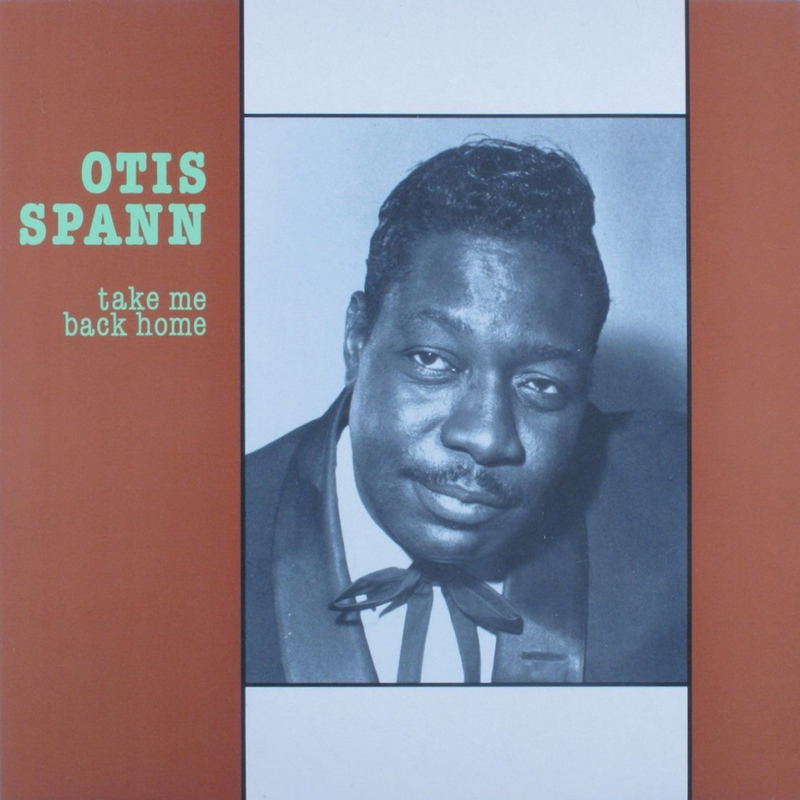 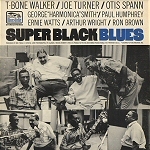 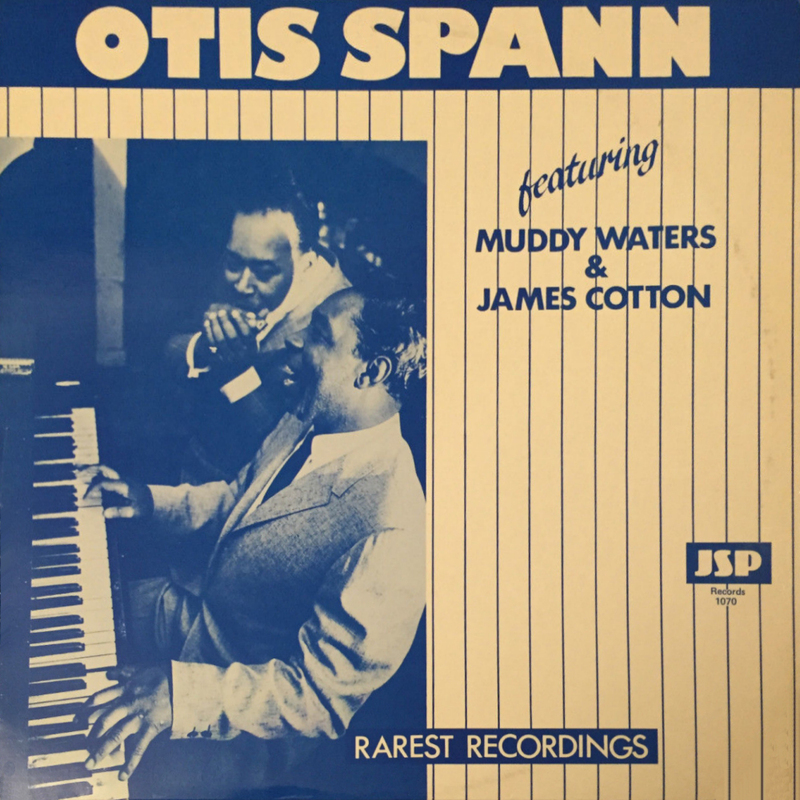 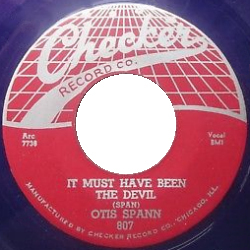 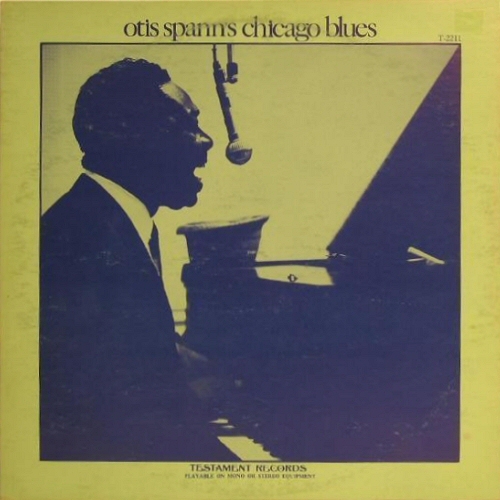 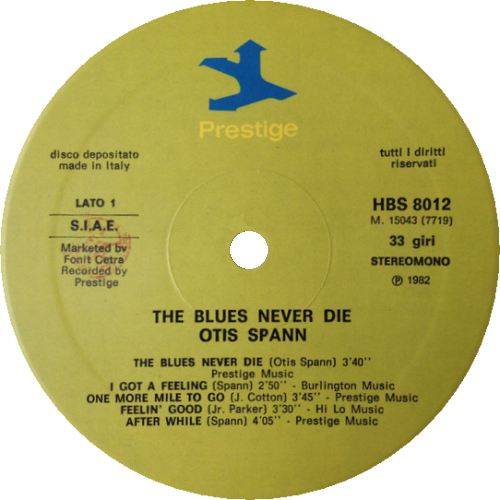 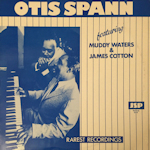 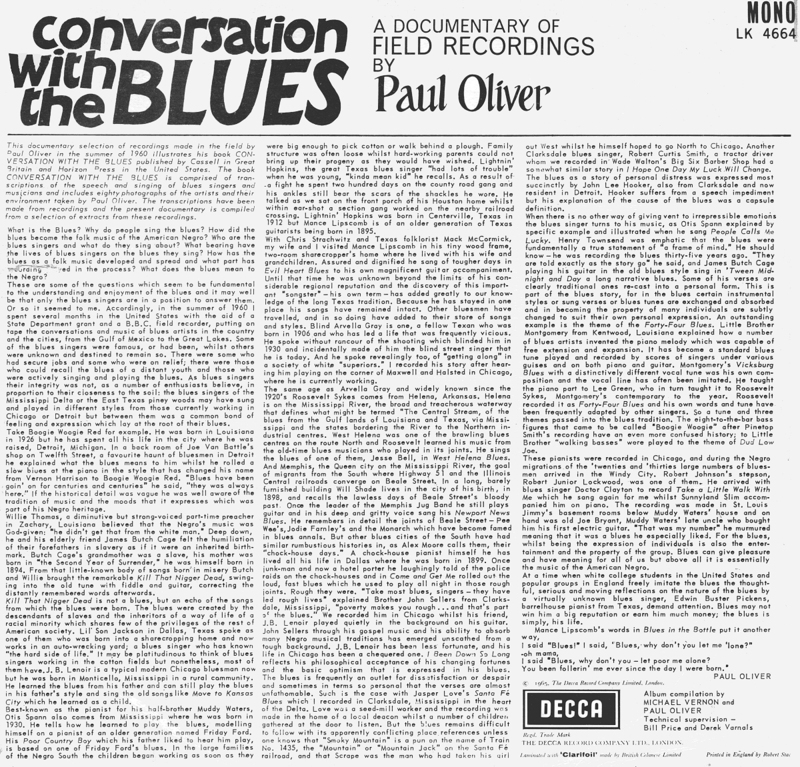 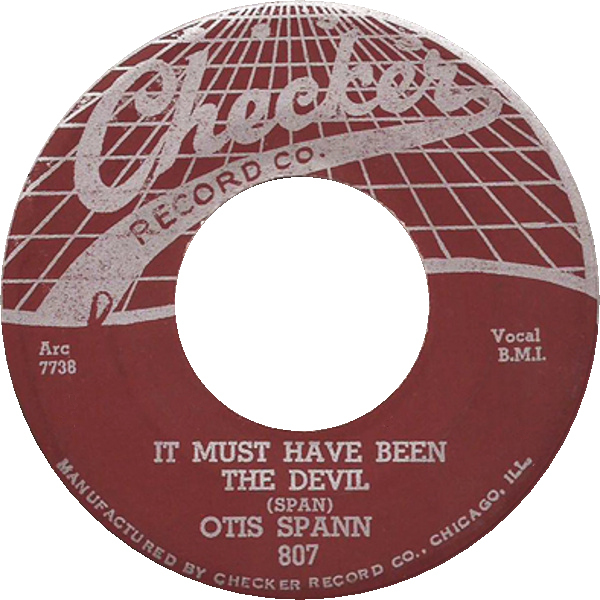 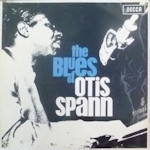 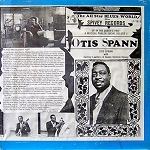 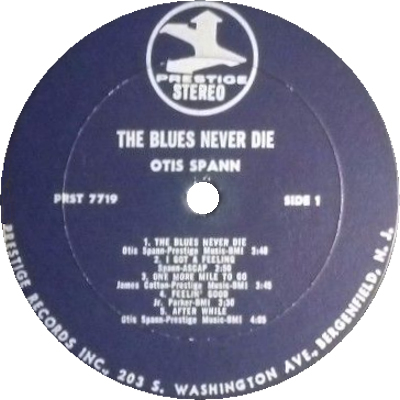 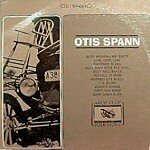 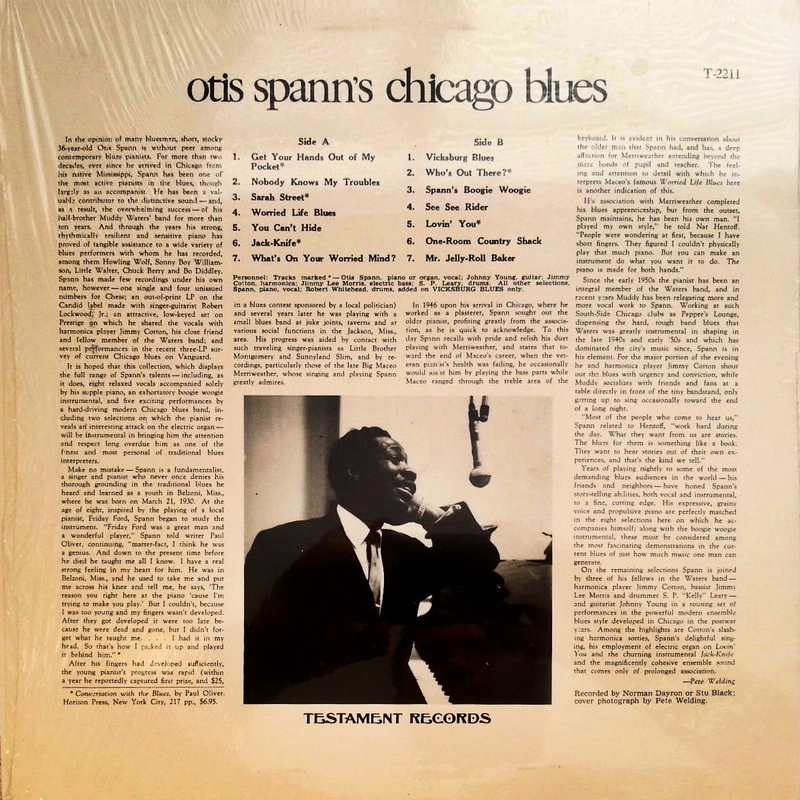 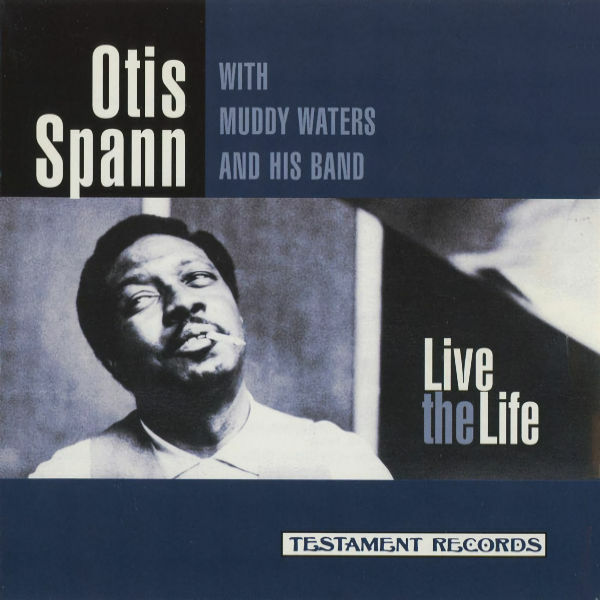 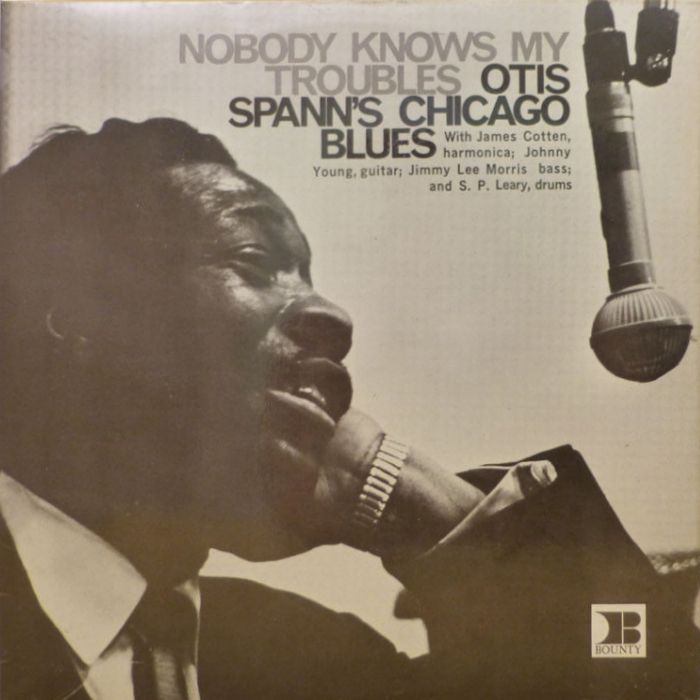 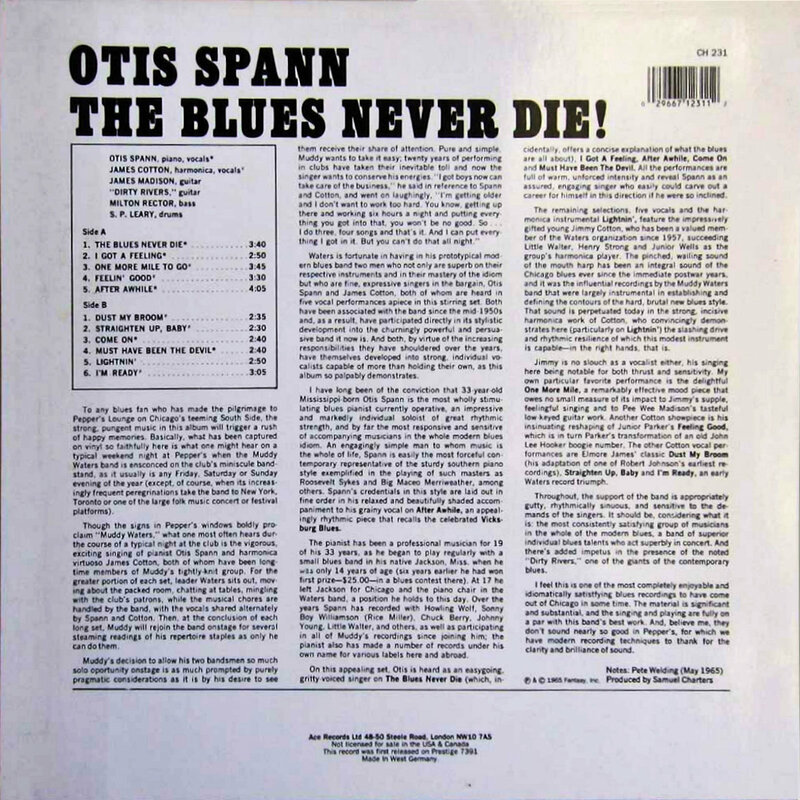 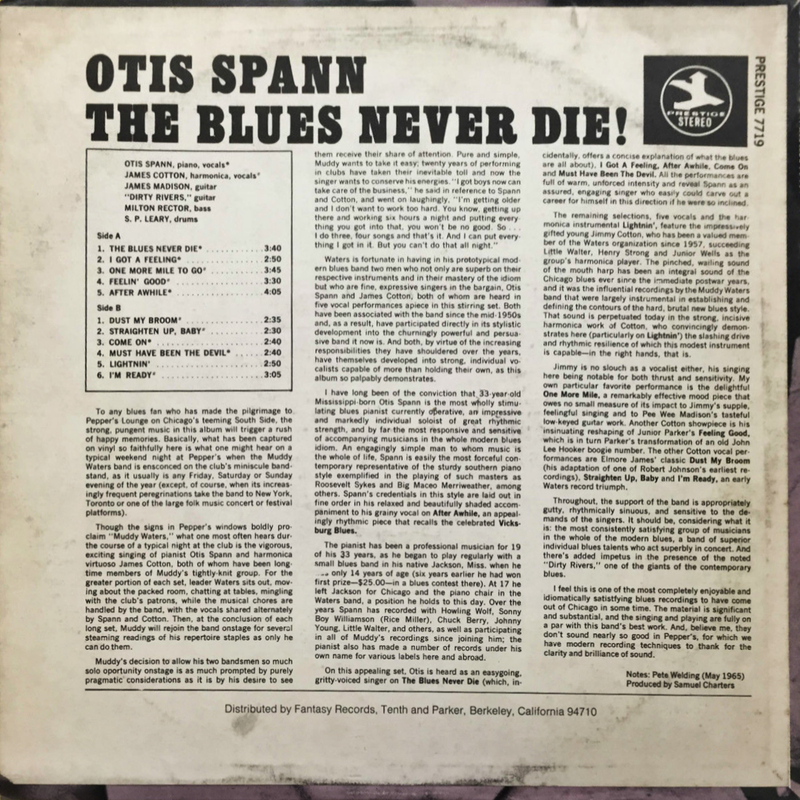 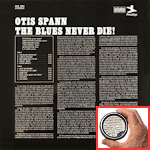 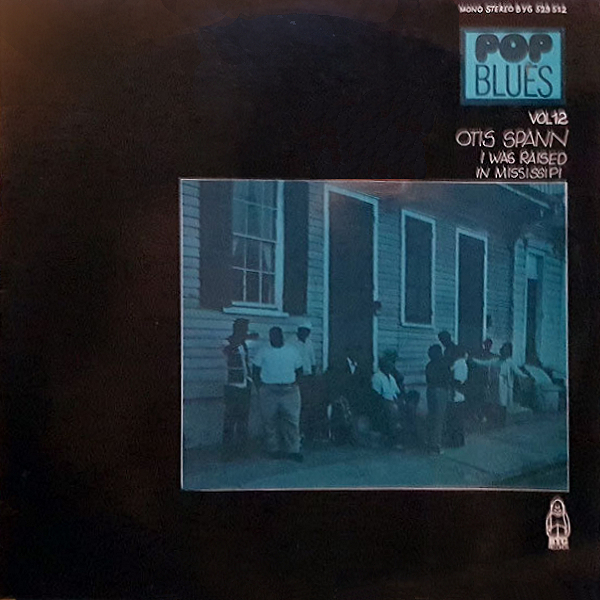 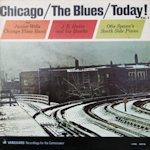 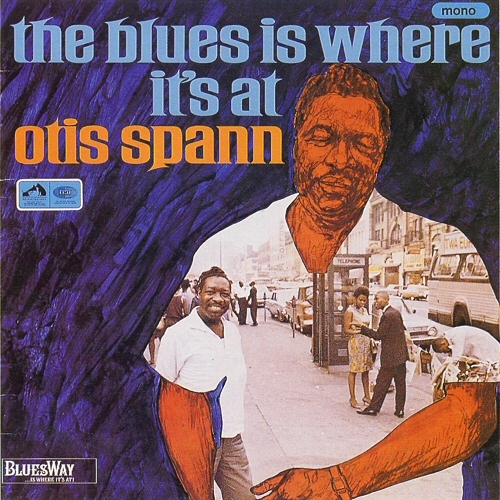 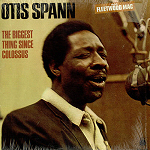 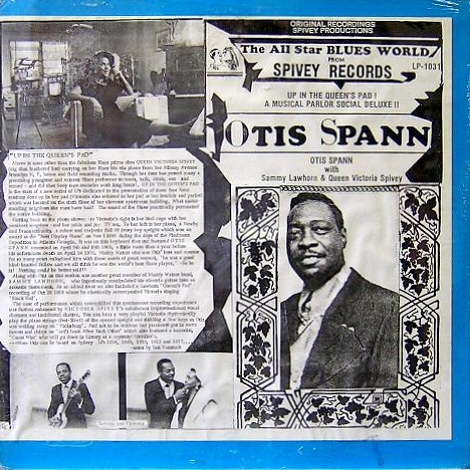 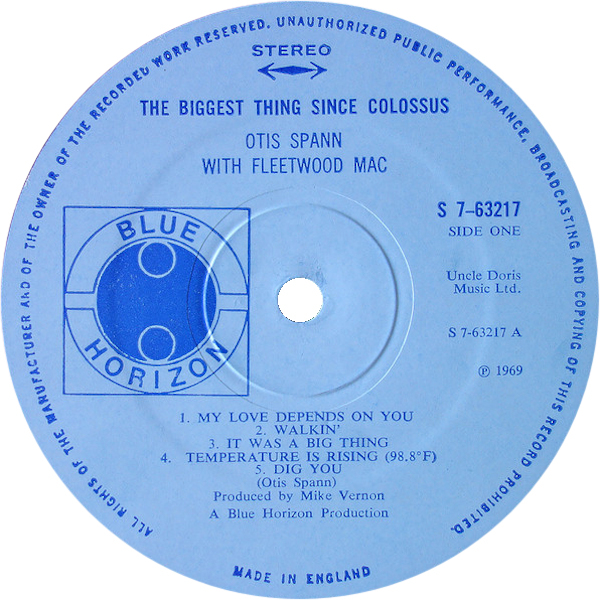 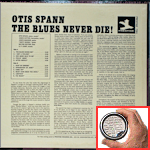 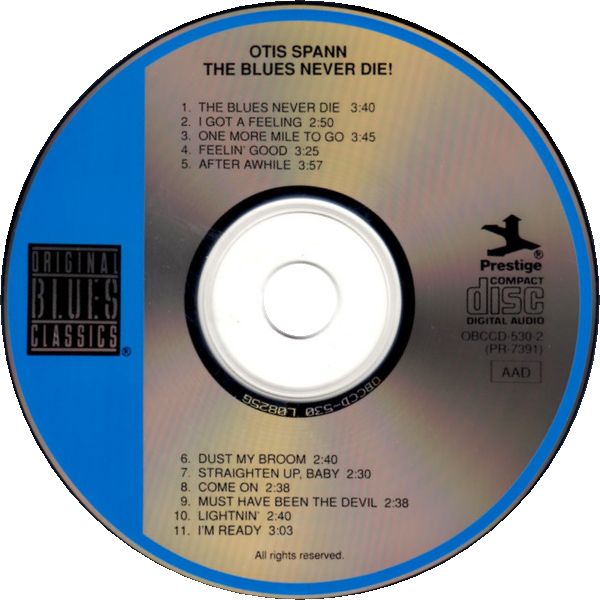 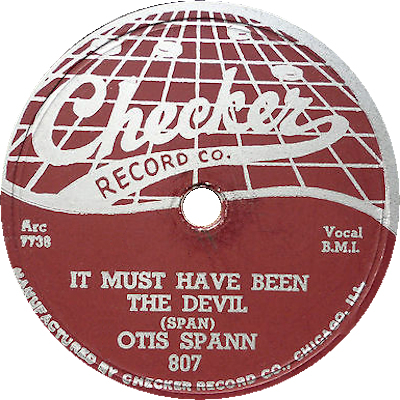 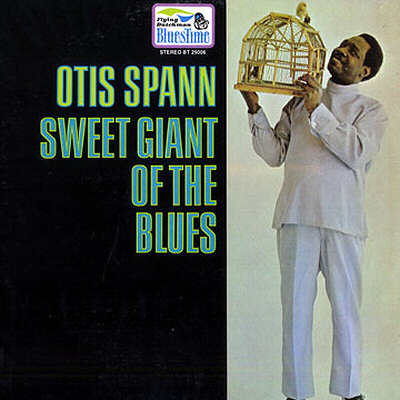 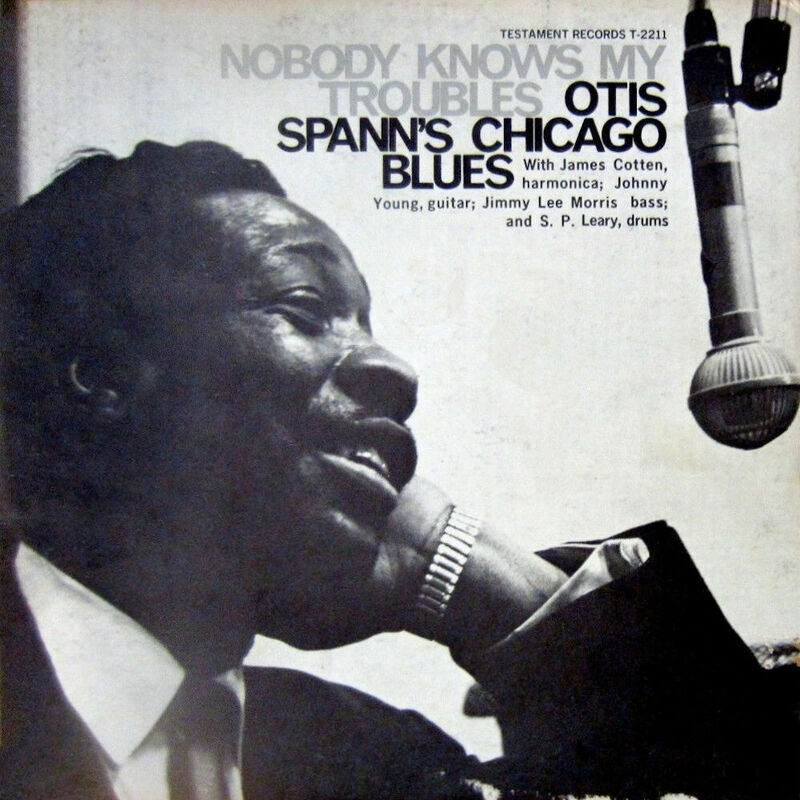 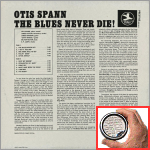 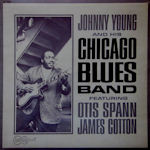 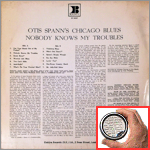 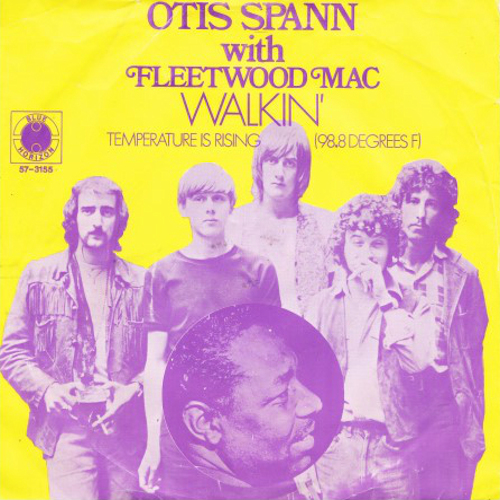 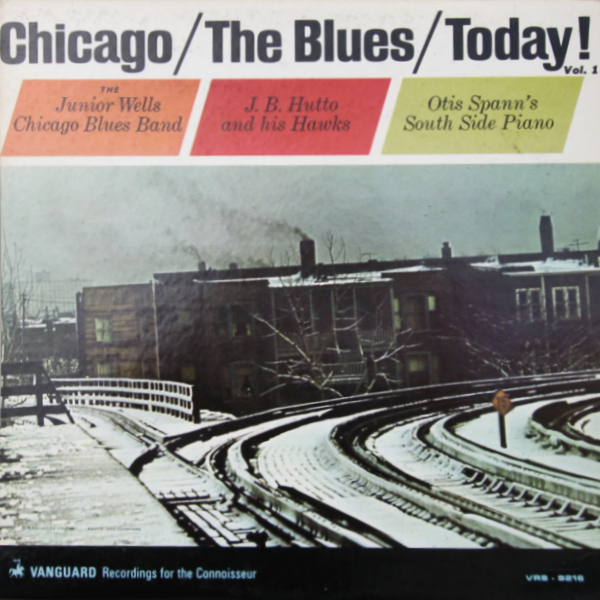 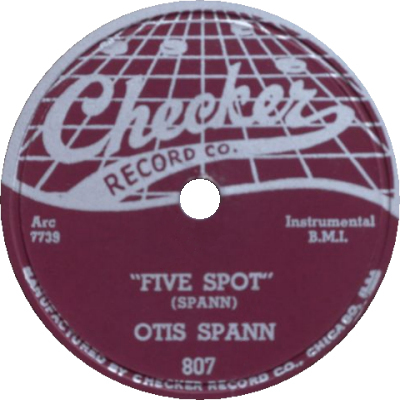 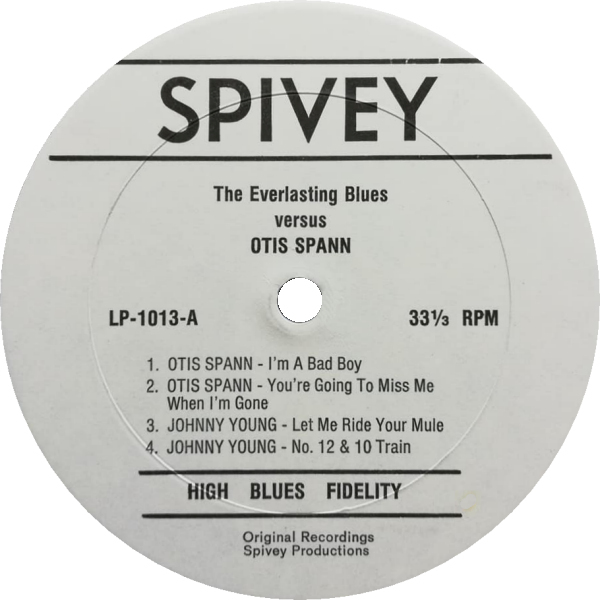 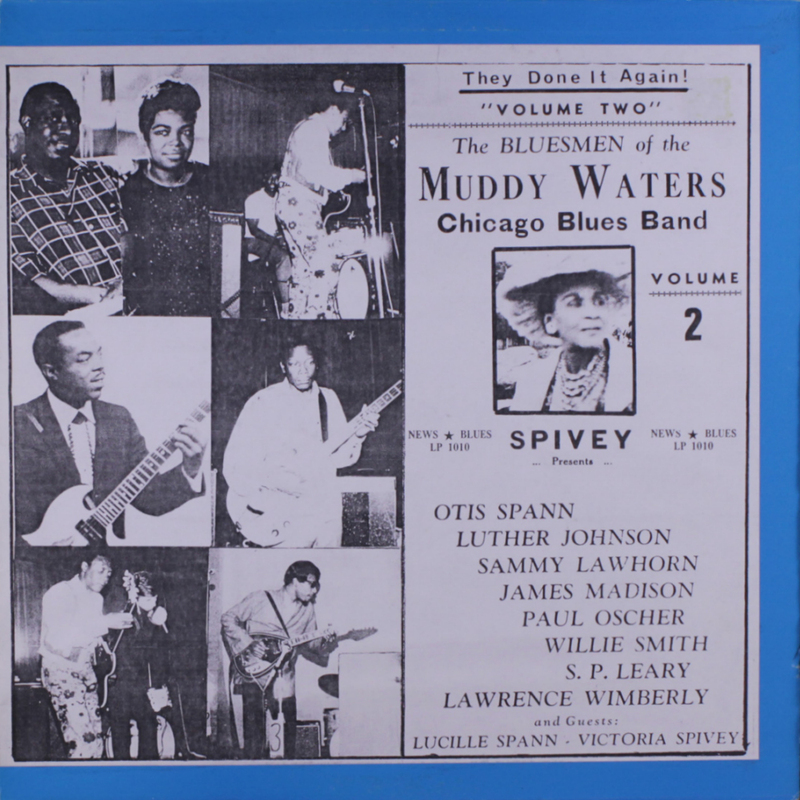 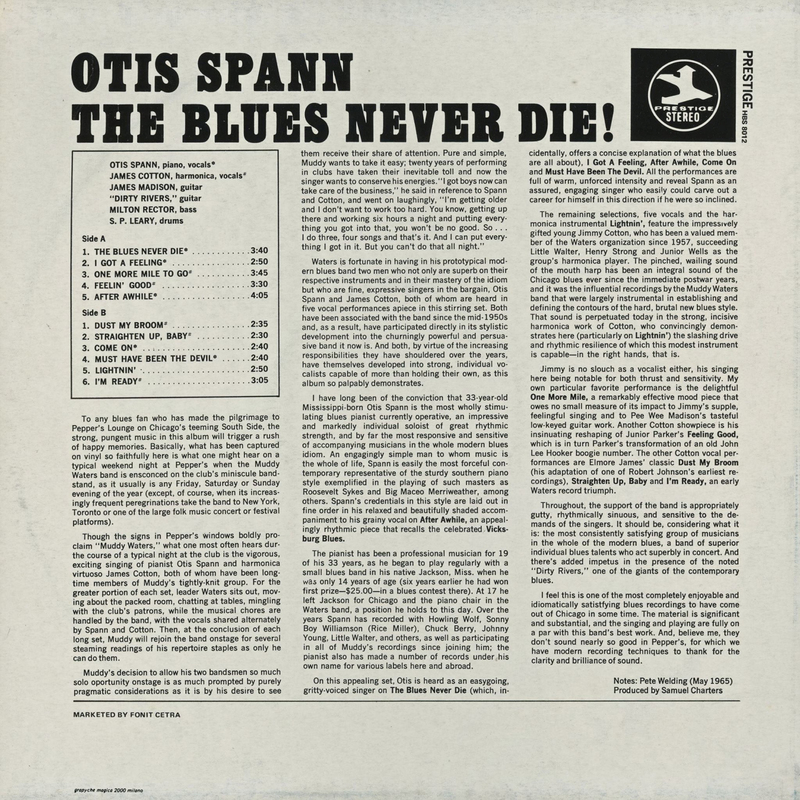 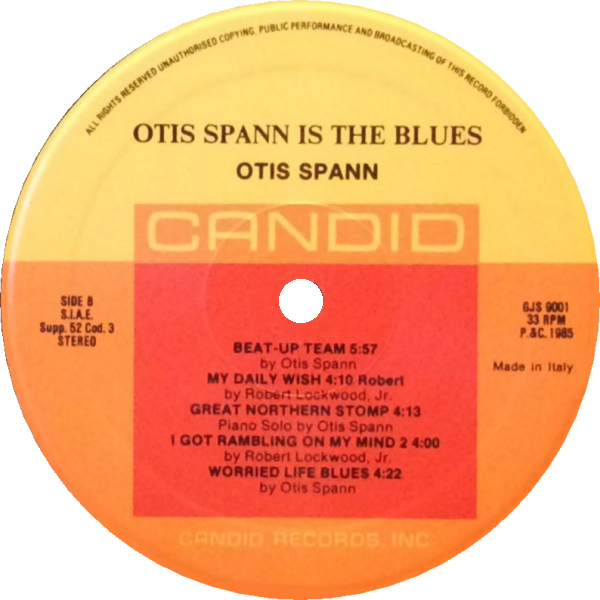 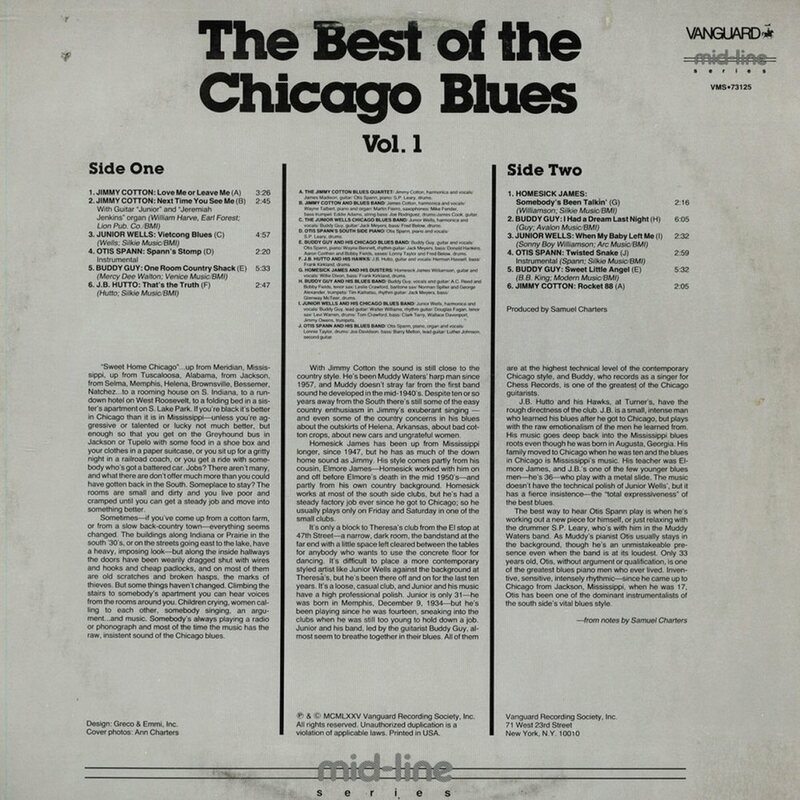 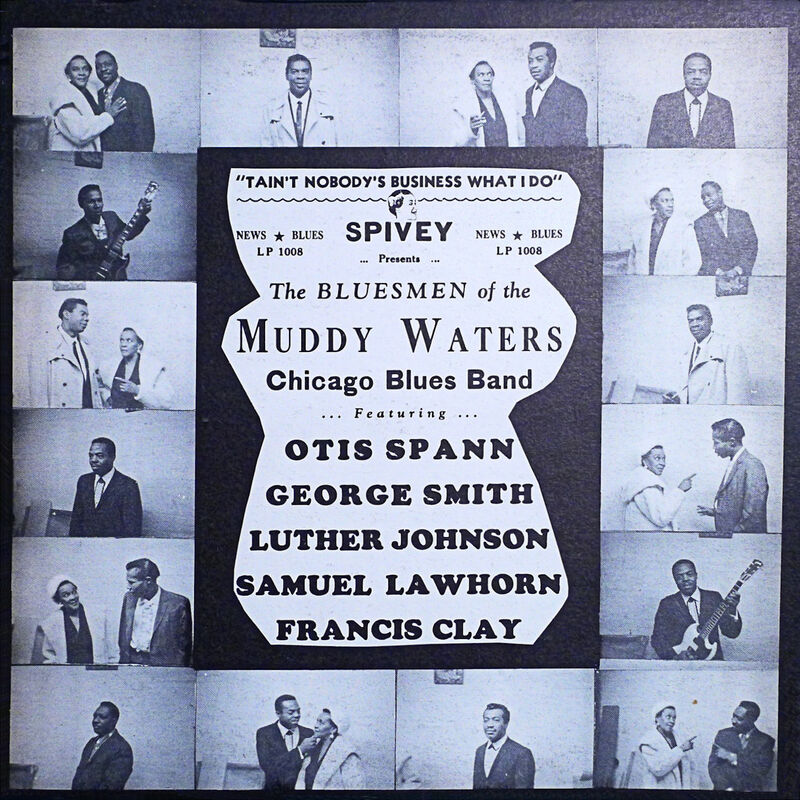 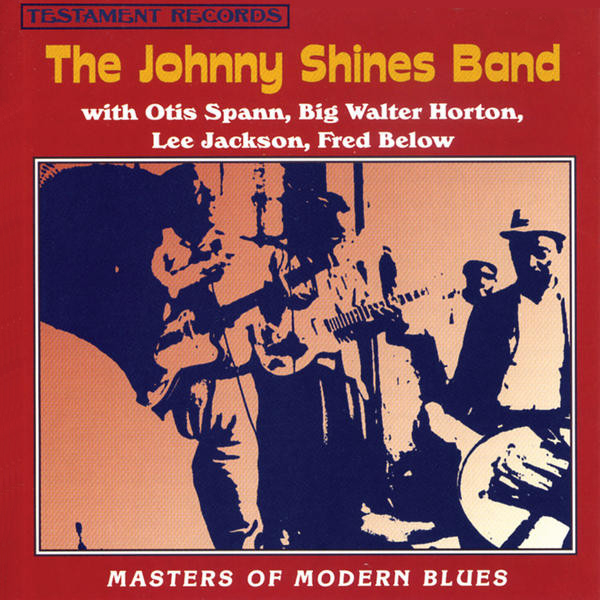 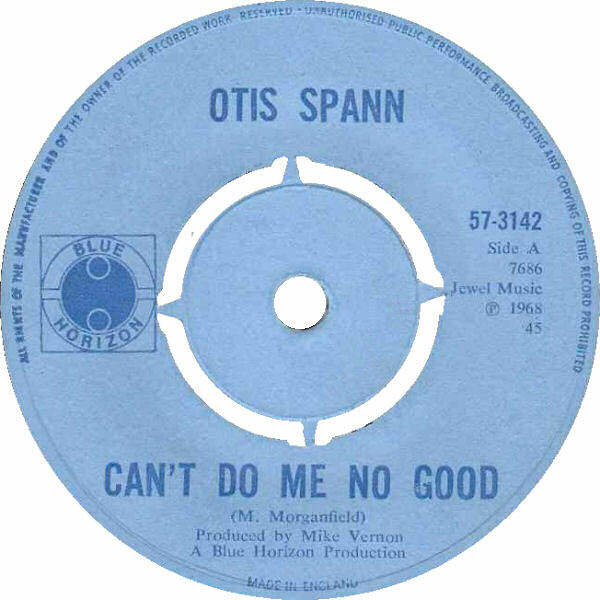 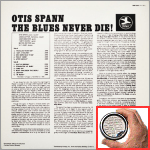 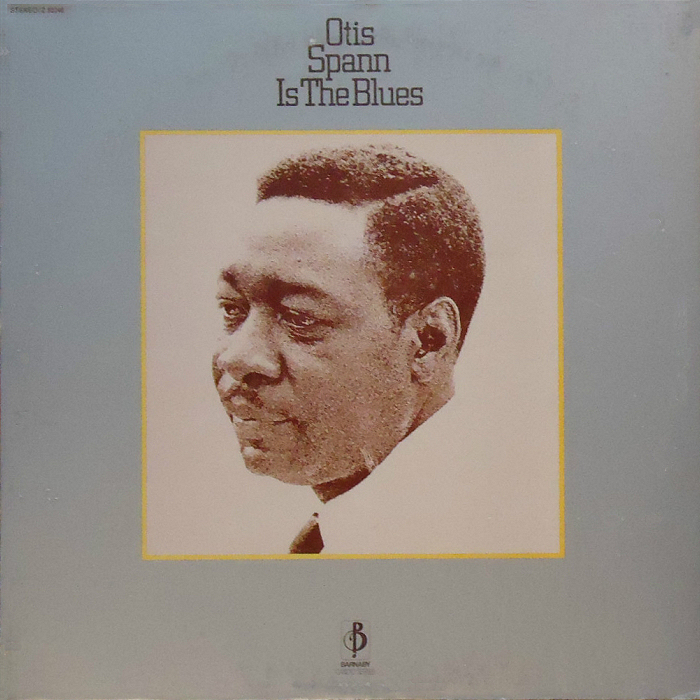 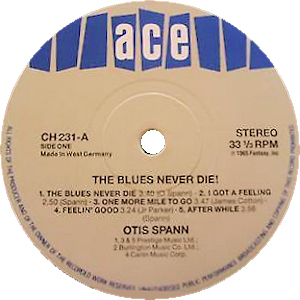 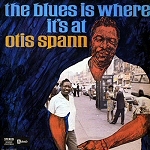 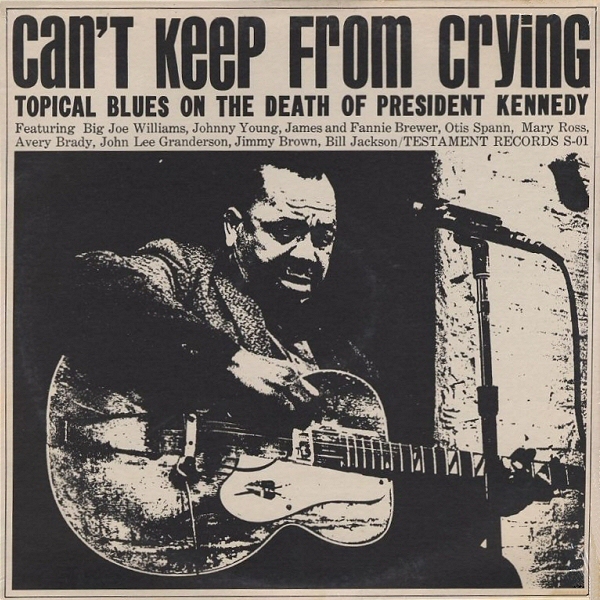 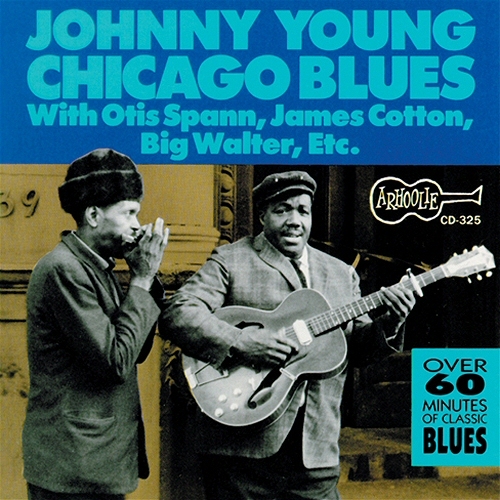 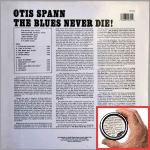 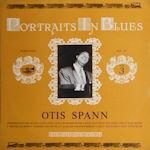 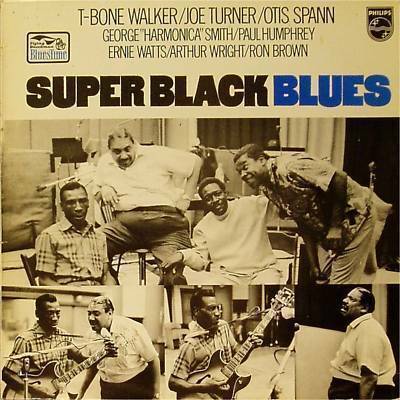 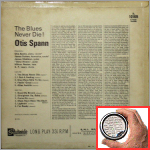 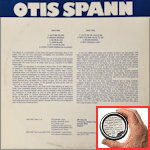 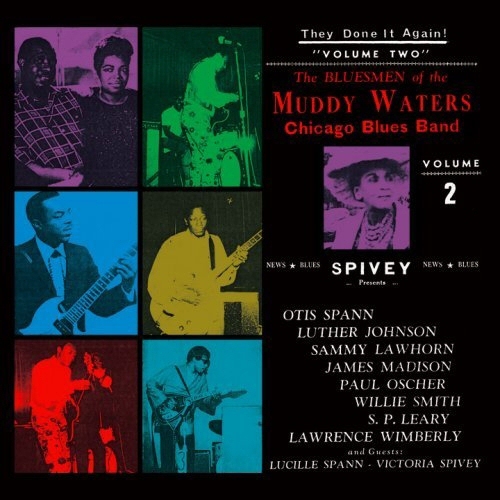 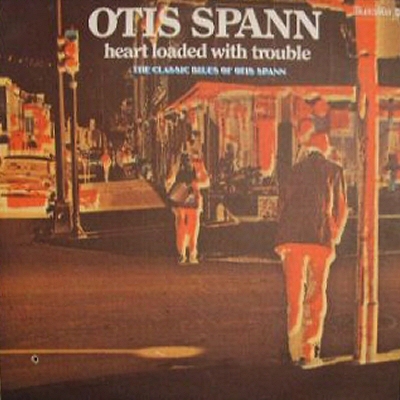 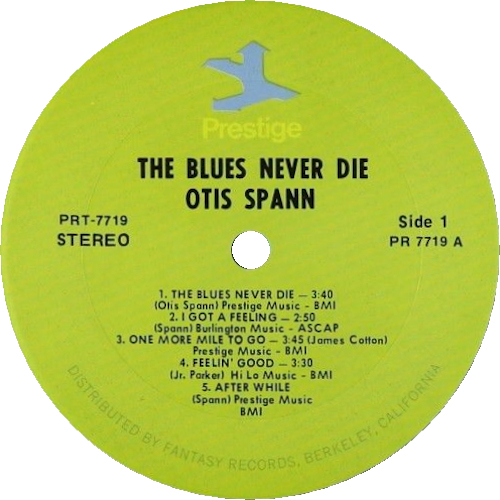 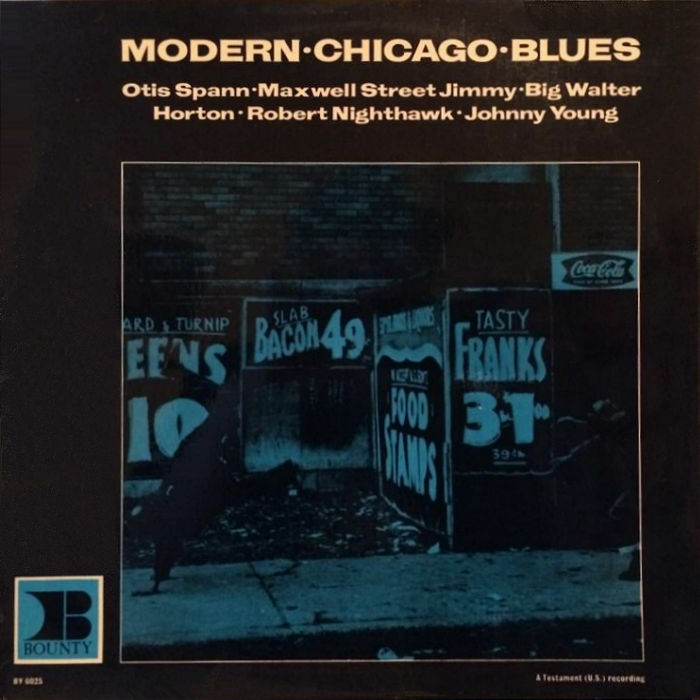 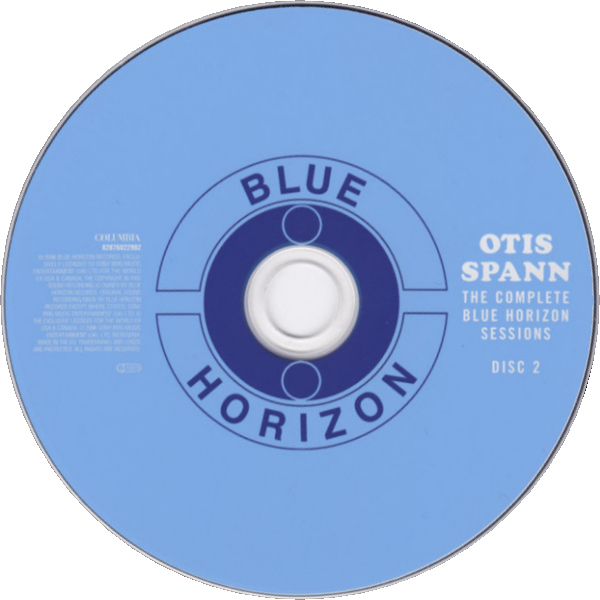 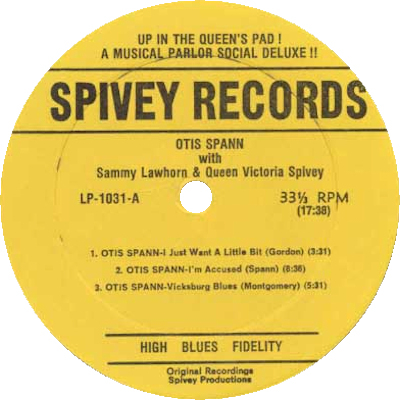 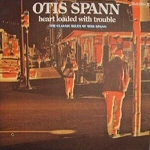 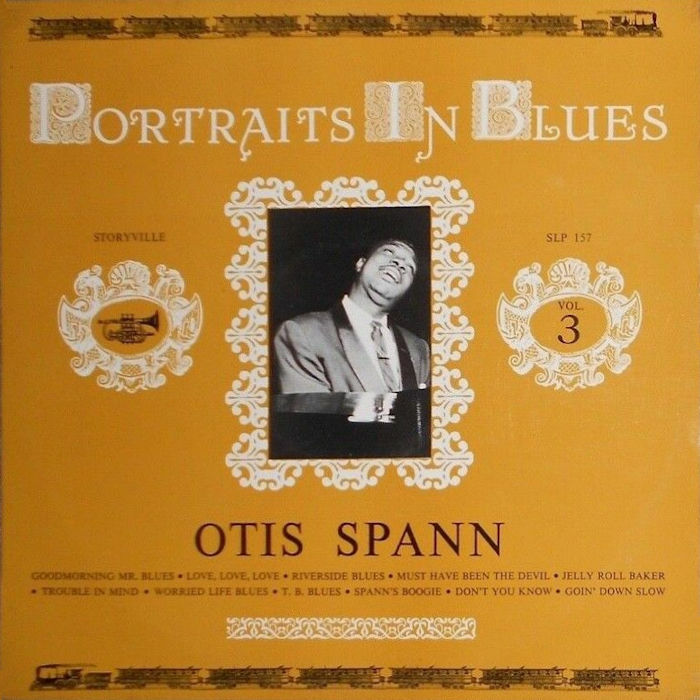 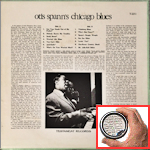 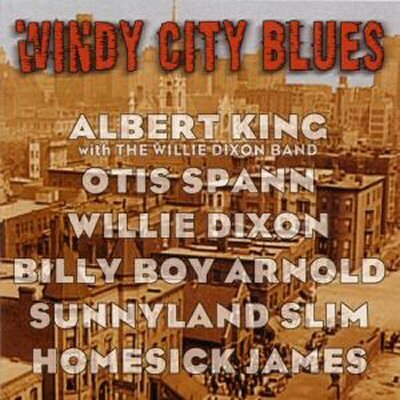 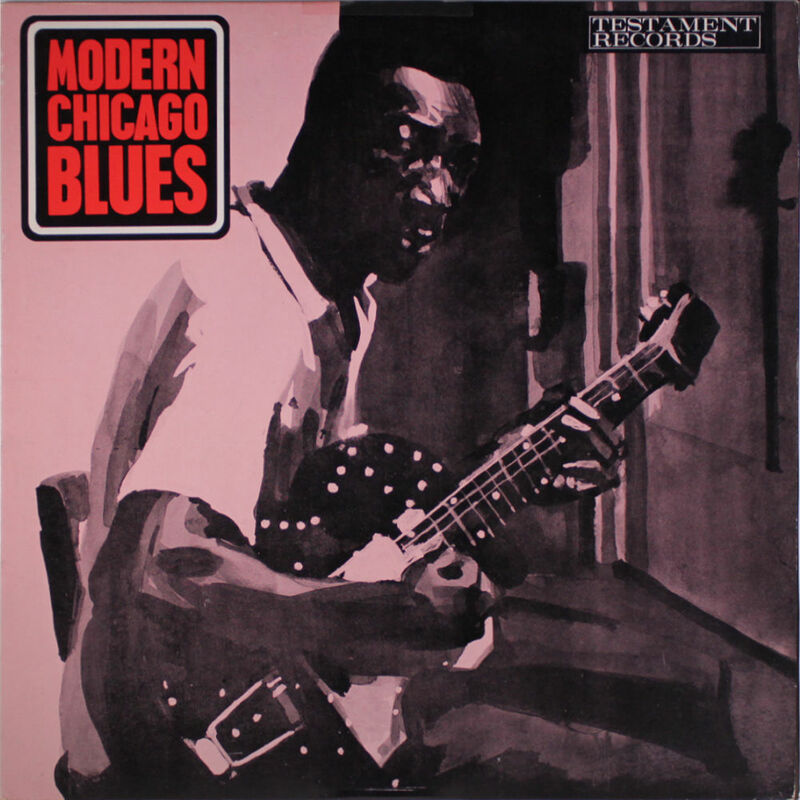 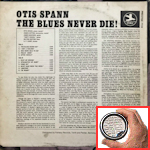 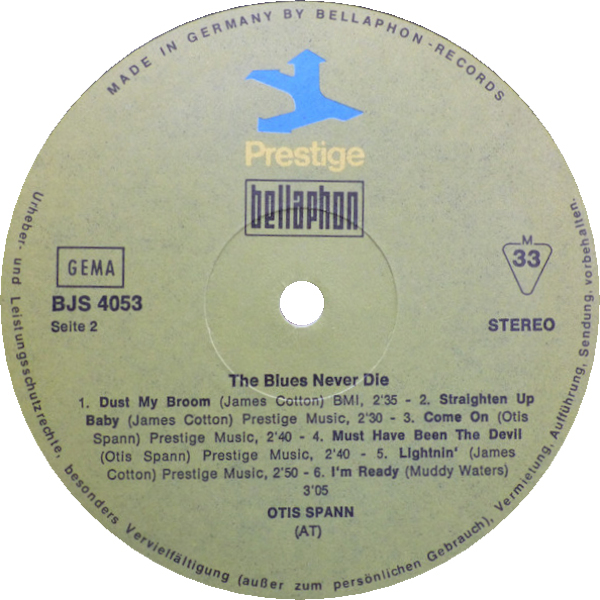 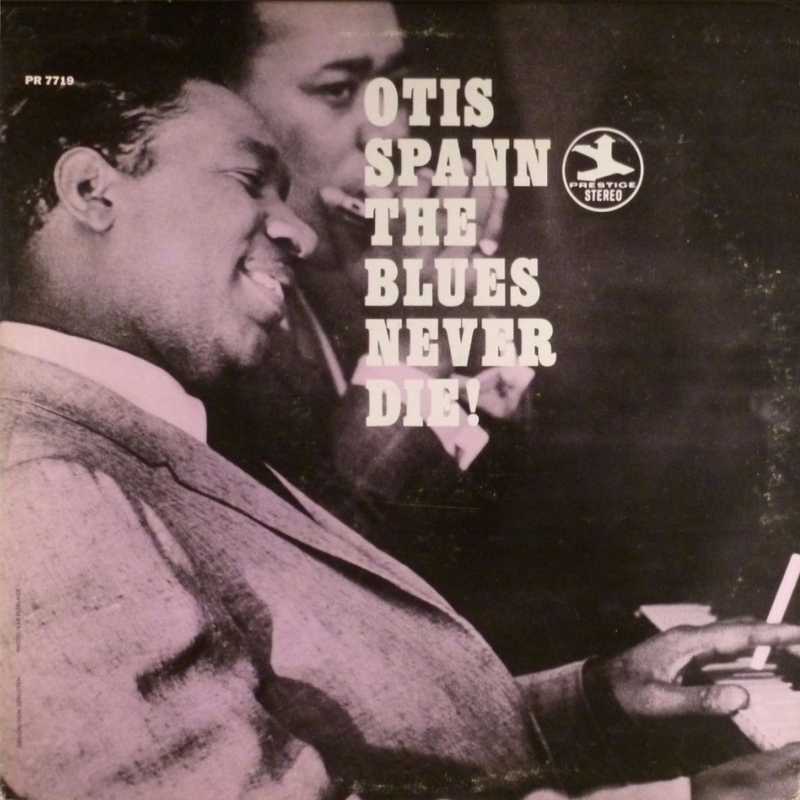 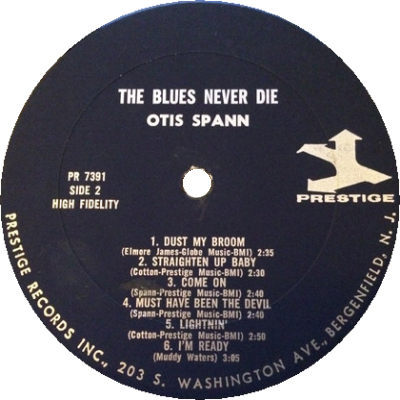 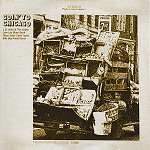 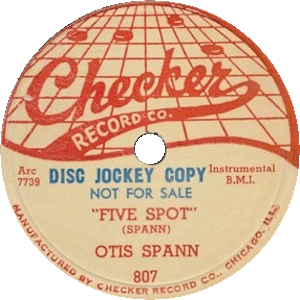 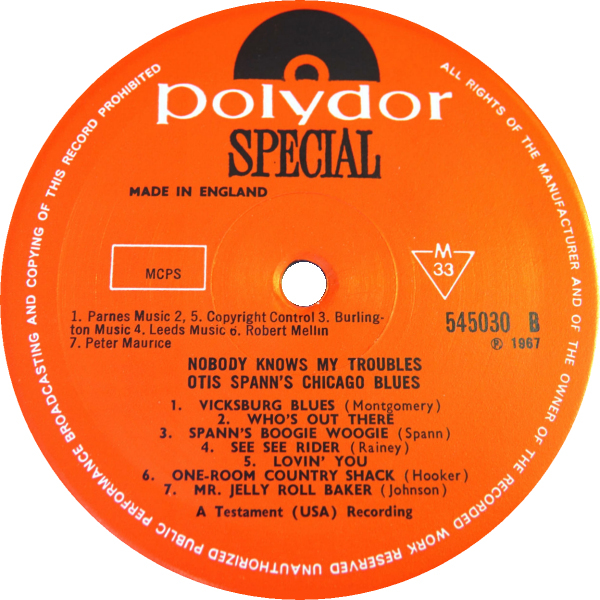 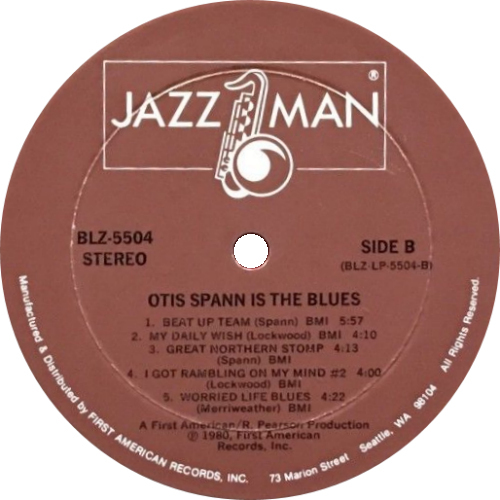 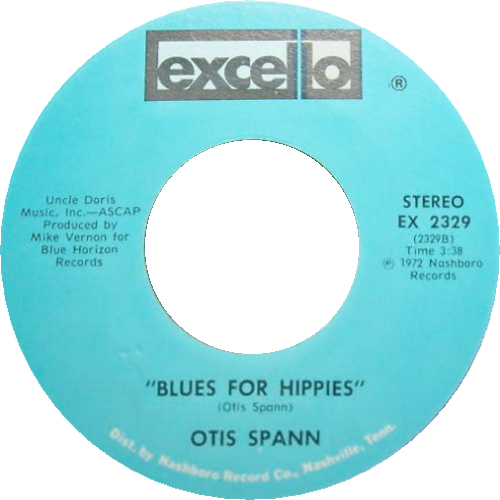 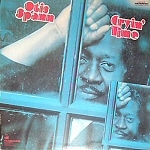 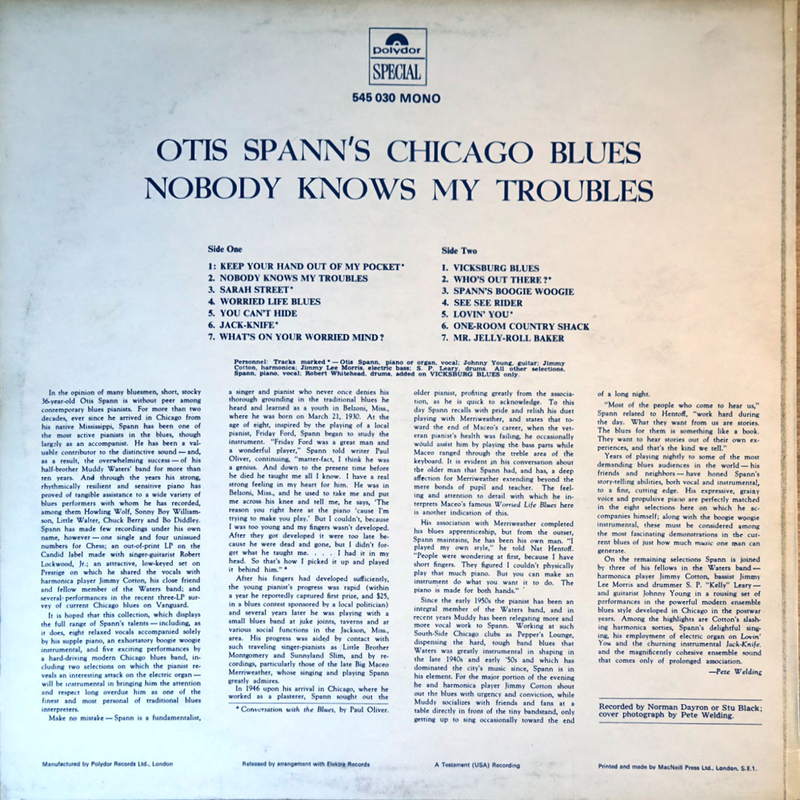 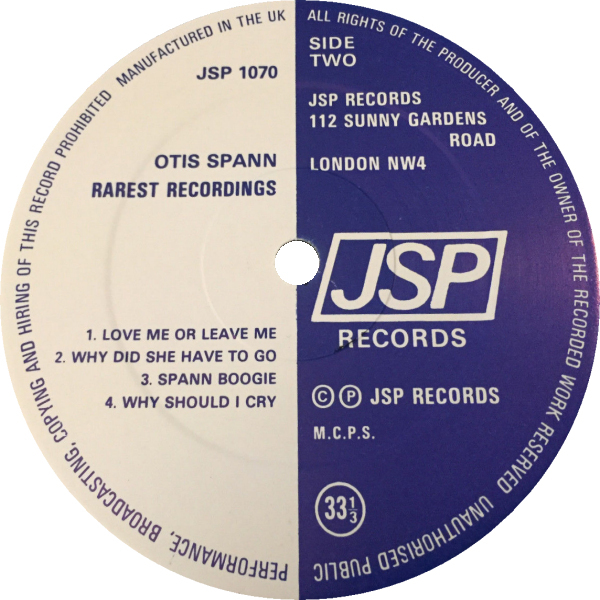 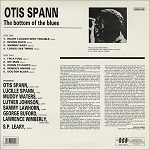 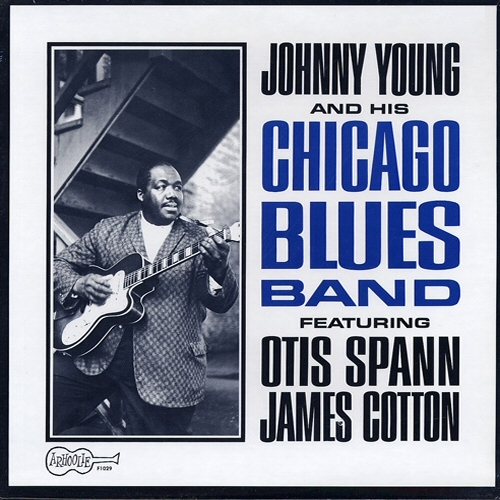 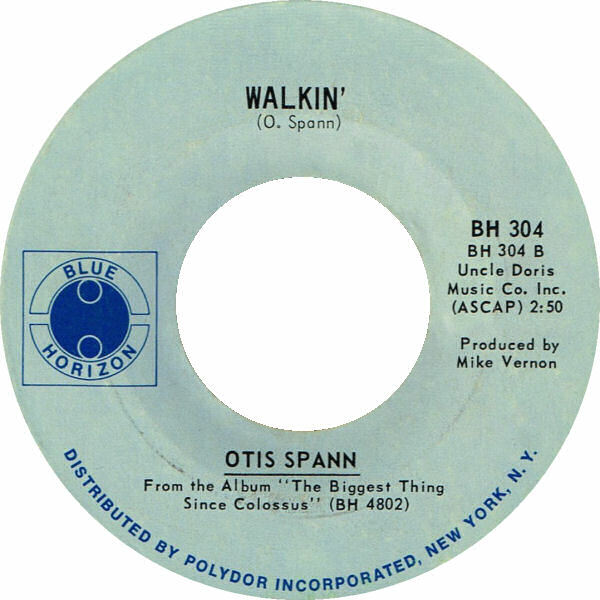 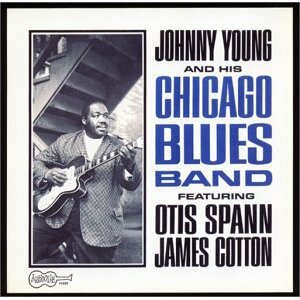 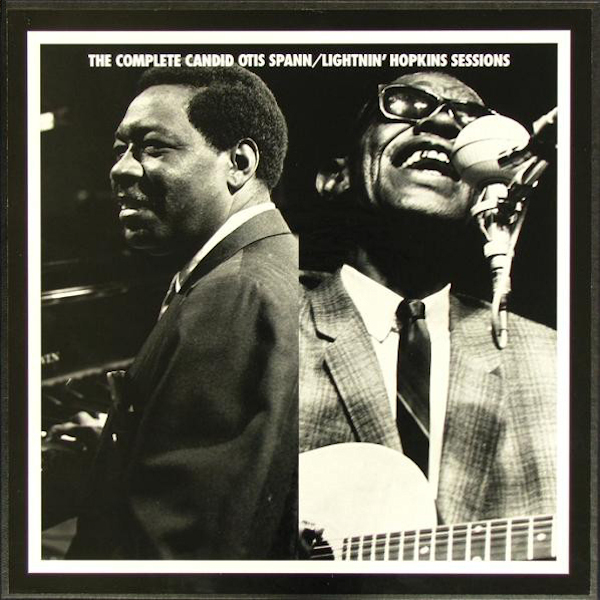 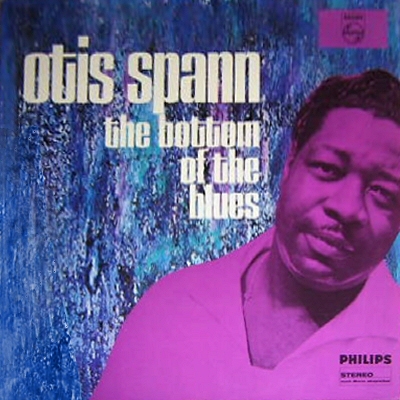 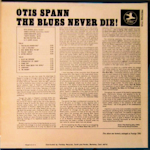 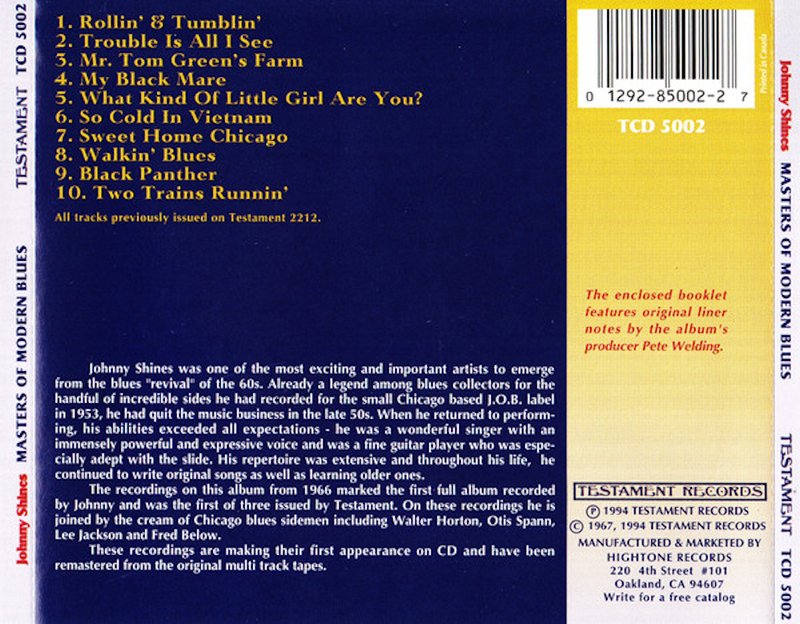 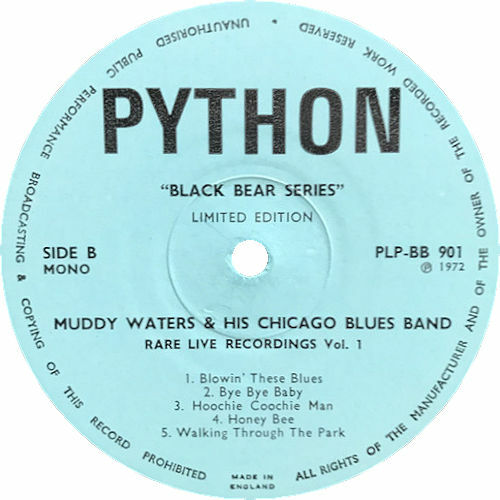 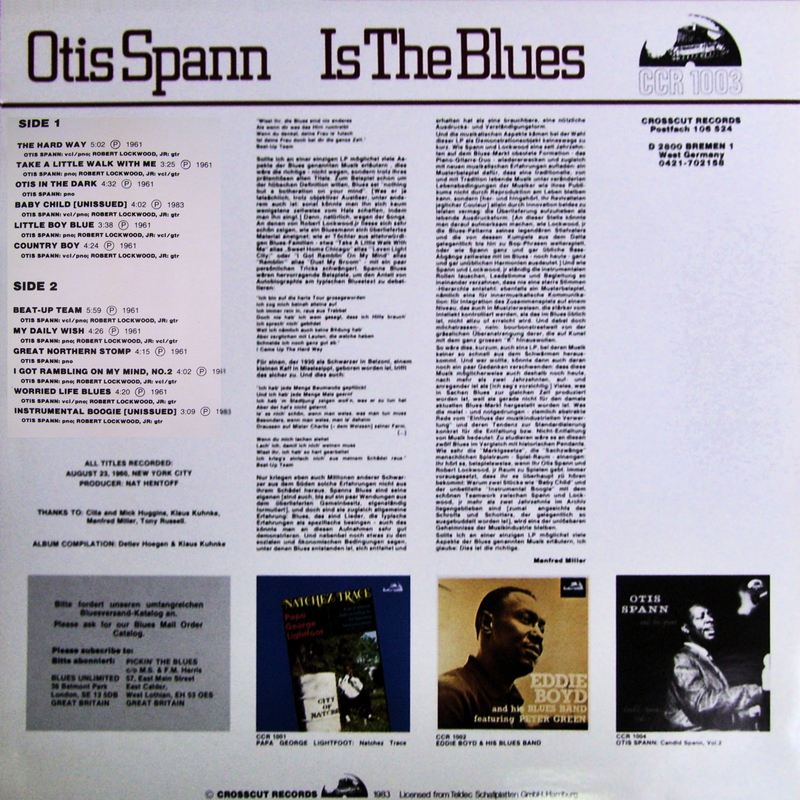 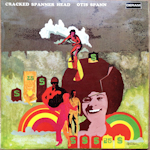 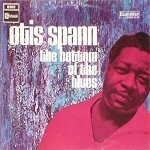 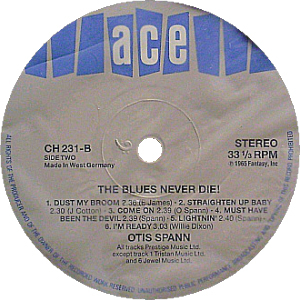 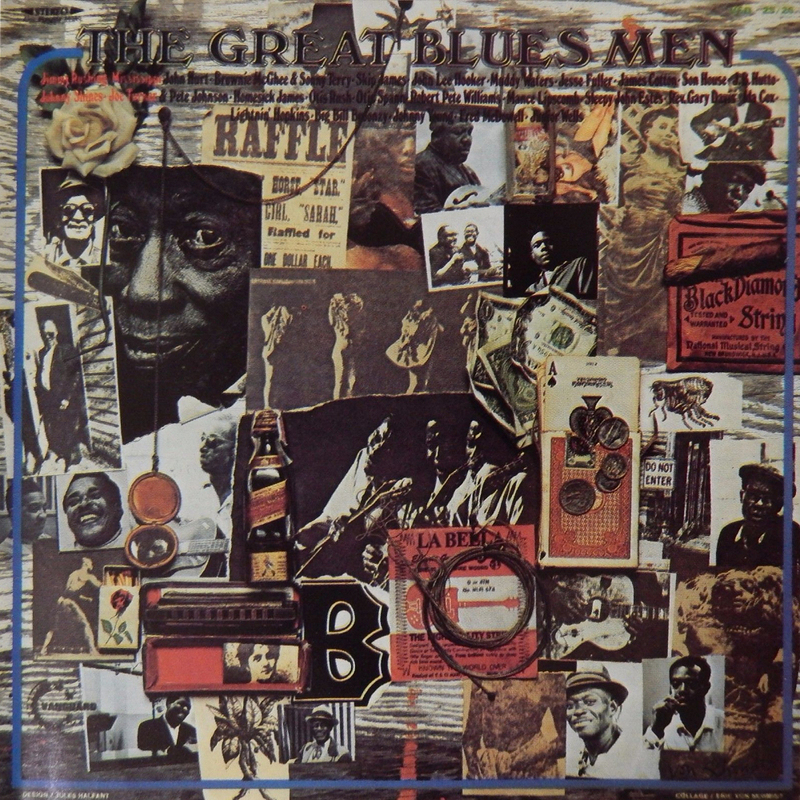 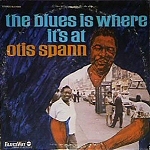 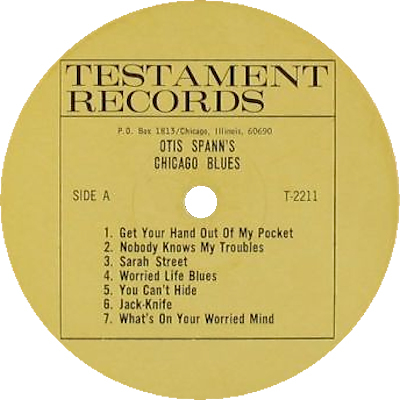 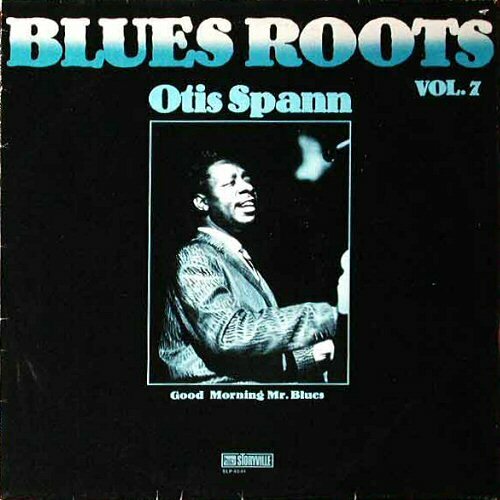 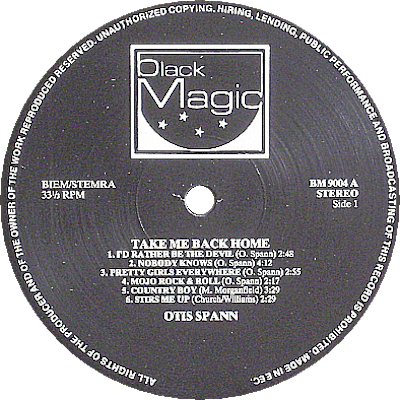 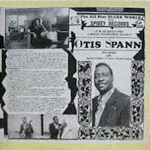 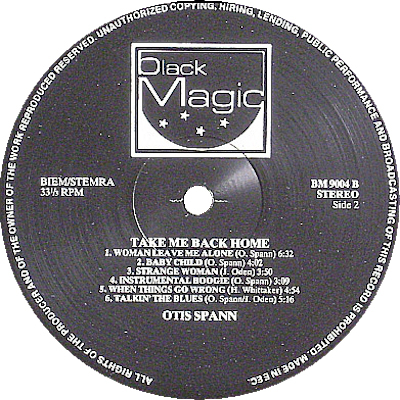 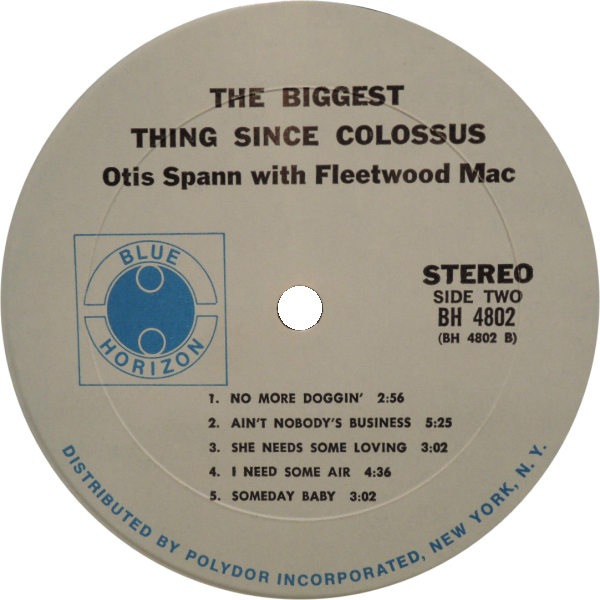 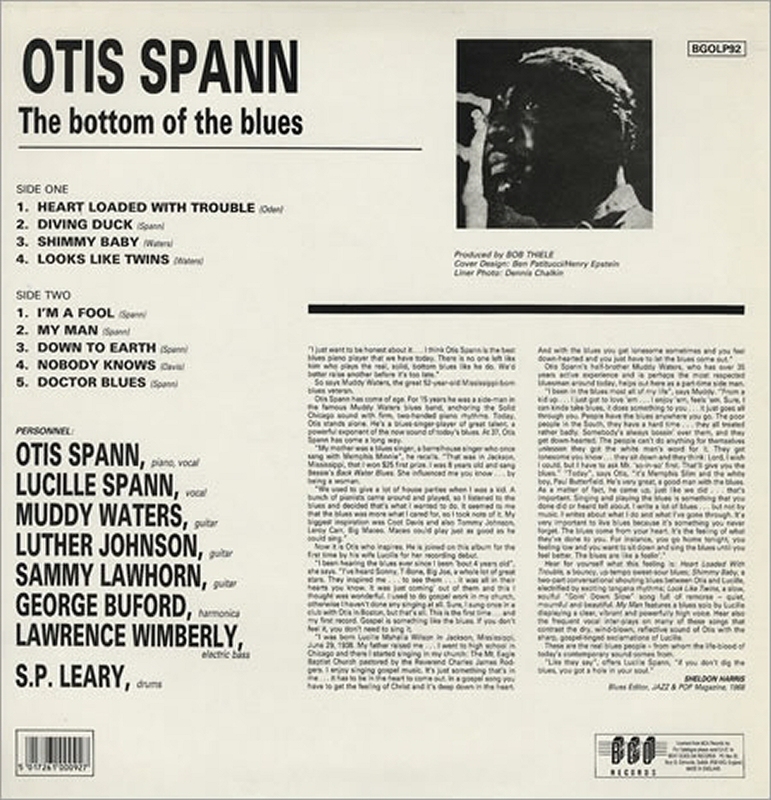 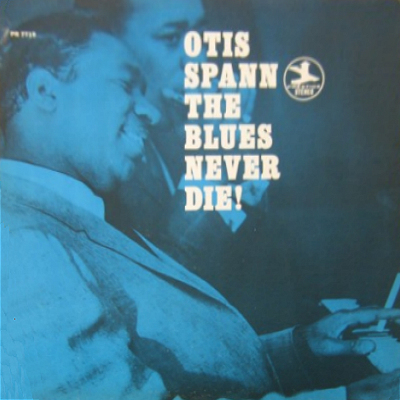 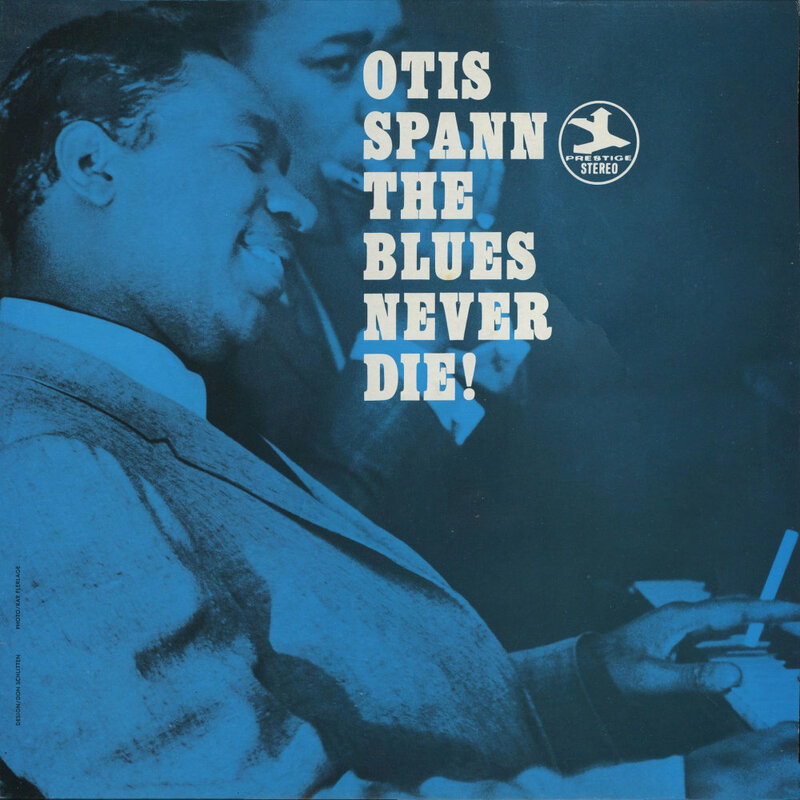 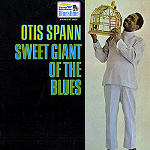 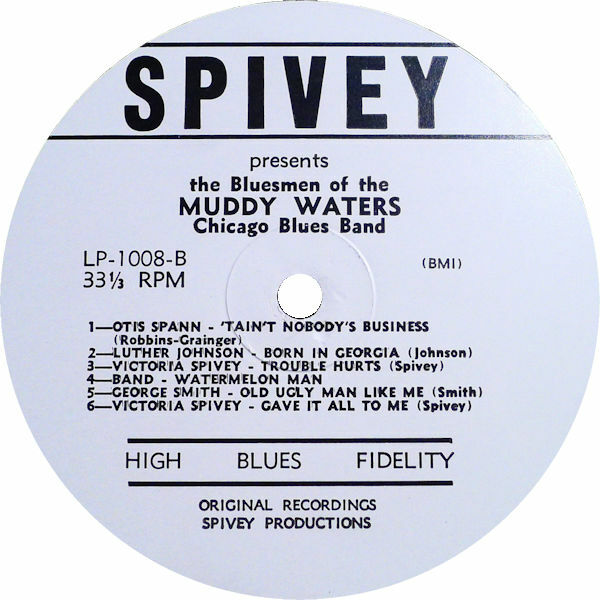 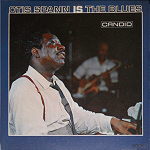 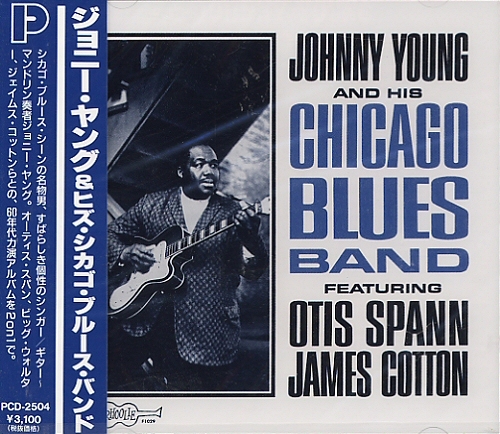 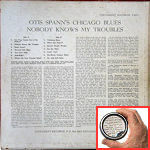 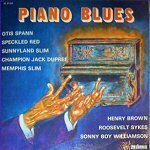 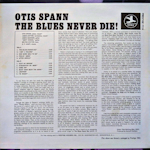 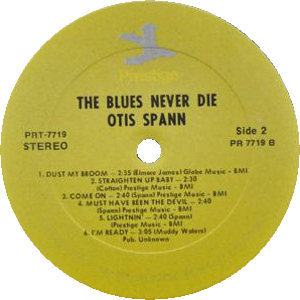 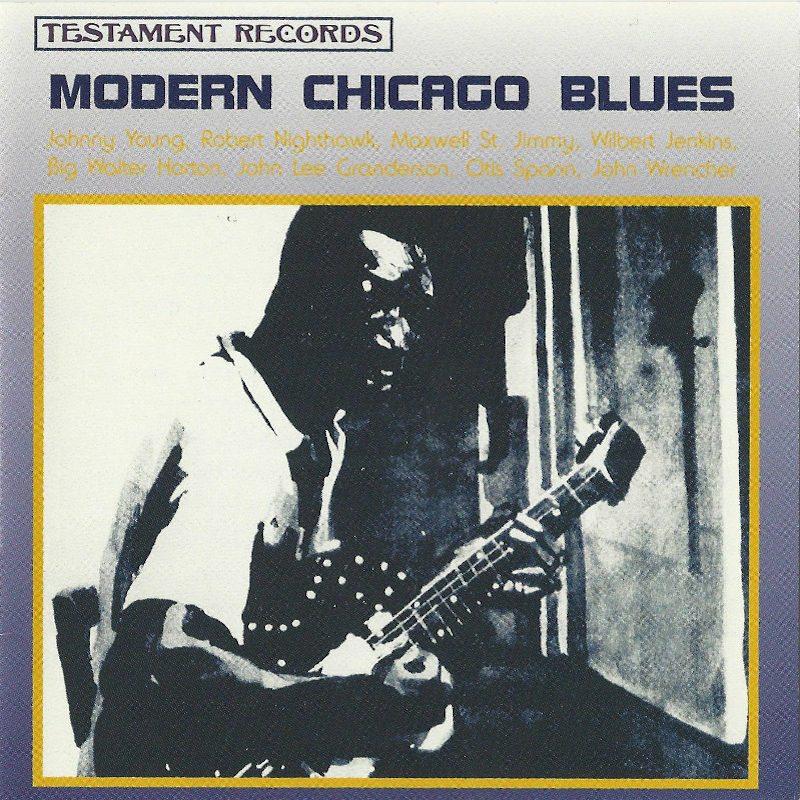 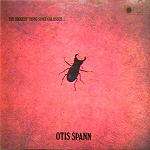 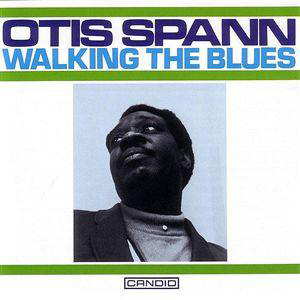 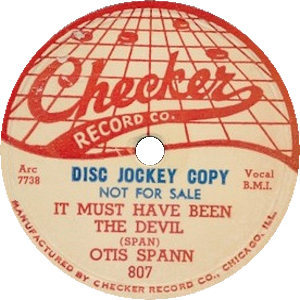 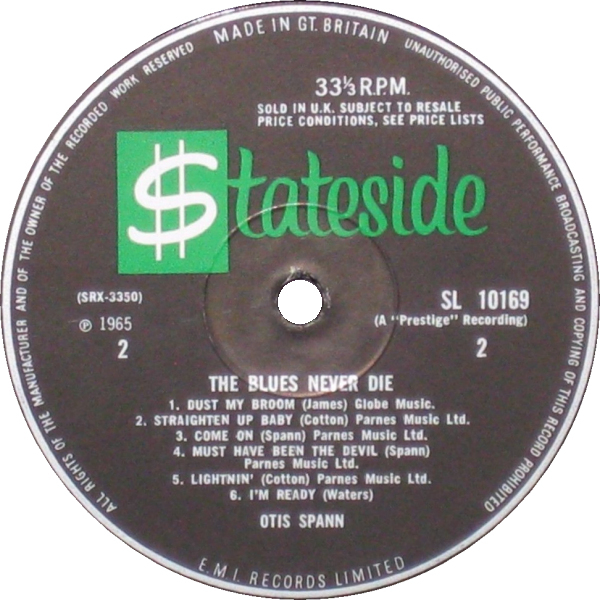 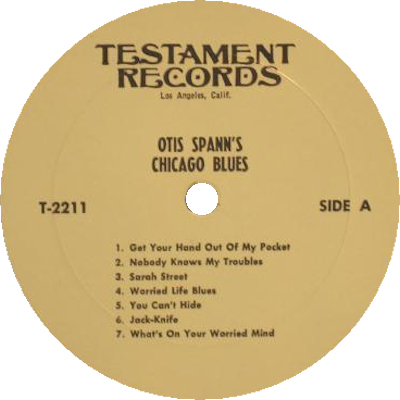 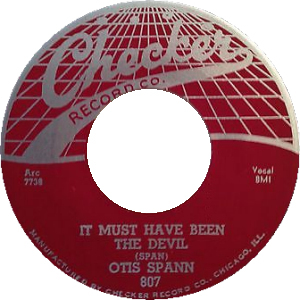 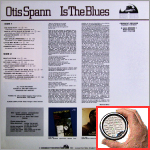 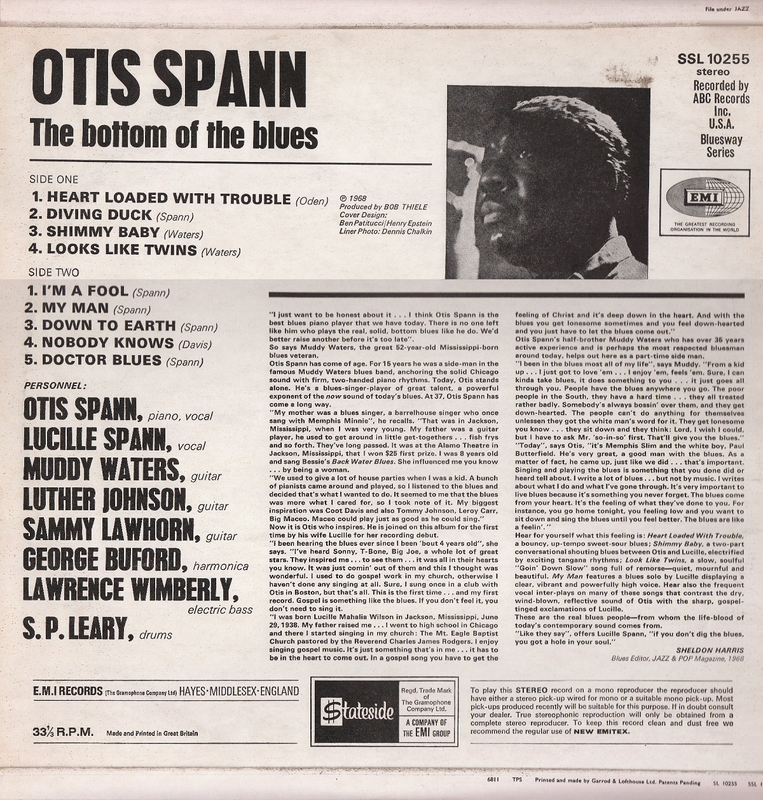 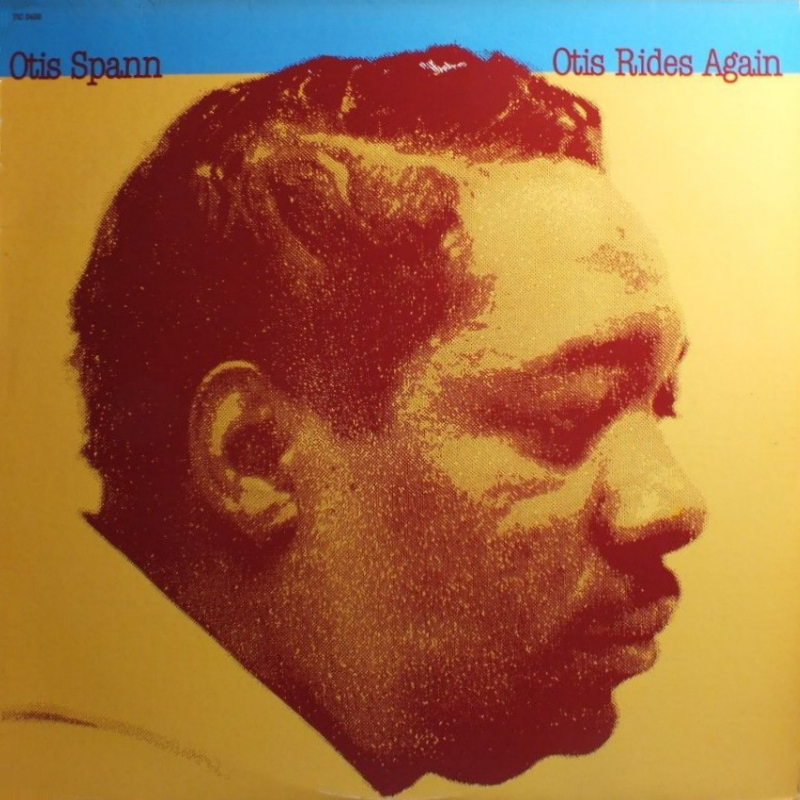 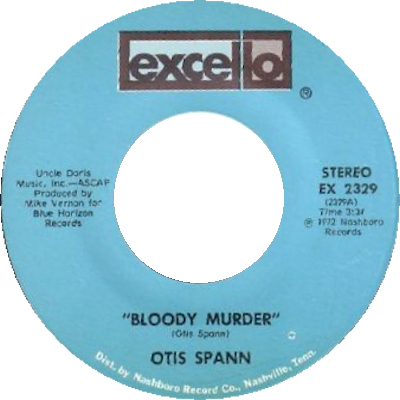 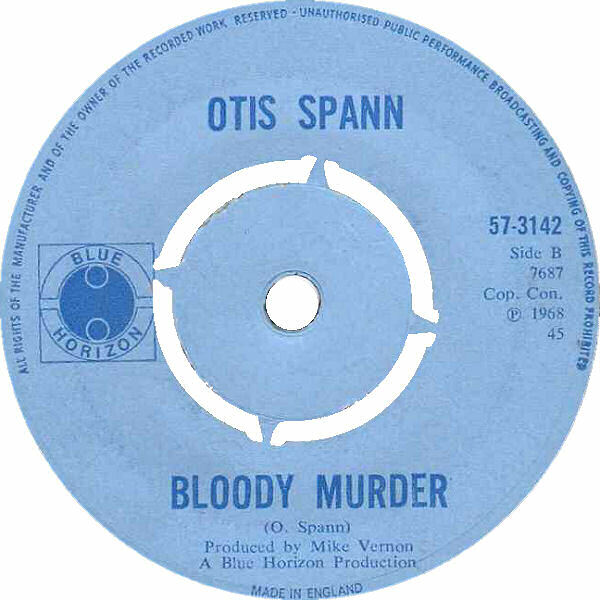 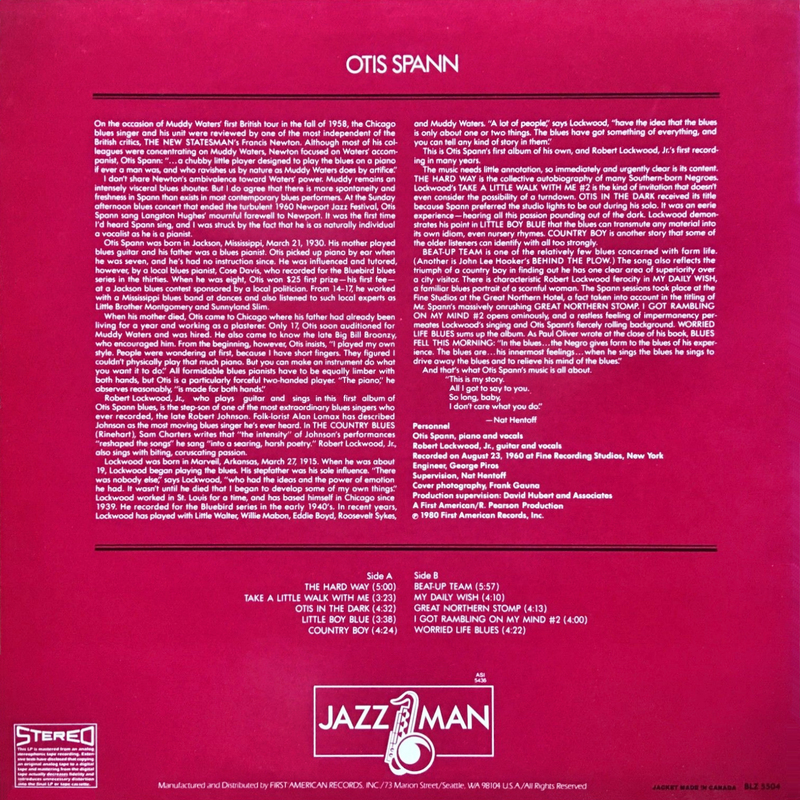 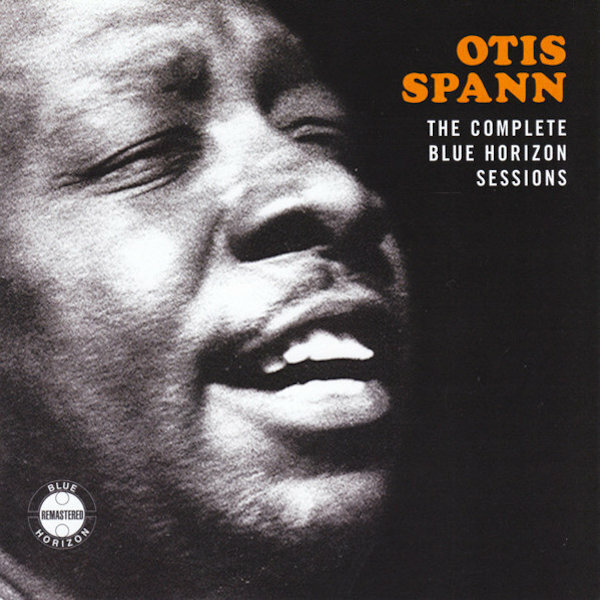 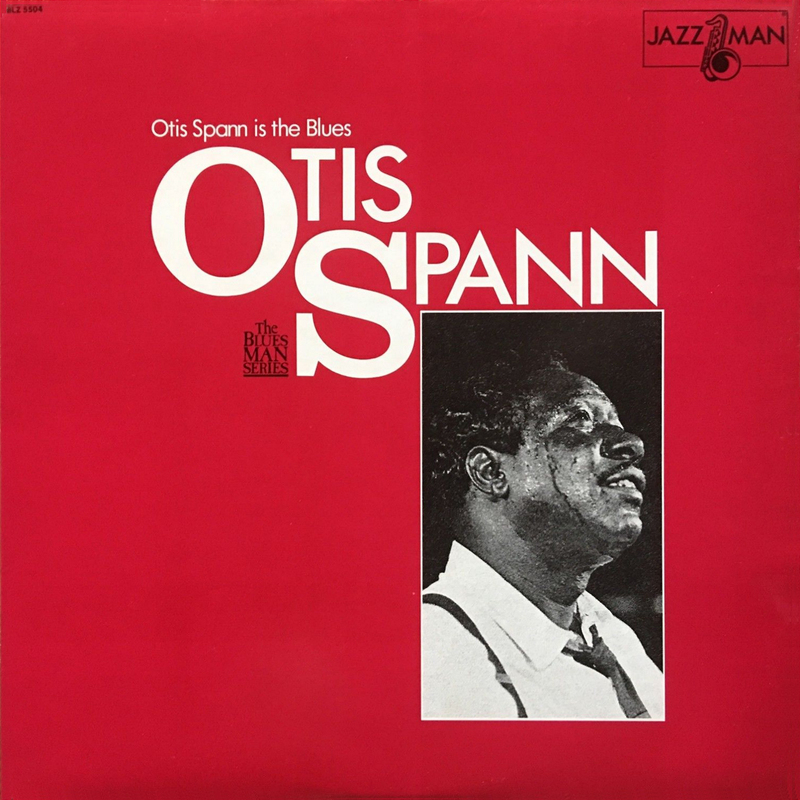 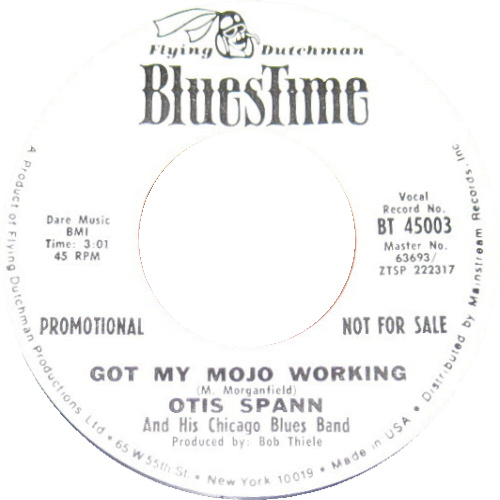 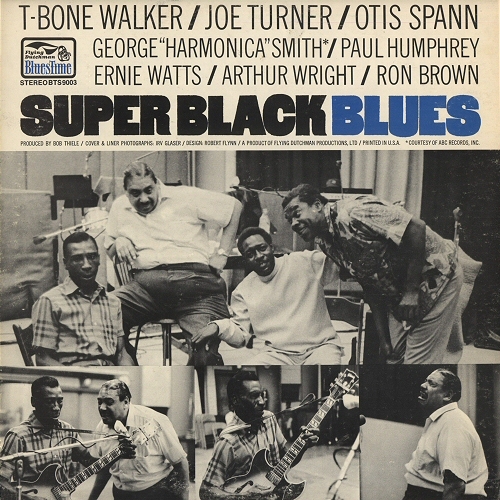 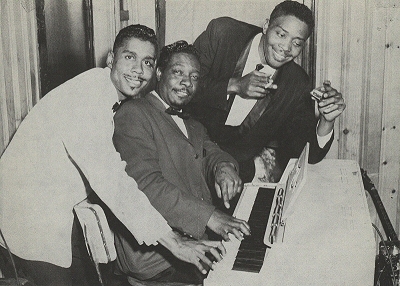 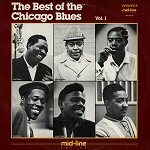 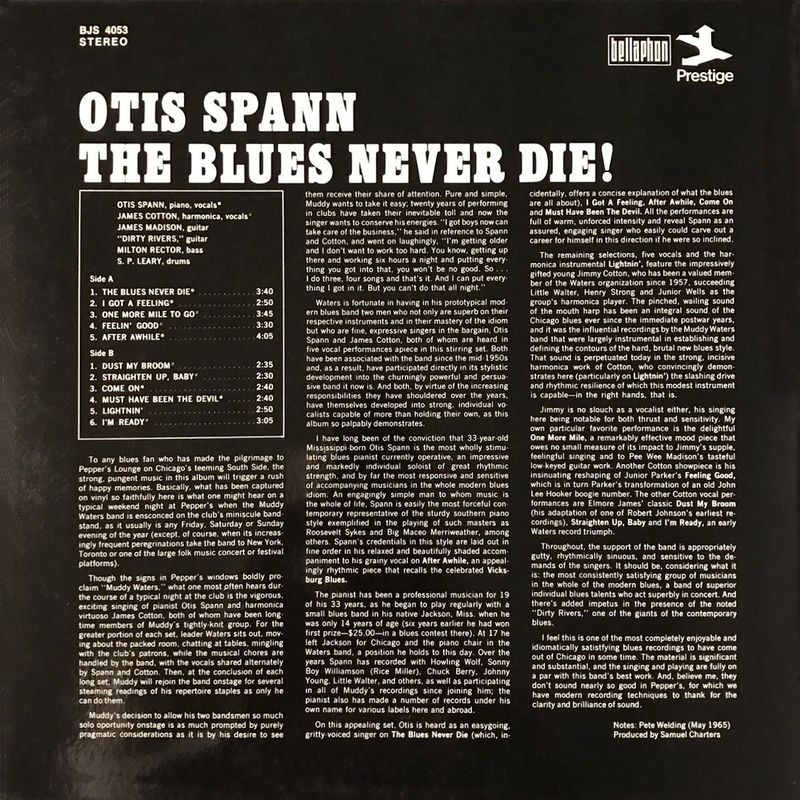 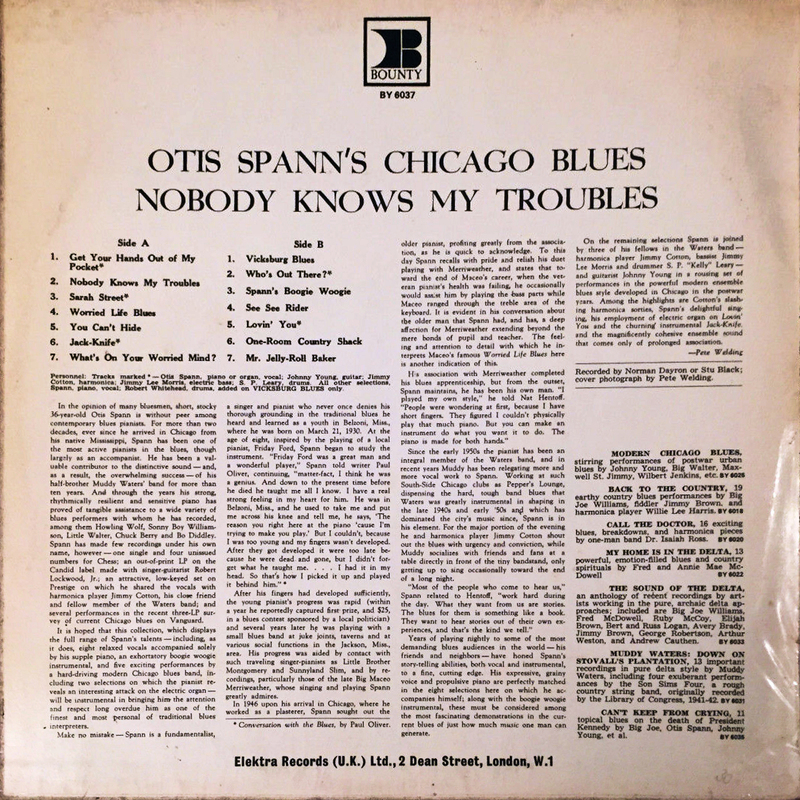 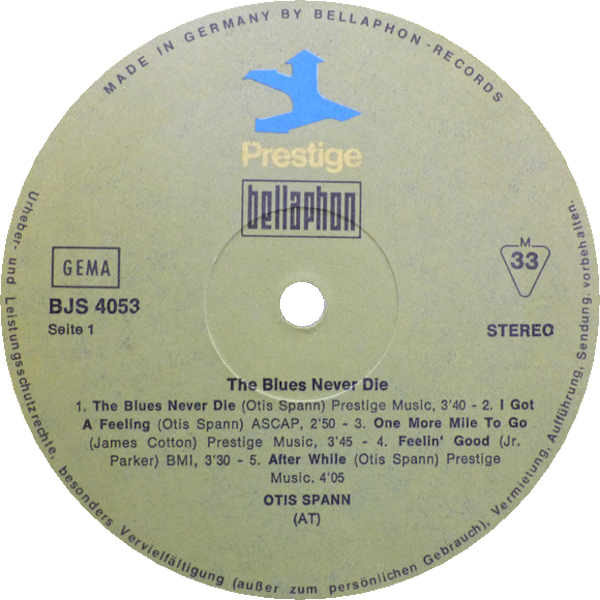 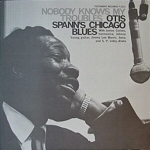 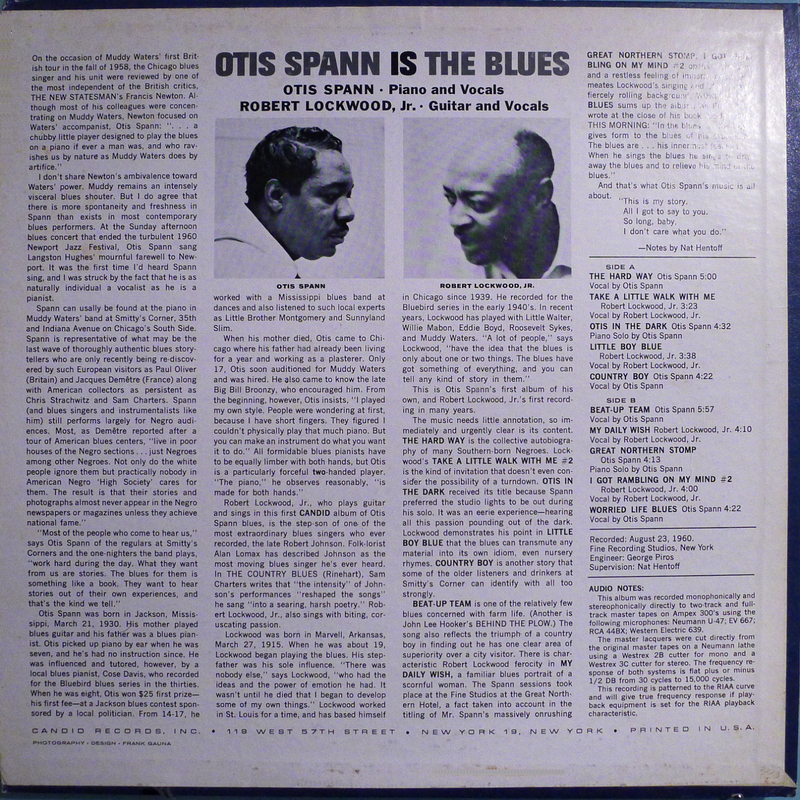 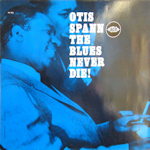 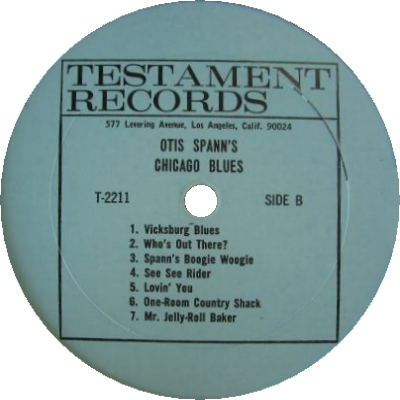 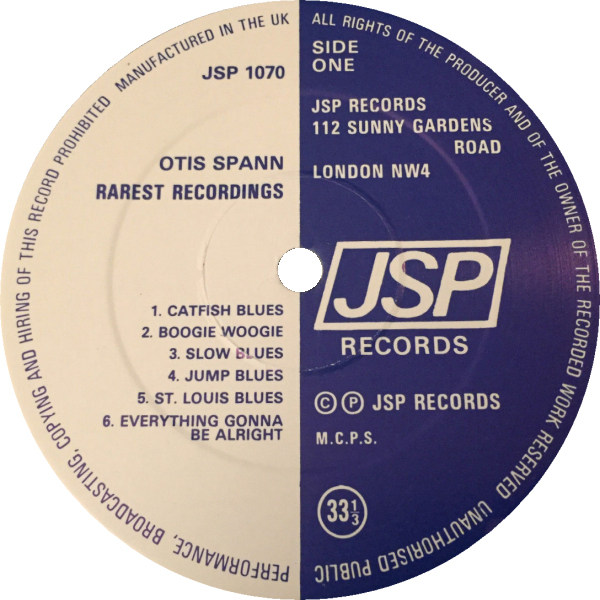 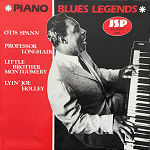 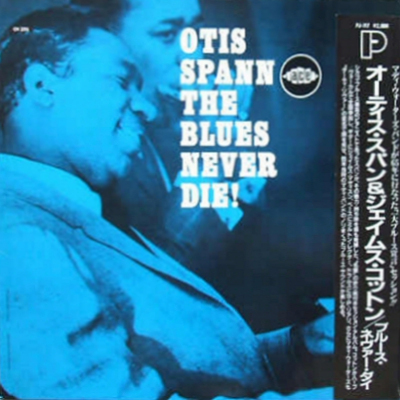 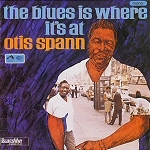 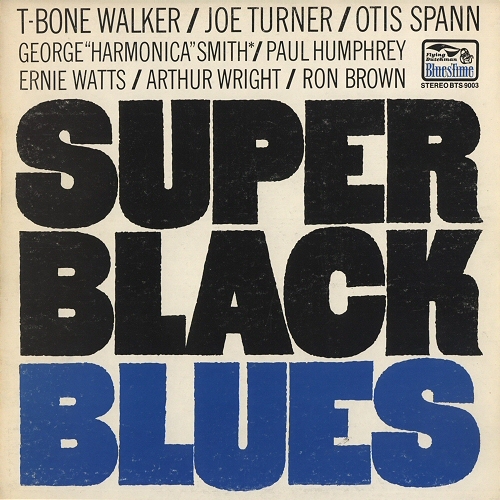 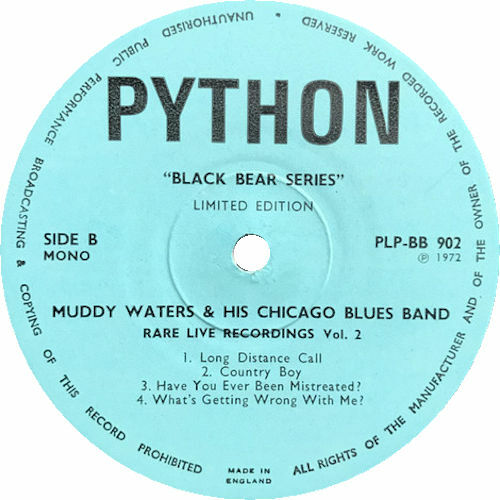 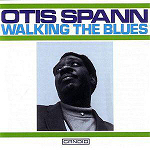 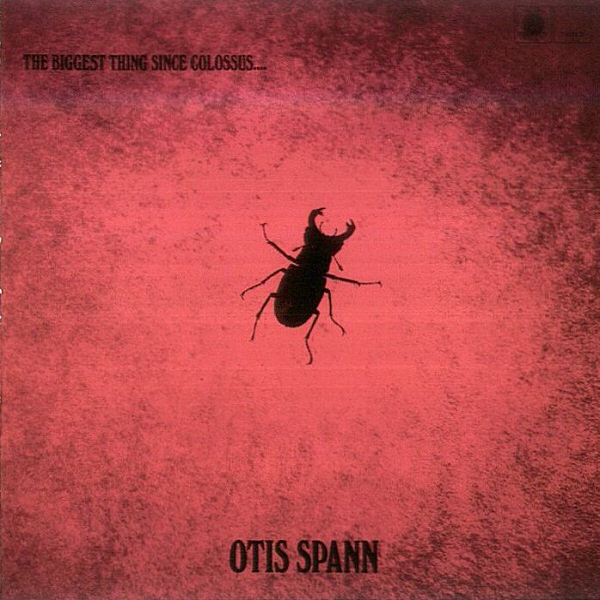 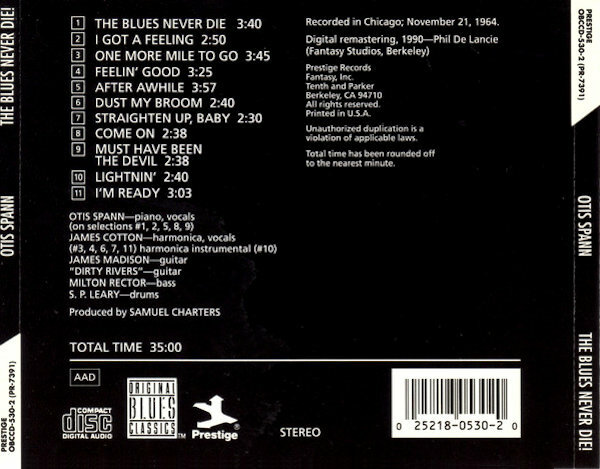 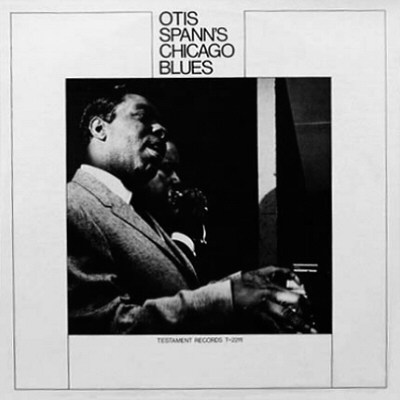 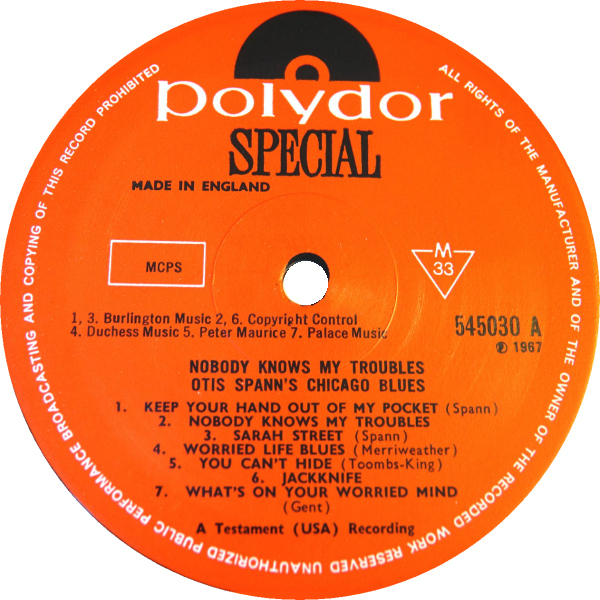 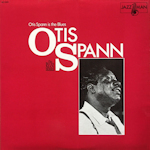 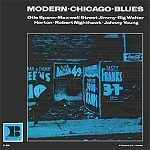 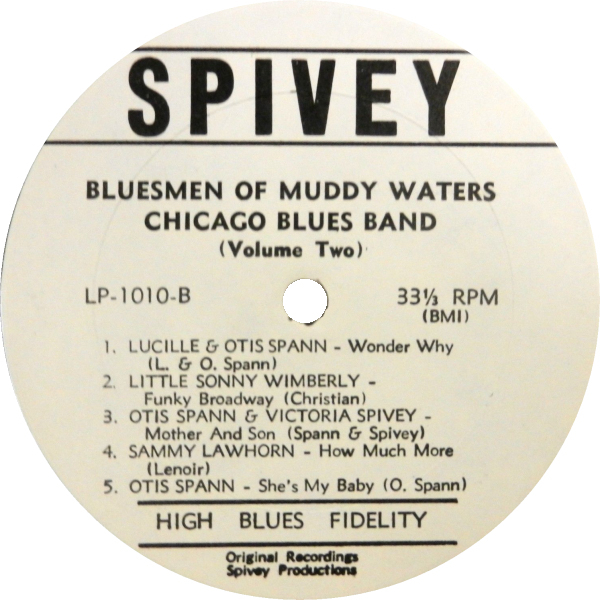 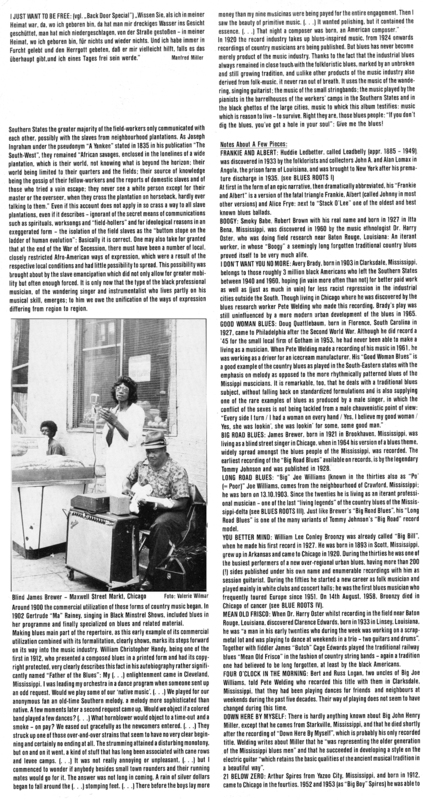 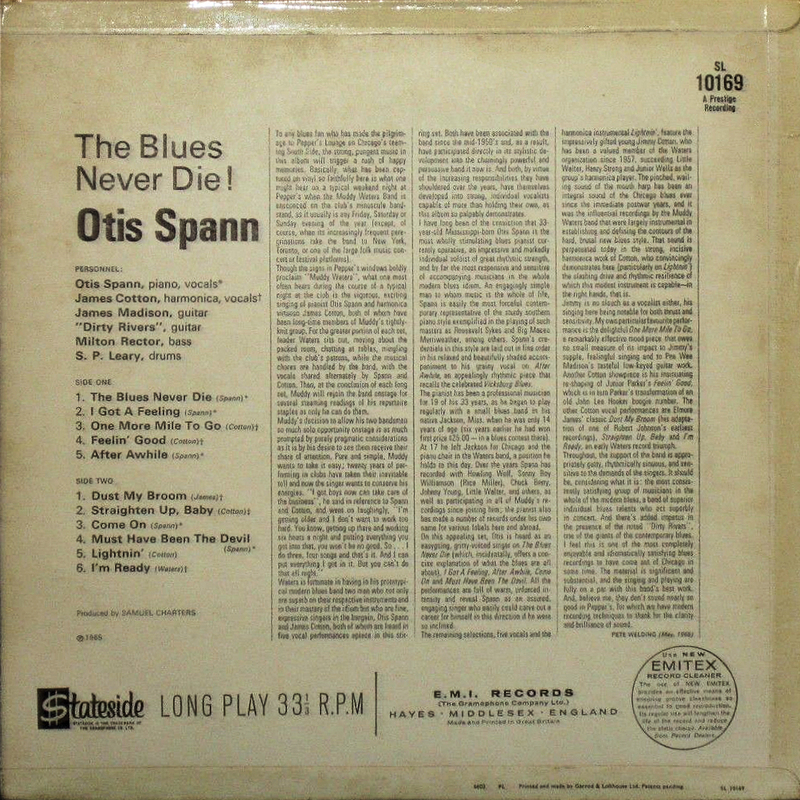 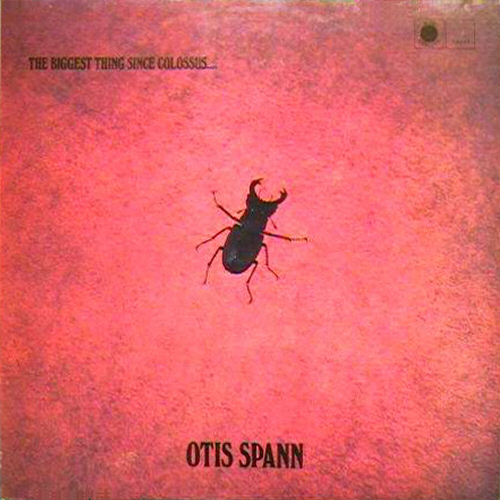 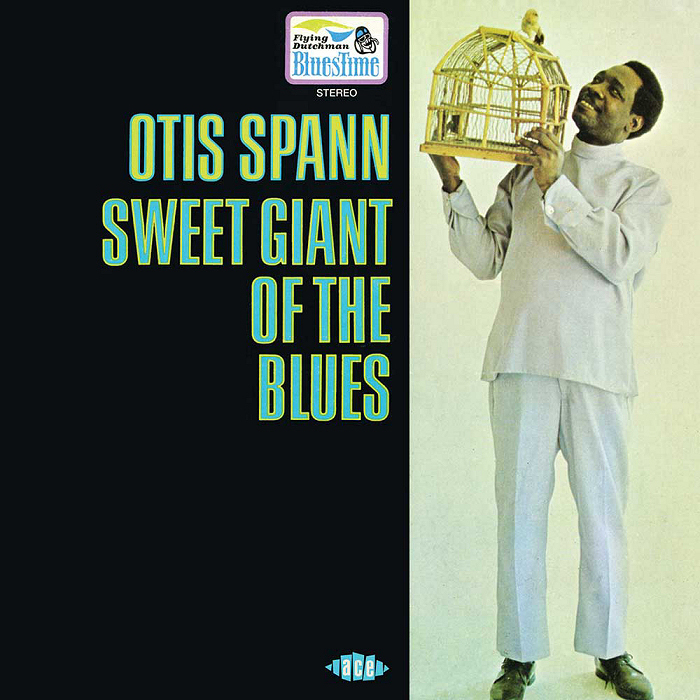 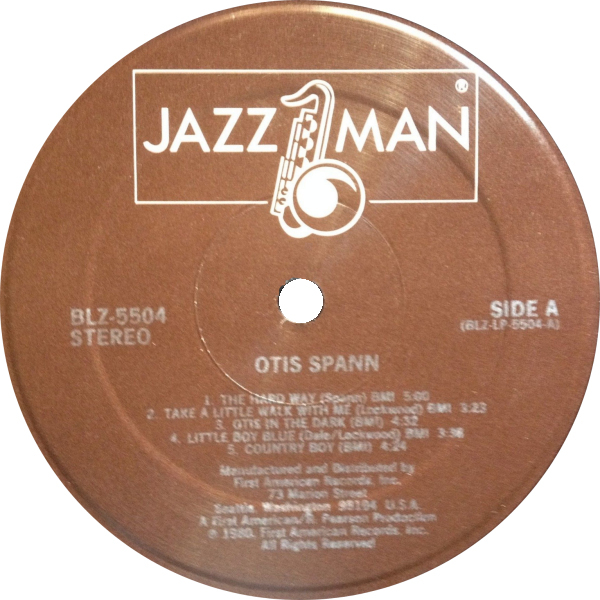 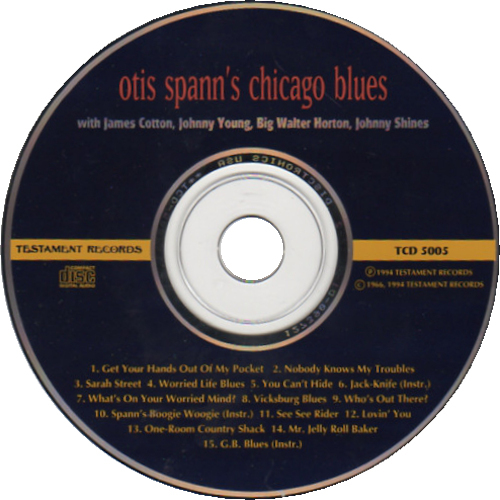 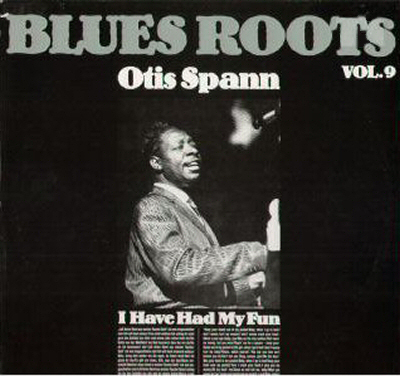 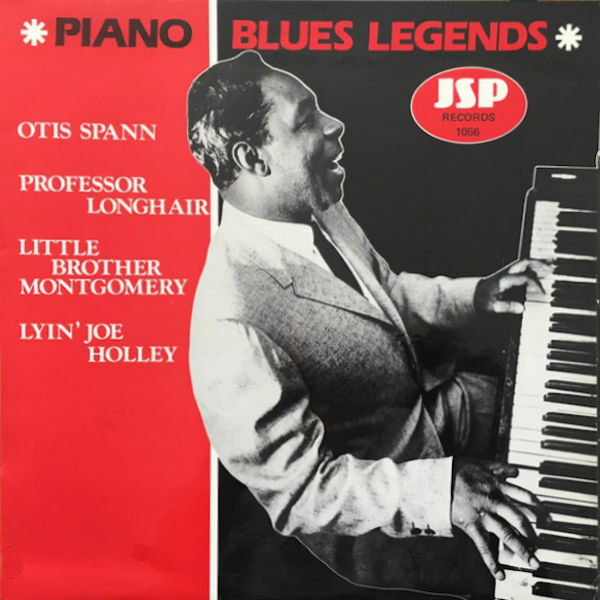 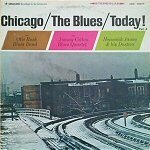 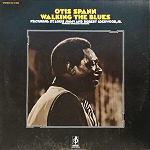 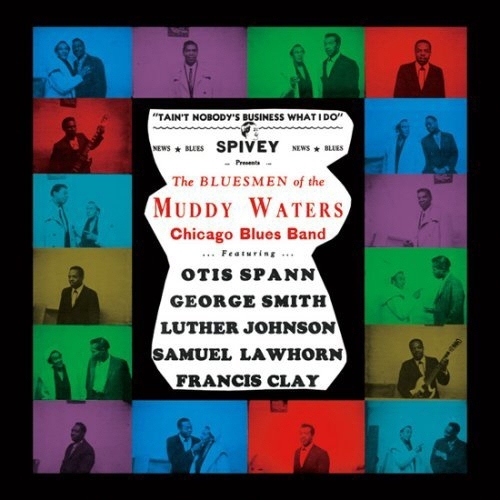 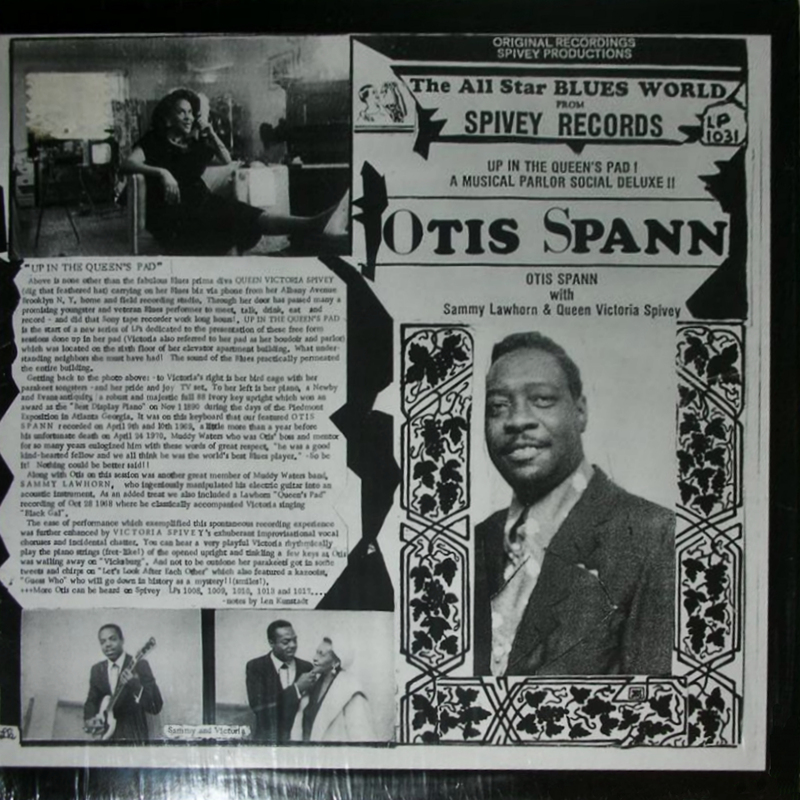 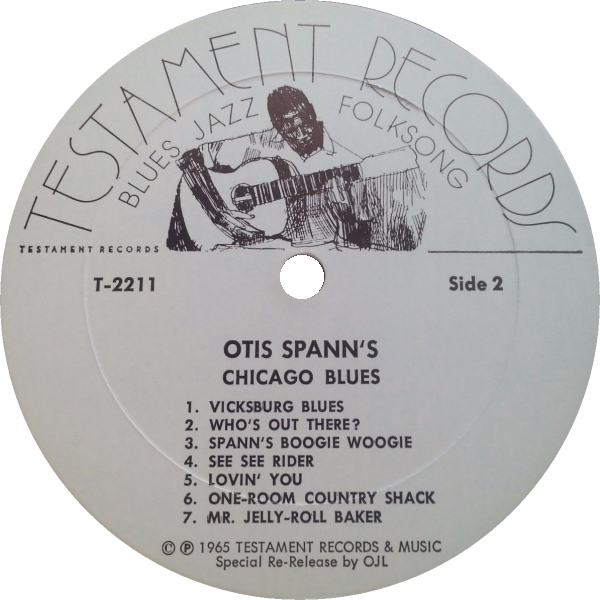 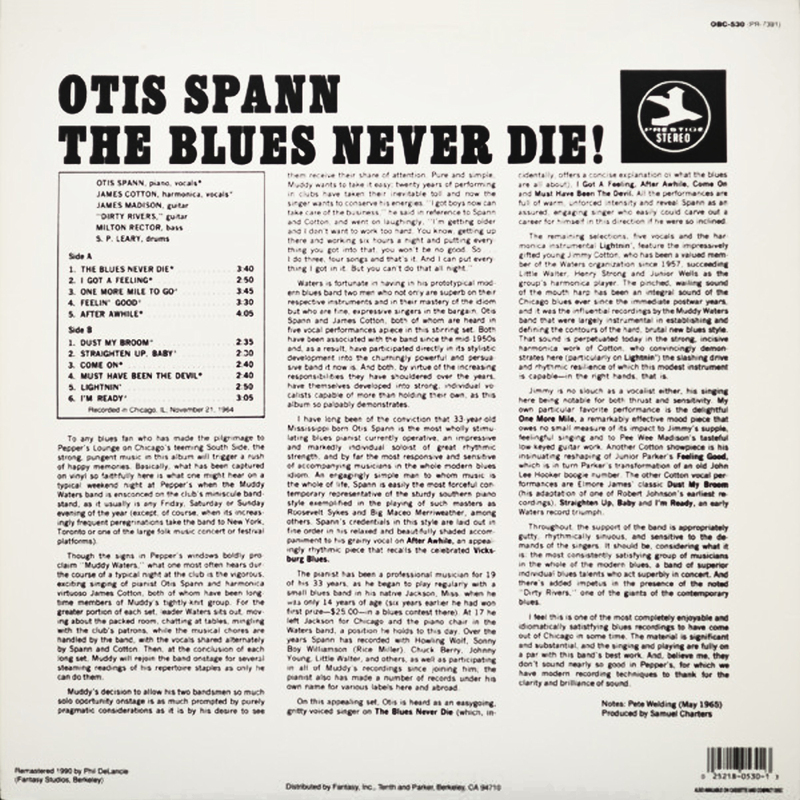 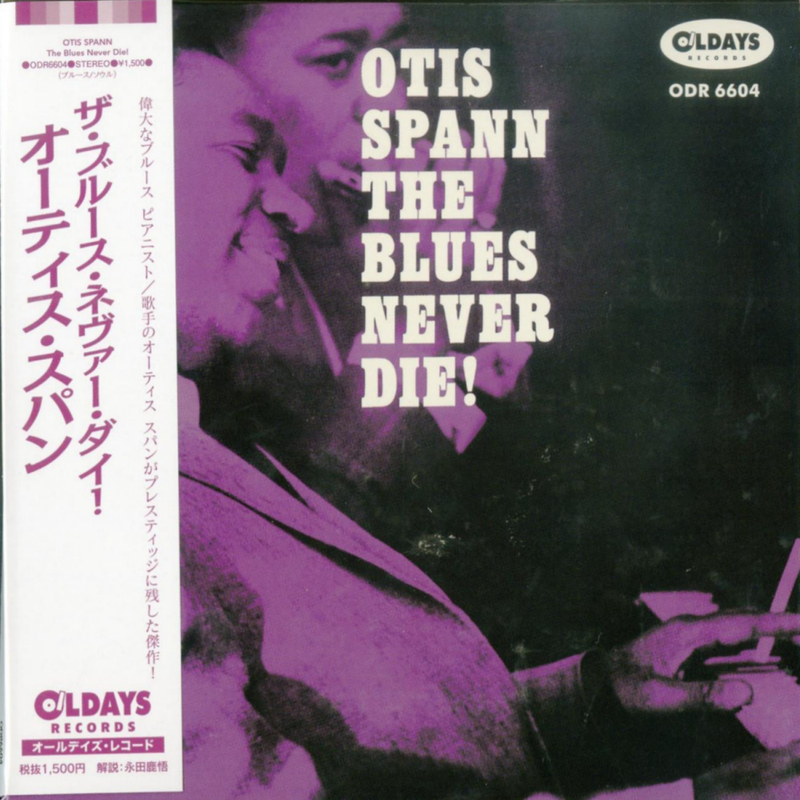 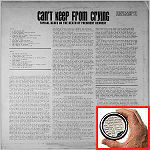 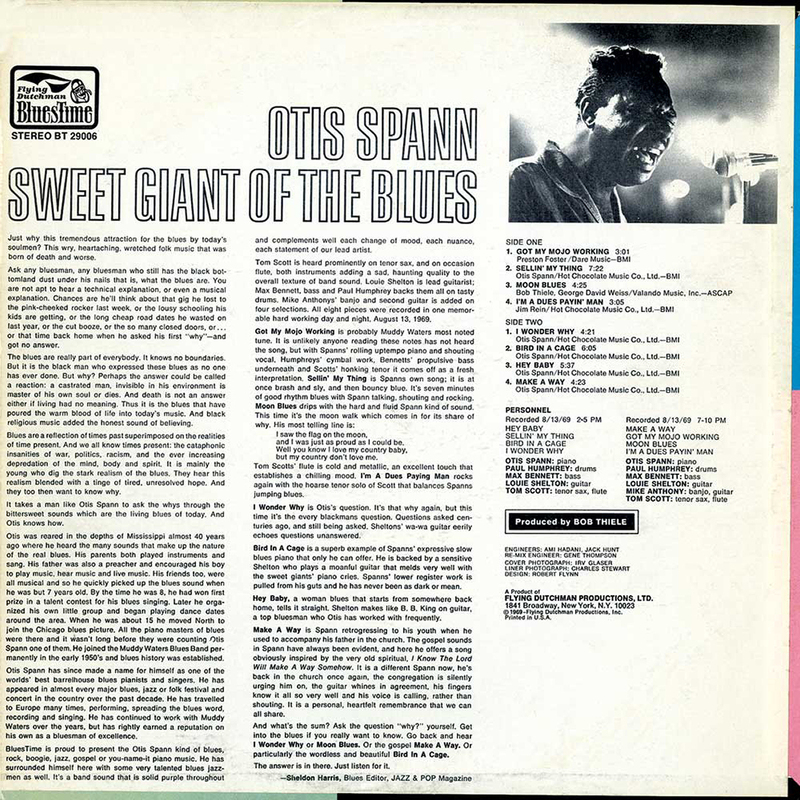 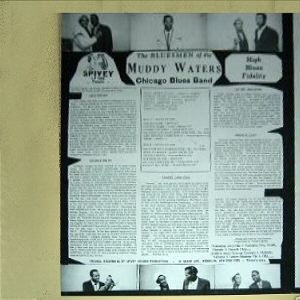 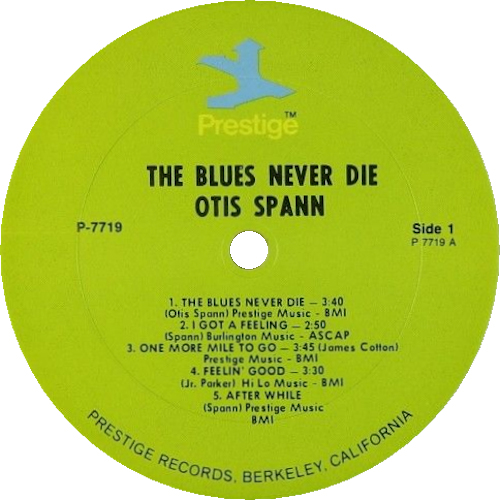 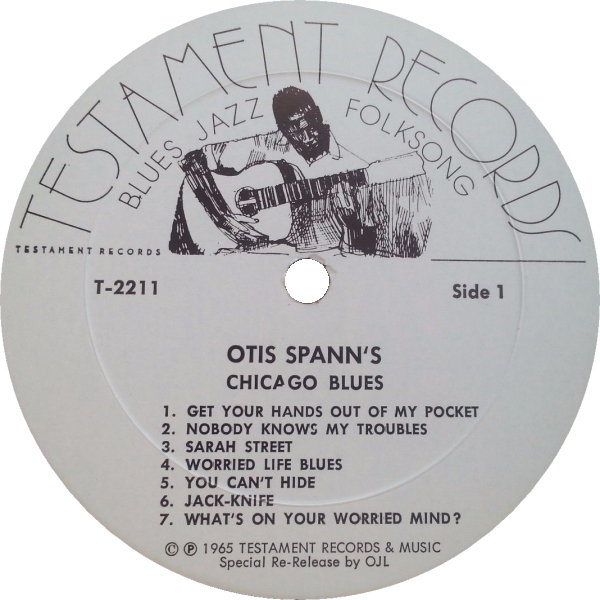 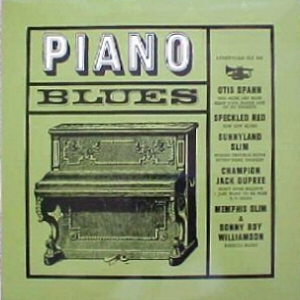 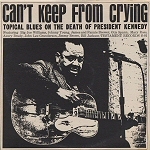 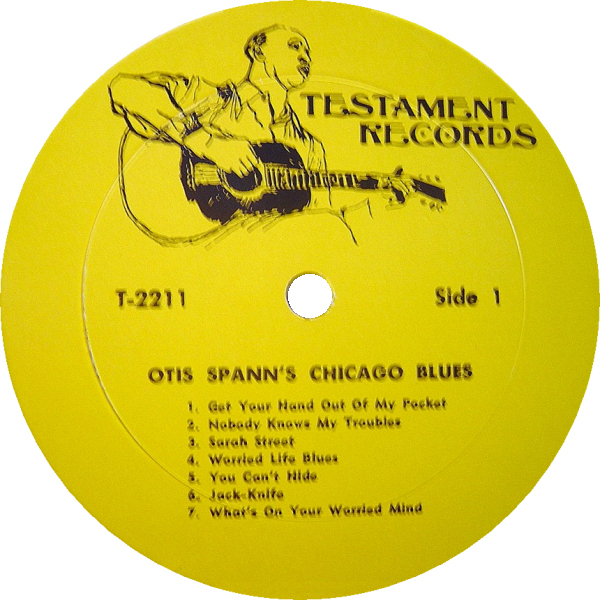 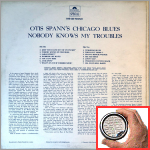 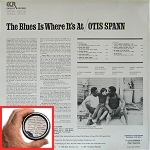 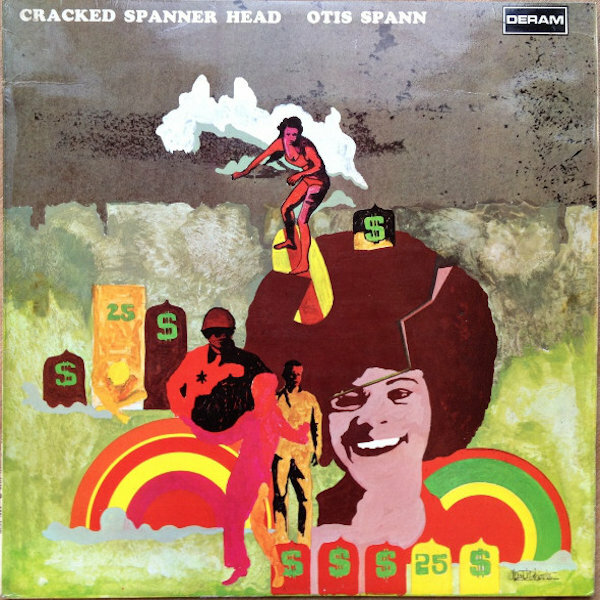 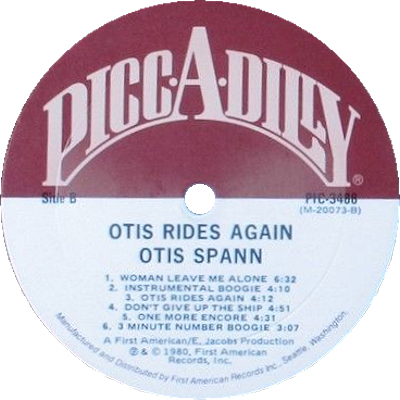 Box 1813/Chicago, Illinois, 60690"
"577 Levering Avenue, Los Angeles, Calif. 90024"
= Black Cat 001 (NL 1980) "Half Ain't Been Told"
5 1965 Otis Spann: The Blues Never Die! 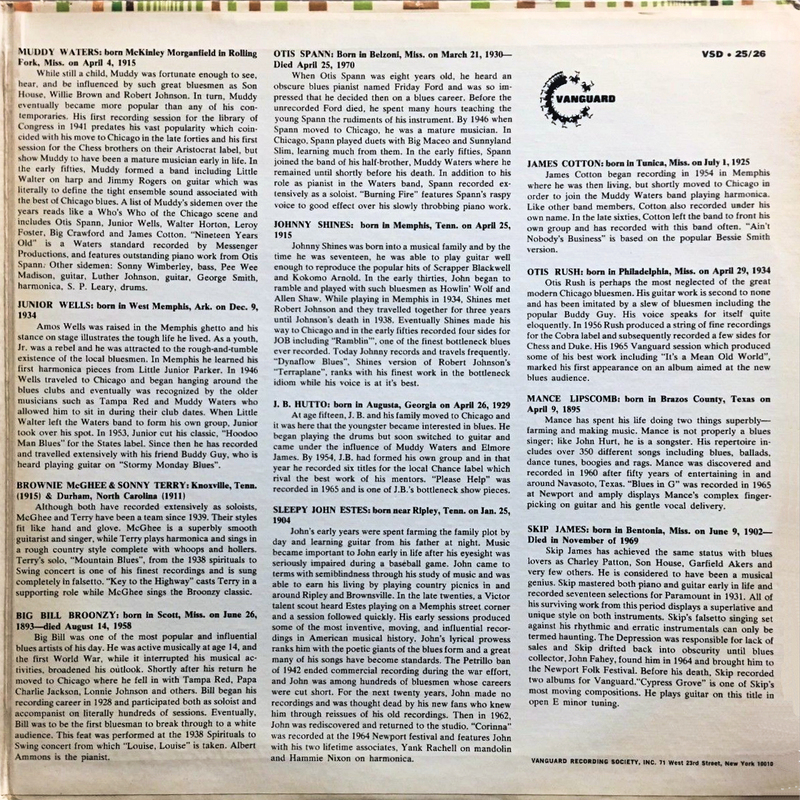 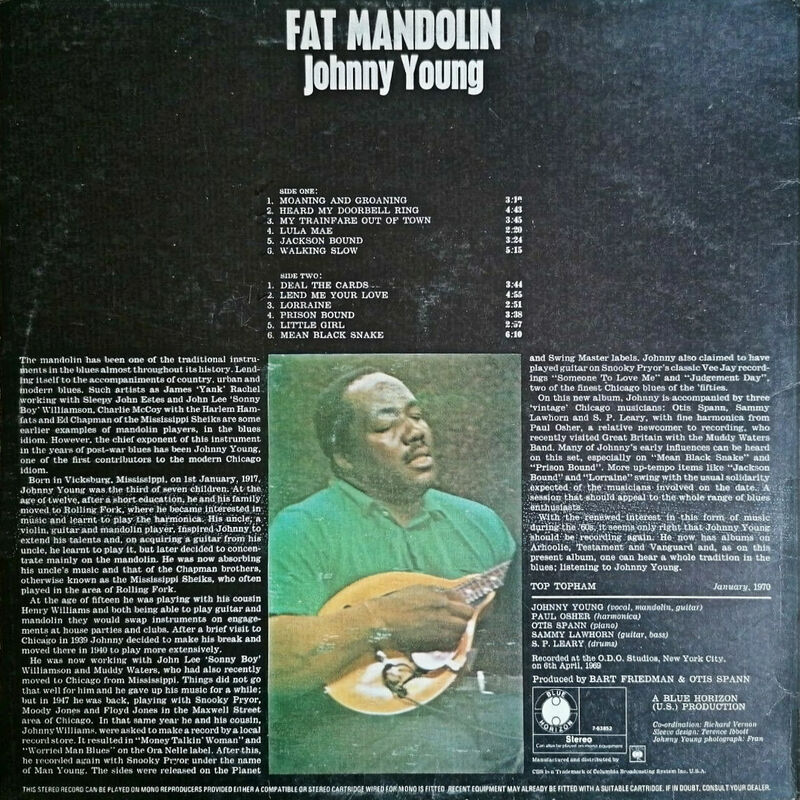 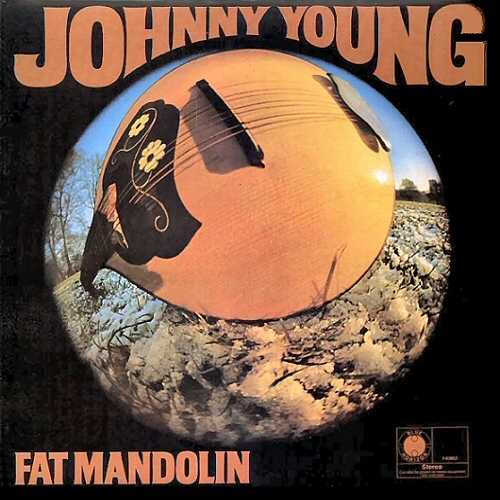 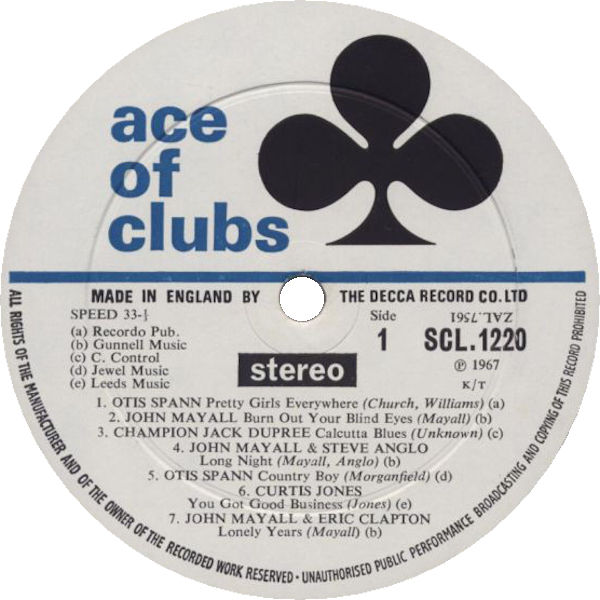 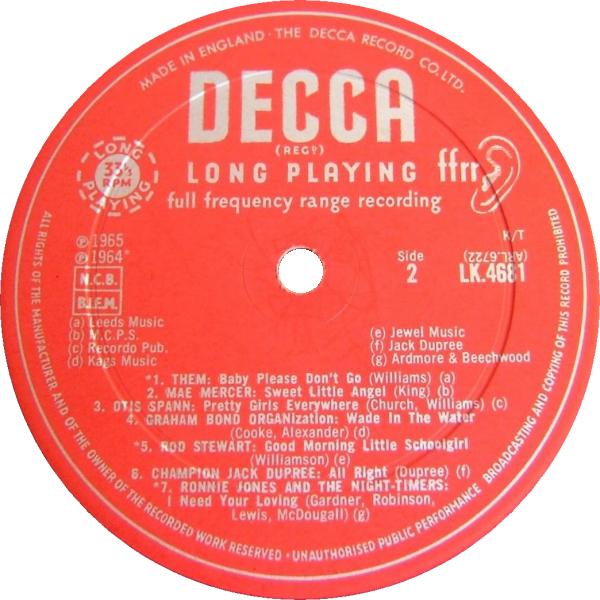 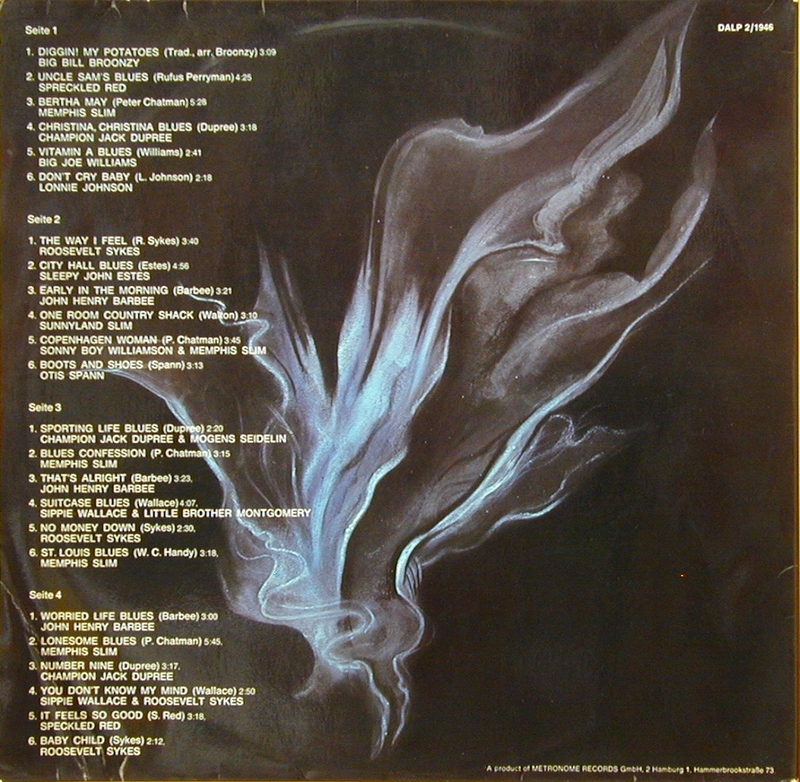 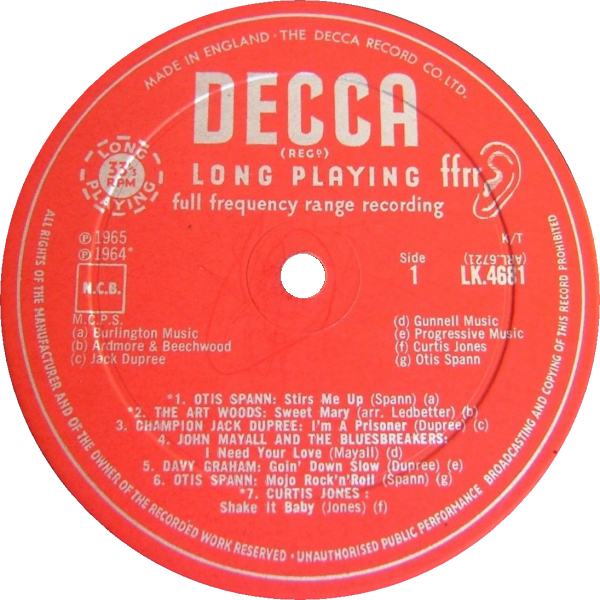 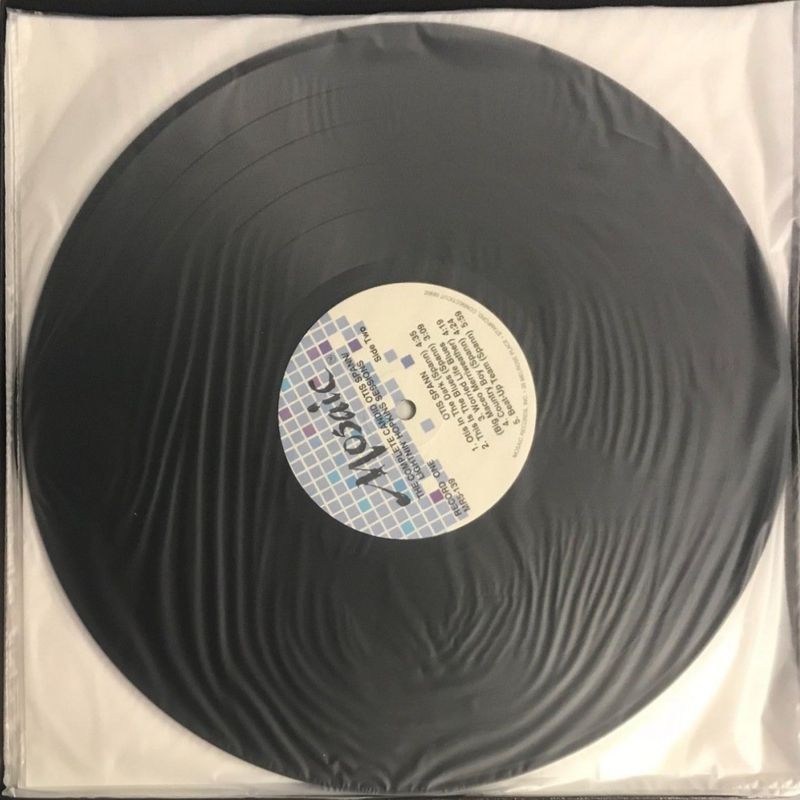 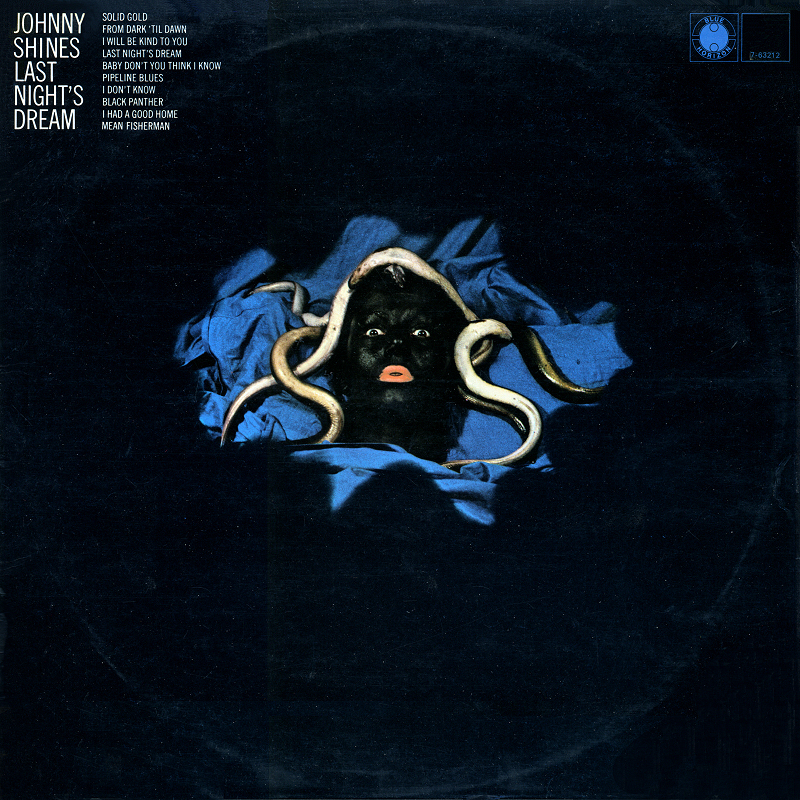 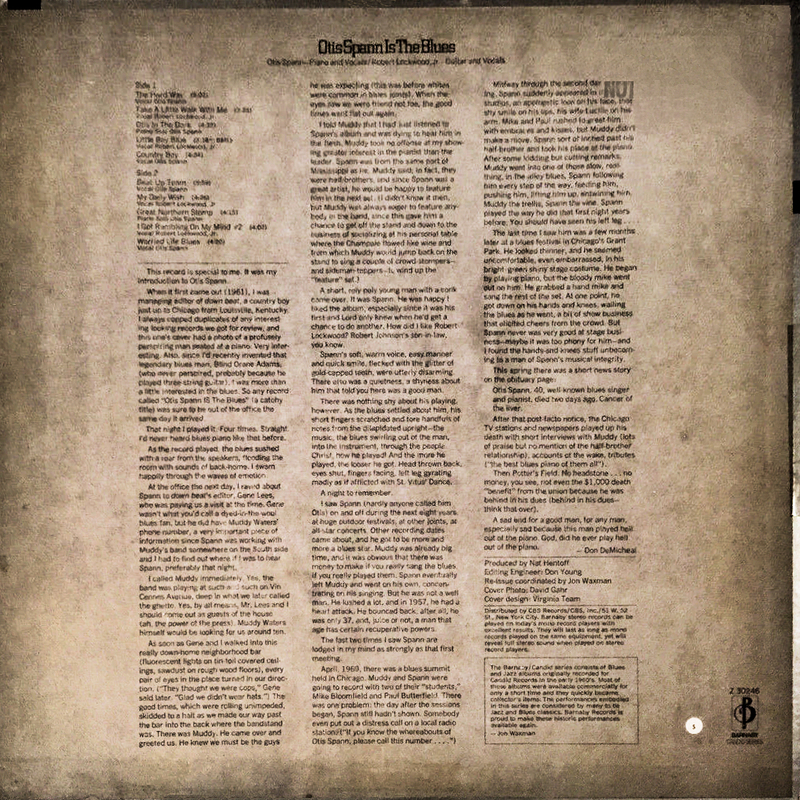 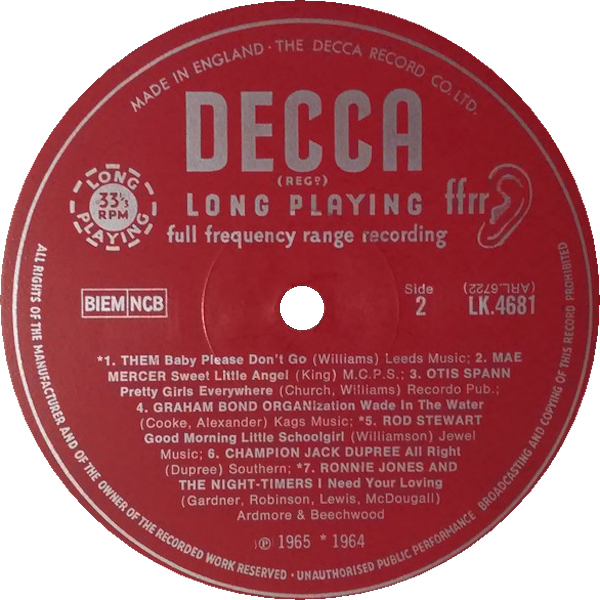 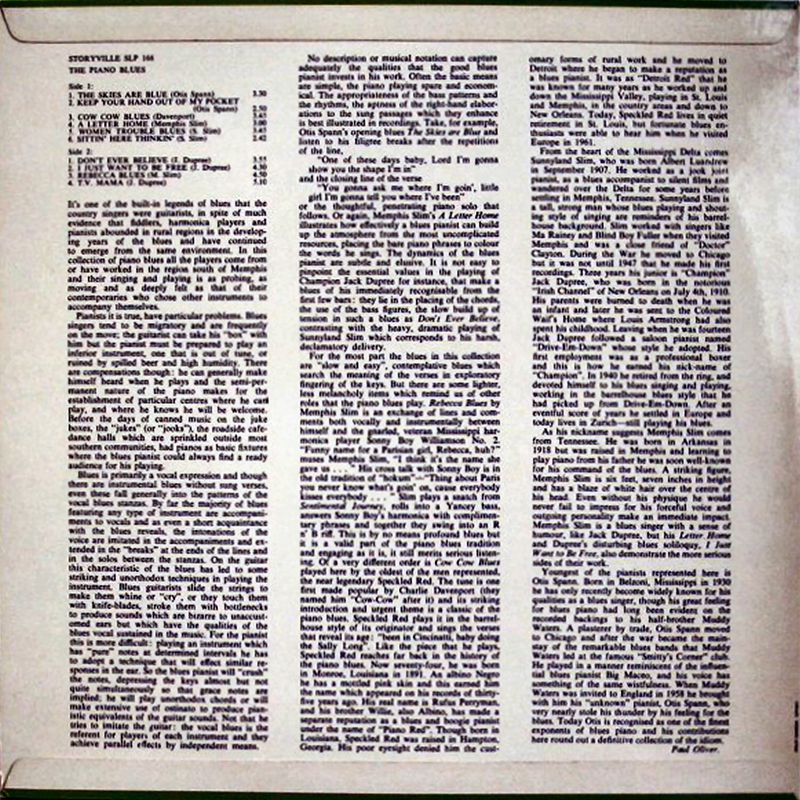 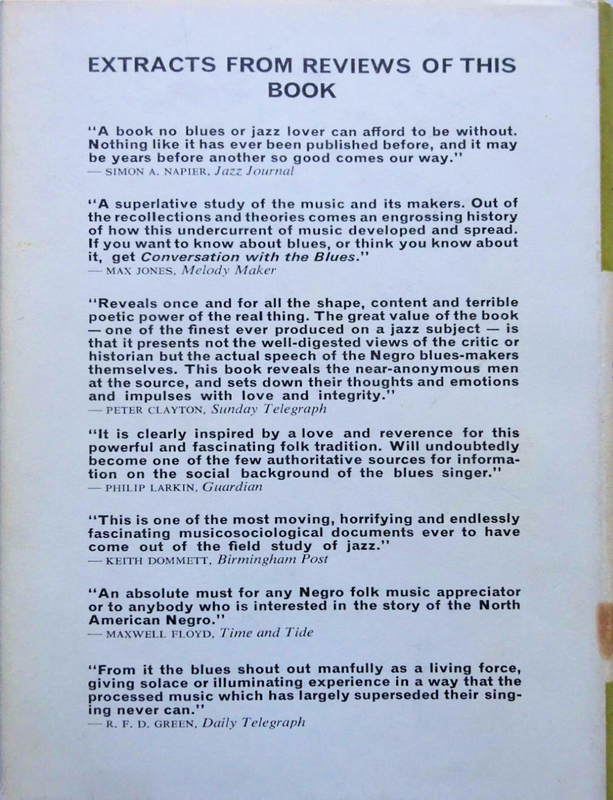 "In 1971 the Prestige label and its catalogue was sold to Fantasy Records of San Francisco, who proceeded to embark on a major programme of re-issues (light green label), sadly, of lamentable audio quality." 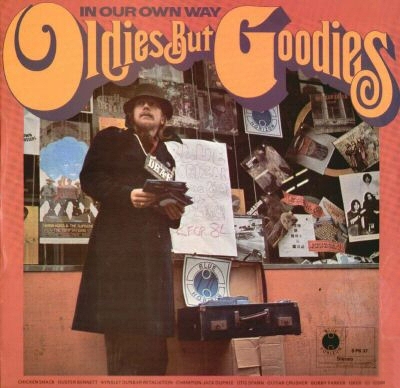 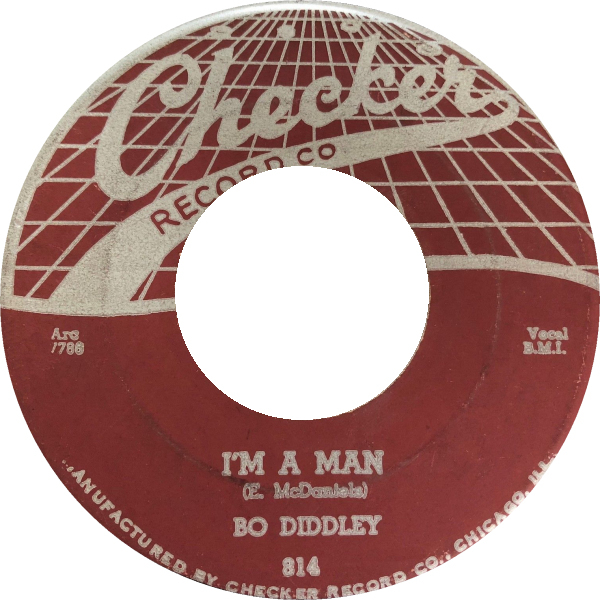 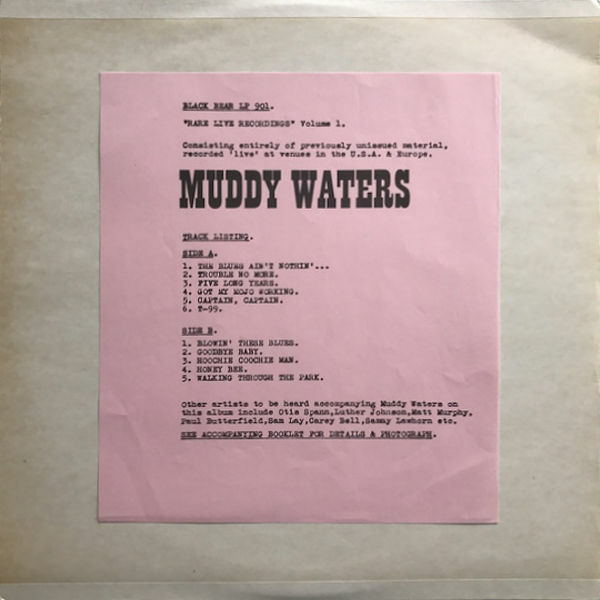 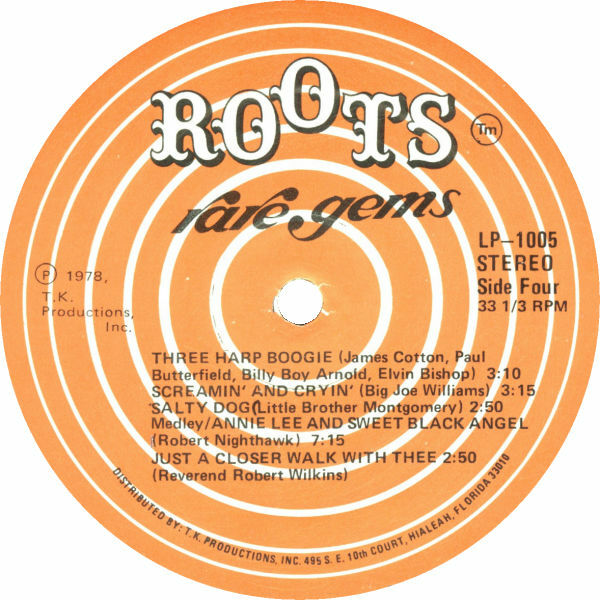 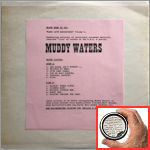 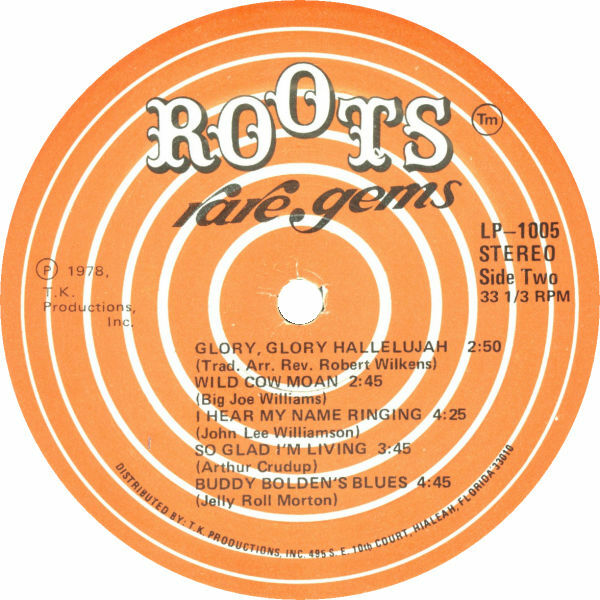 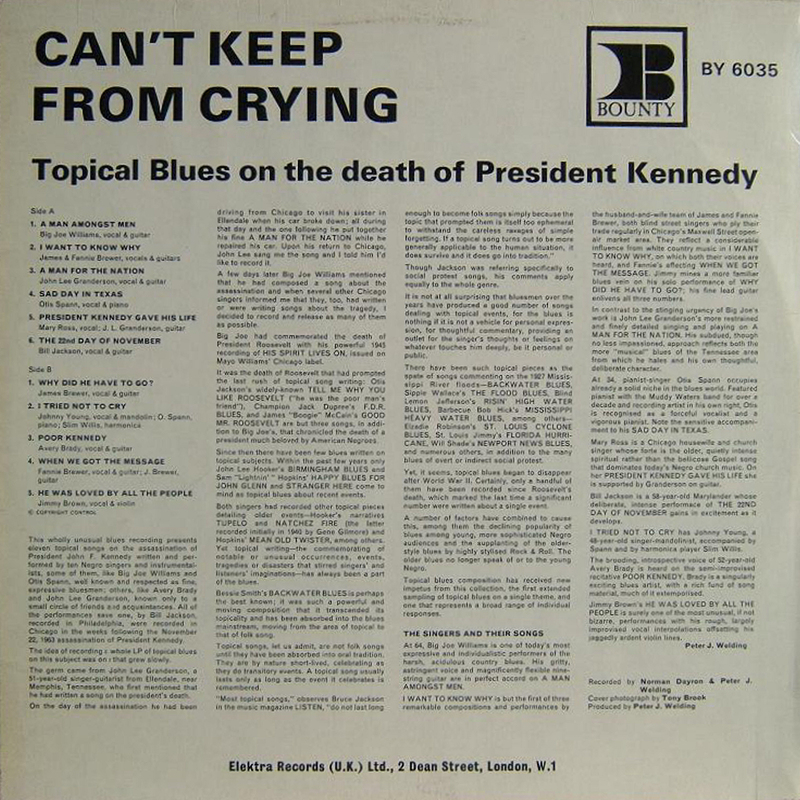 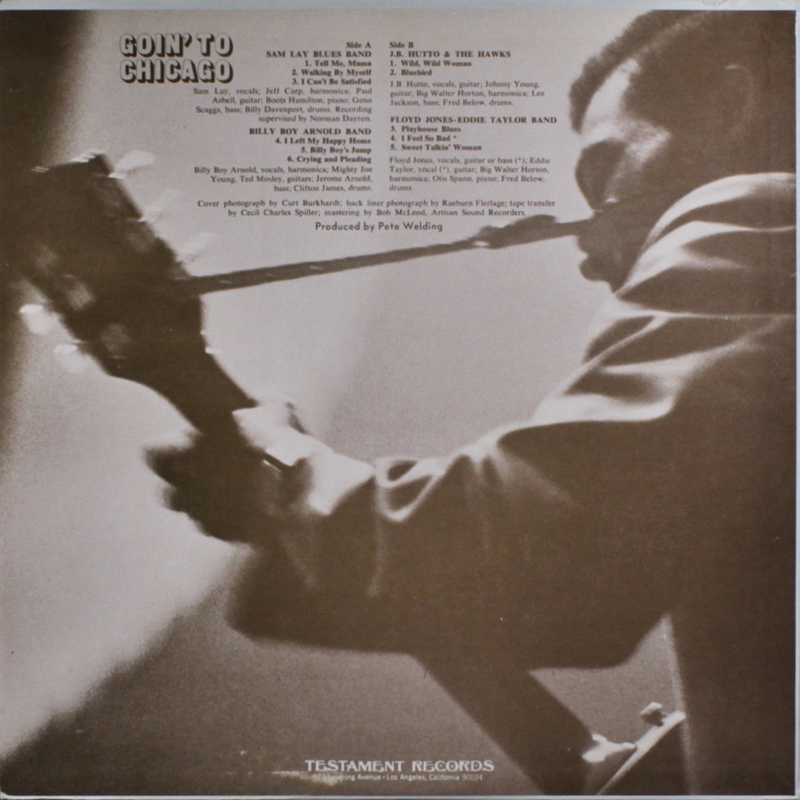 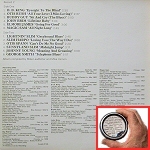 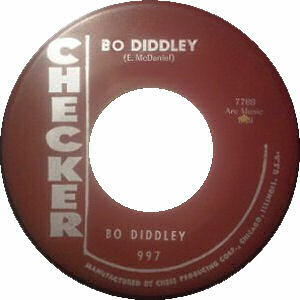 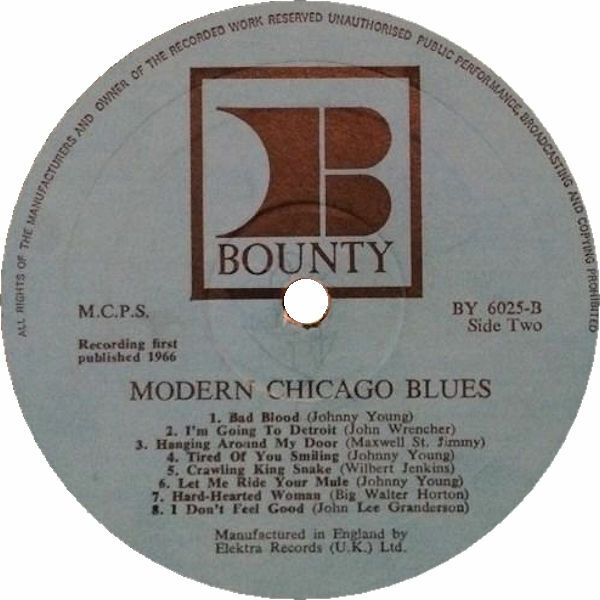 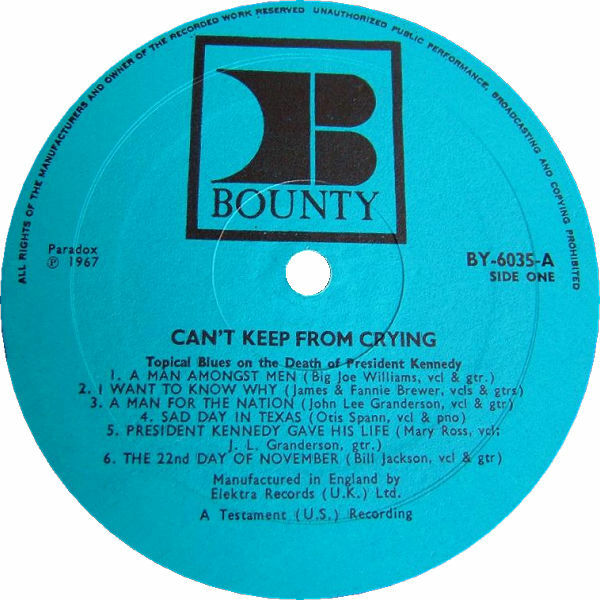 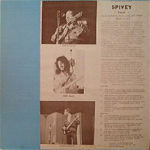 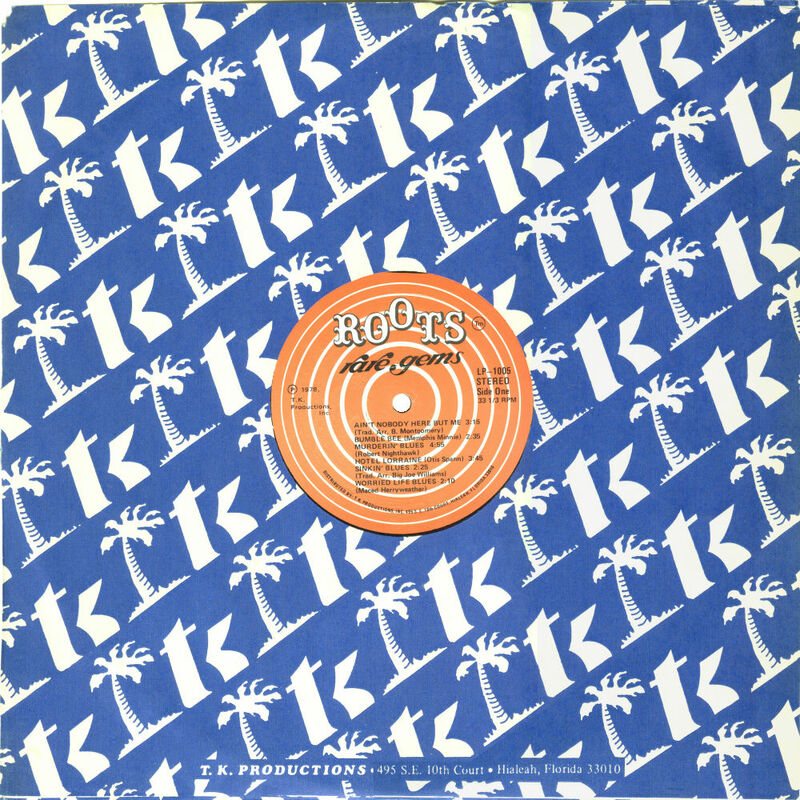 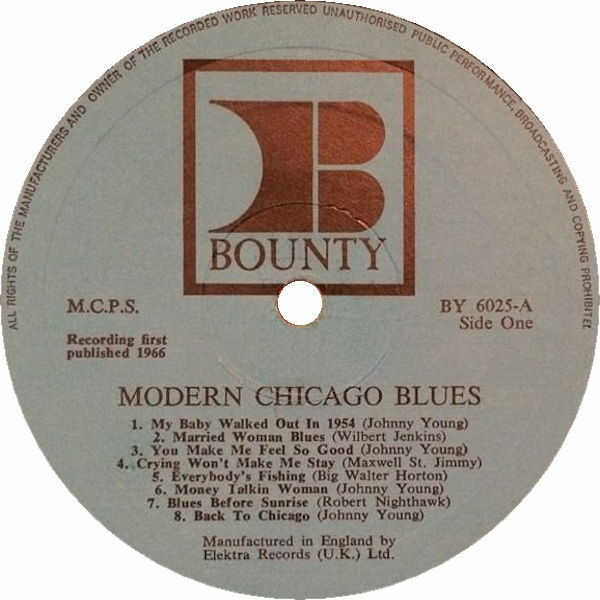 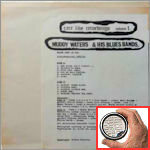 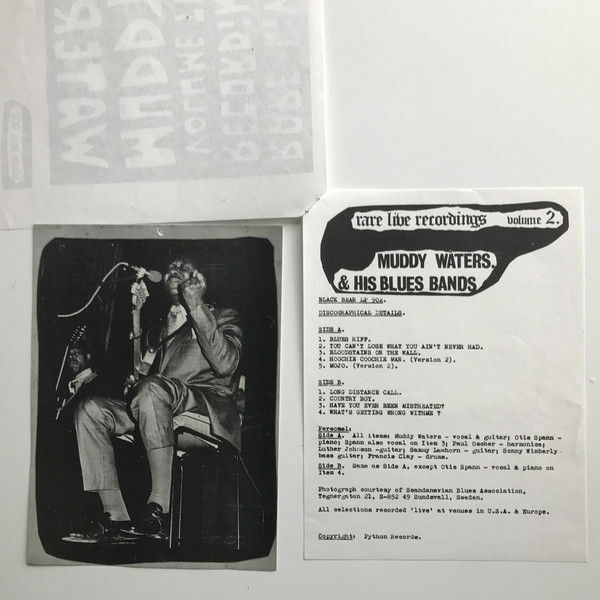 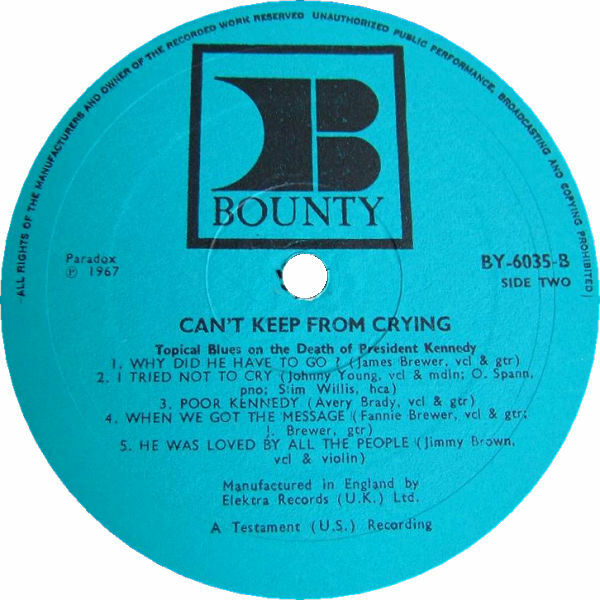 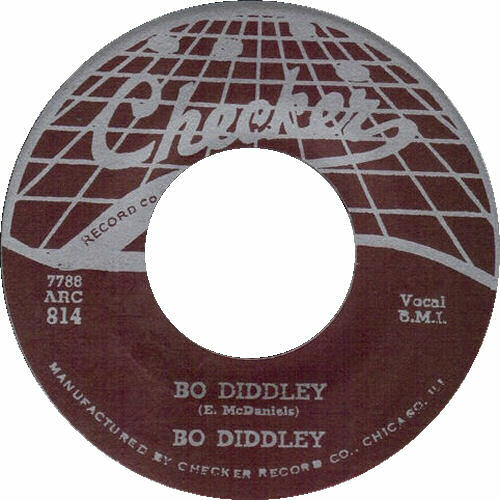 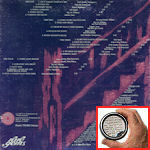 = Bounty BY-6037 (UK 1967) "Nobody Knows My Troubles"
= Polydor 545 030 (UK 1969) "Nobody Knows My Troubles"
notes (1966) by Pete Welding Arhoolie Records, P.O. Box 5073, Berkeley 5, Calif.
- Where Is My Wife? 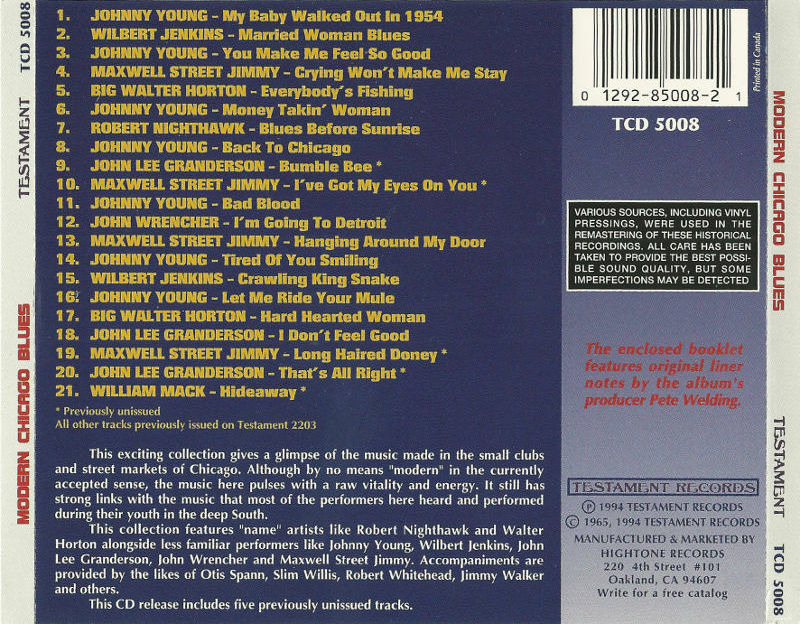 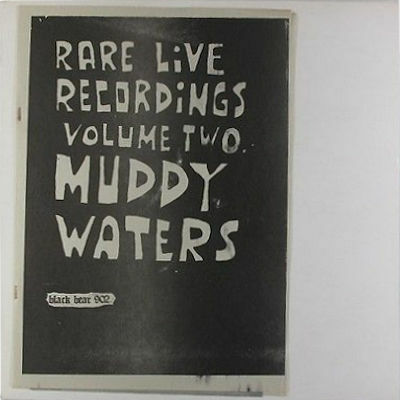 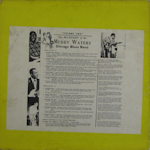 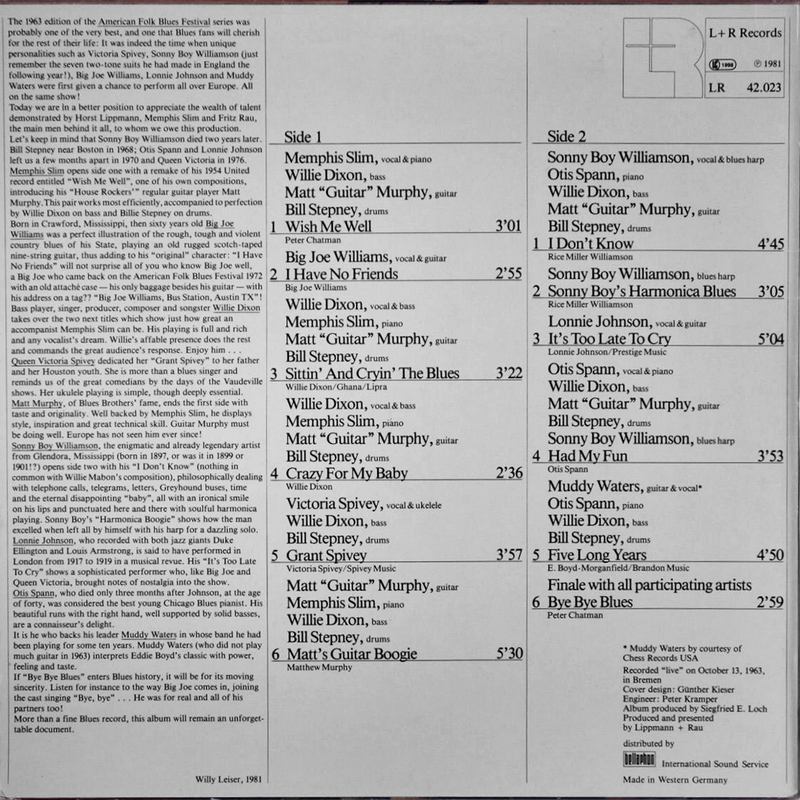 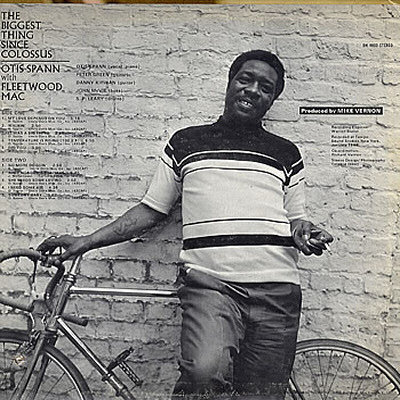 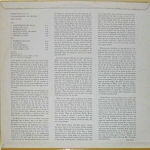 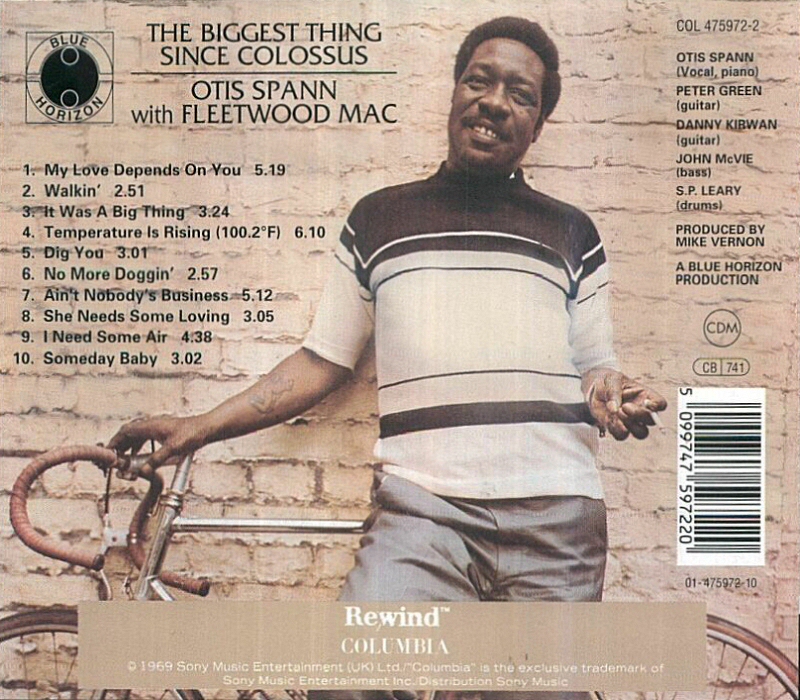 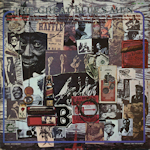 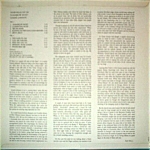 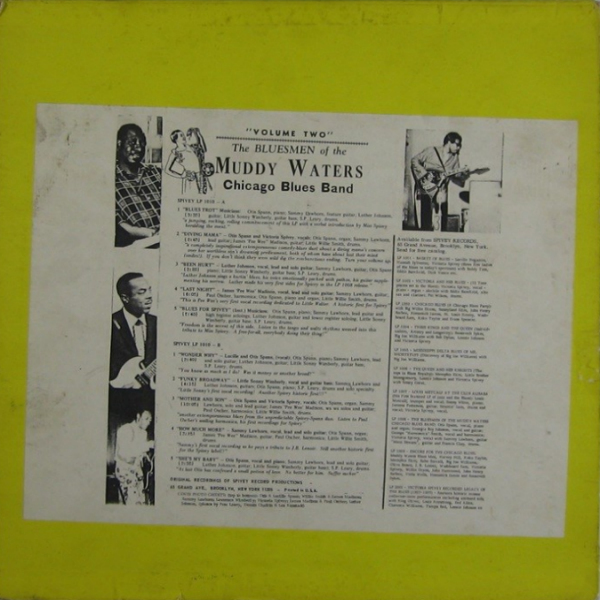 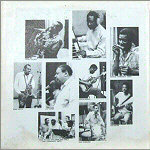 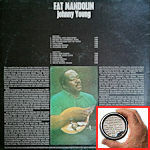 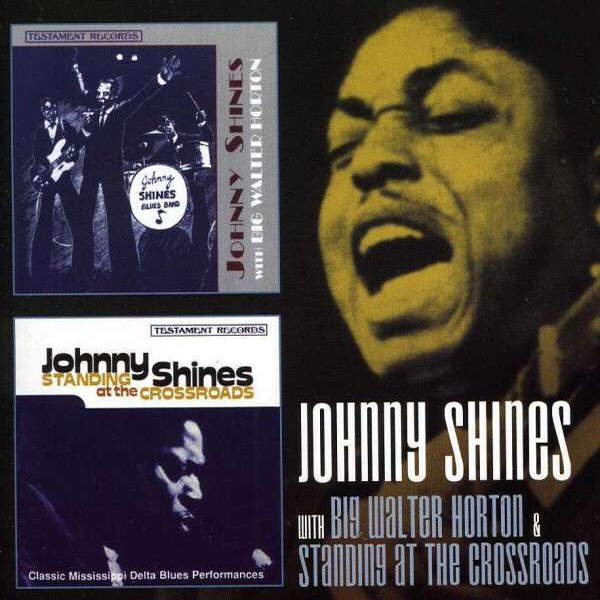 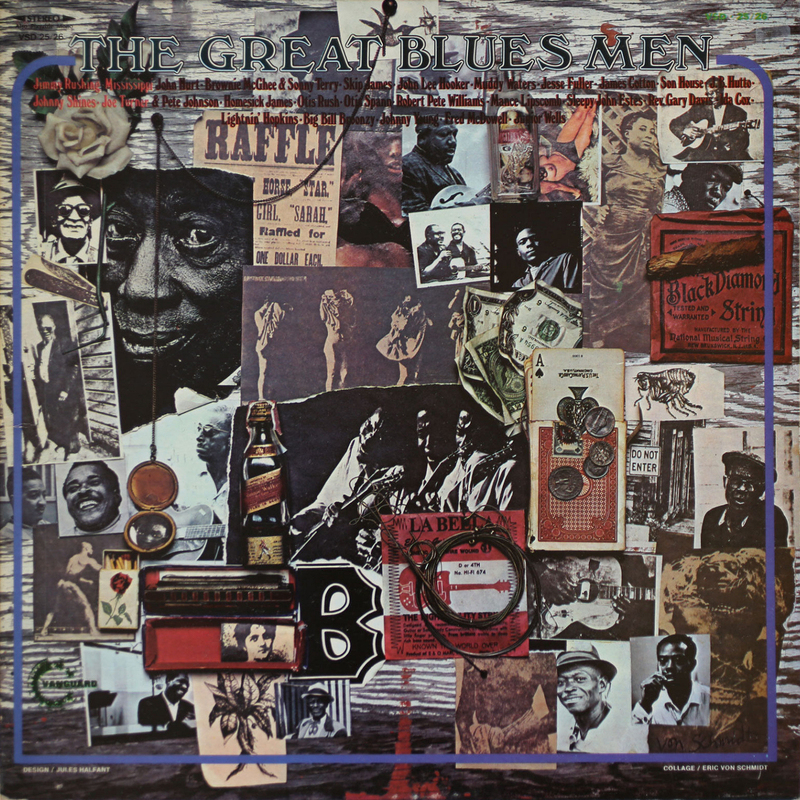 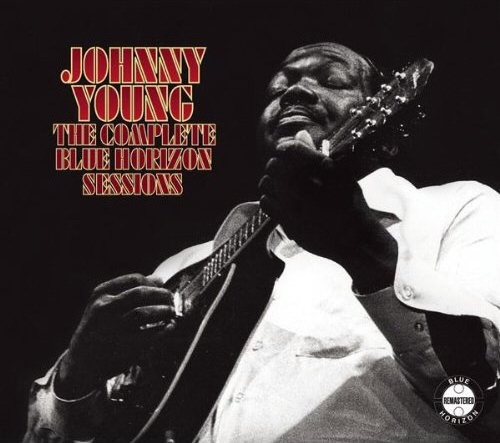 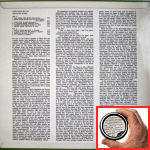 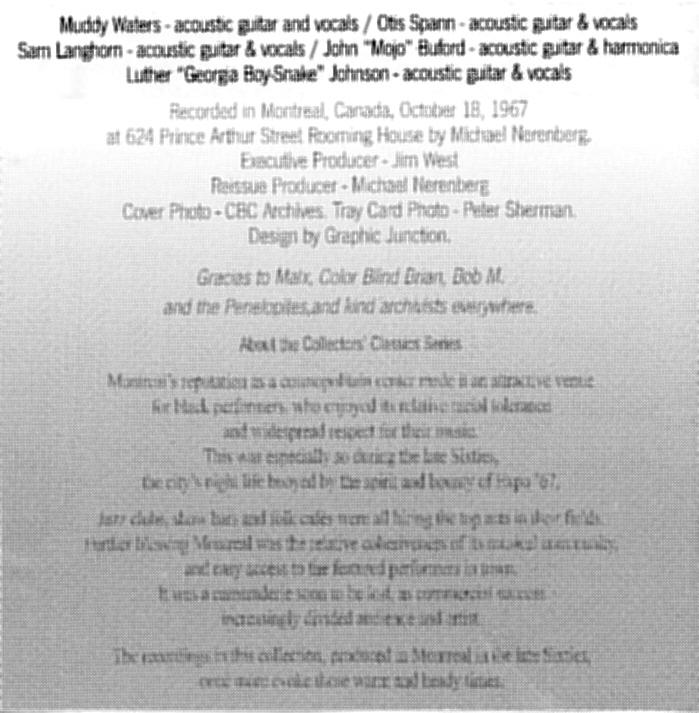 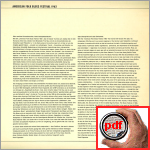 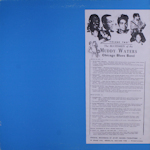 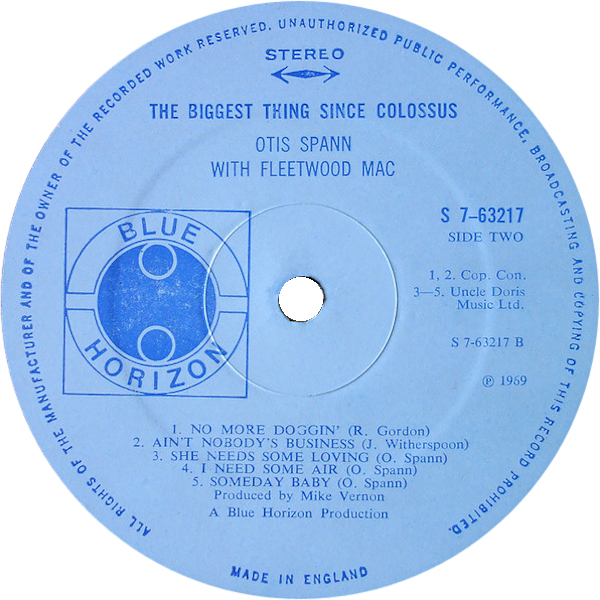 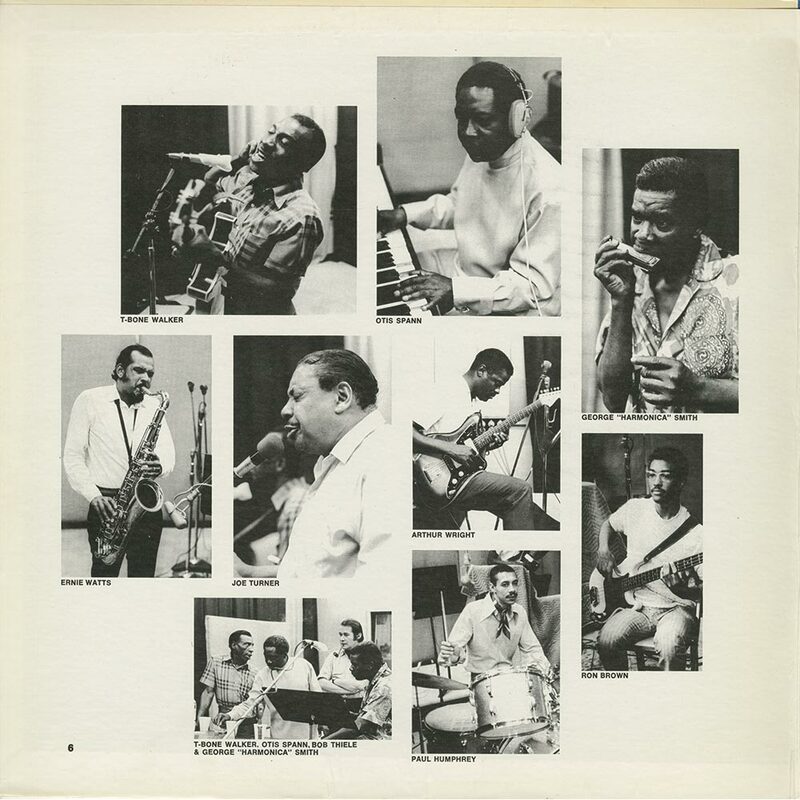 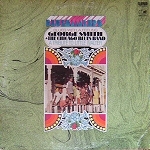 = Floating World 2816717 (2013) "With Big Walter Horton & Standing At The Crossroads"
(=) Decca XNU 375 013 (NL 197?) 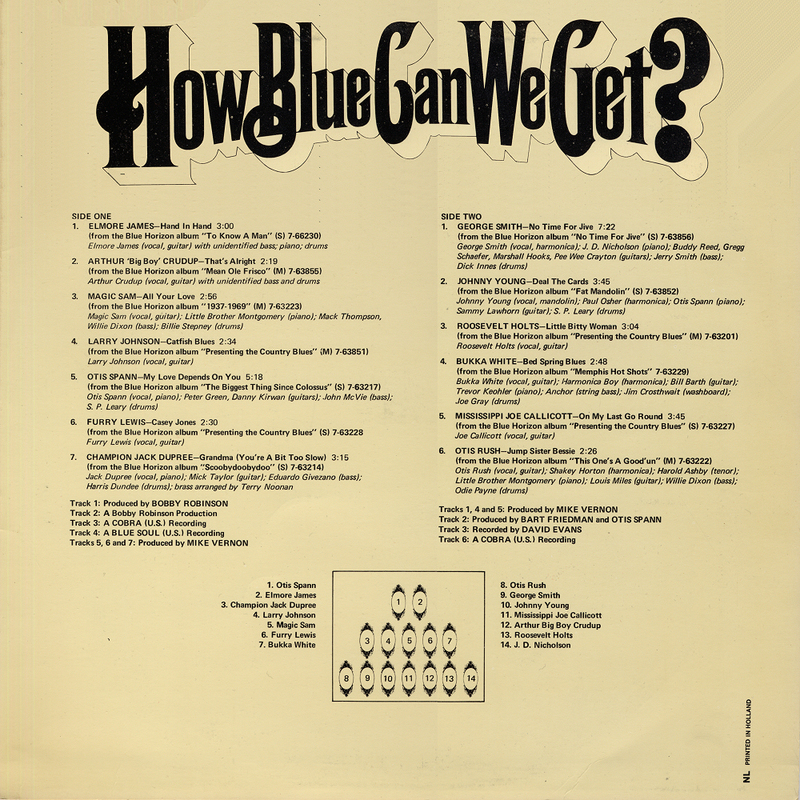 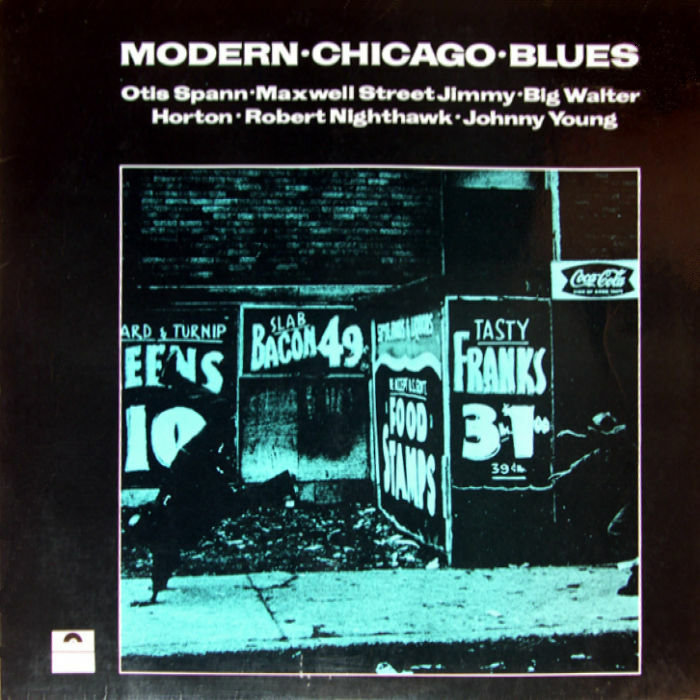 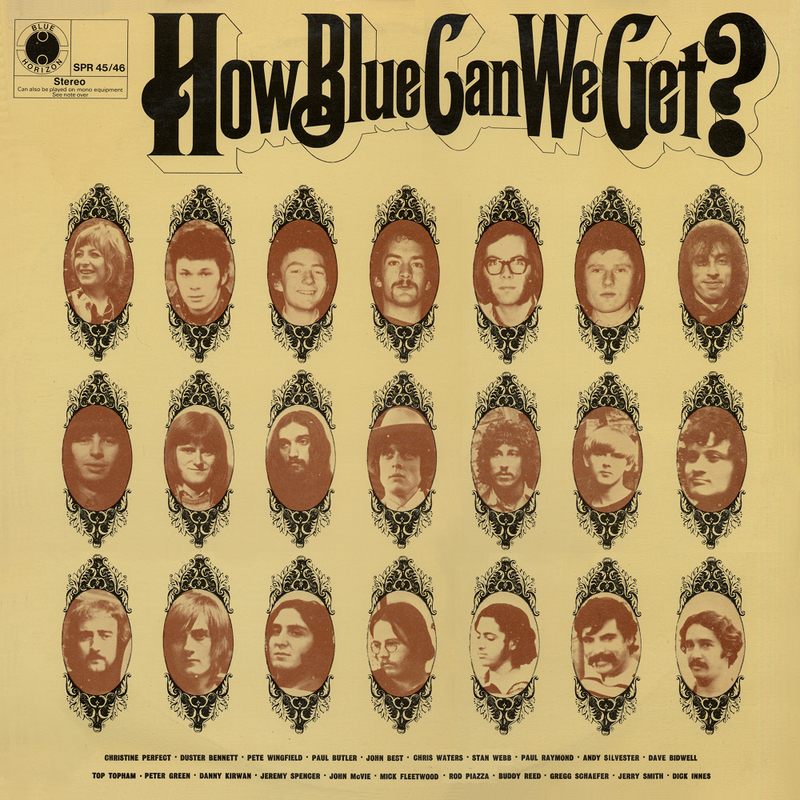 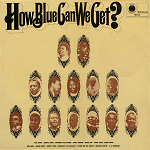 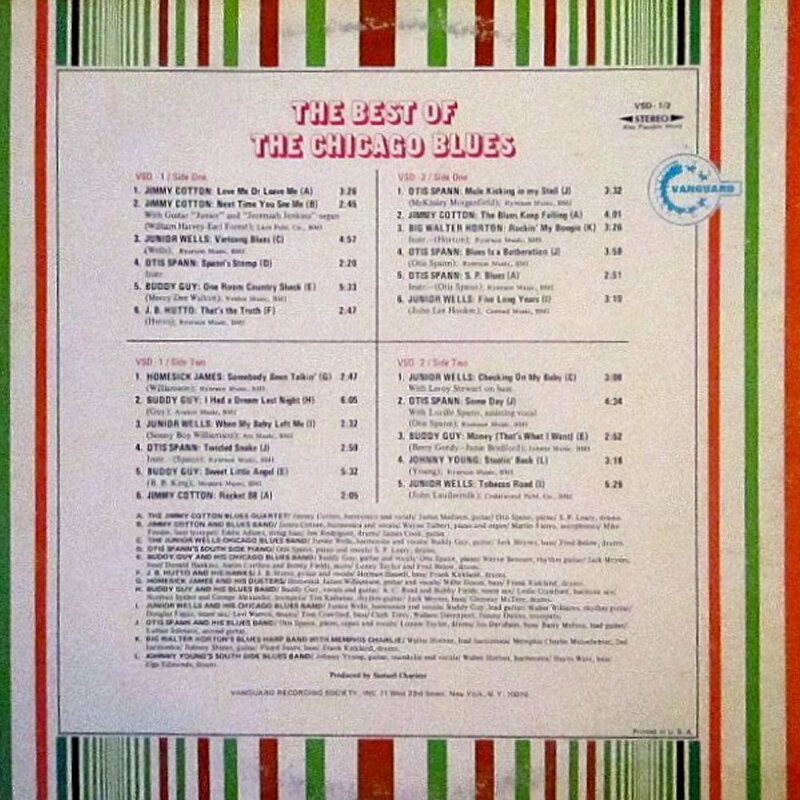 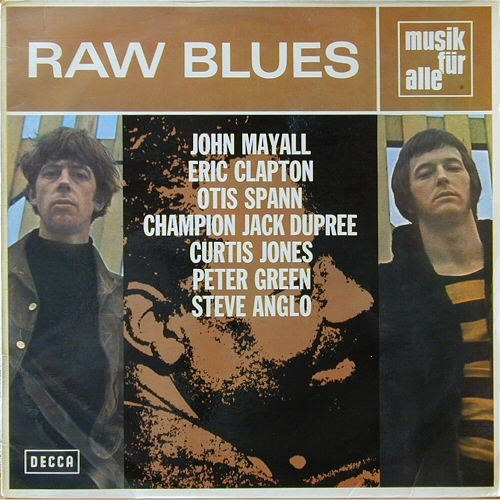 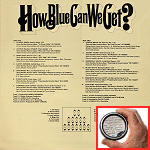 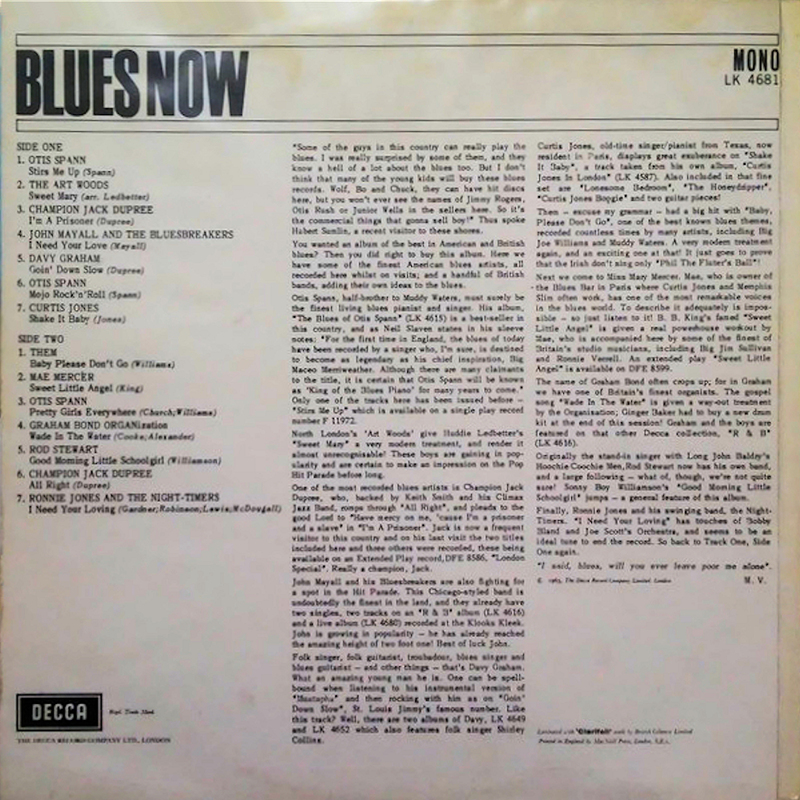 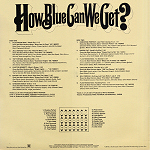 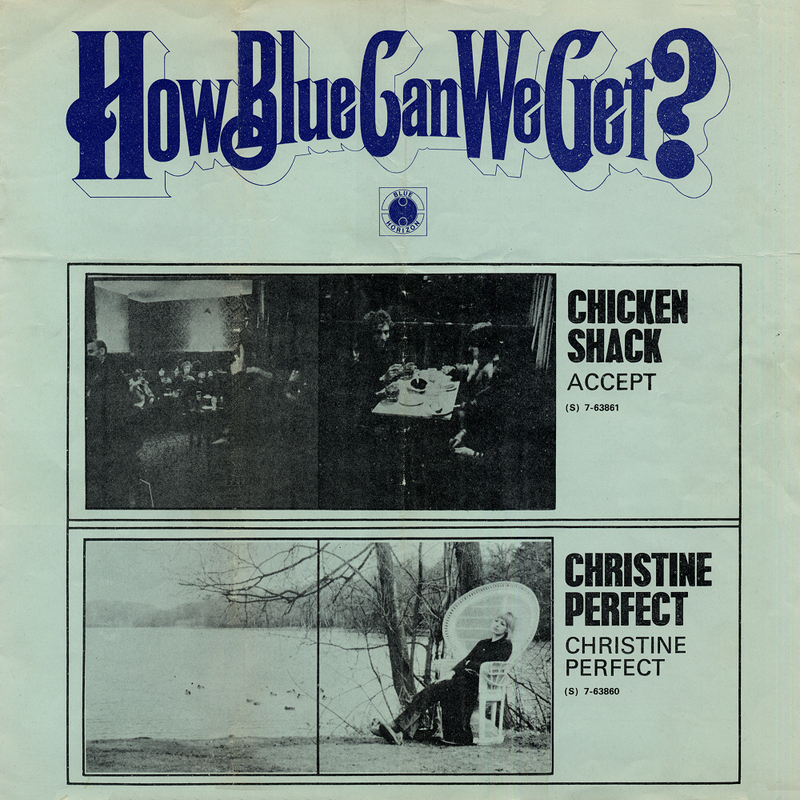 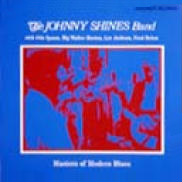 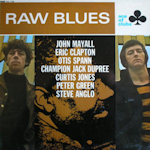 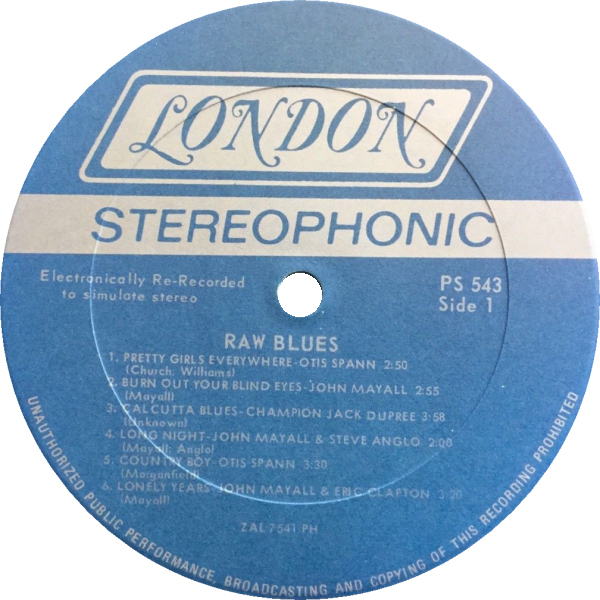 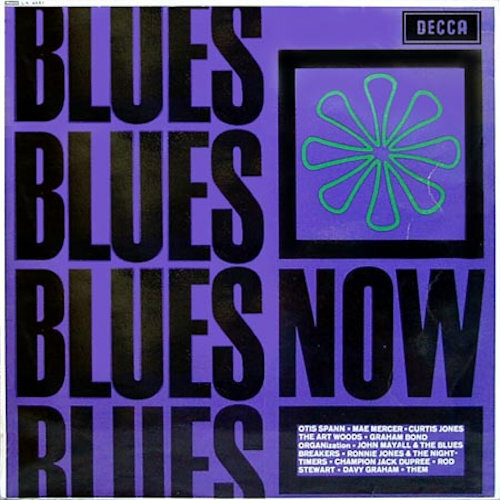 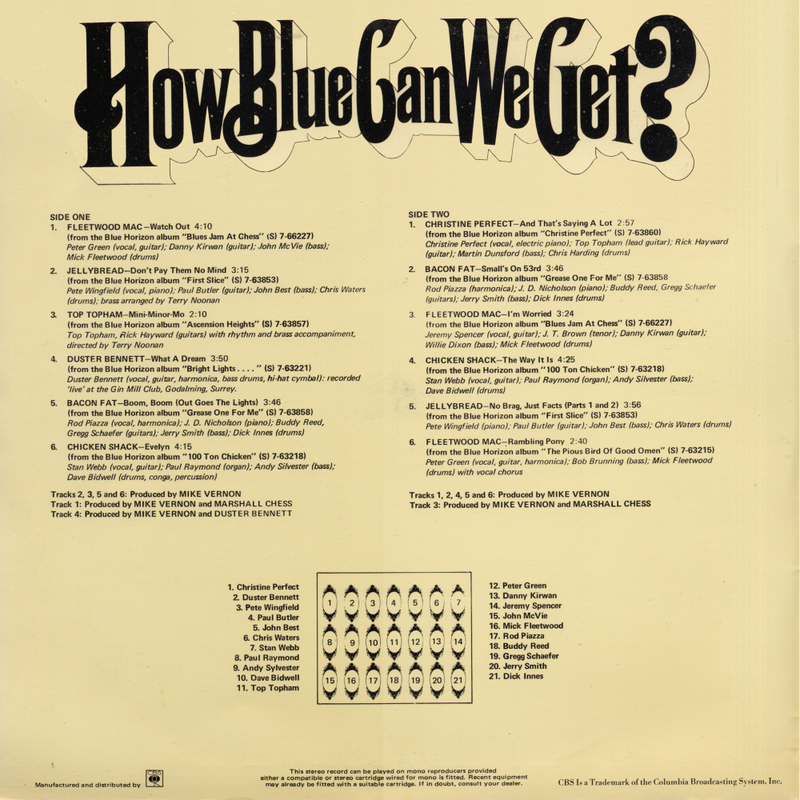 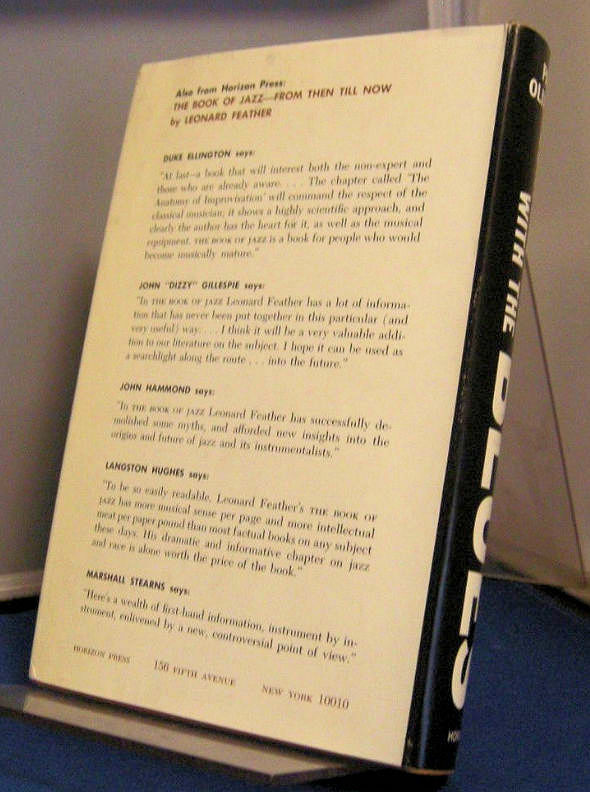 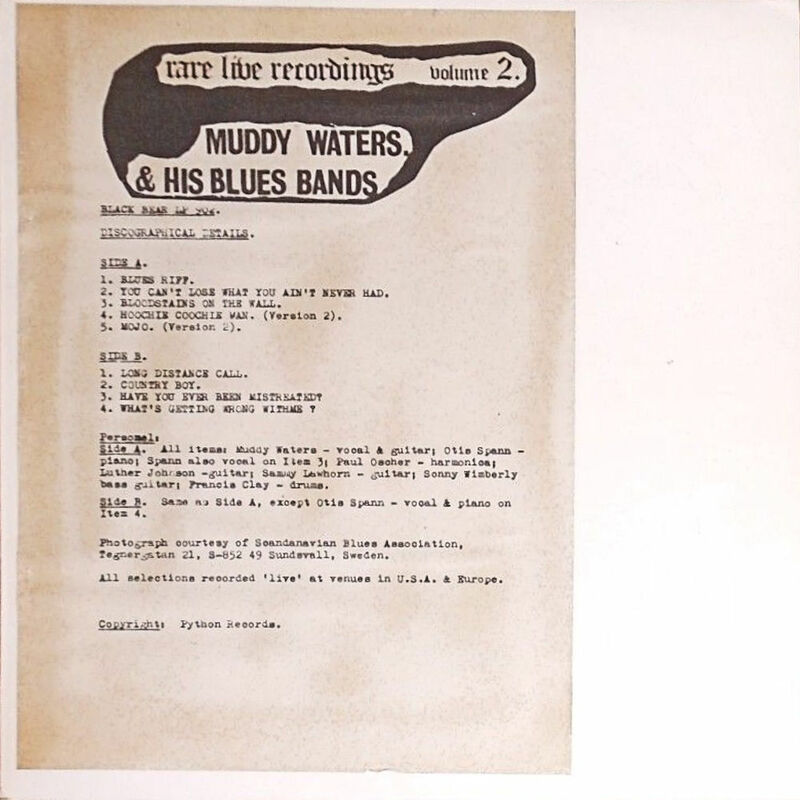 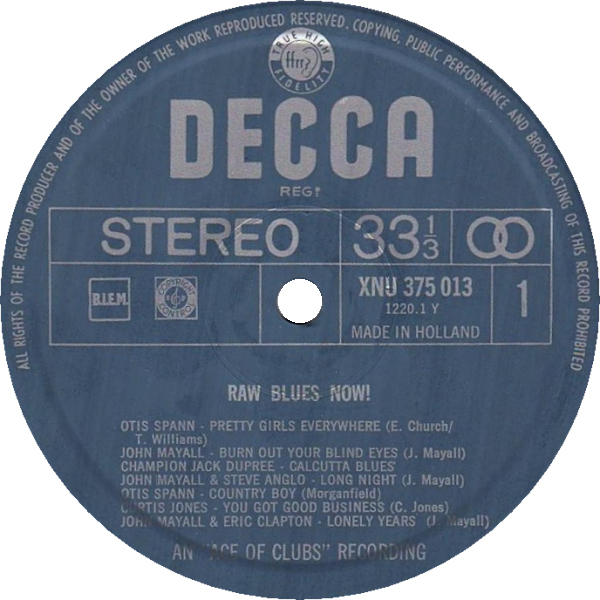 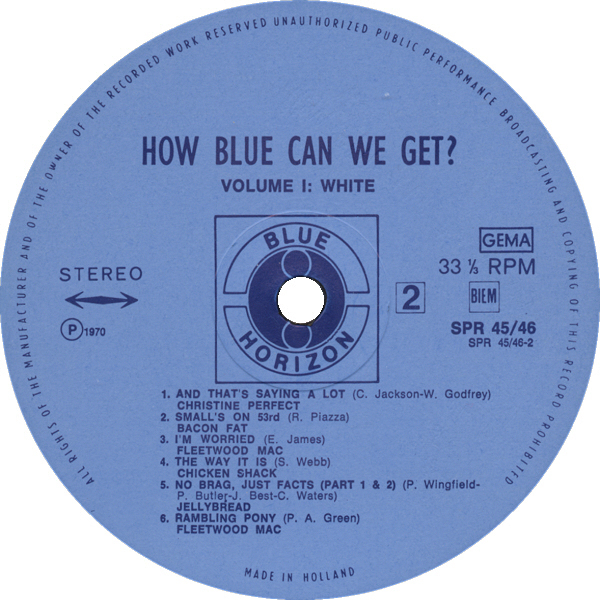 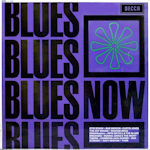 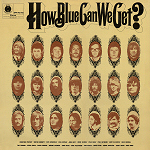 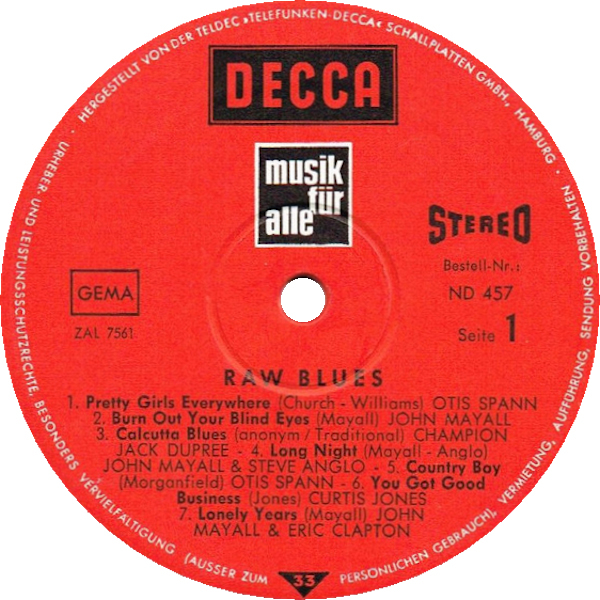 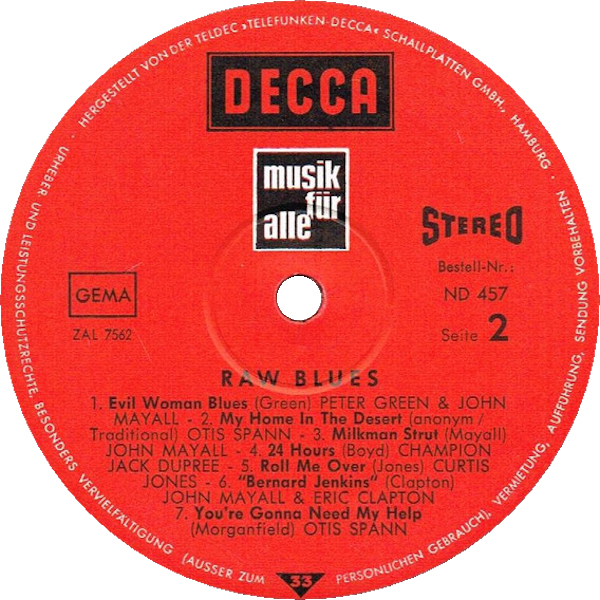 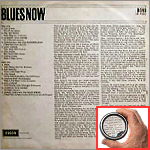 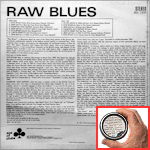 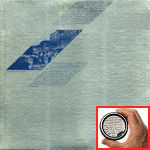 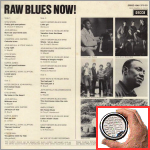 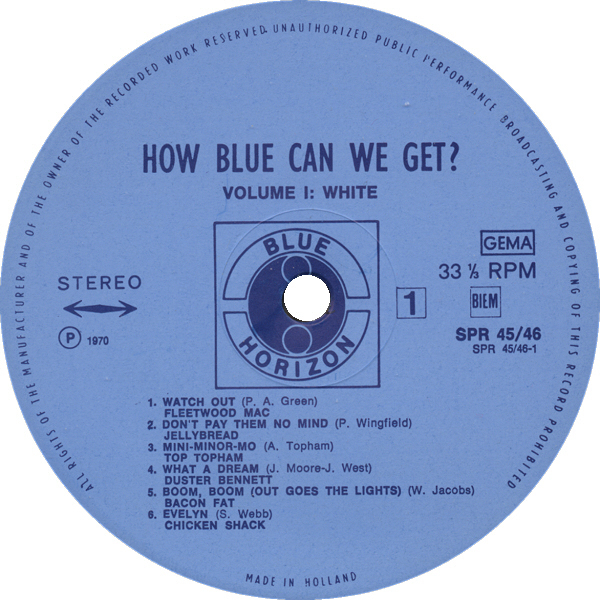 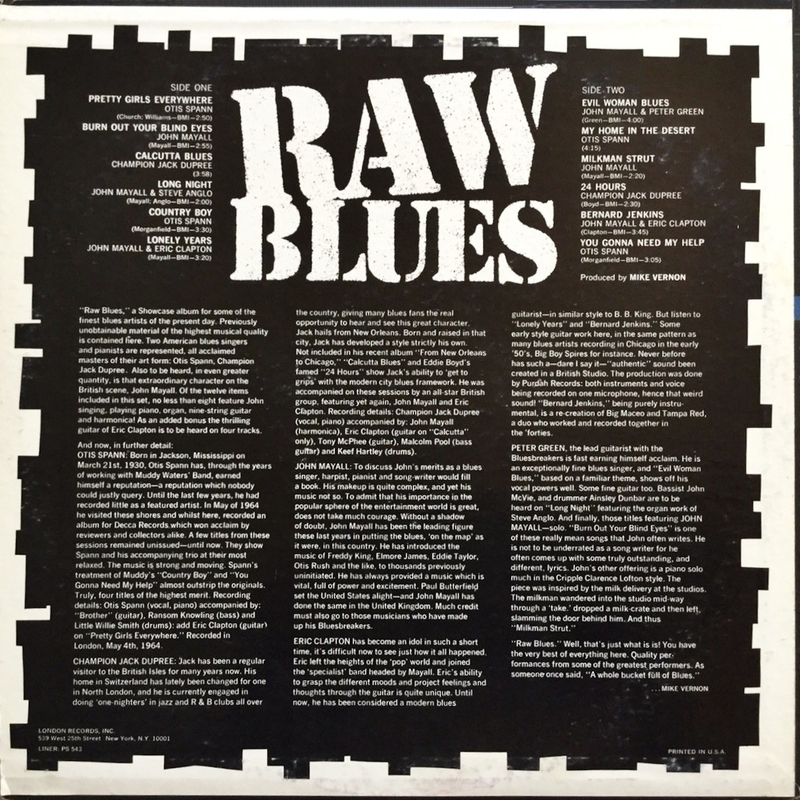 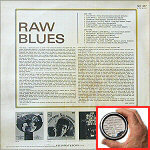 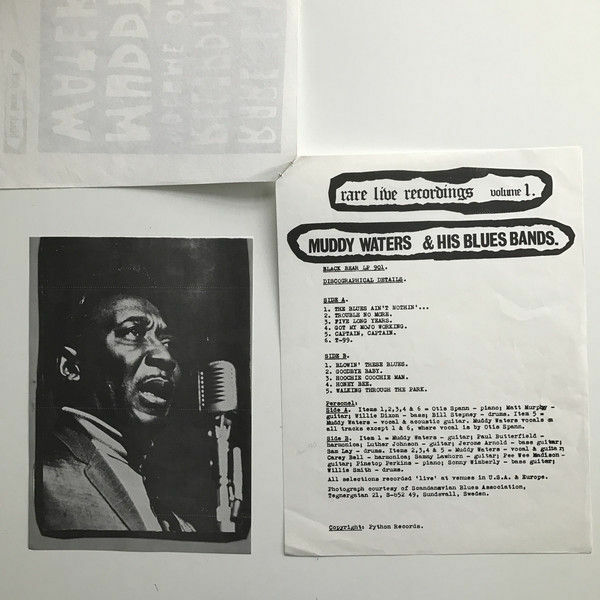 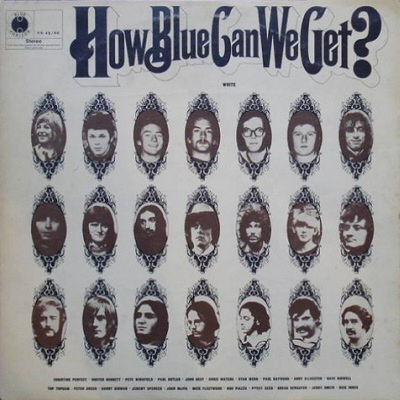 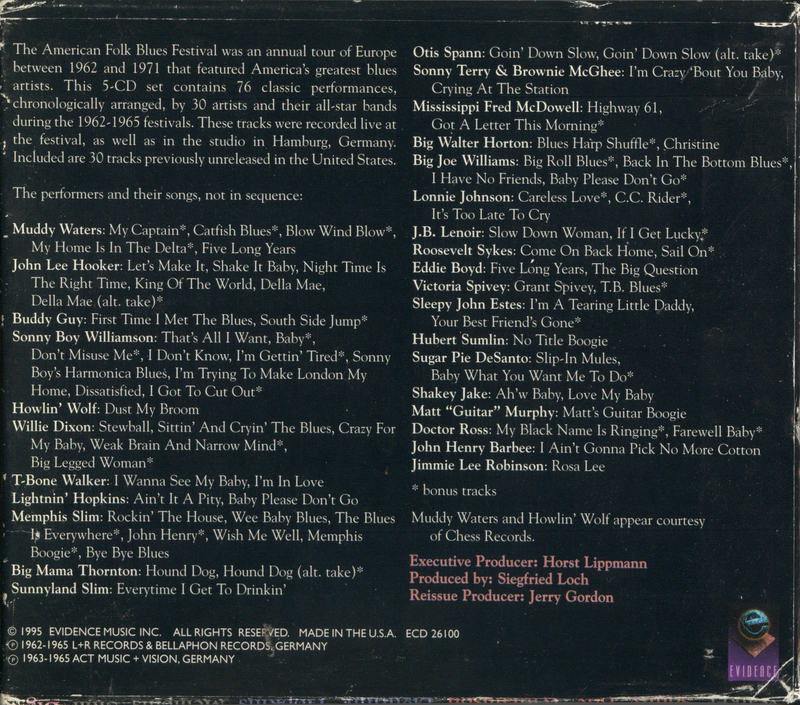 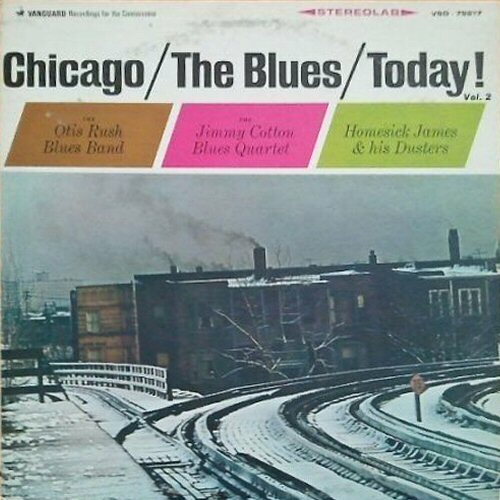 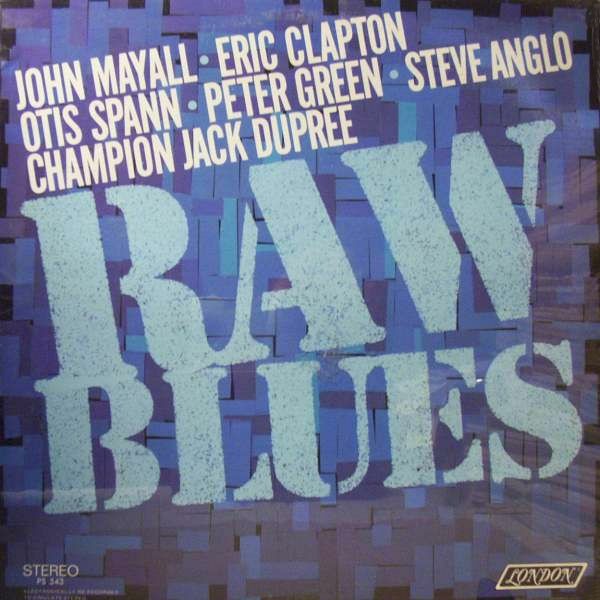 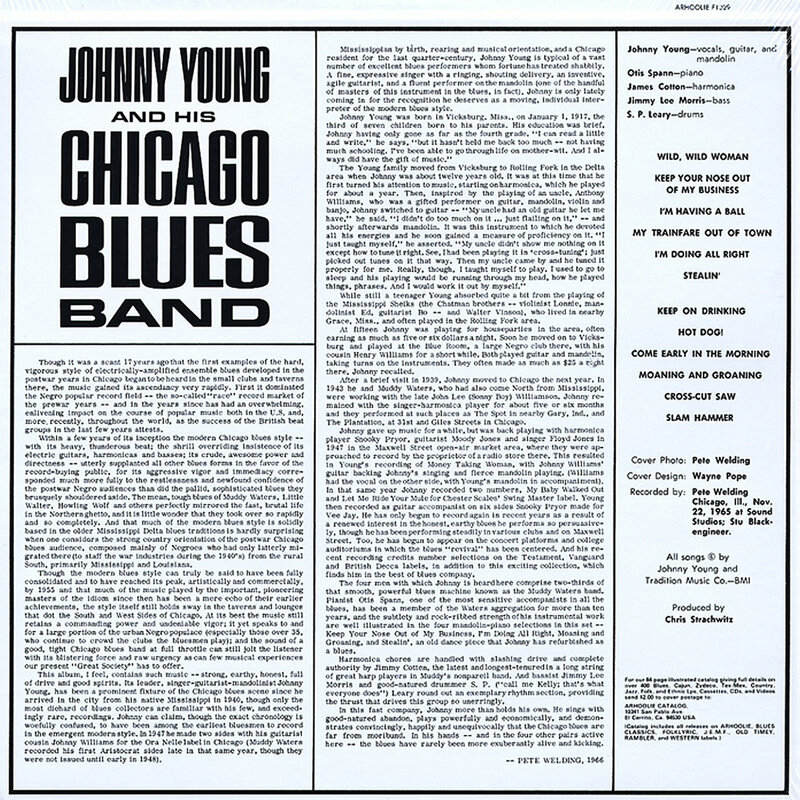 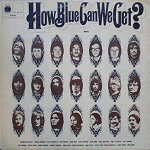 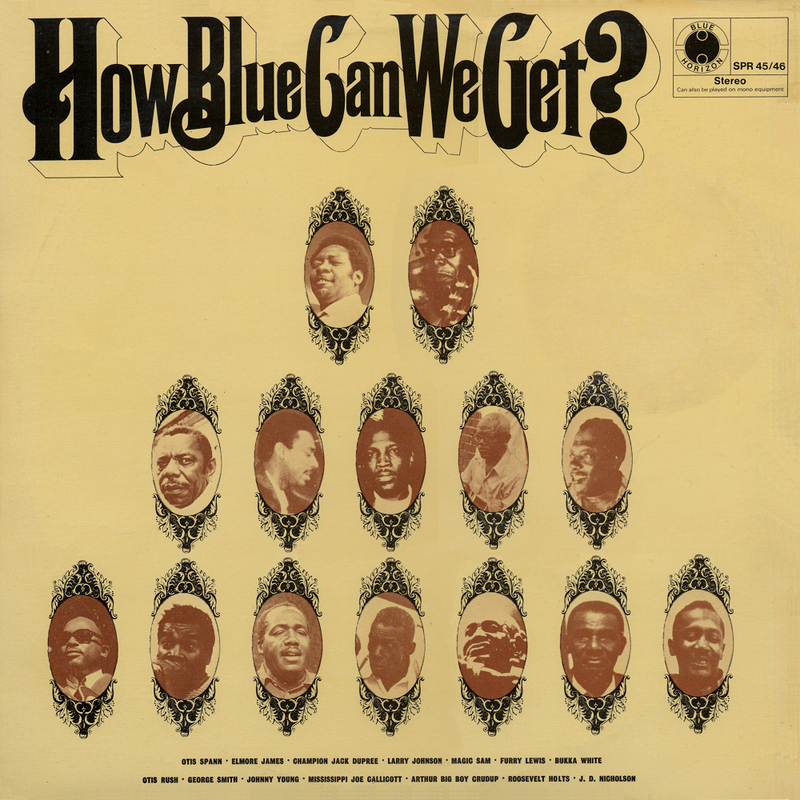 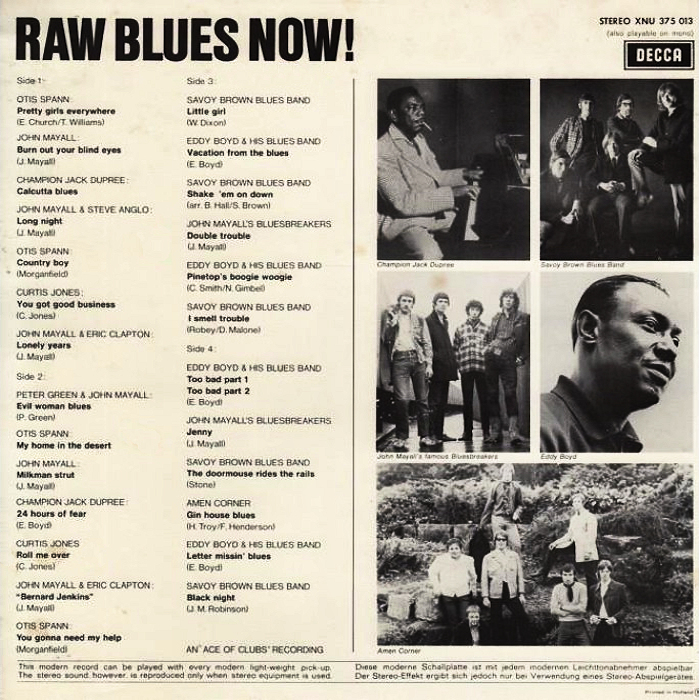 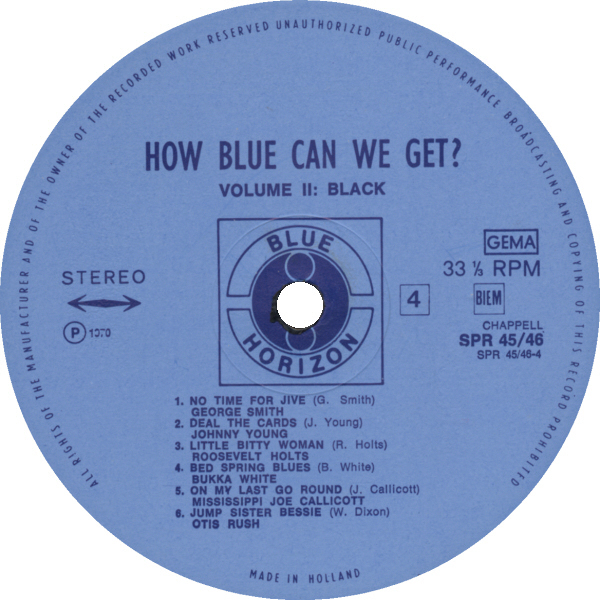 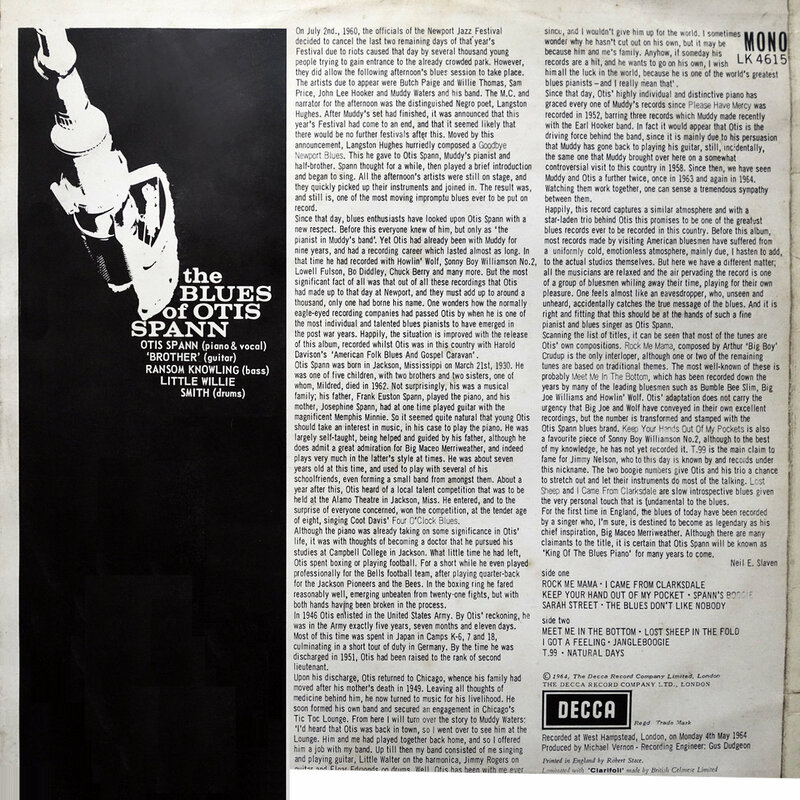 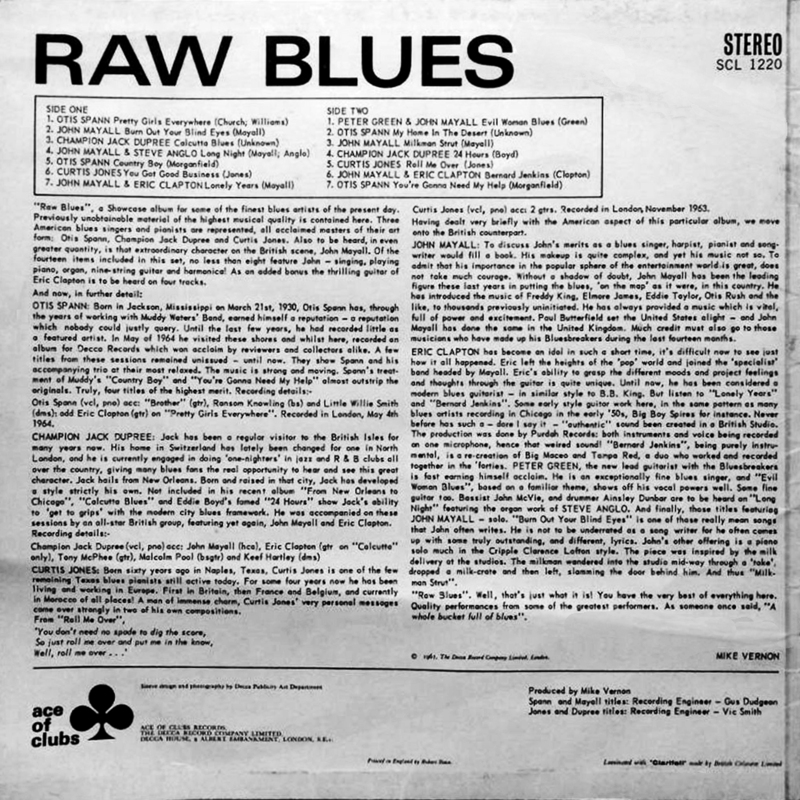 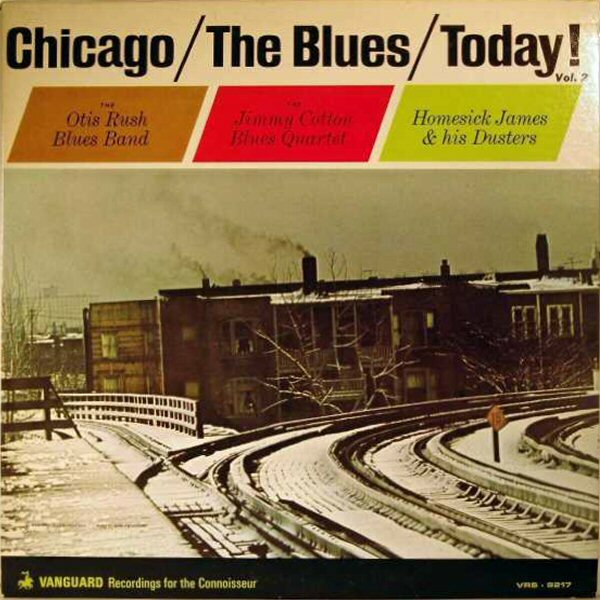 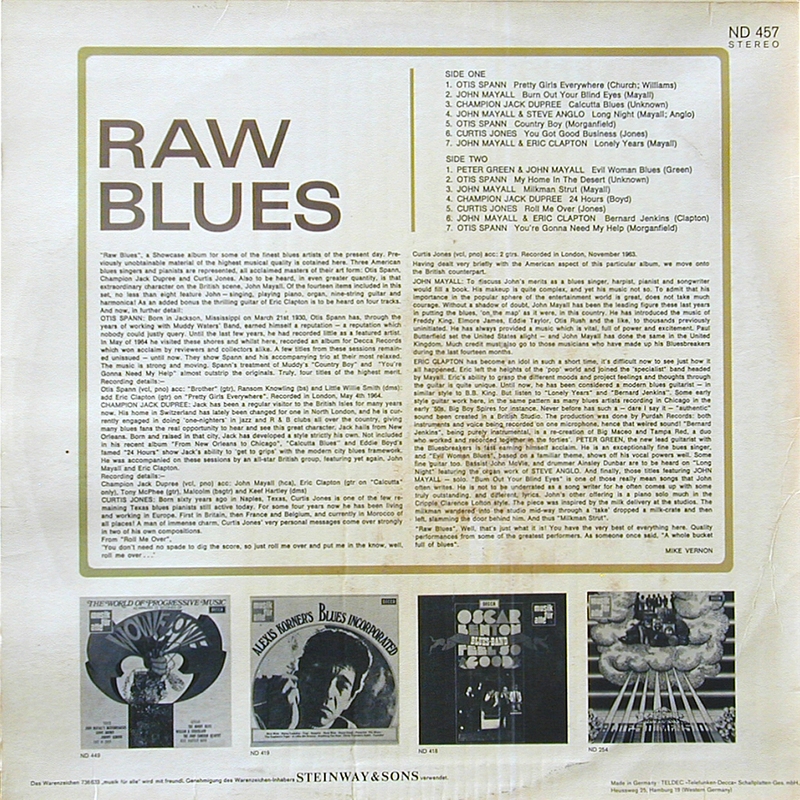 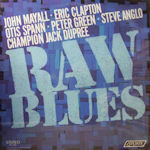 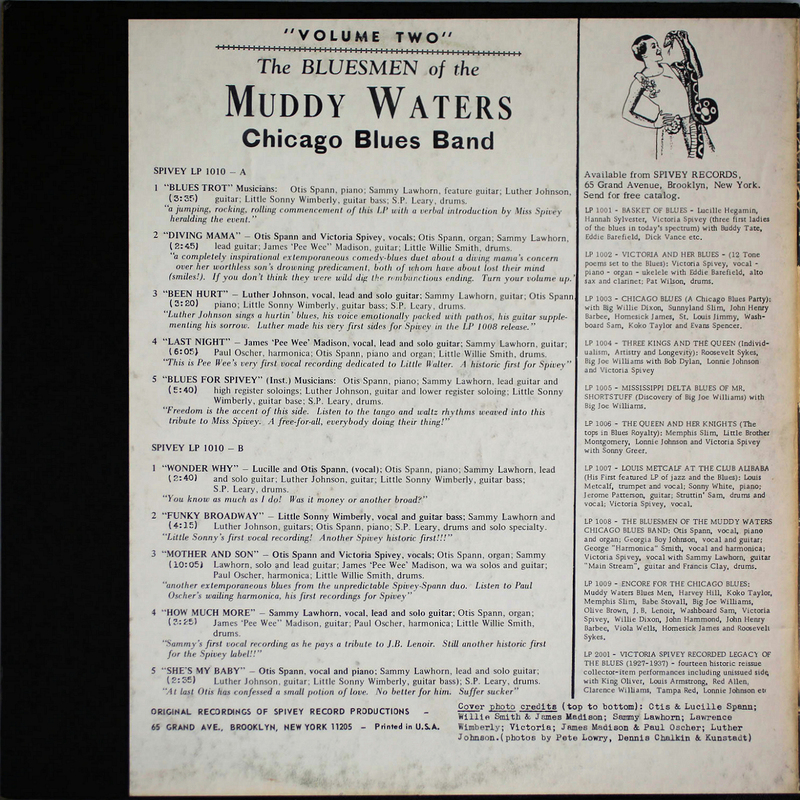 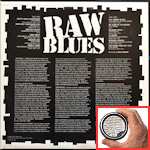 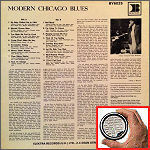 "Raw Blues Now"
22 1970 How Blue Can We Get? 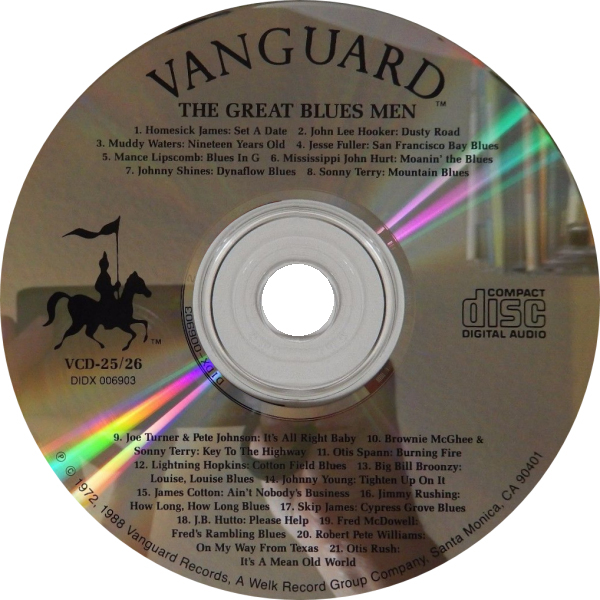 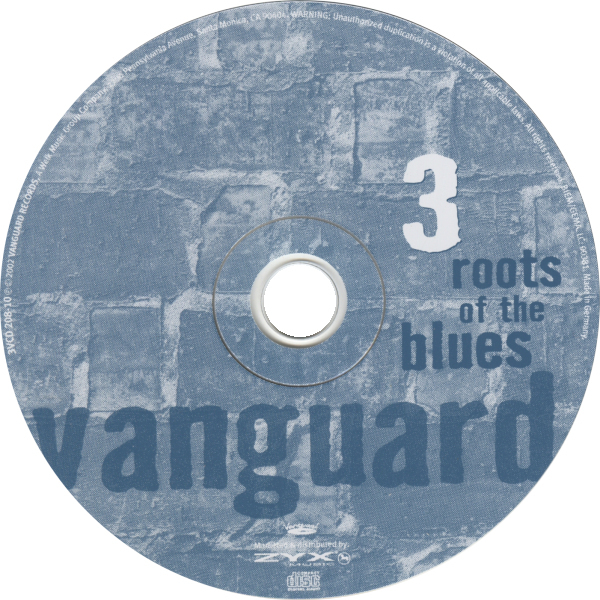 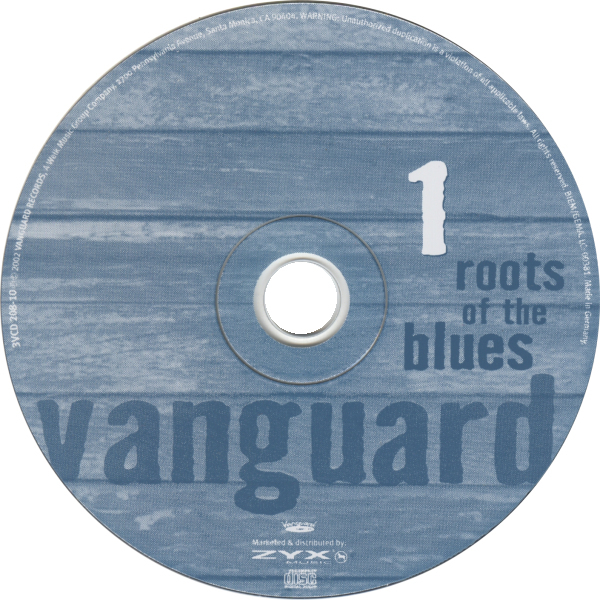 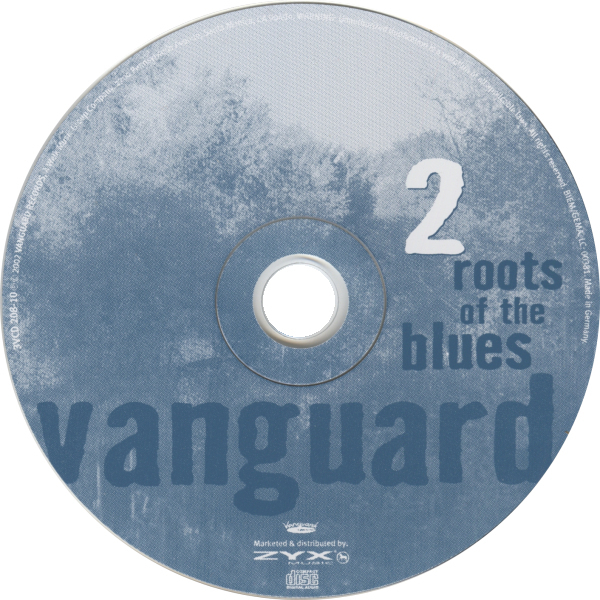 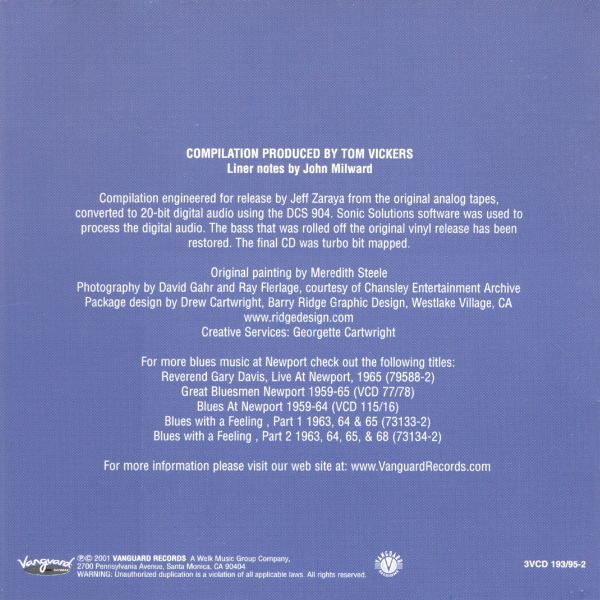 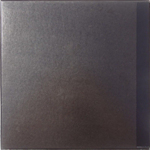 (=) Vanguard CD 79537 (US 1999) "The Best of the Vanguard Years"
Fontana 6434 904 (Germany 197?) 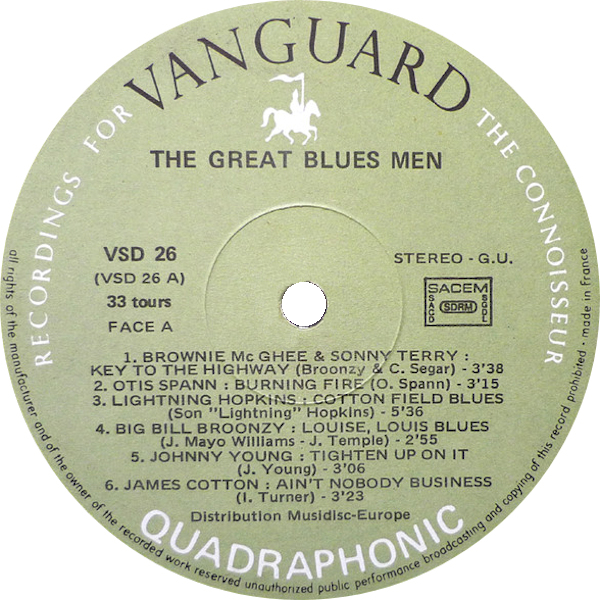 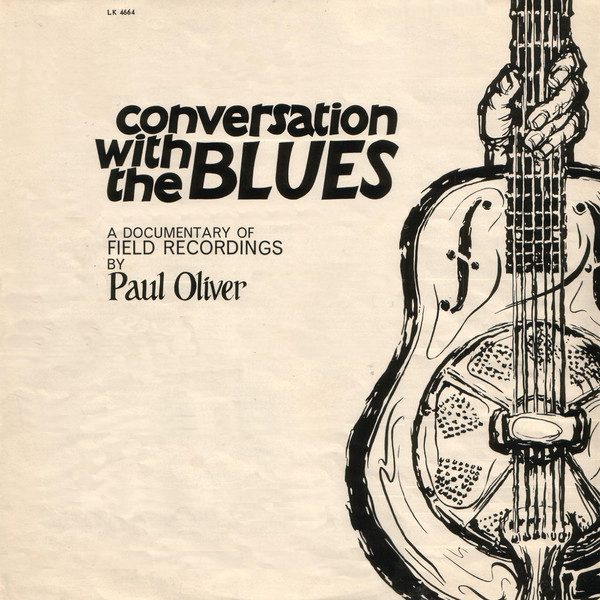 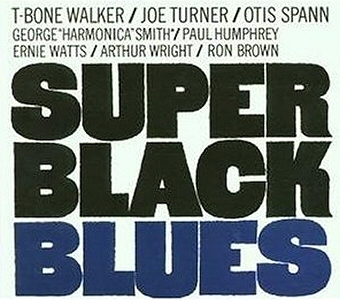 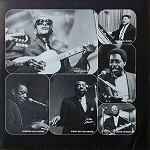 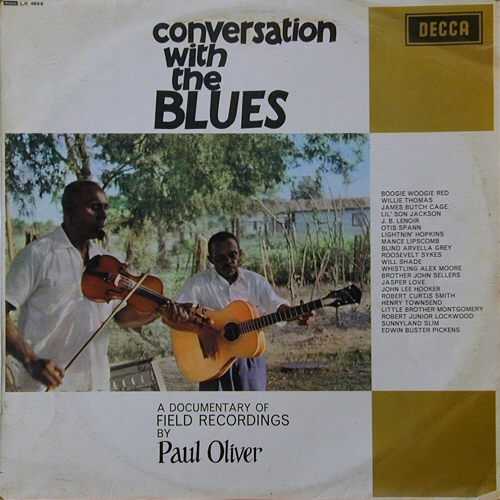 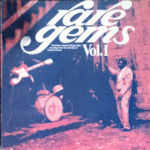 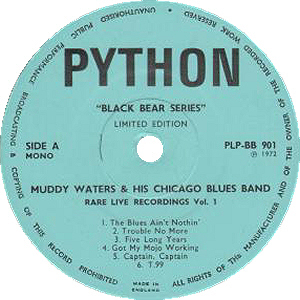 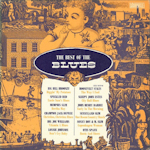 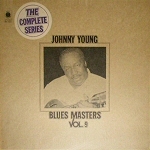 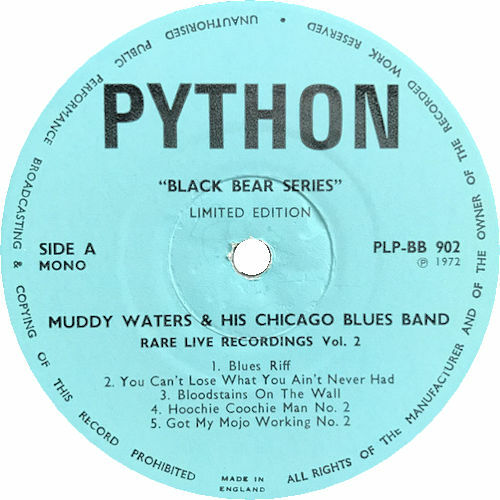 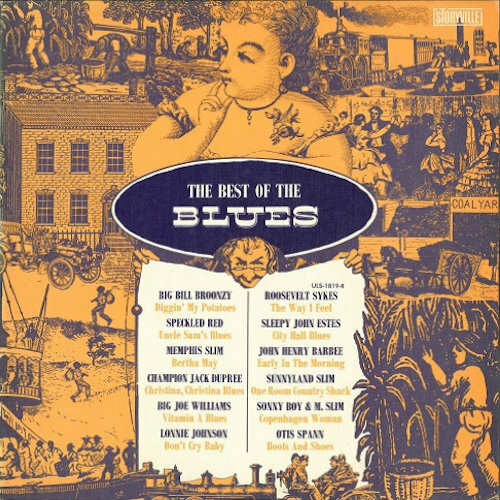 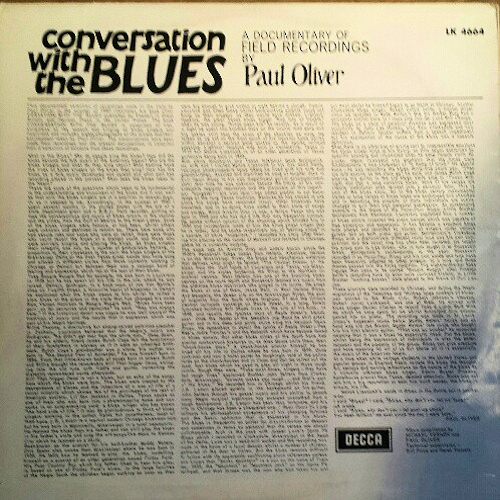 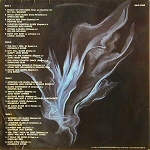 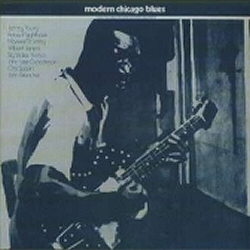 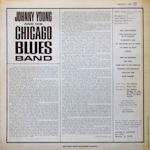 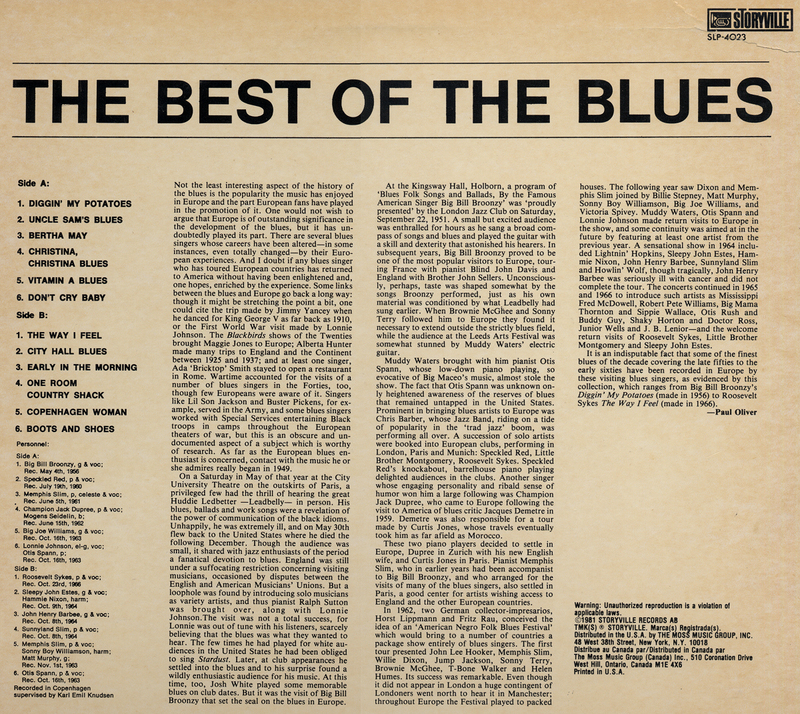 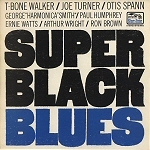 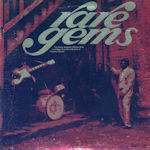 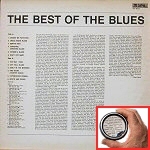 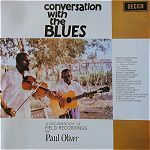 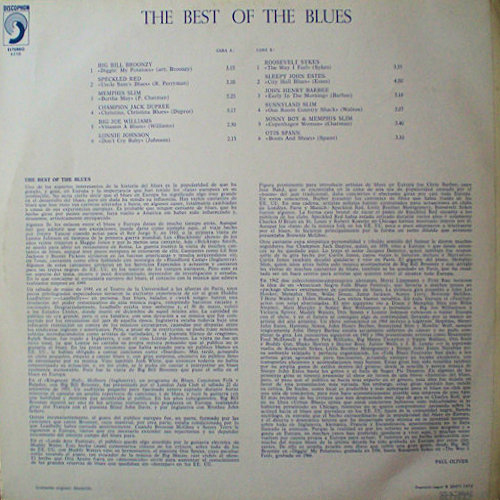 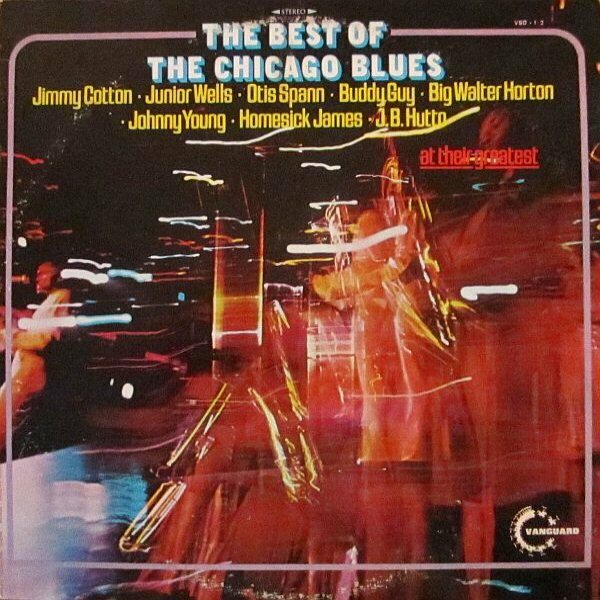 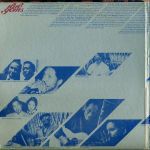 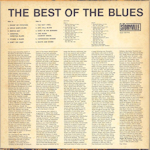 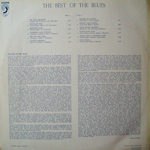 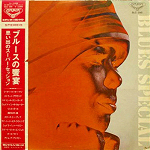 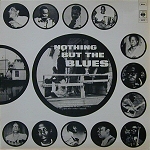 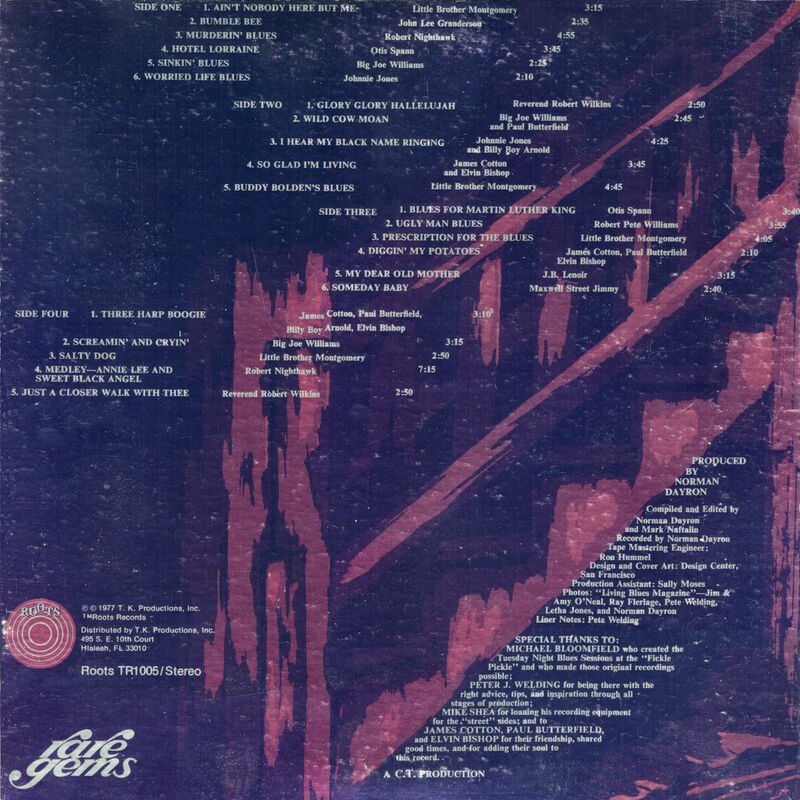 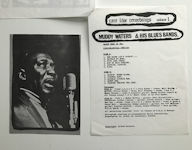 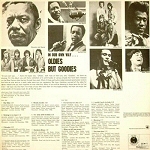 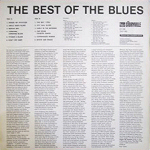 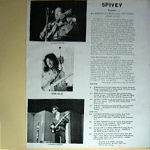 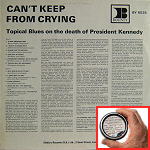 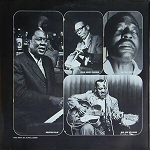 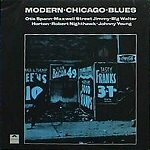 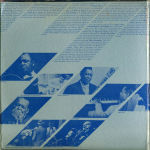 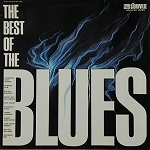 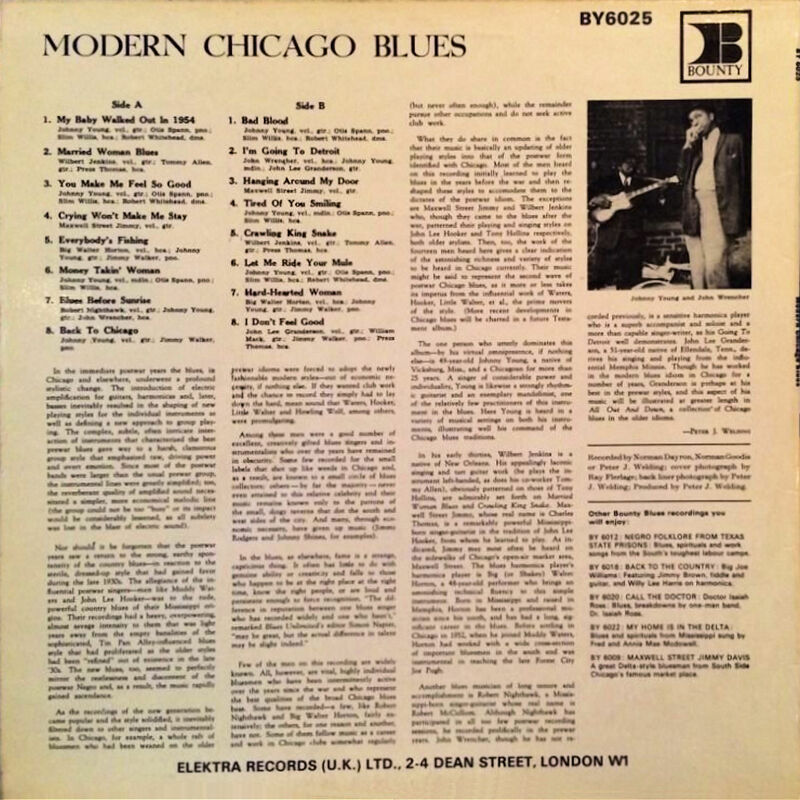 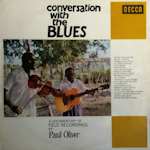 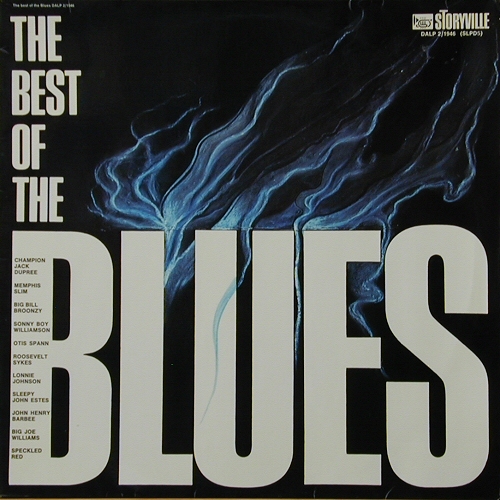 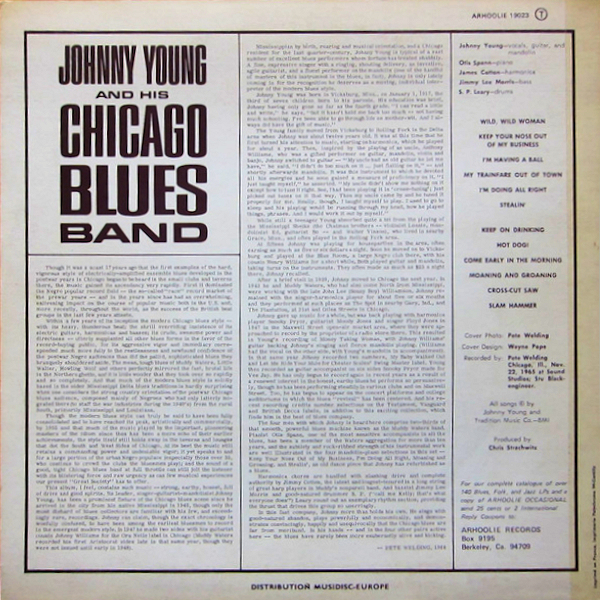 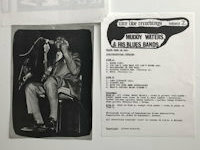 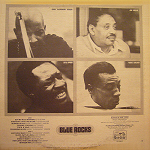 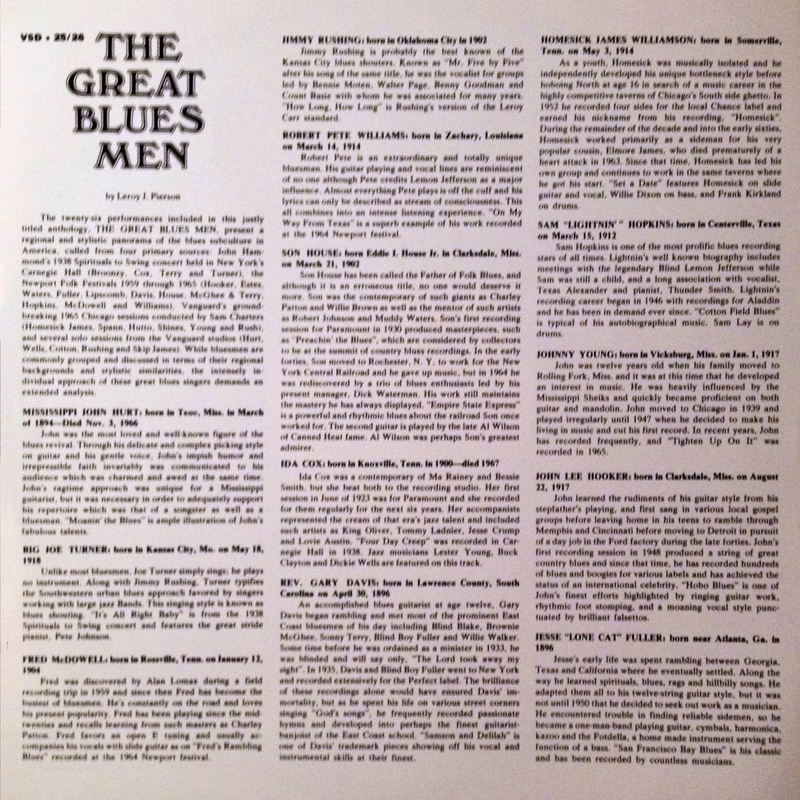 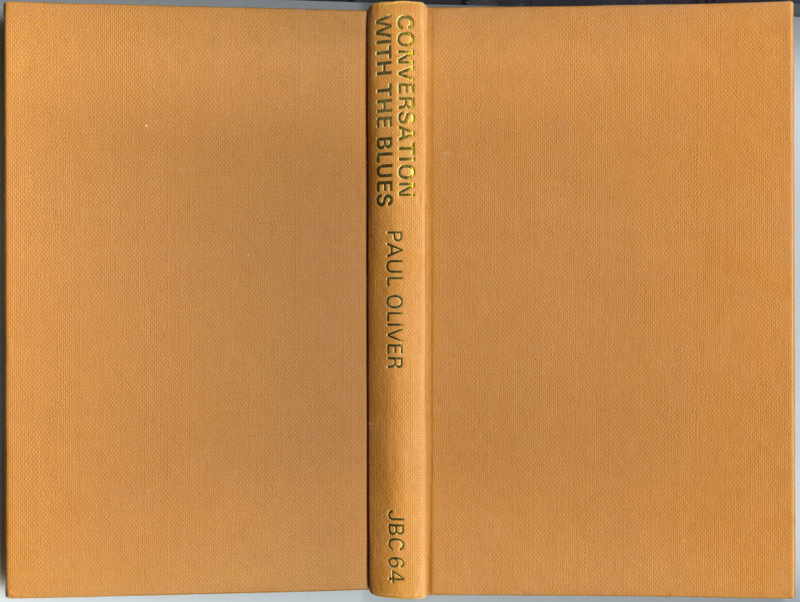 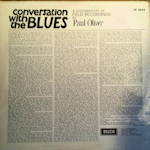 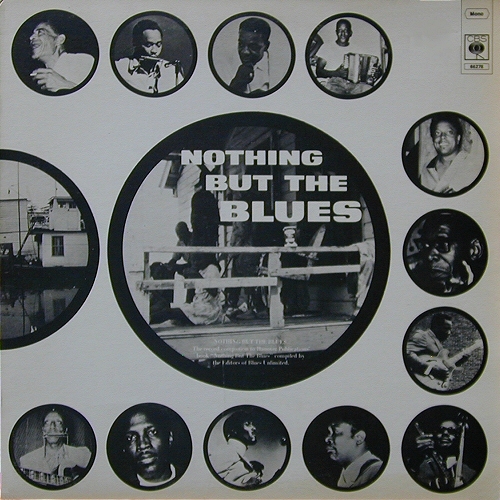 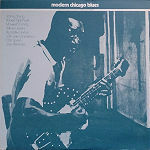 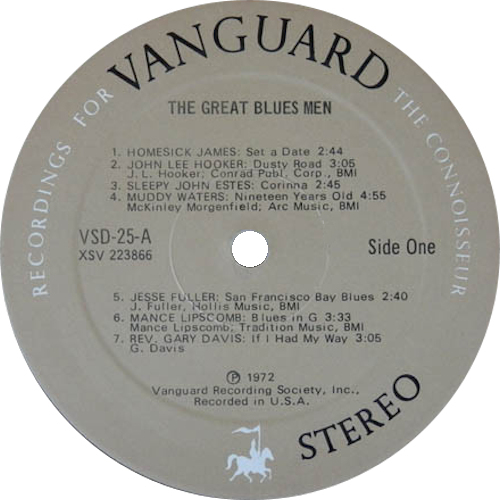 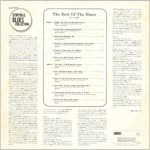 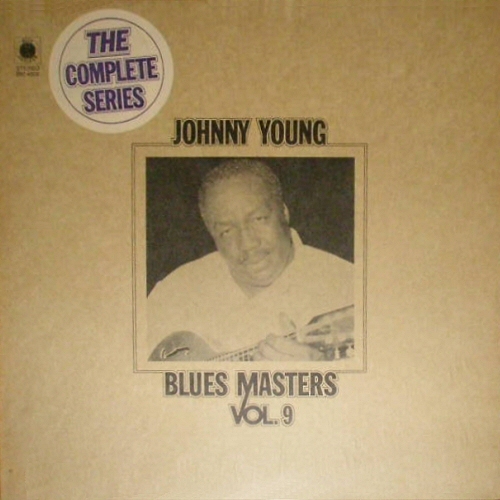 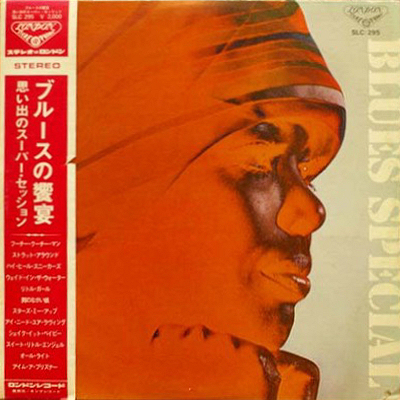 "The Blues Collection"
= BYG 529512 (Fr 1971) "Pop Blues Vol. 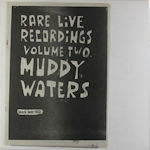 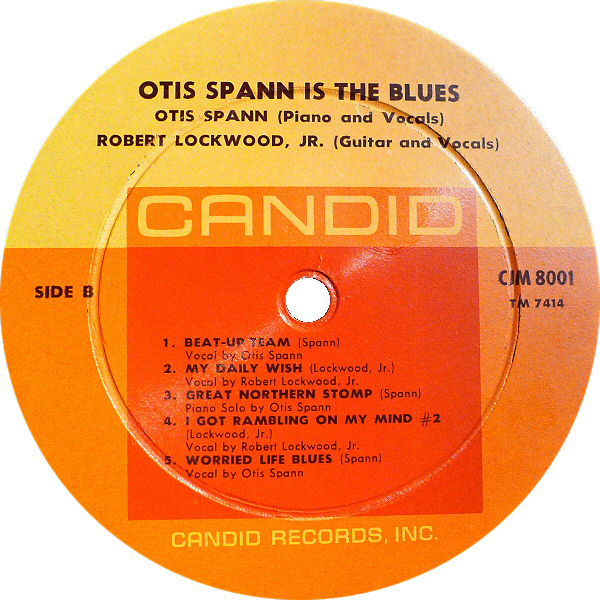 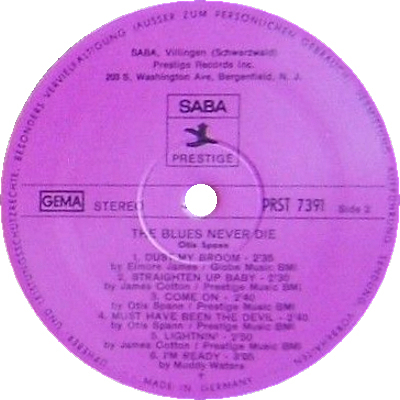 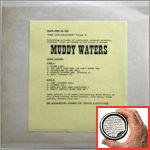 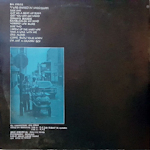 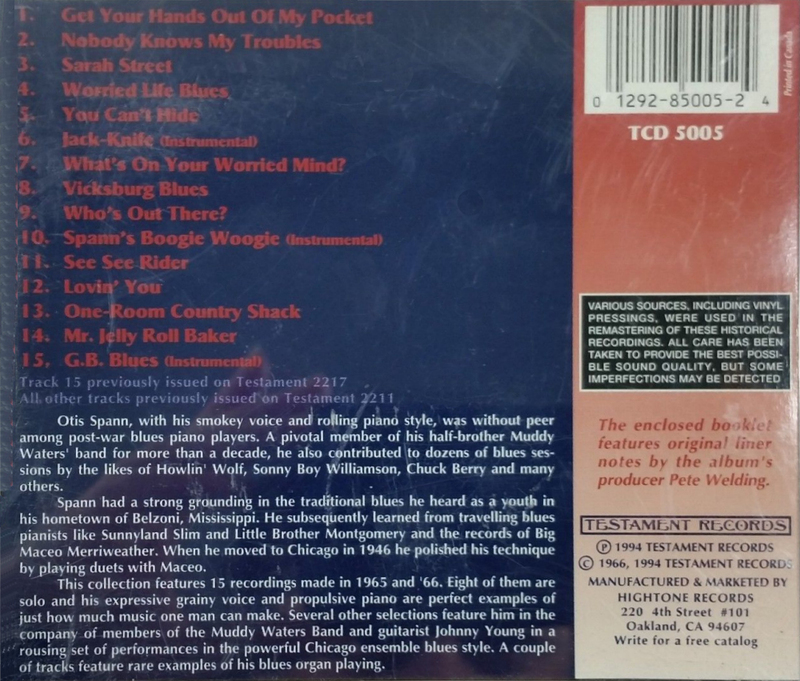 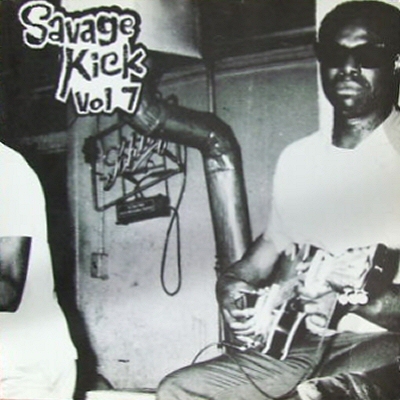 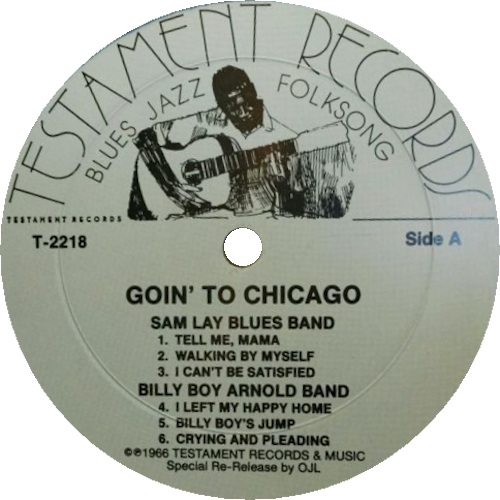 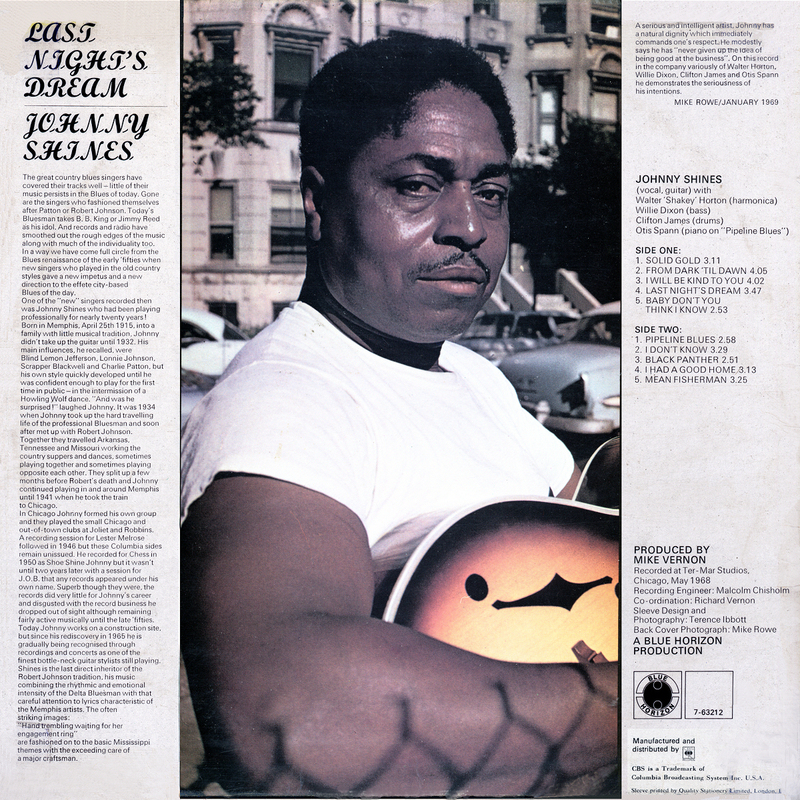 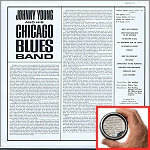 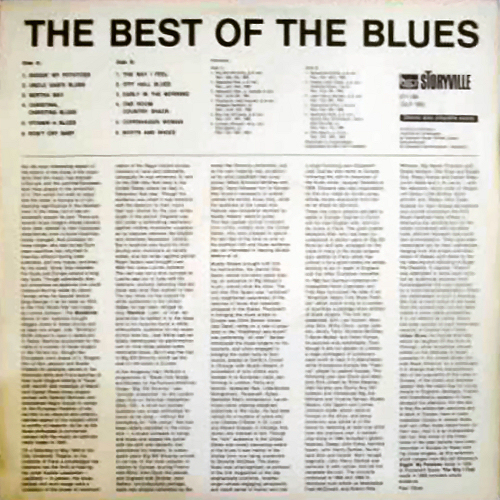 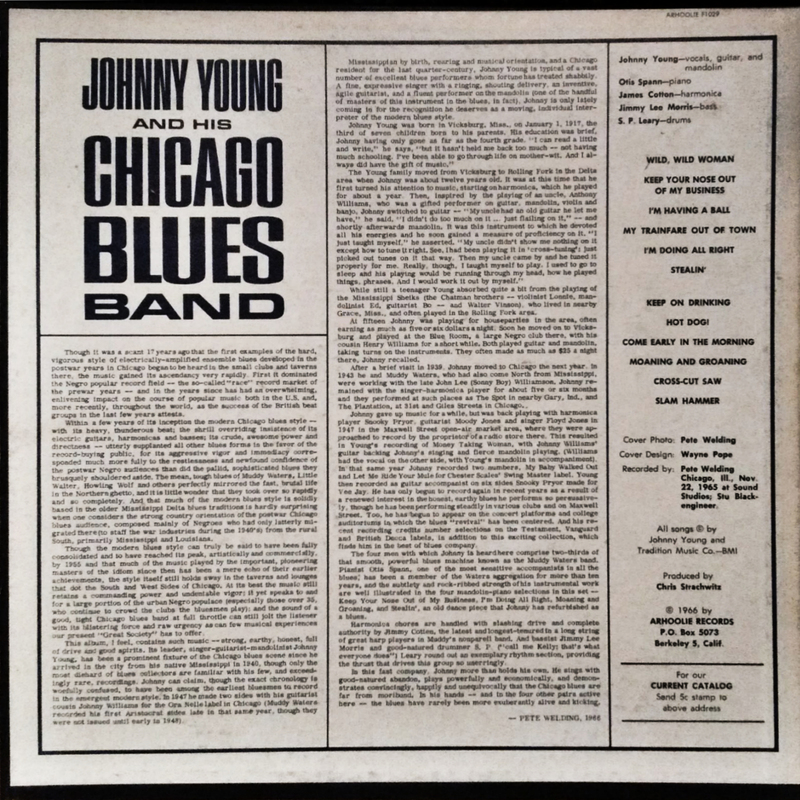 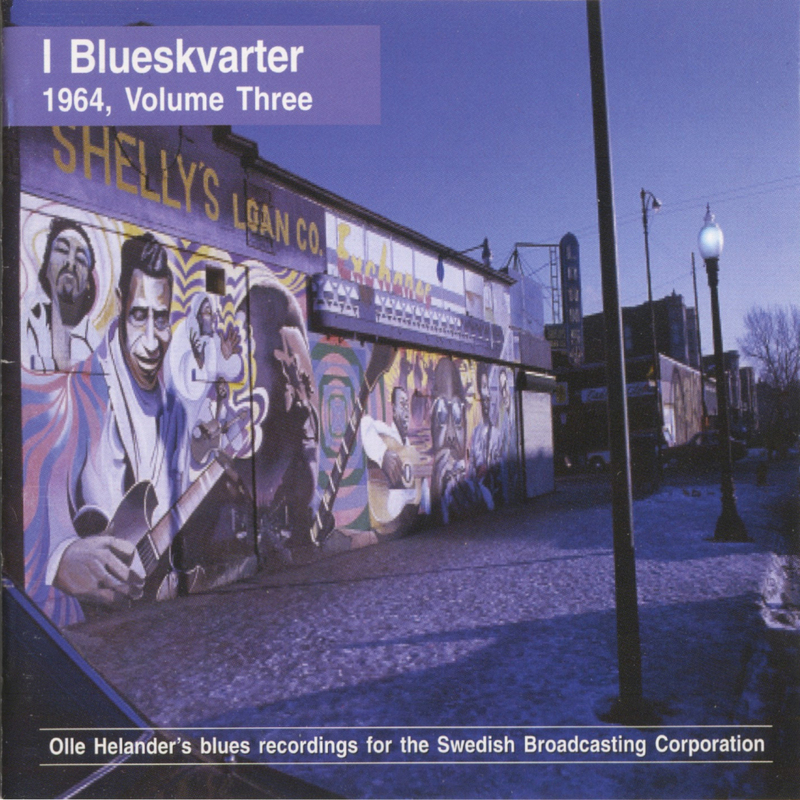 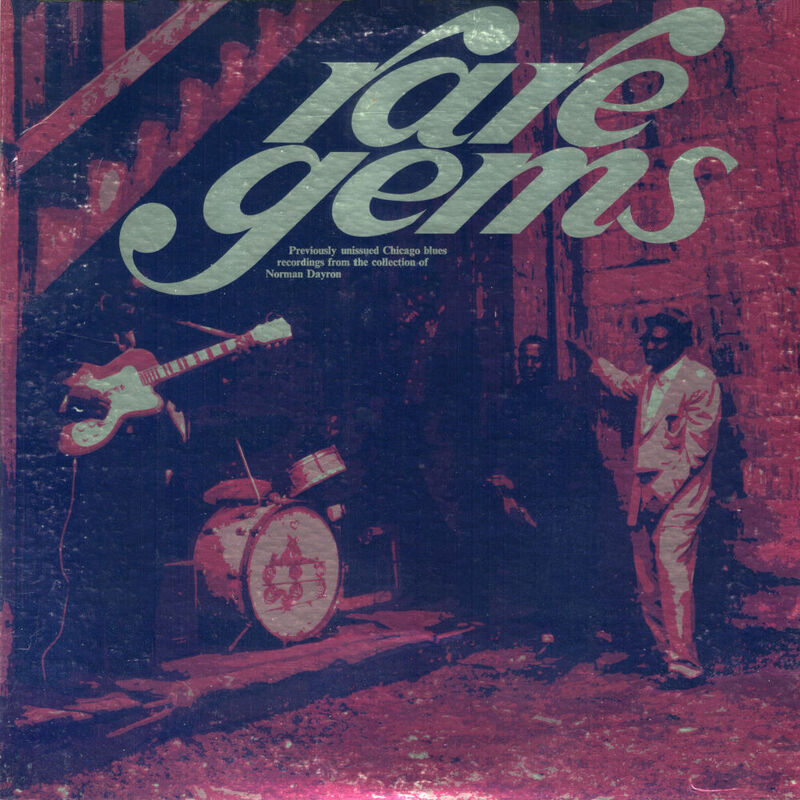 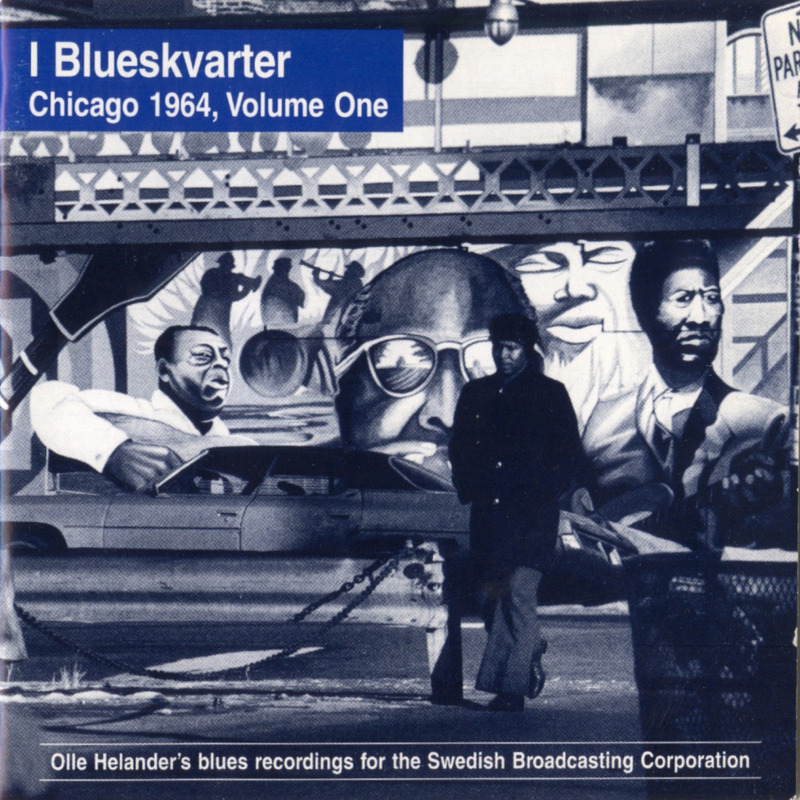 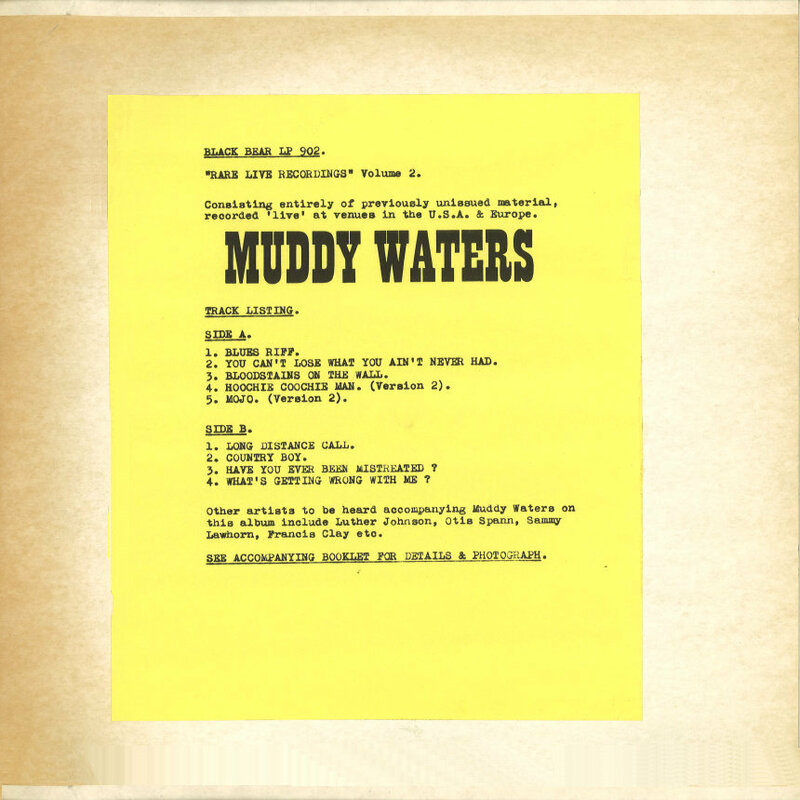 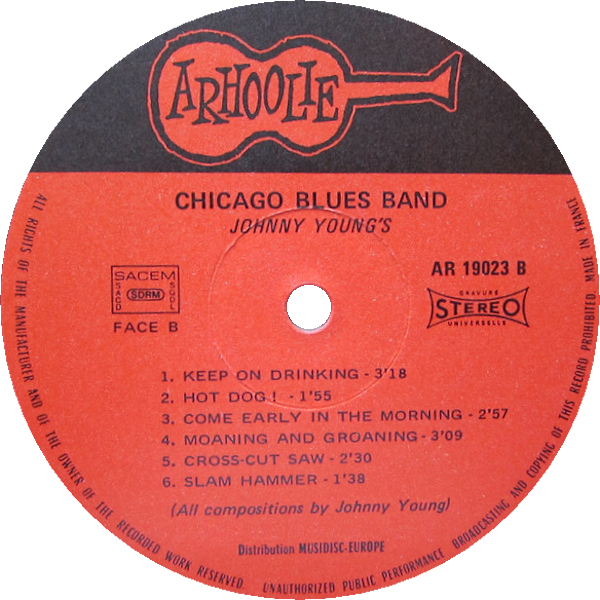 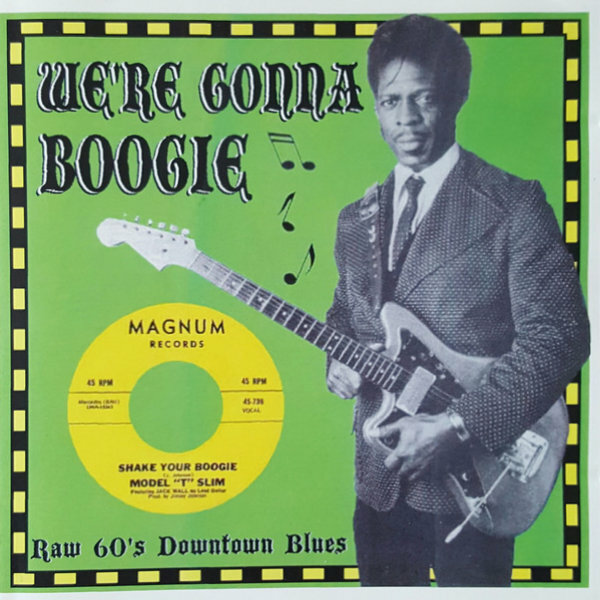 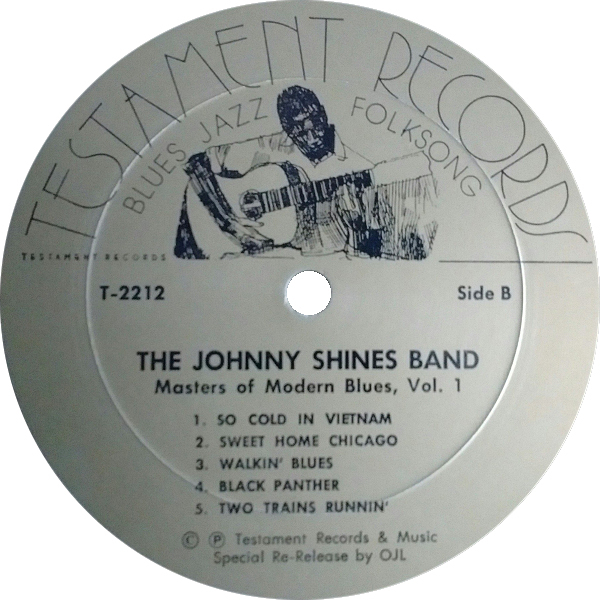 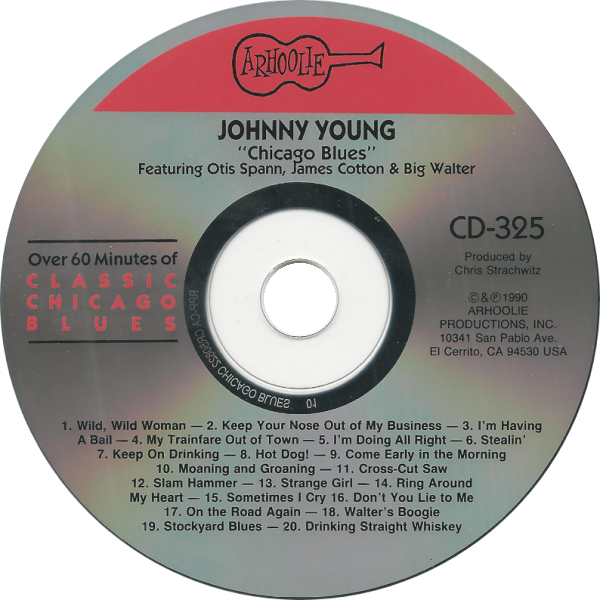 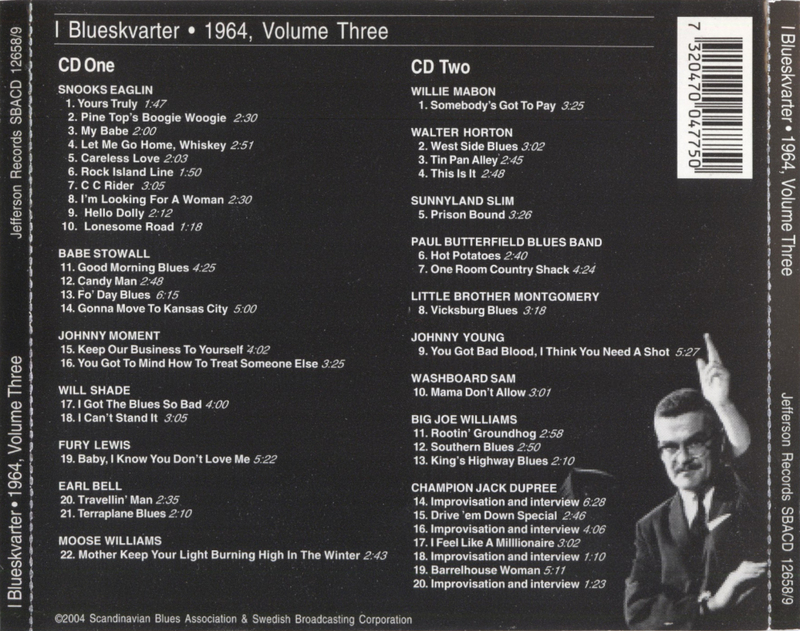 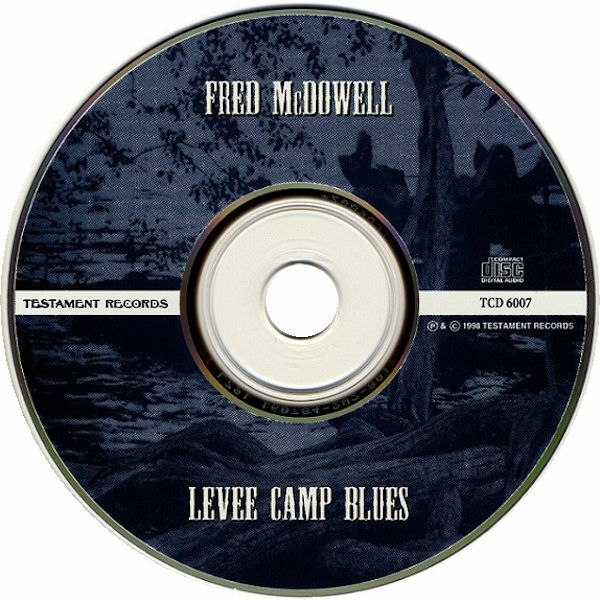 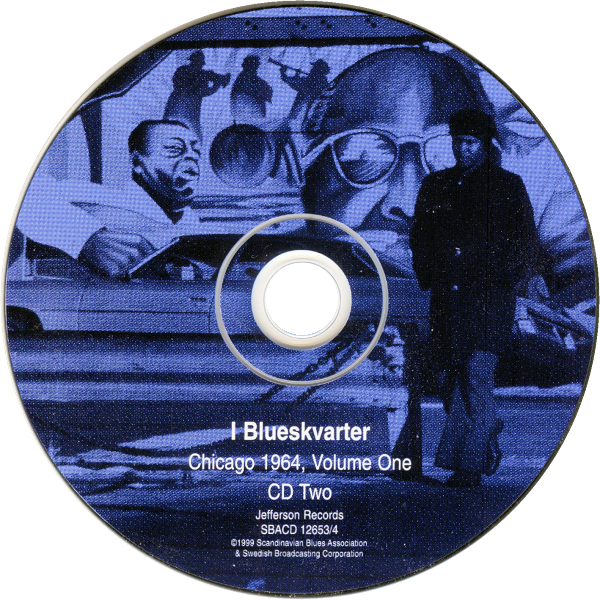 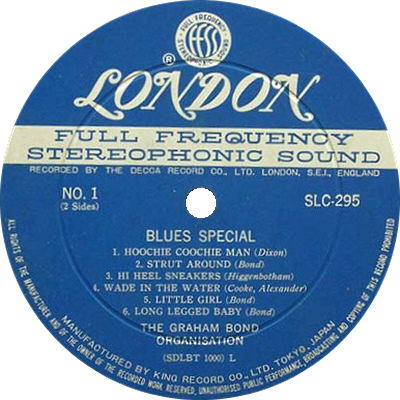 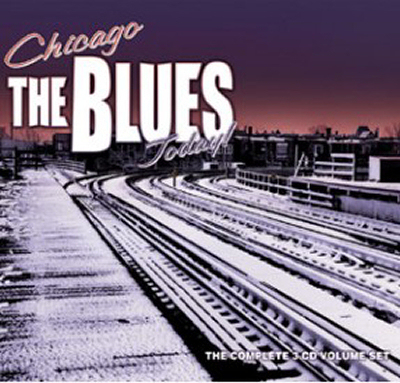 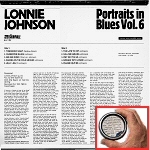 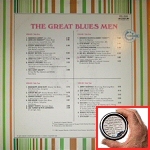 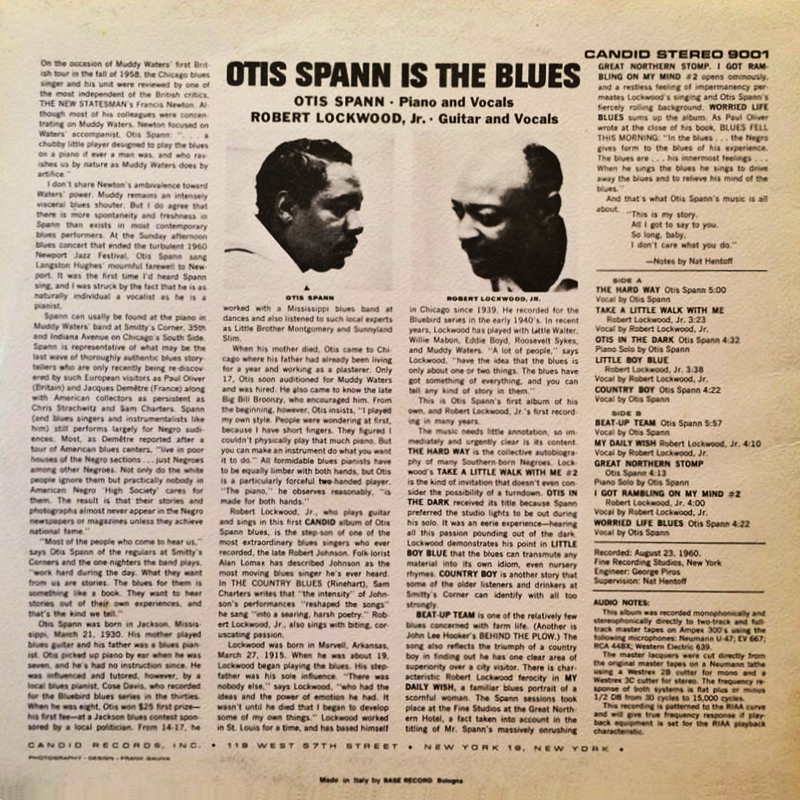 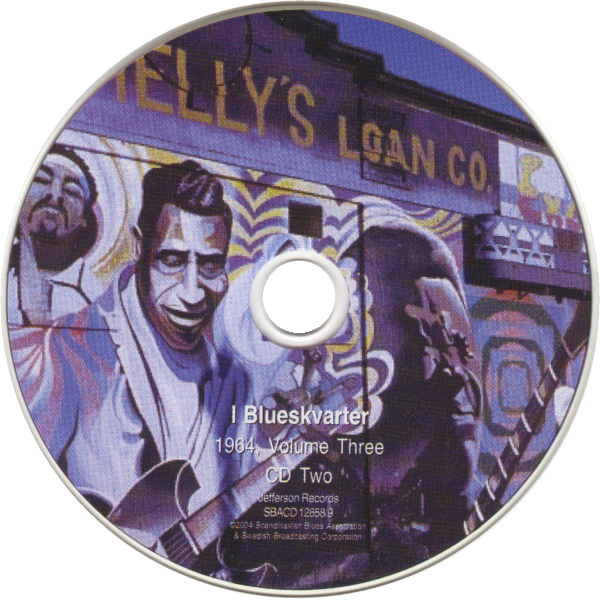 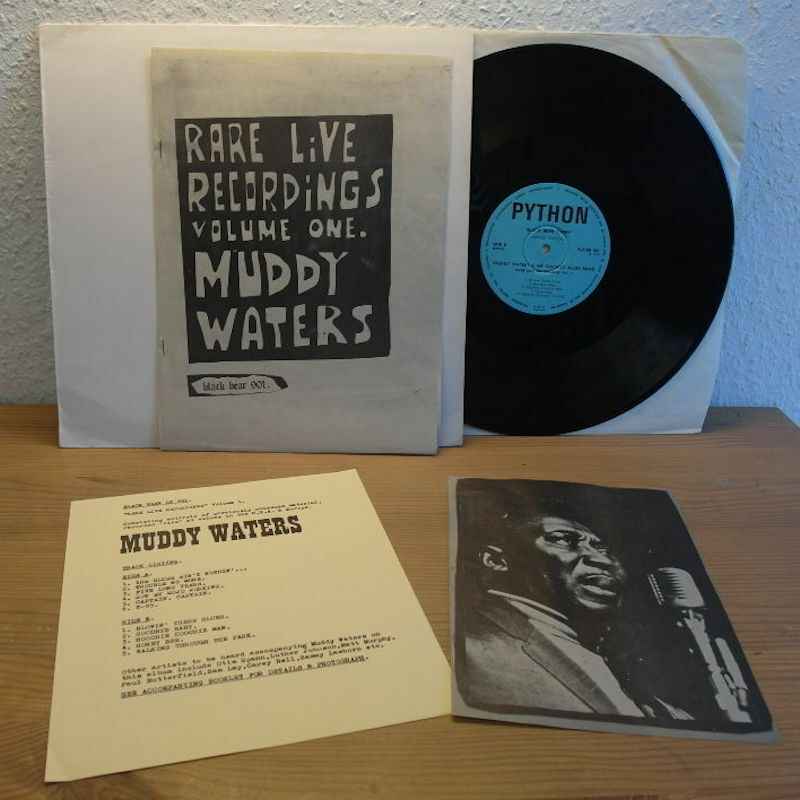 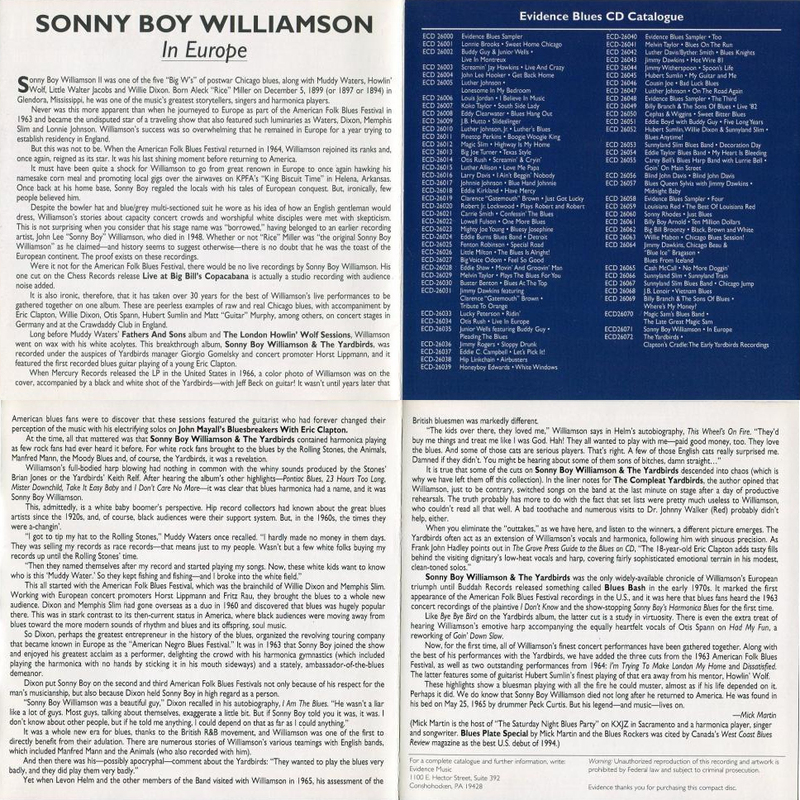 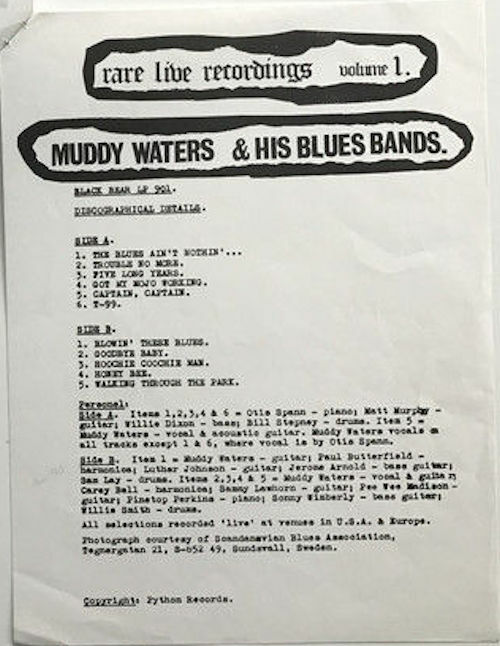 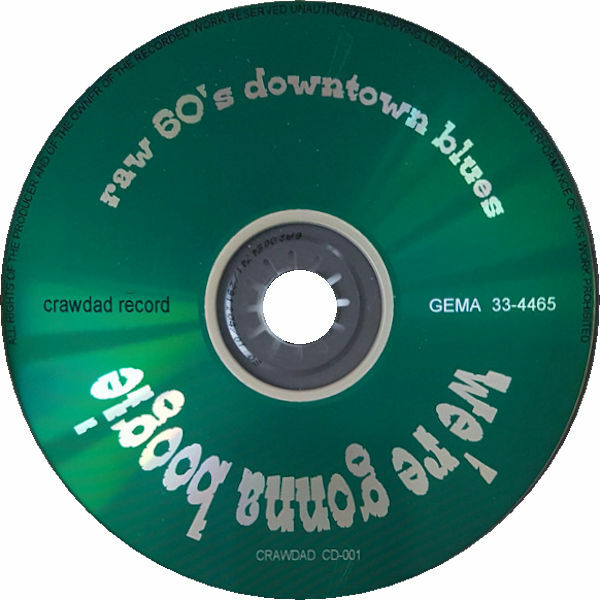 12"
Featuring: St. Louis Jimmy and Robert Lockwood, Jr.
"All selections recorded 'live' at venues in U.S.A. & Europe"
"Photograph courtesy of Scandinavian Blues Association, Tegnergatan 21, S-852, 49 Sundsvall, Sweden"
(=) Bullseye Blues CD BB 9530 (US 1993) "Rare Chicago Blues 1962-1968"
A Musical Parlor Social Deluxe!! 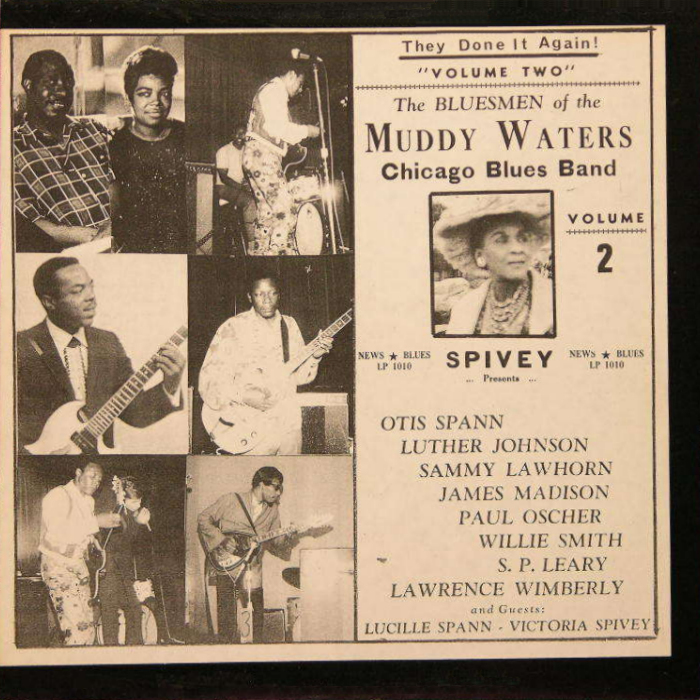 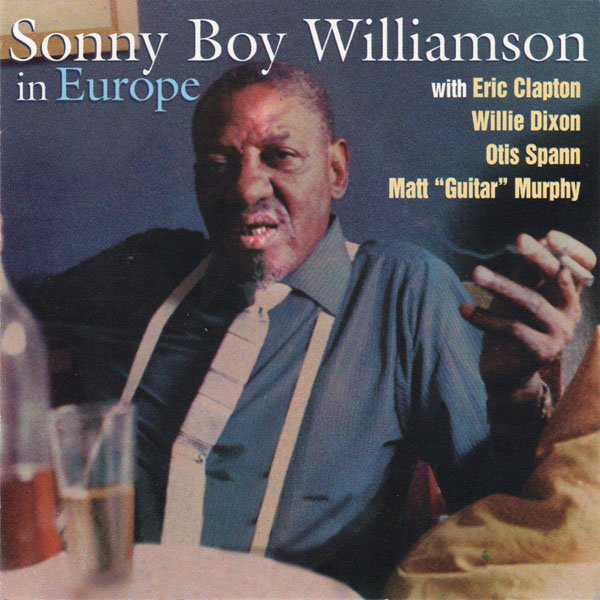 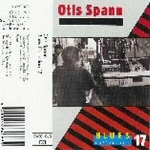 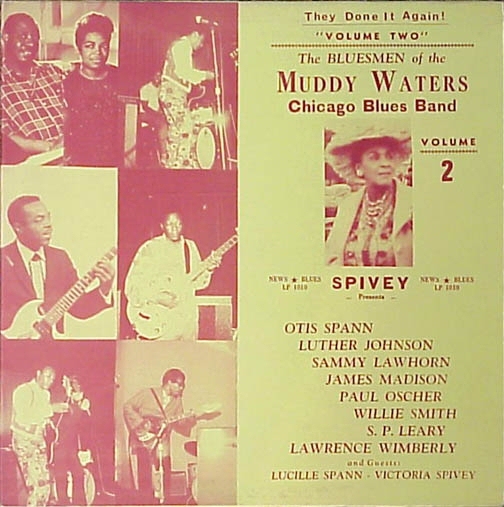 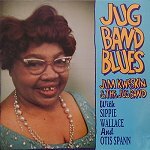 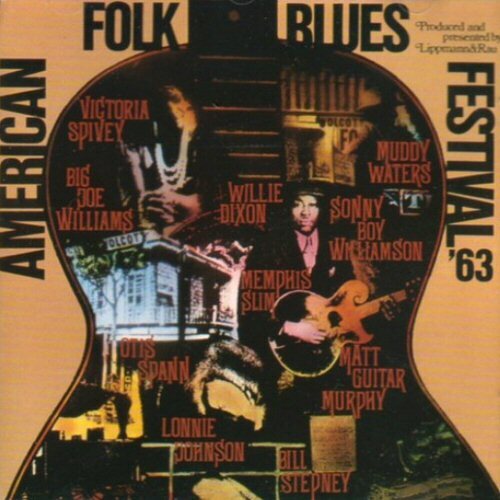 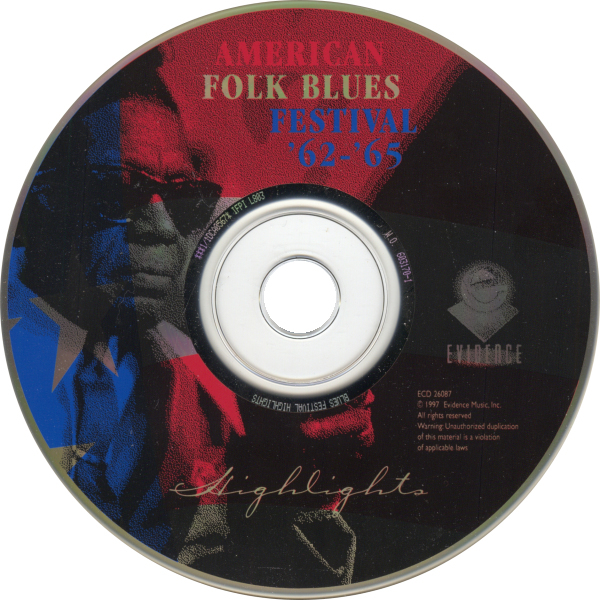 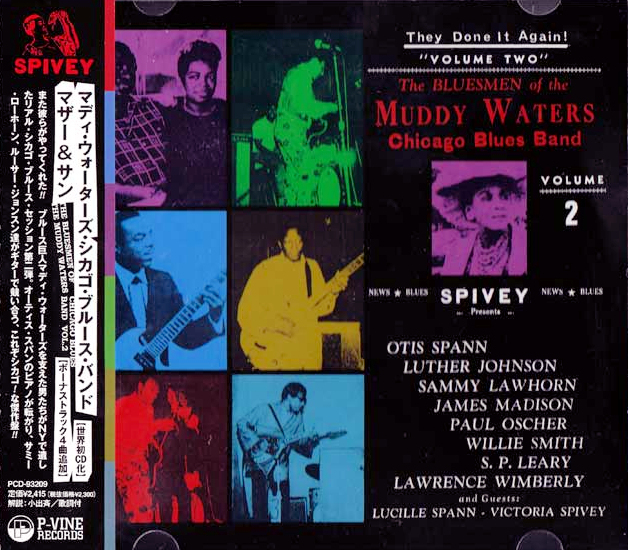 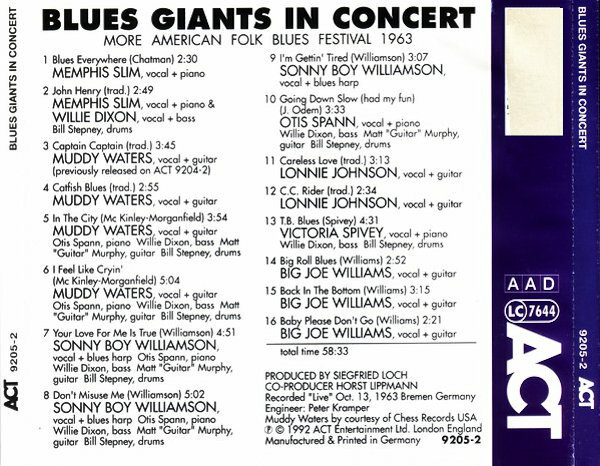 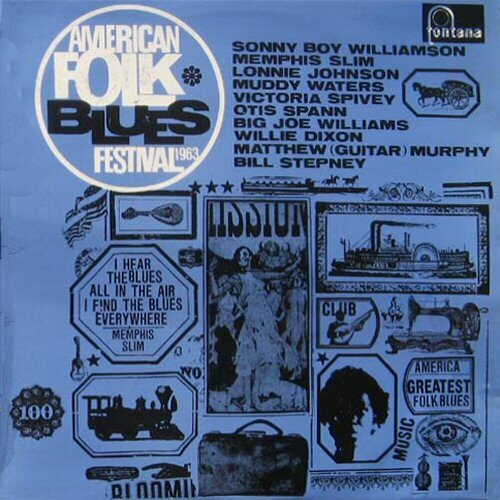 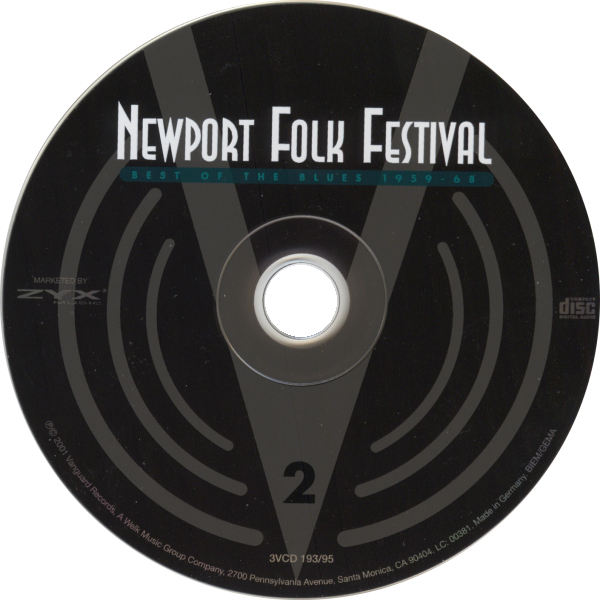 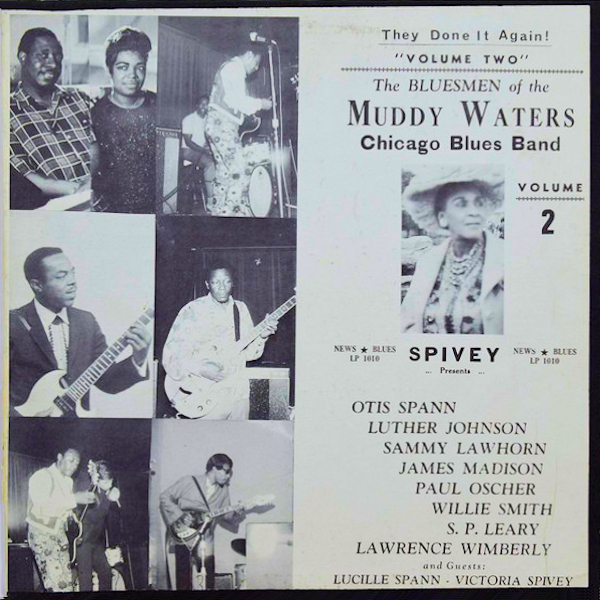 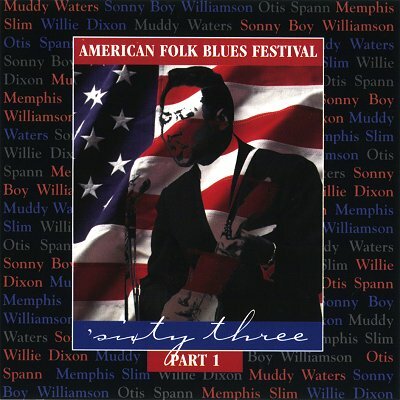 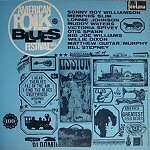 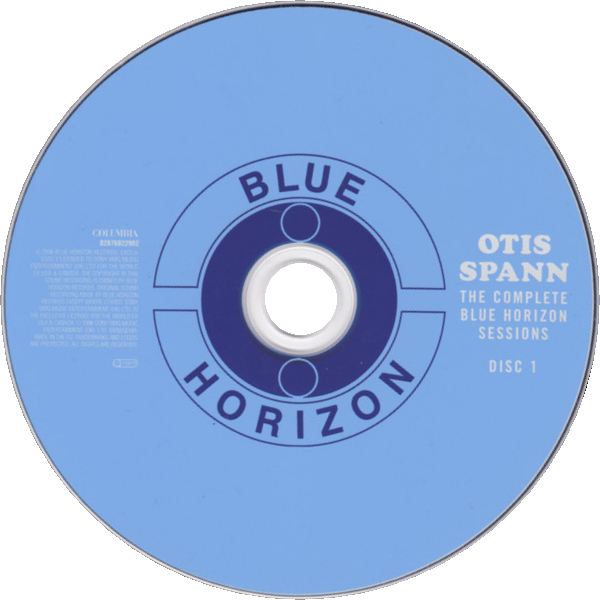 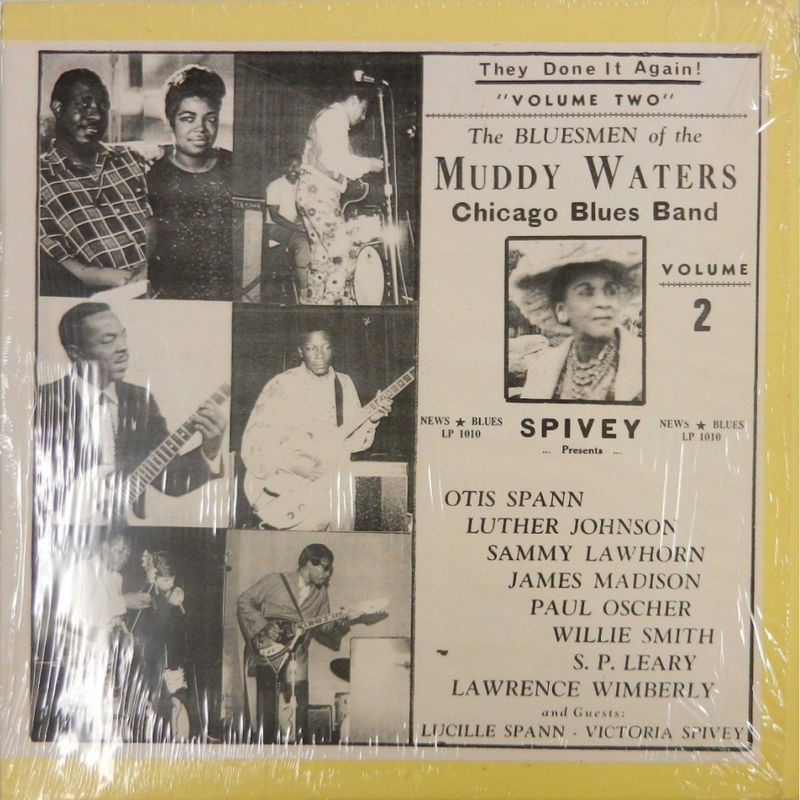 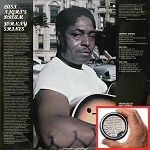 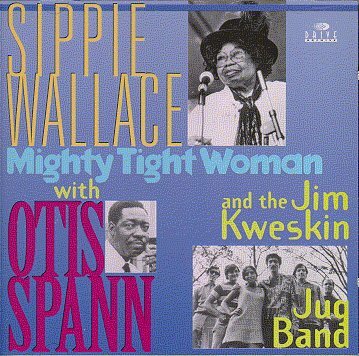 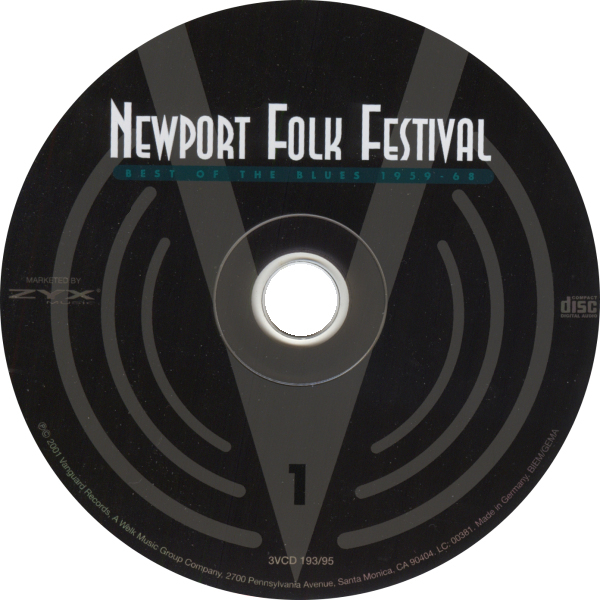 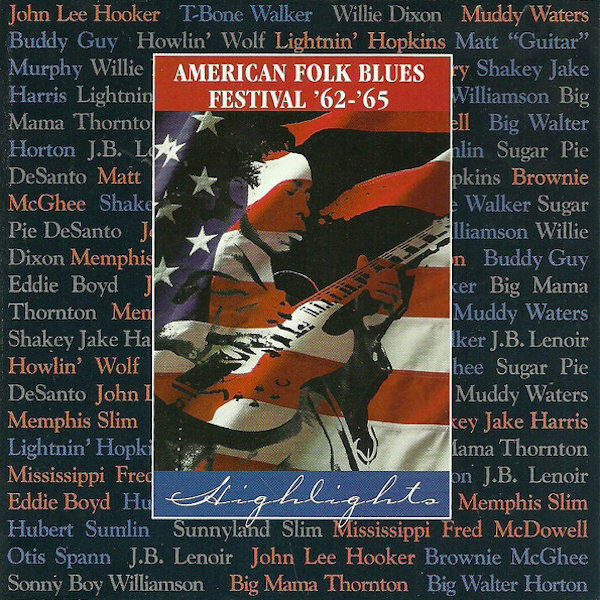 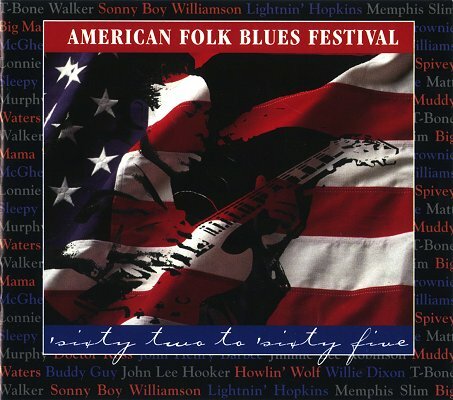 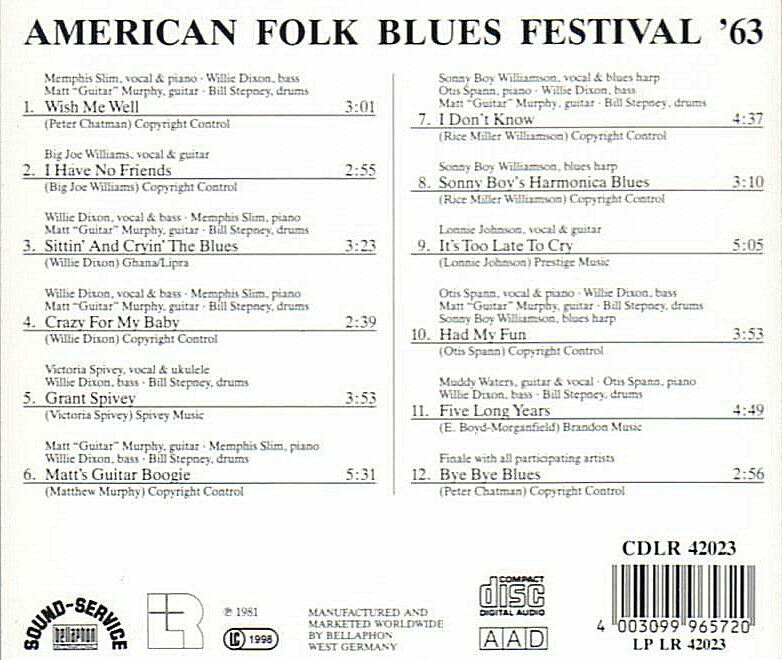 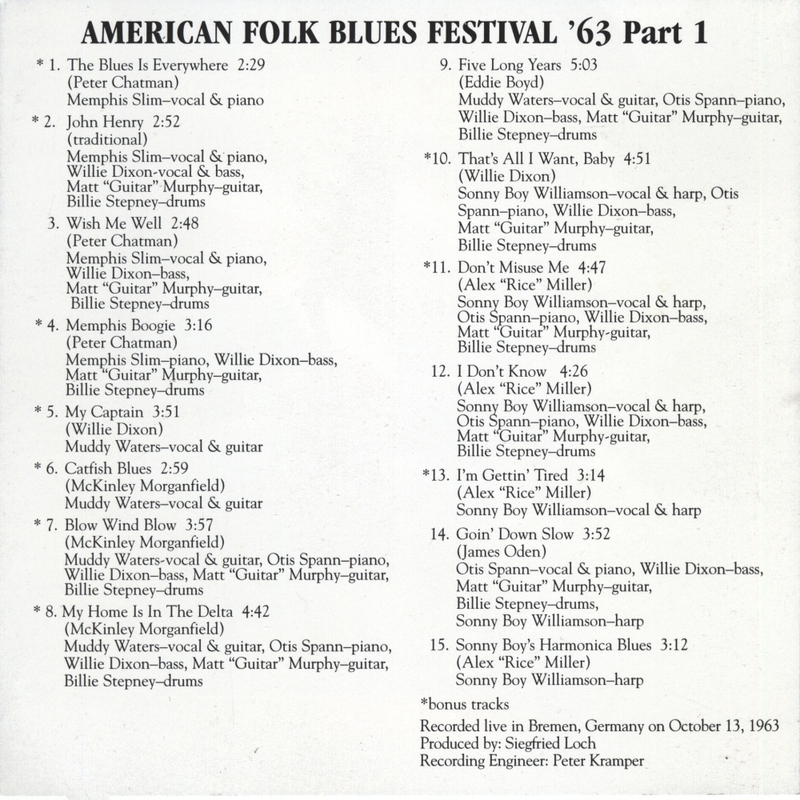 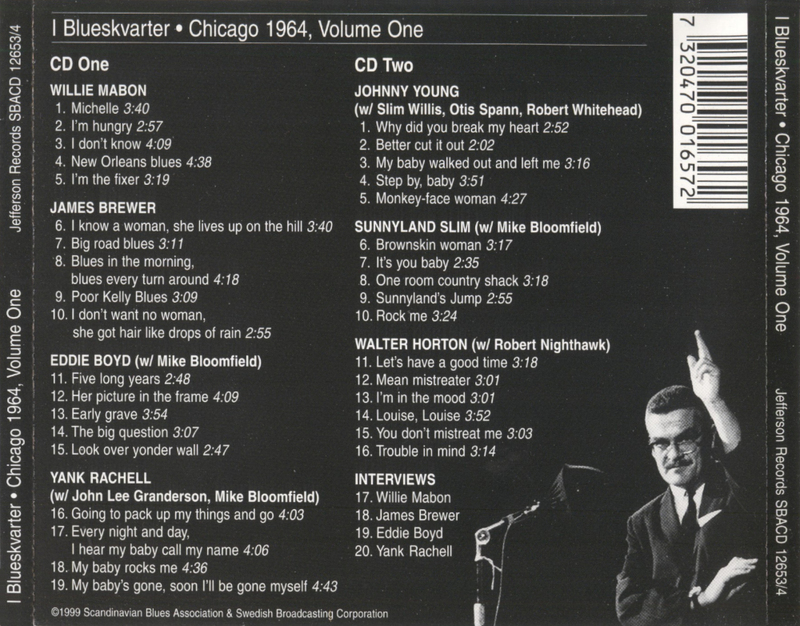 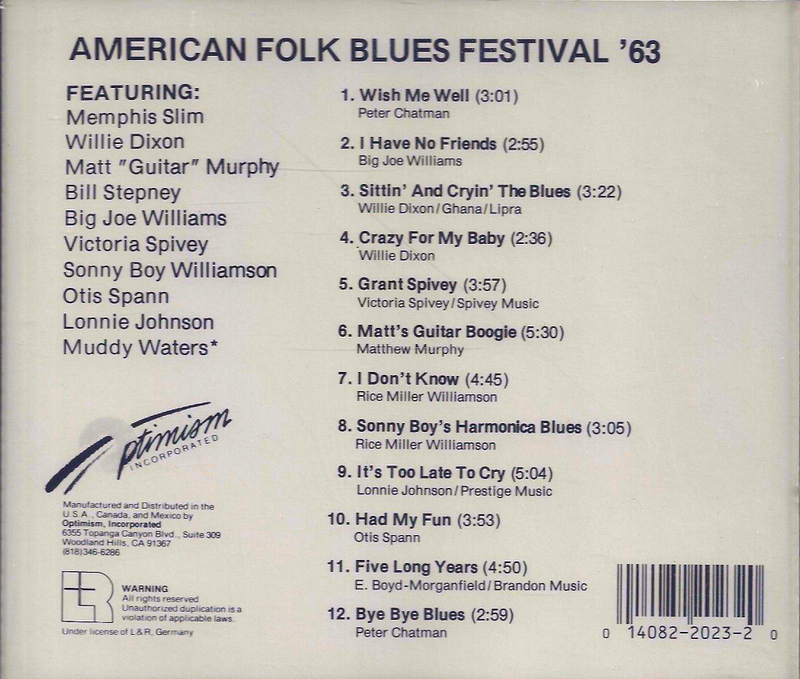 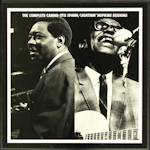 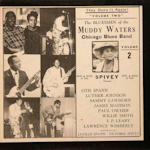 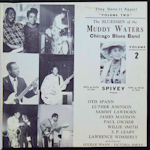 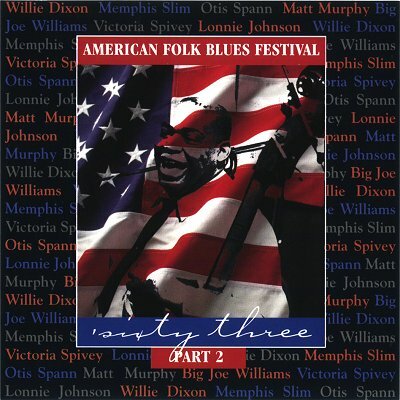 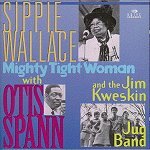 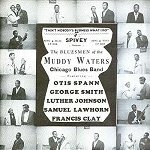 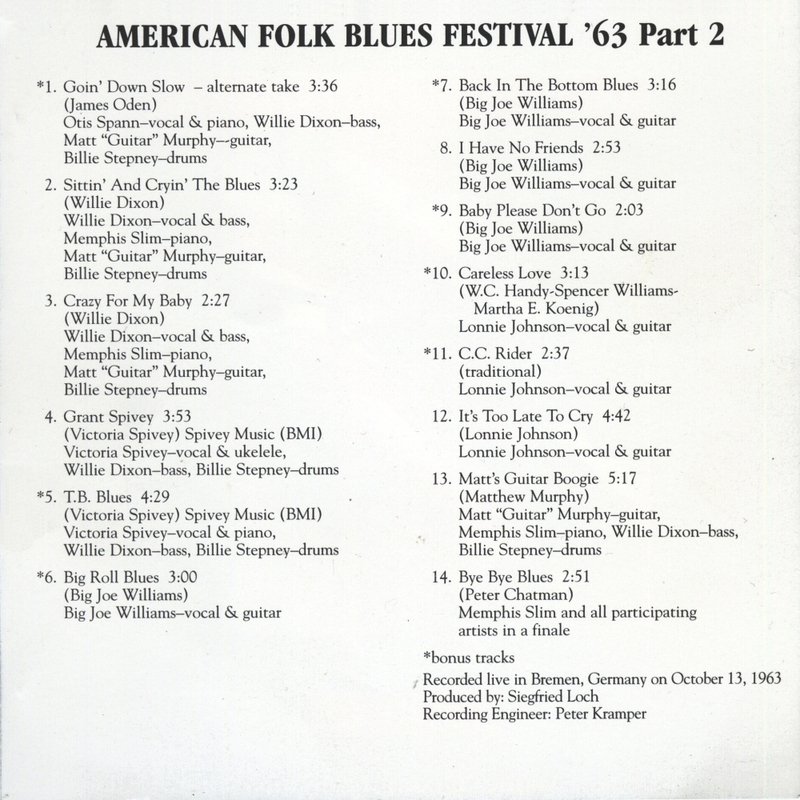 = Drive CD 41043 (US 1994) "Sippie Wallace with Otis Spann and the Jim Kweskin Jug Band"
More American Folk Blues Festival 1963 a/k/a "The Lost Blues Tapes, Vol. 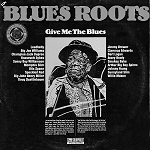 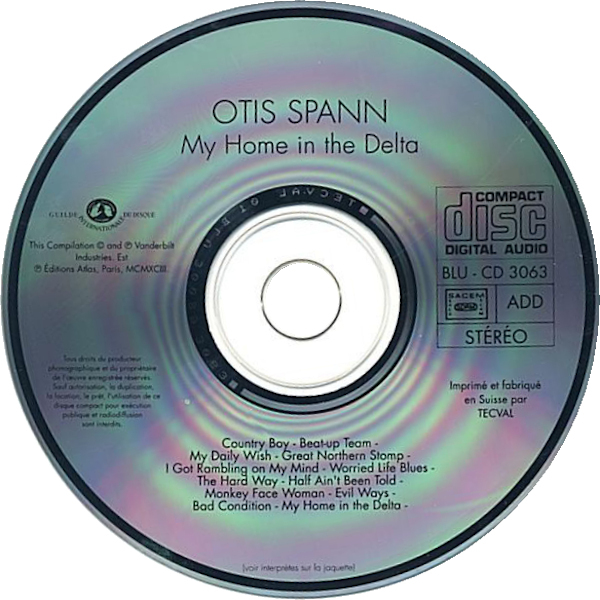 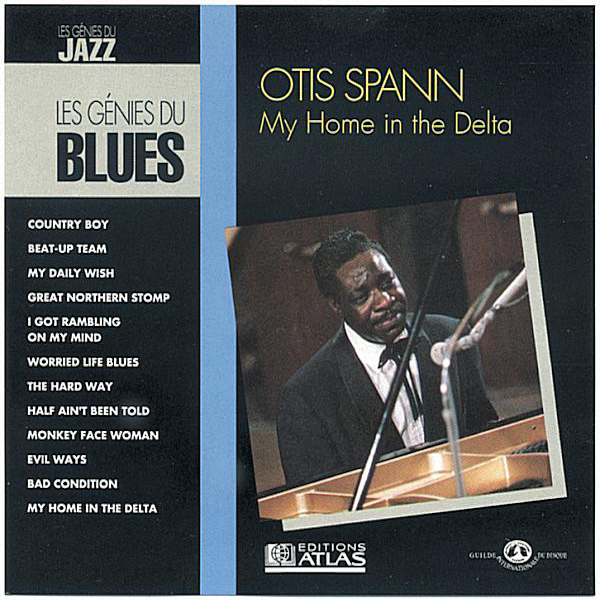 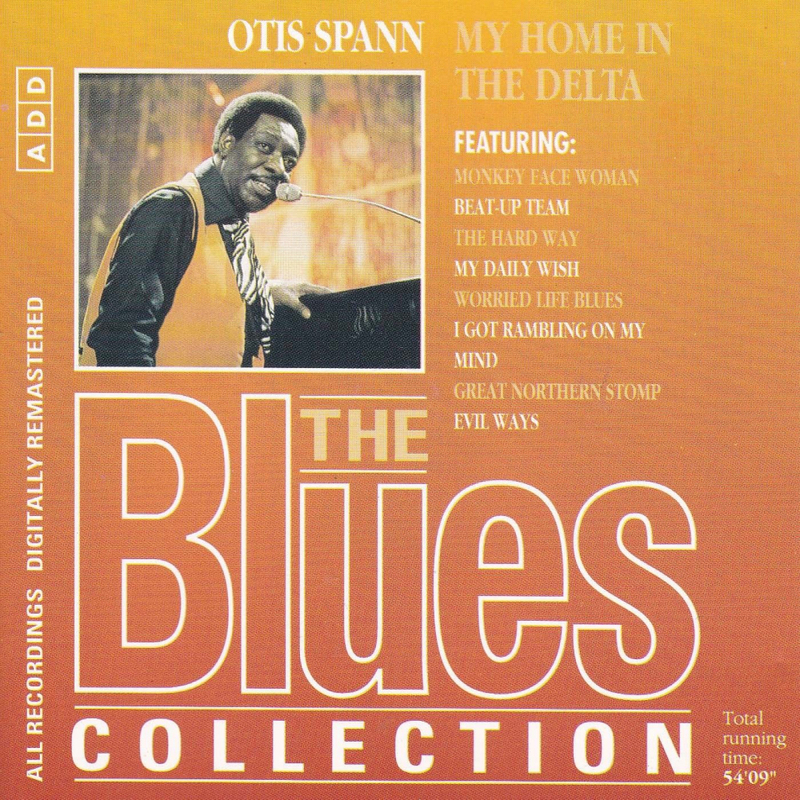 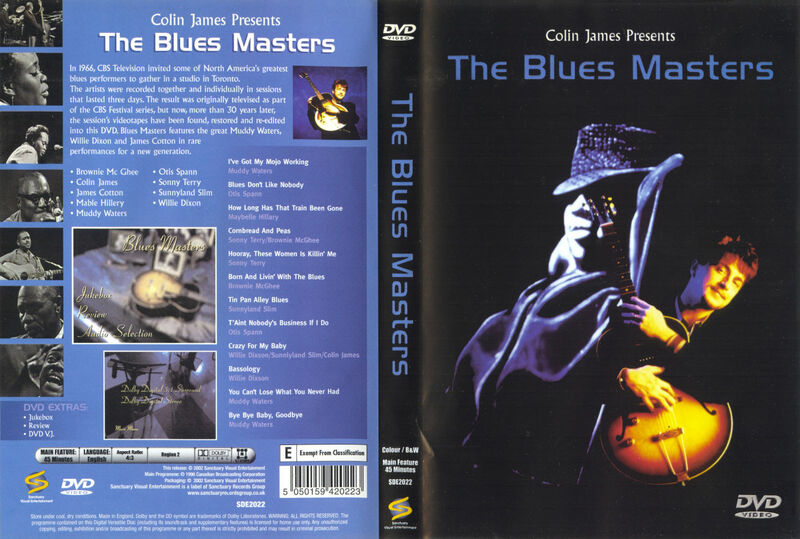 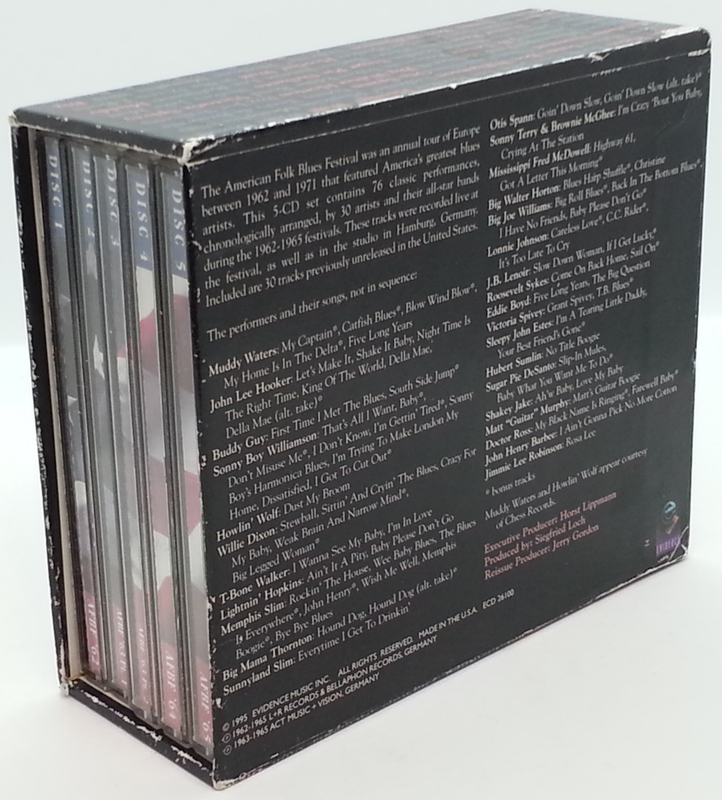 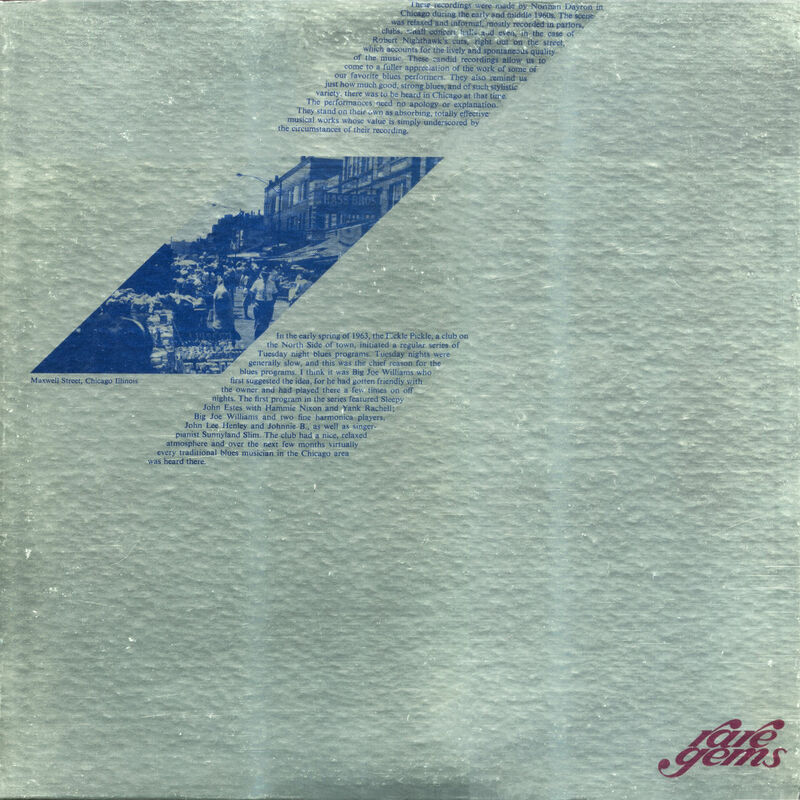 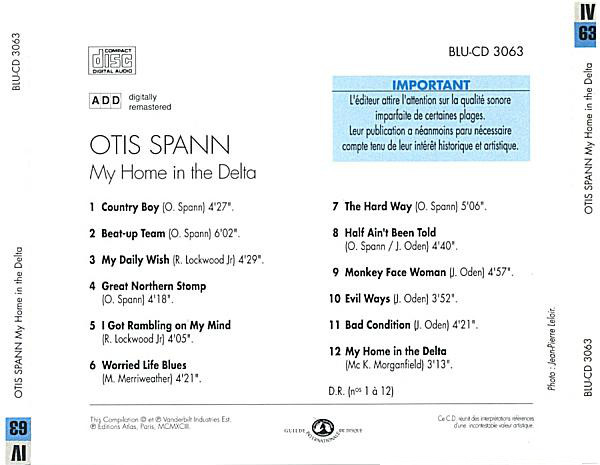 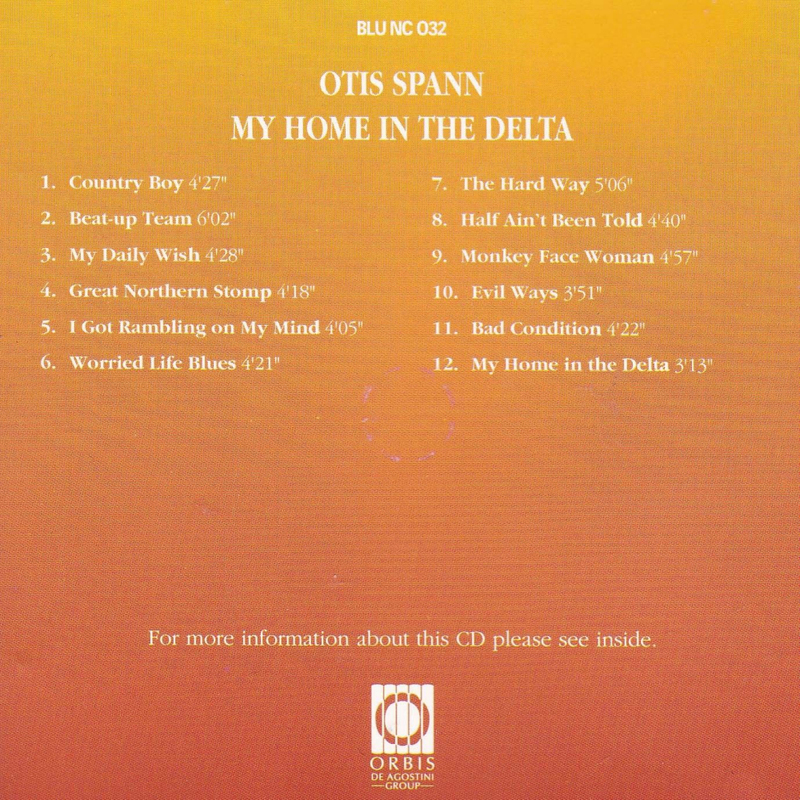 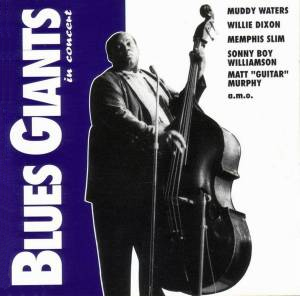 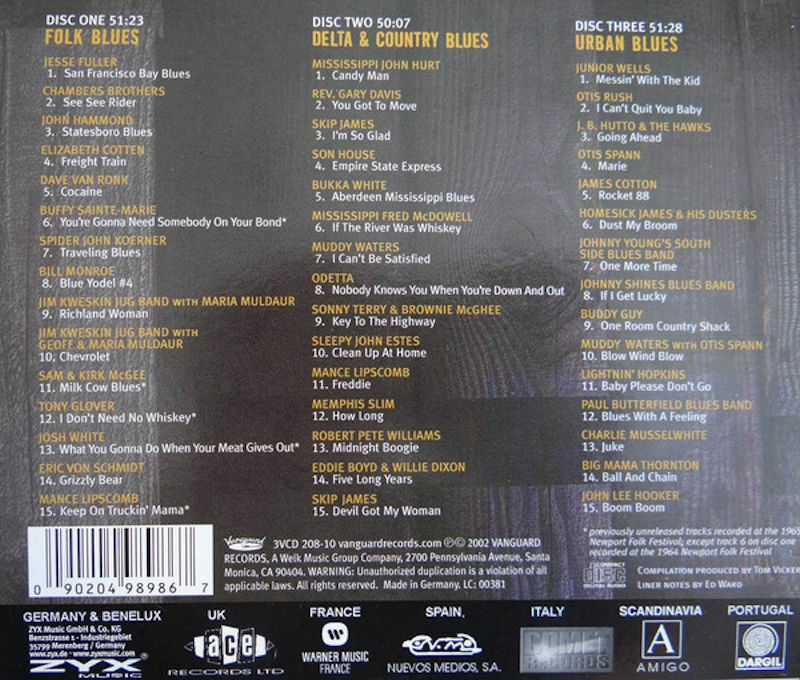 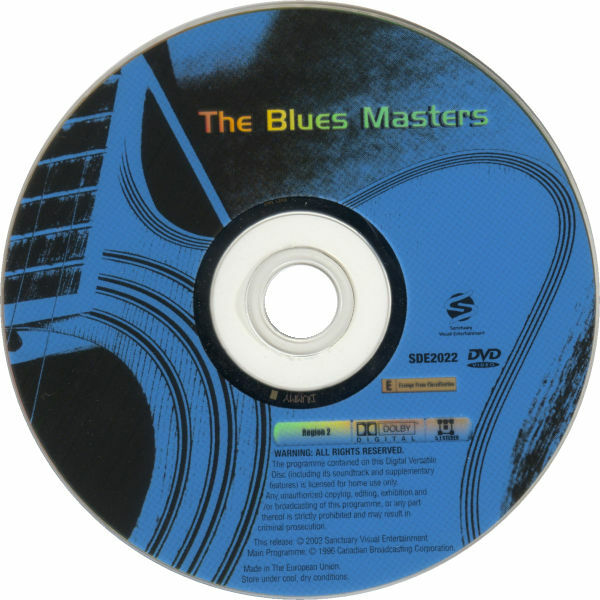 2"
Roots RTS 113014 (Be/Fr 1990) "This Is The Blues"
Editions Atlas BLU-CD 3063 (Fr 1993) "My Home In The Delta"
(=) Orbis BLU NC 032 "The Blues Collection" (EU 1994) "My Home In The Delta"
World Pacific WPS 21887 (US 1969) "George Smith & The Chicago Blues Band: Blues With A Feeling"
= Liberty LBS 83218 (UK 1969) "George Smith & The Chicago Blues Band: Blues With A Feeling"
(=) Capitol CD 36288 (US 1997) "Chicago Blues Masters Vol. 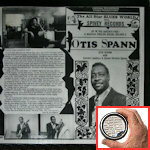 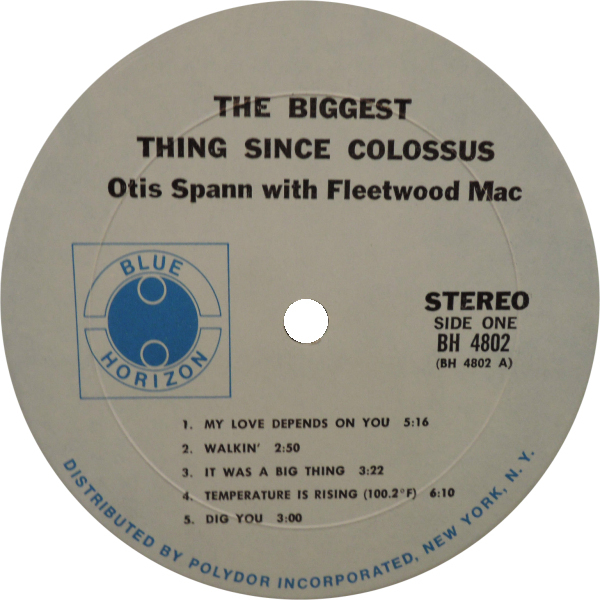 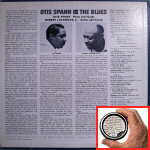 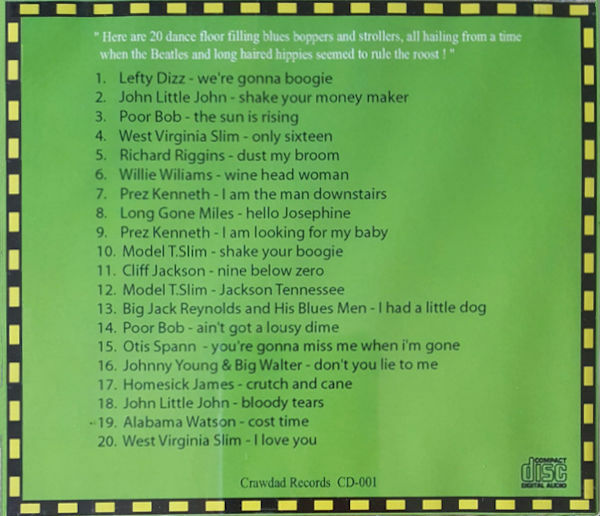 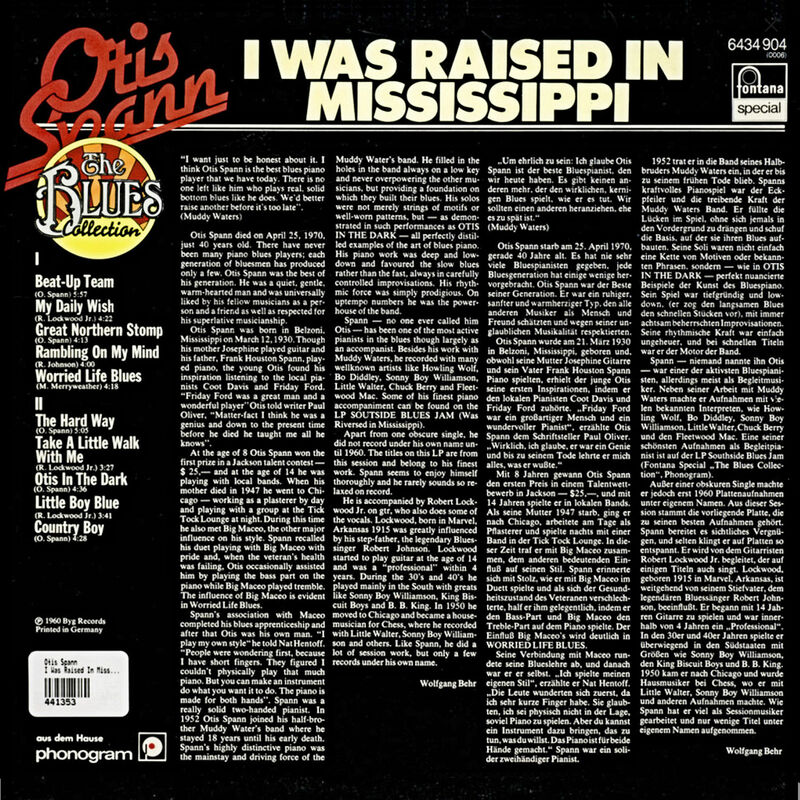 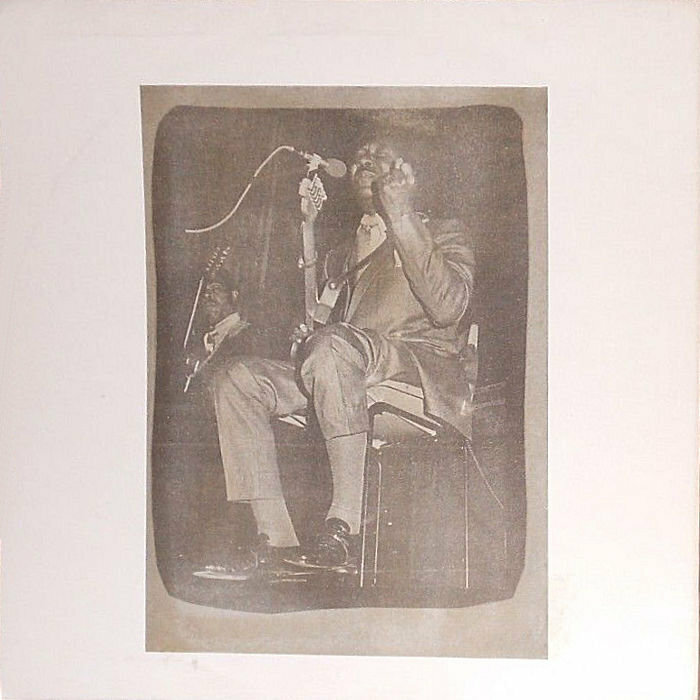 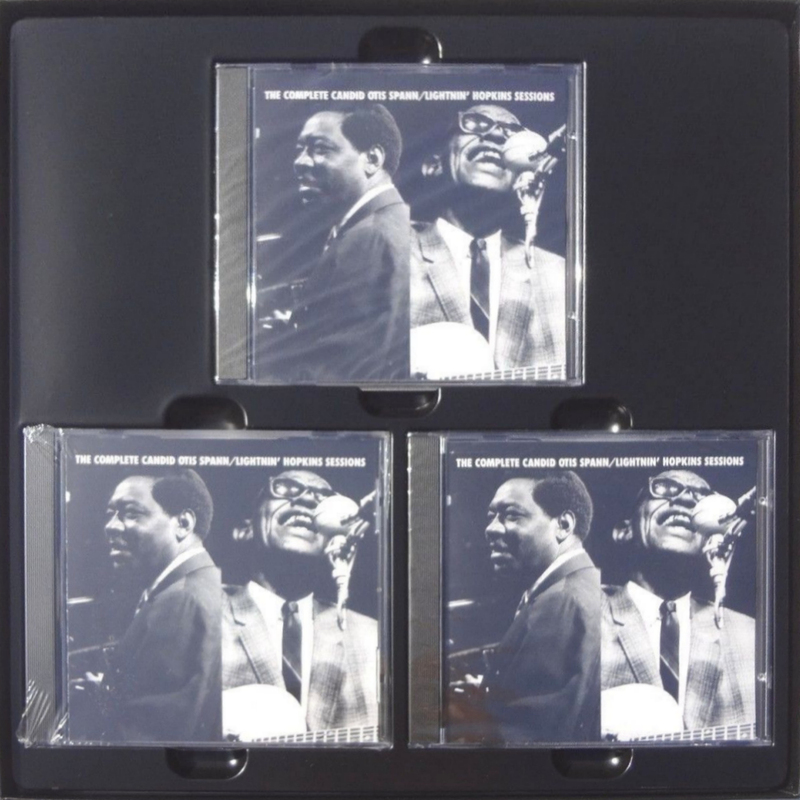 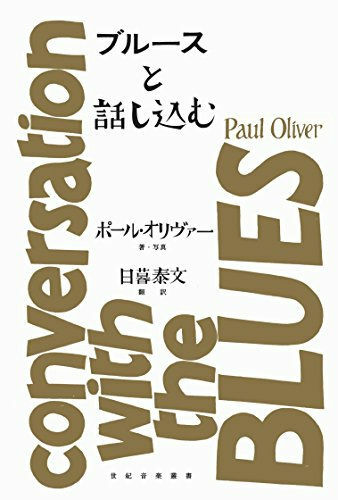 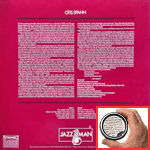 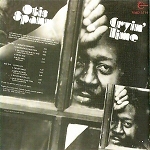 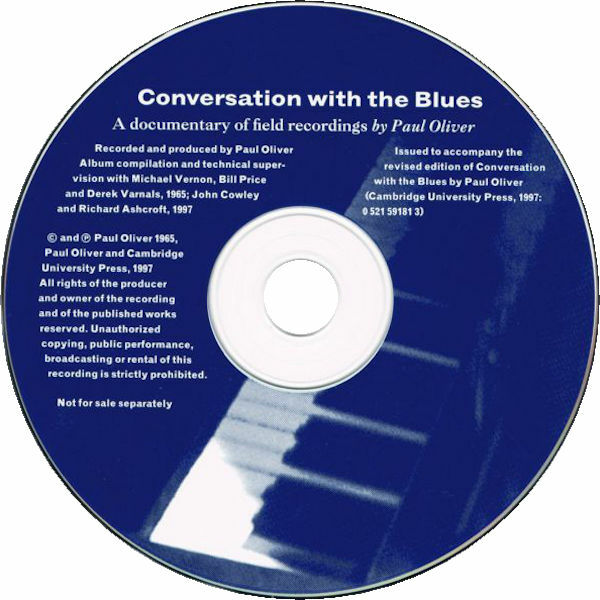 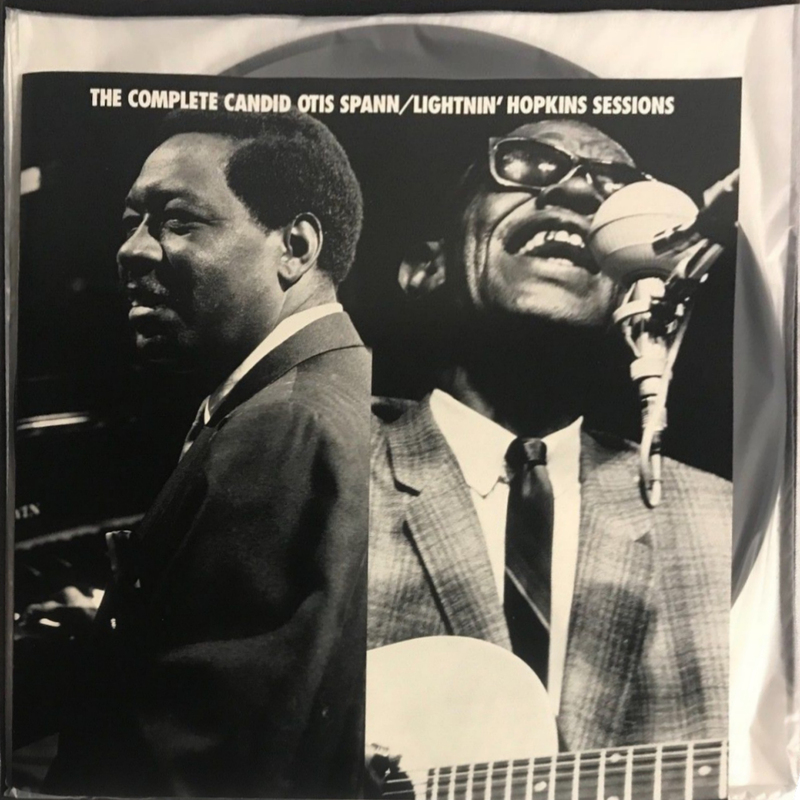 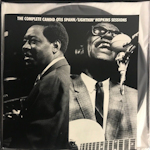 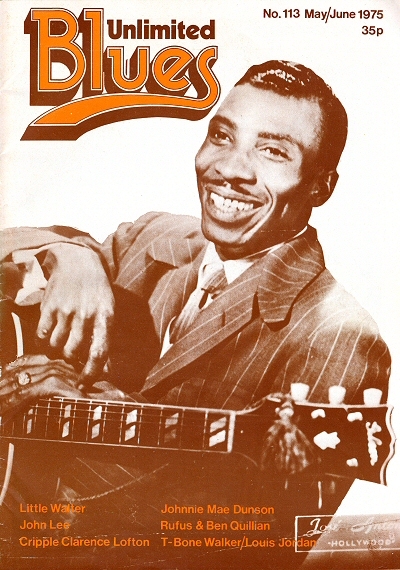 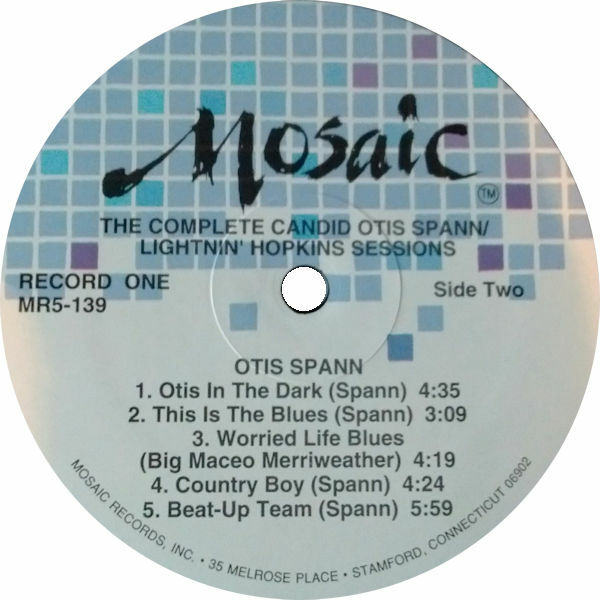 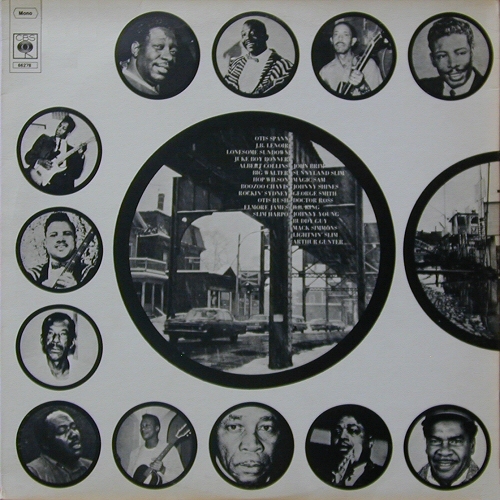 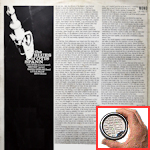 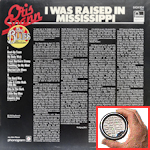 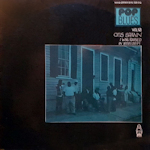 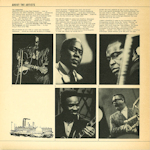 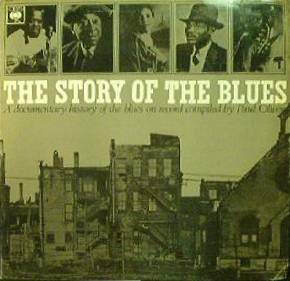 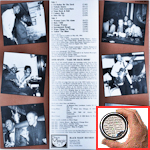 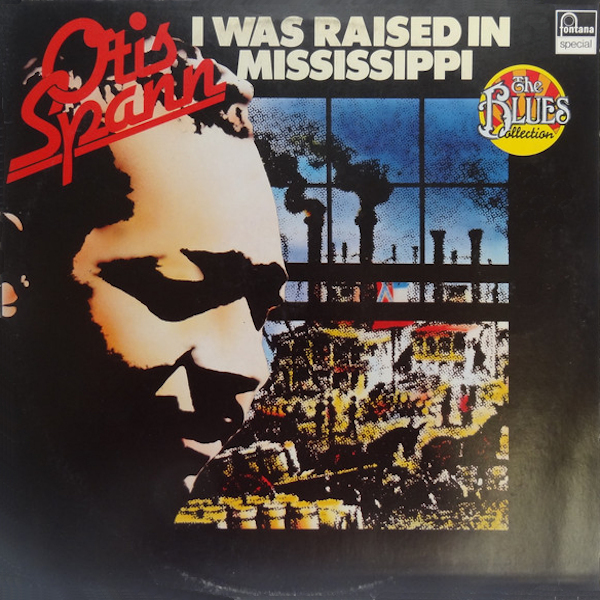 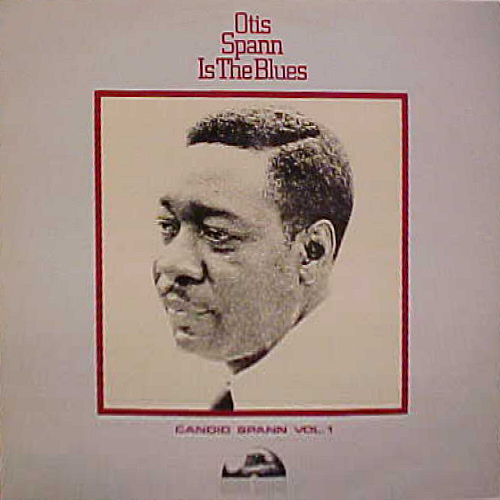 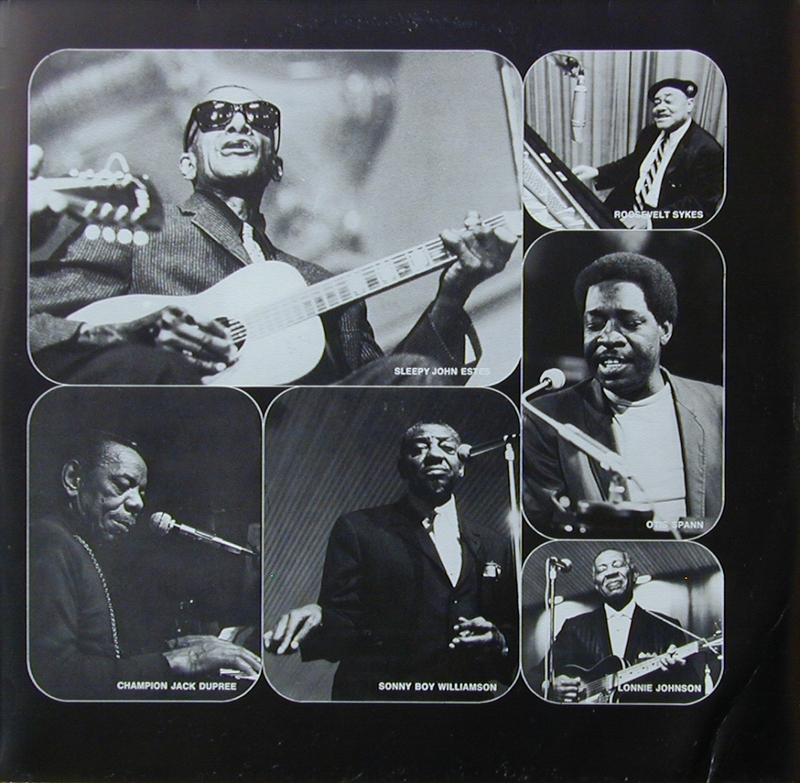 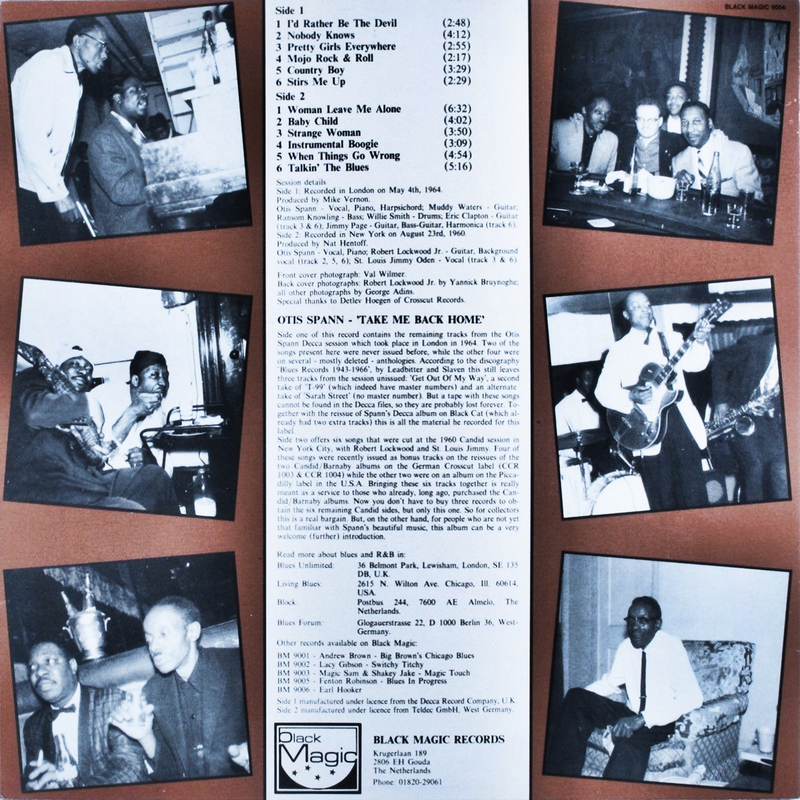 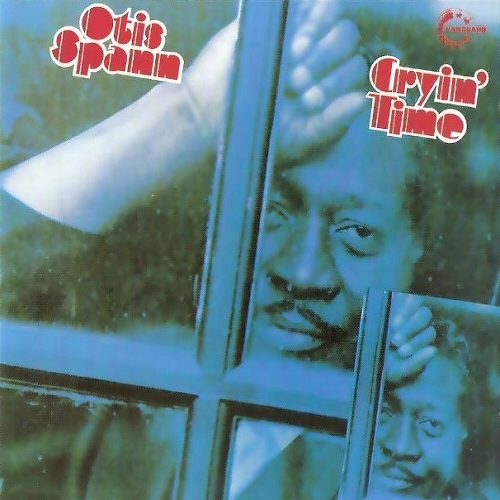 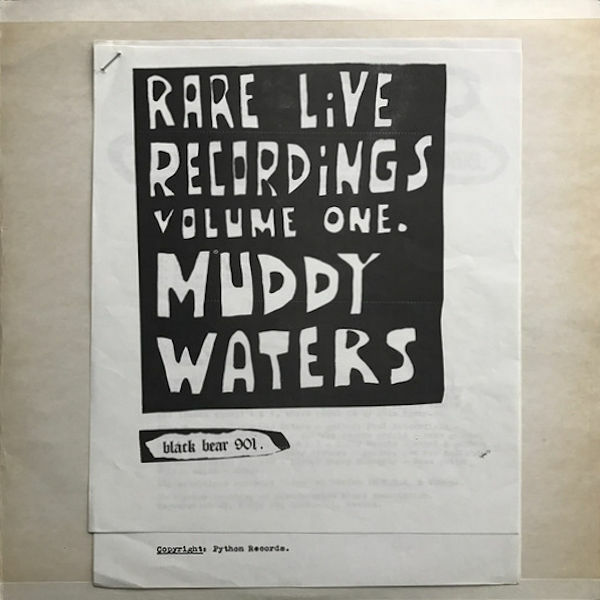 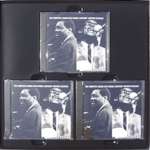 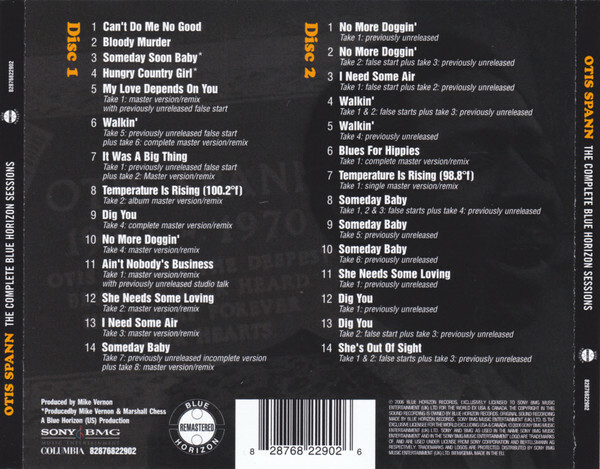 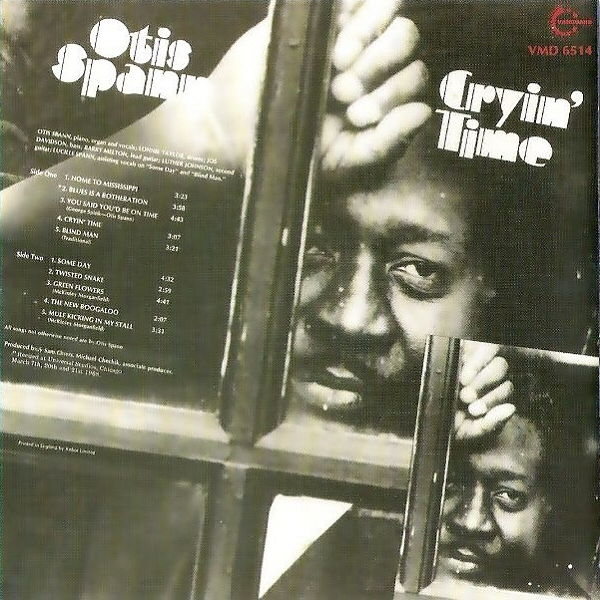 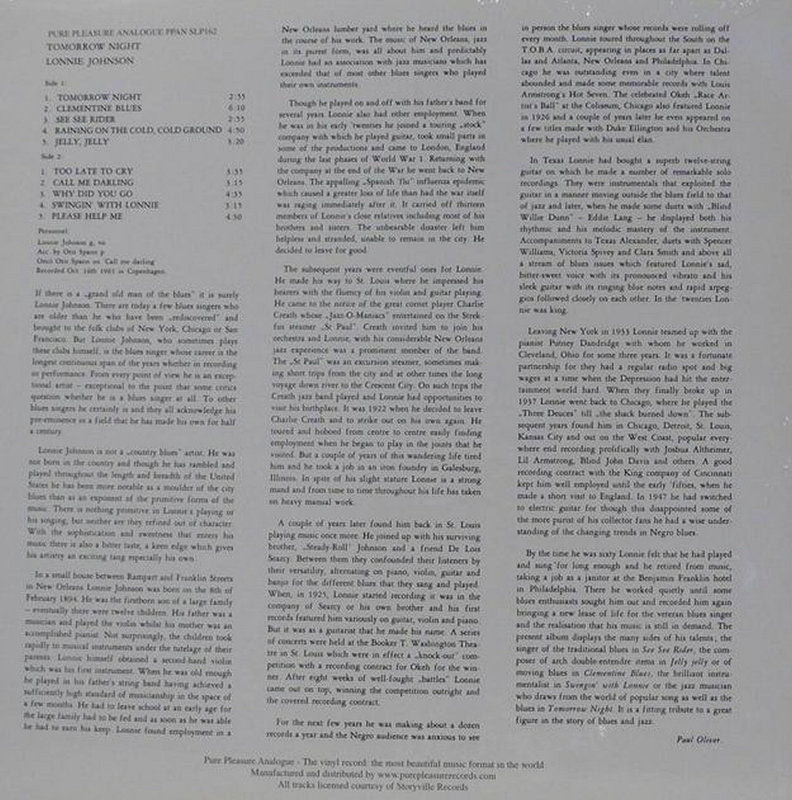 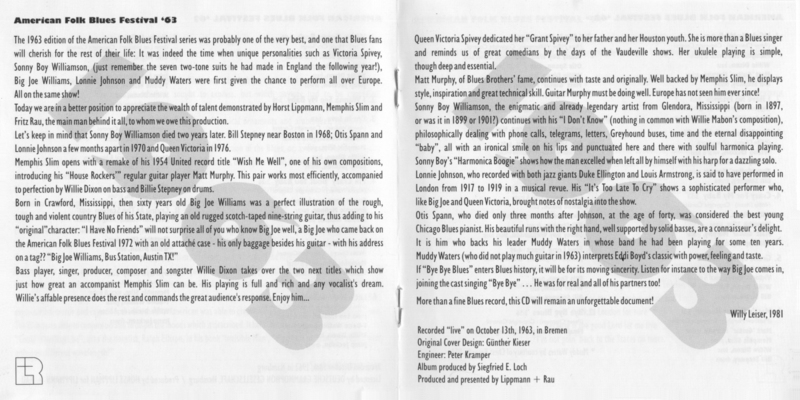 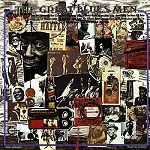 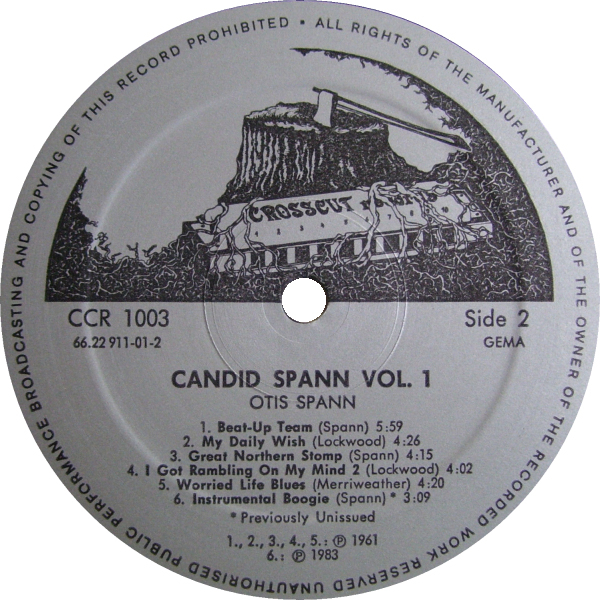 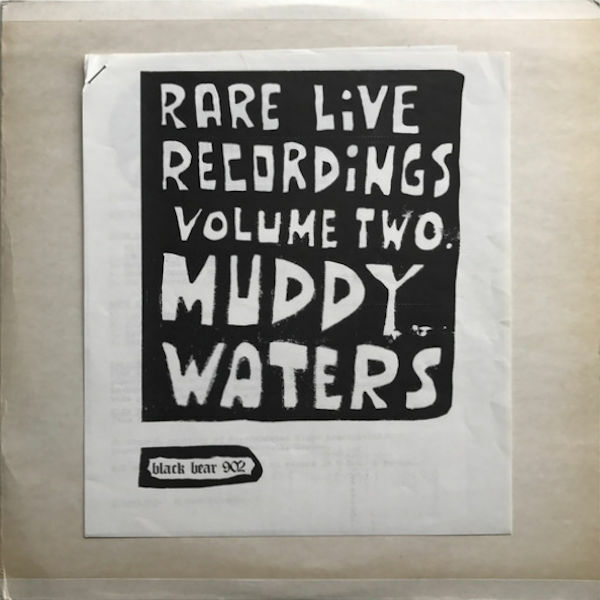 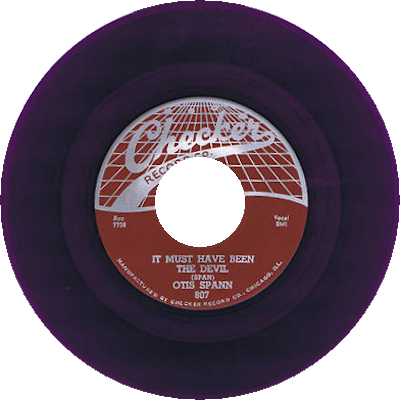 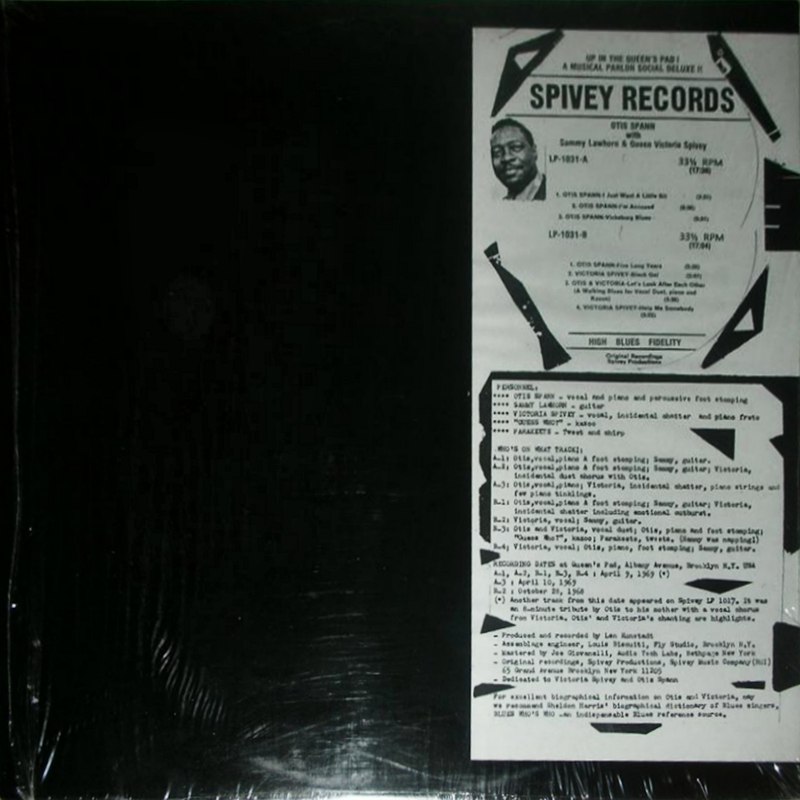 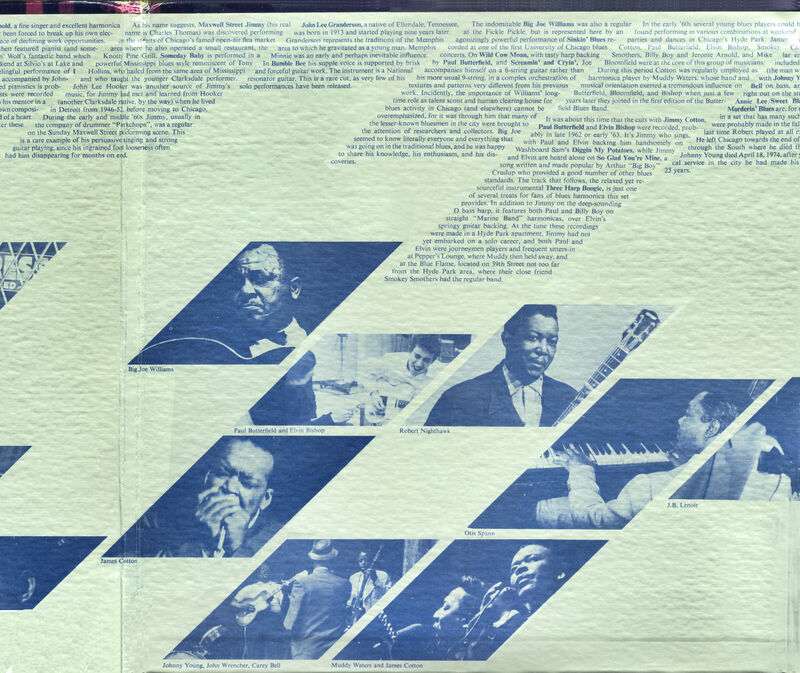 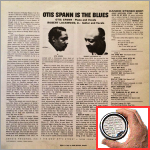 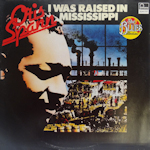 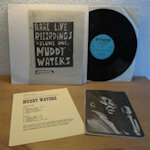 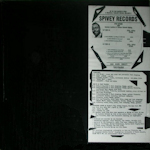 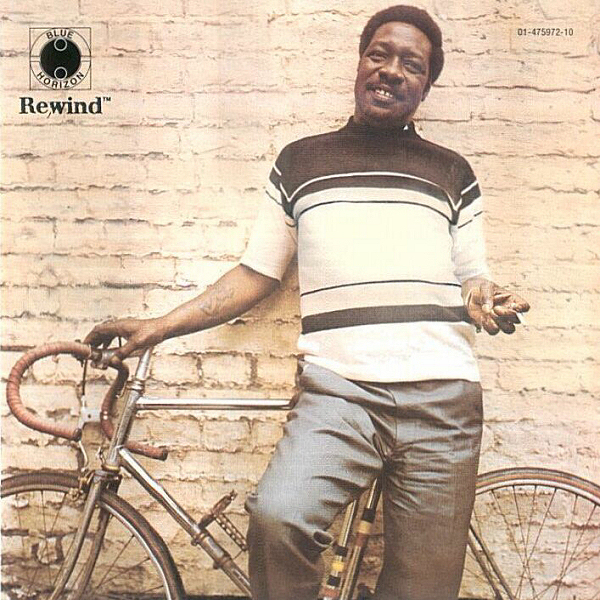 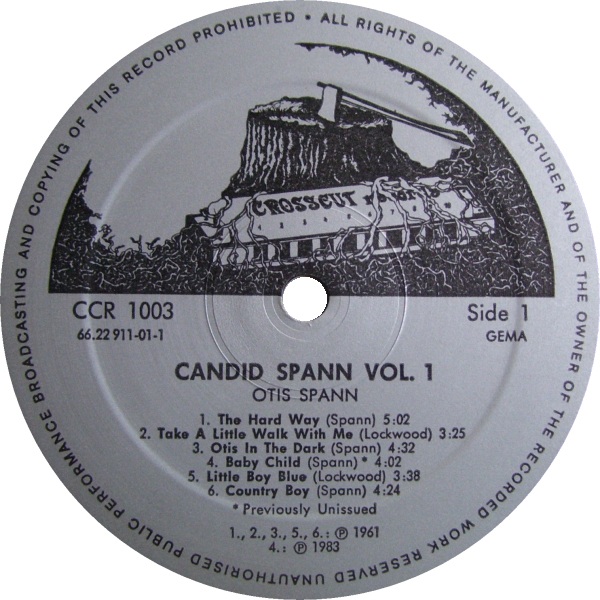 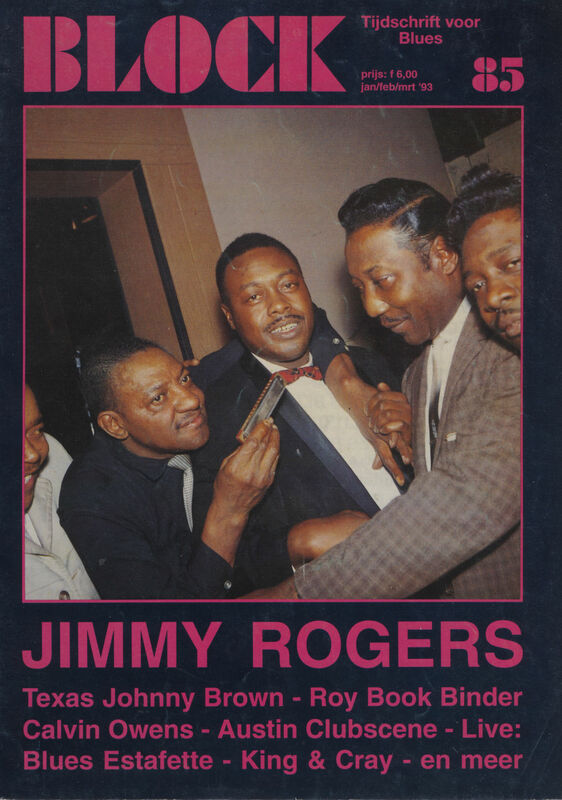 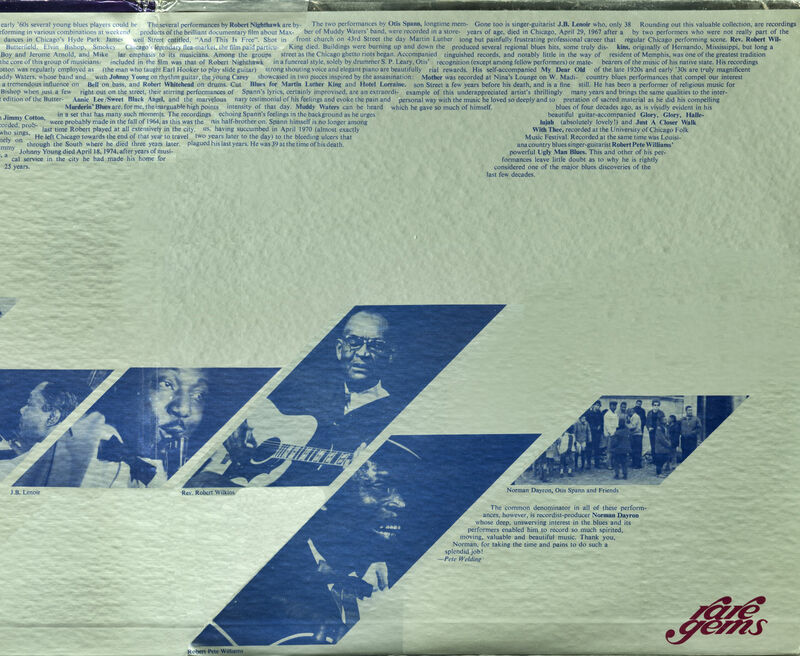 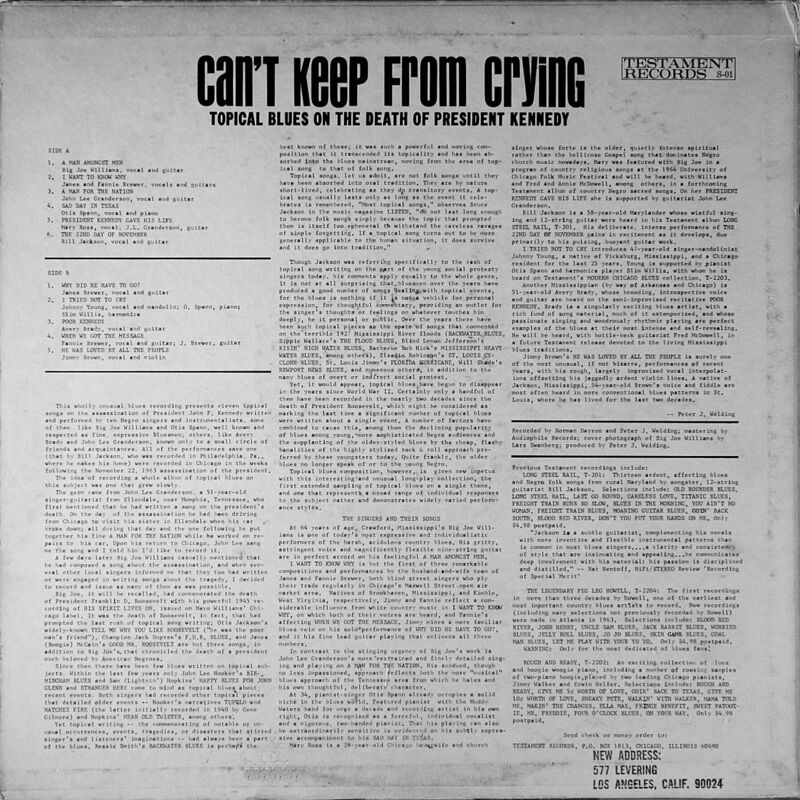 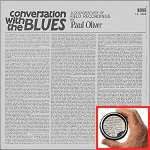 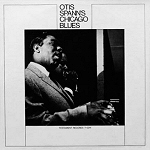 3"
- Bill Rowe (revised and updated by Chris Smith and Howard Rye): The Half Ain't Been Told - An Otis Spann Career Discography.- Amsterdam, The Netherlands (Micrography Discographical Publications), 2000, 136 pp.